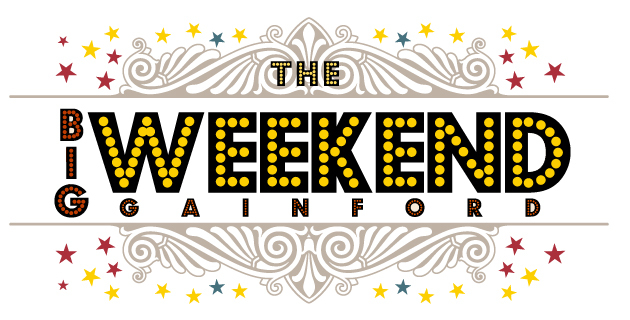 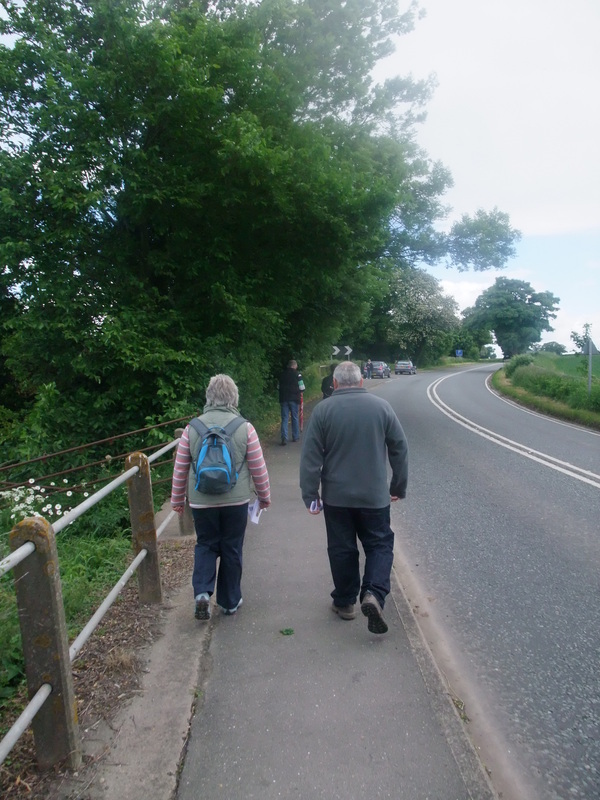 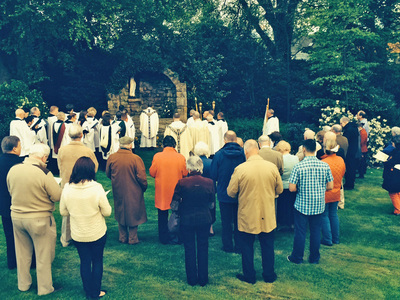 Saturday 2nd May 2015. 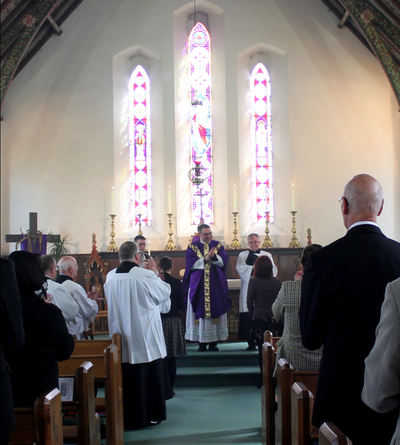 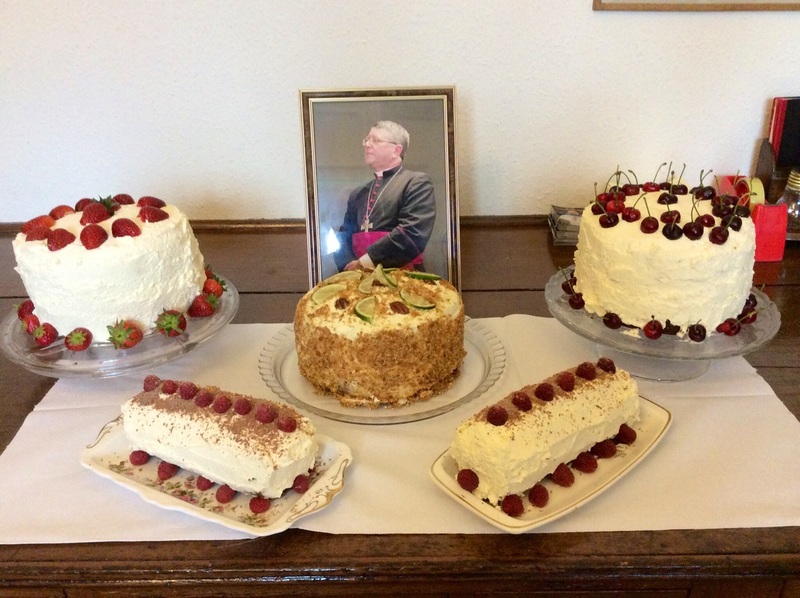 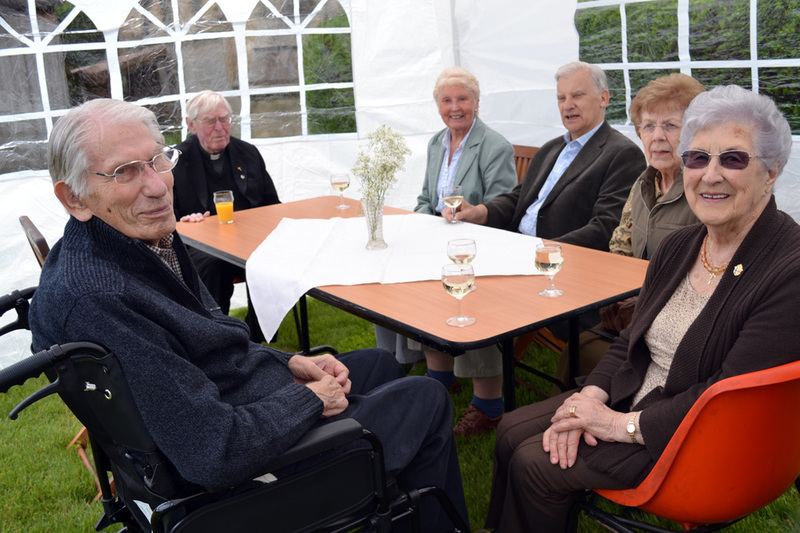 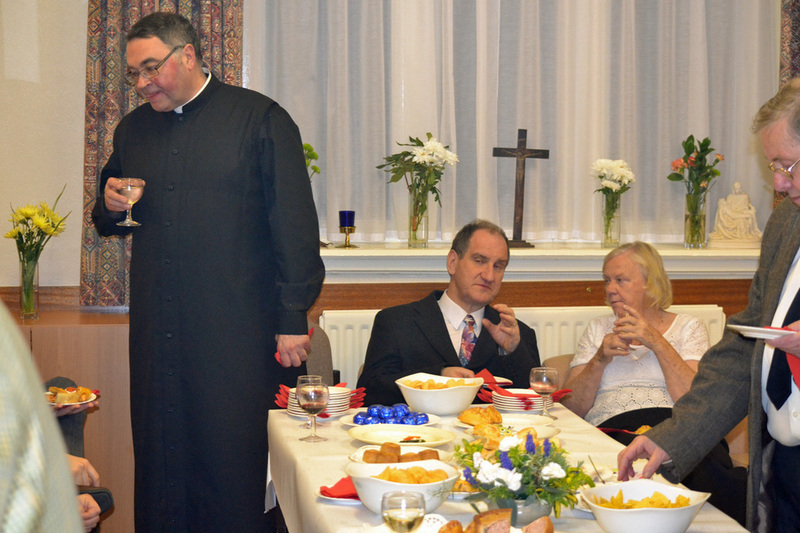 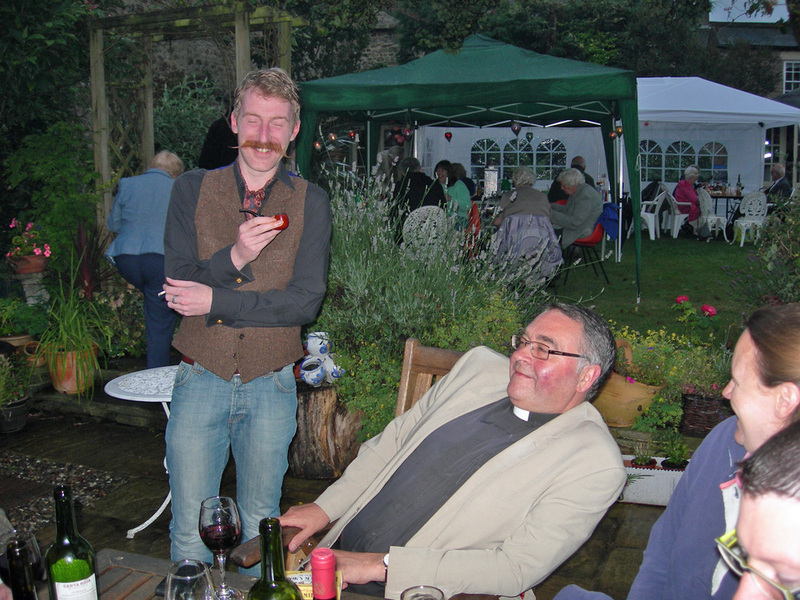 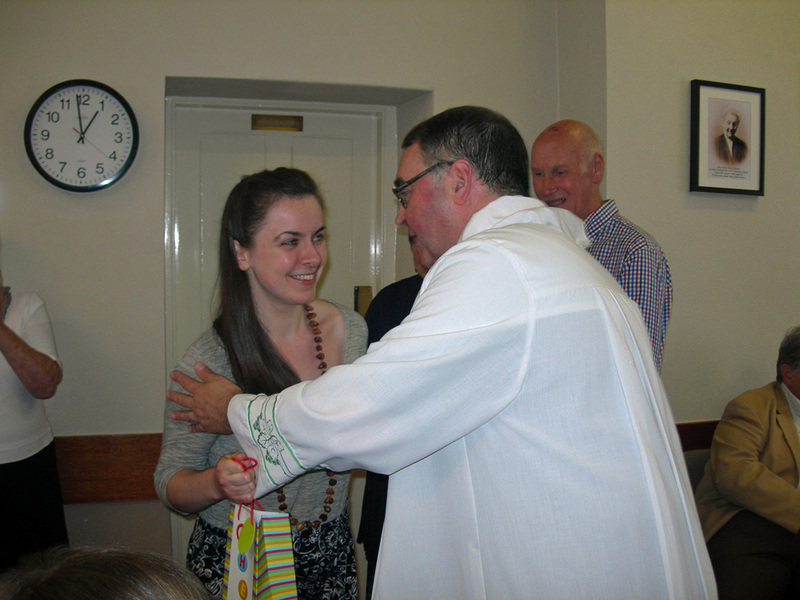 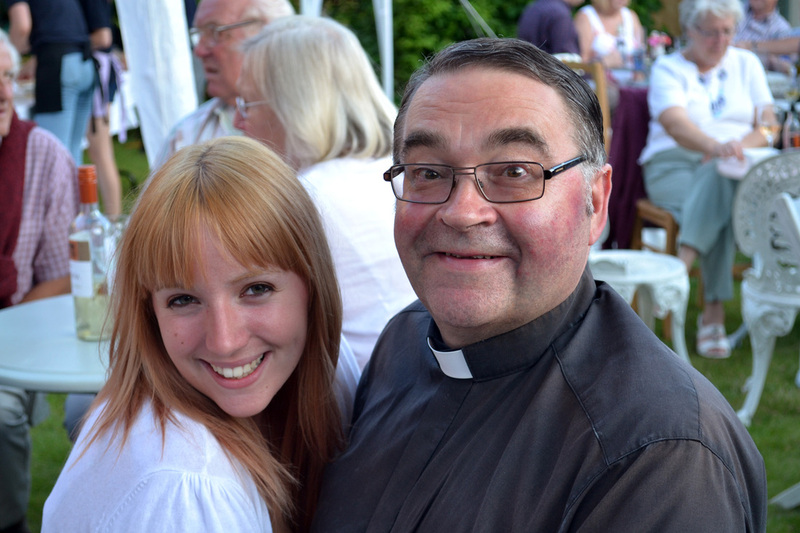 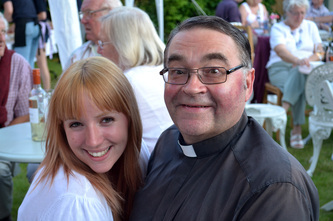 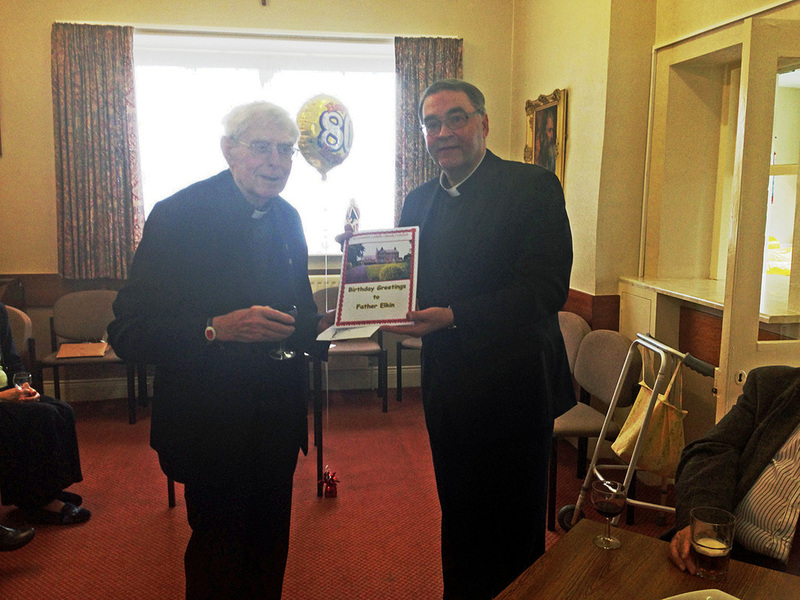 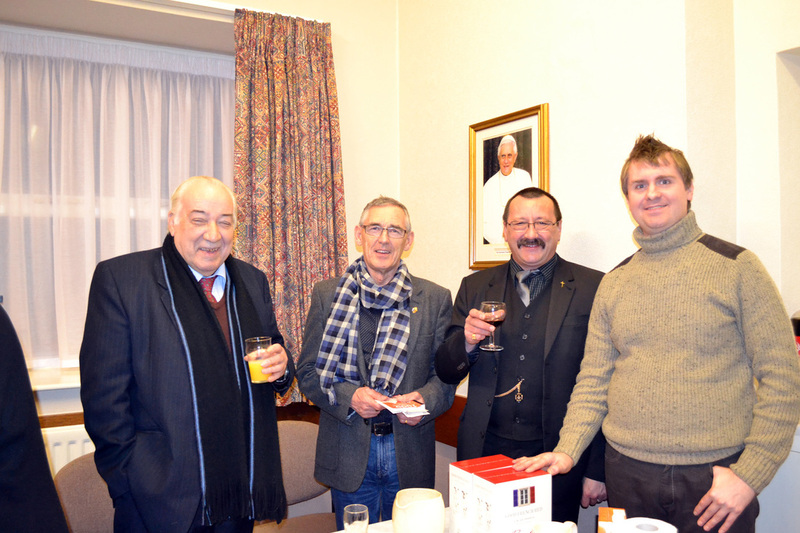 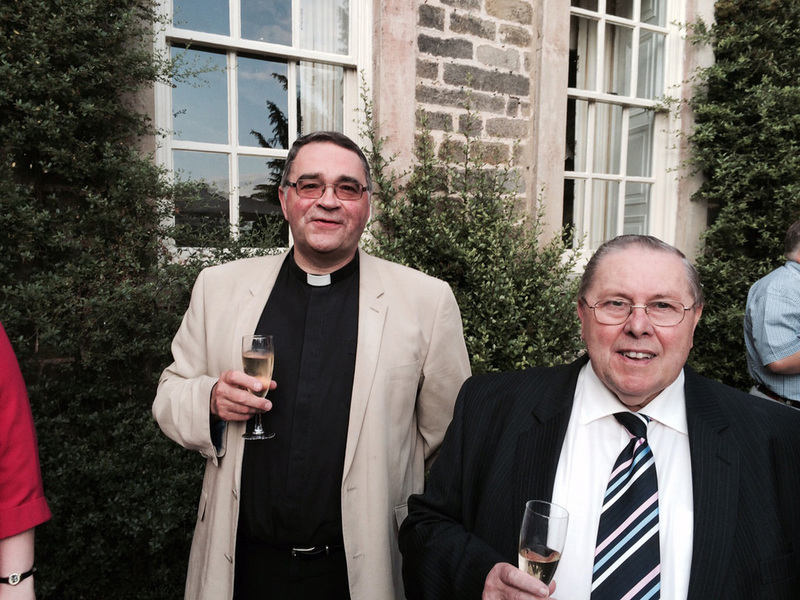 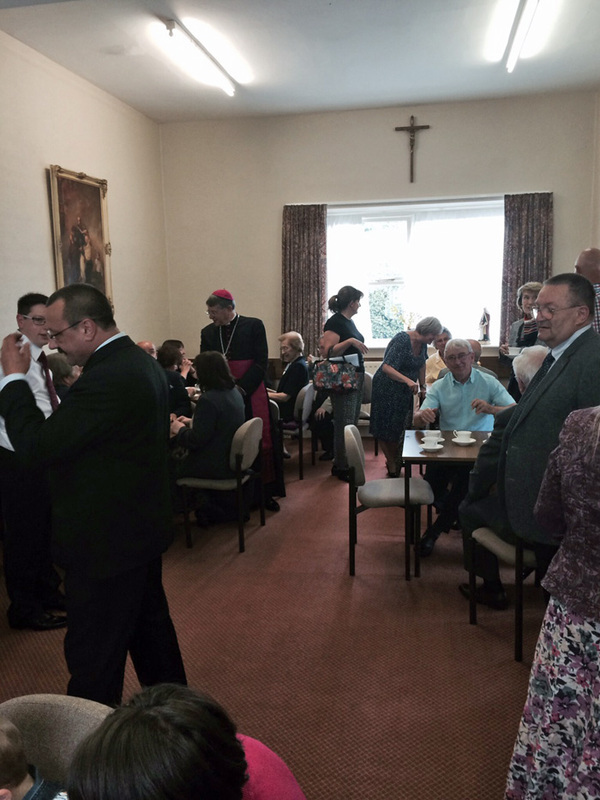 Father Ekin celebrates his 80th birthday in the Parish House at St Osmund's Church. 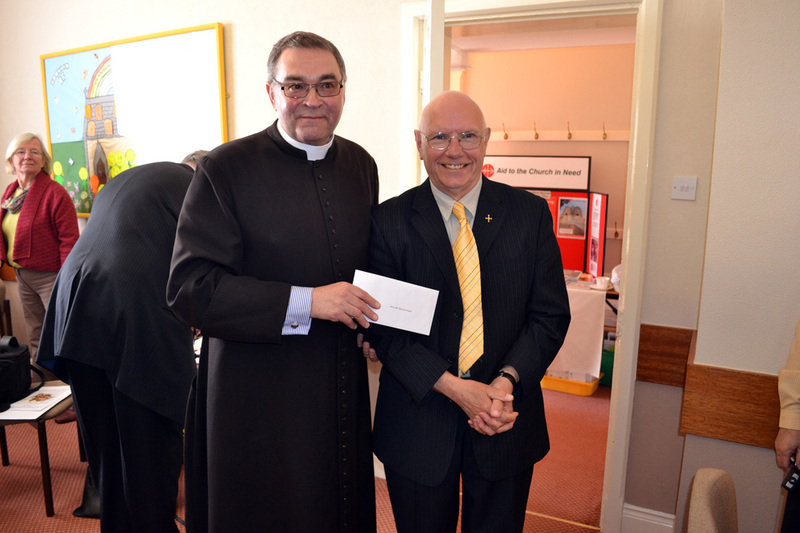 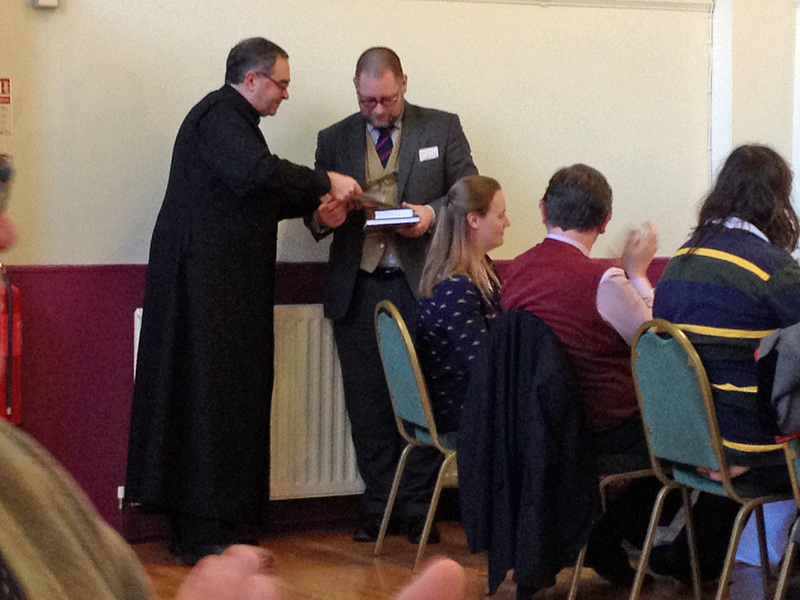 Father Grieves presents a cheque of £500 to Mr Mike Collins from Aid to the Church in Need. Mr Collins spoke during both our Masses today about the work of Aid to the Church in Need. 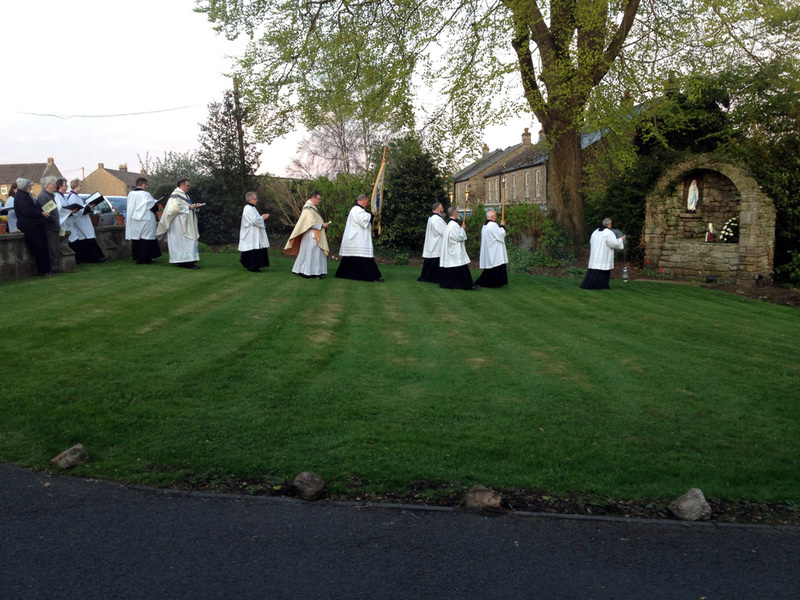 Sunday 26th April. 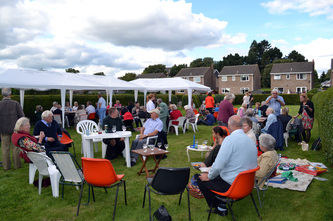 (We made a profit of £1,003 at this event, very many thanks to all who prepared food and who helped to make the evening a great success). 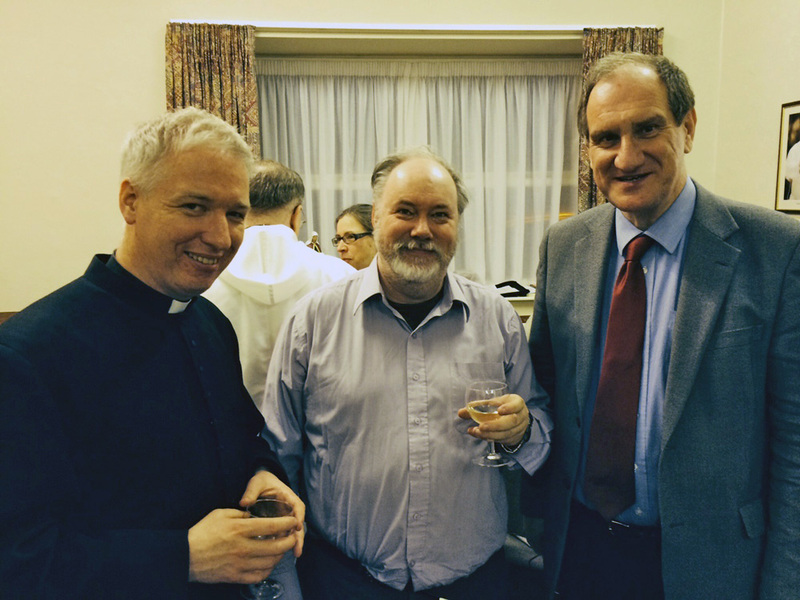 Confirmation of David Dominic Miller into the Catholic Church, with Fr Ian Grieves (left) and Fr Jerome Ainsworh from St Catherine's Catholic Church, Penrith. 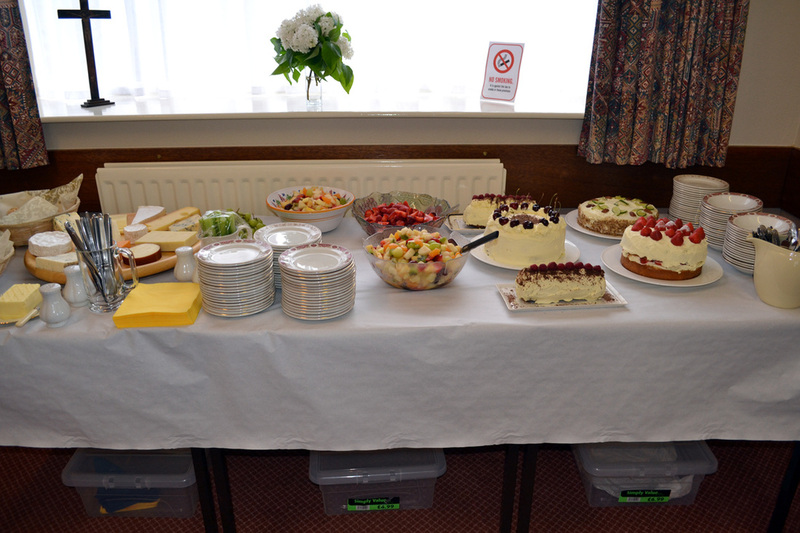 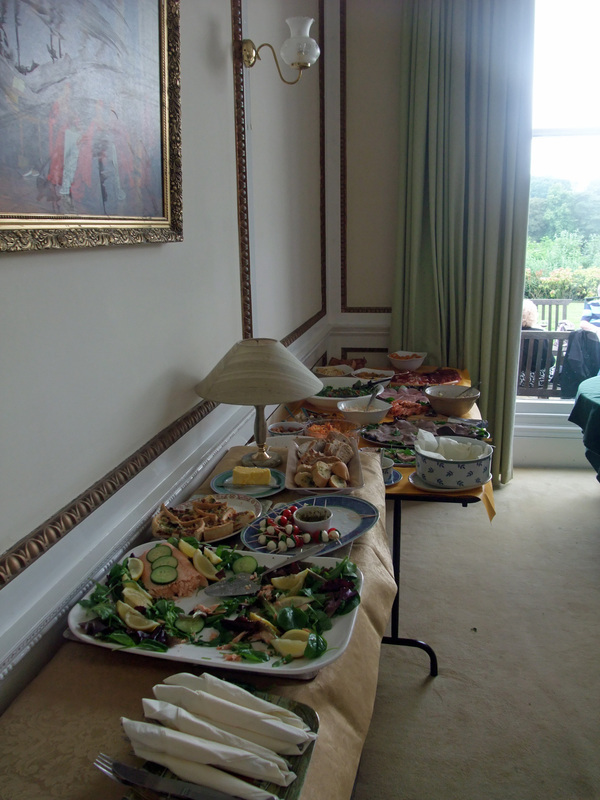 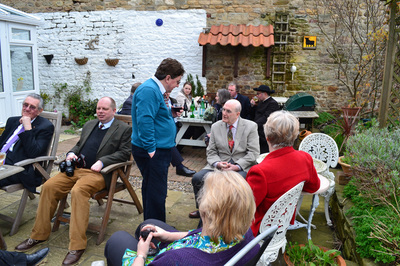 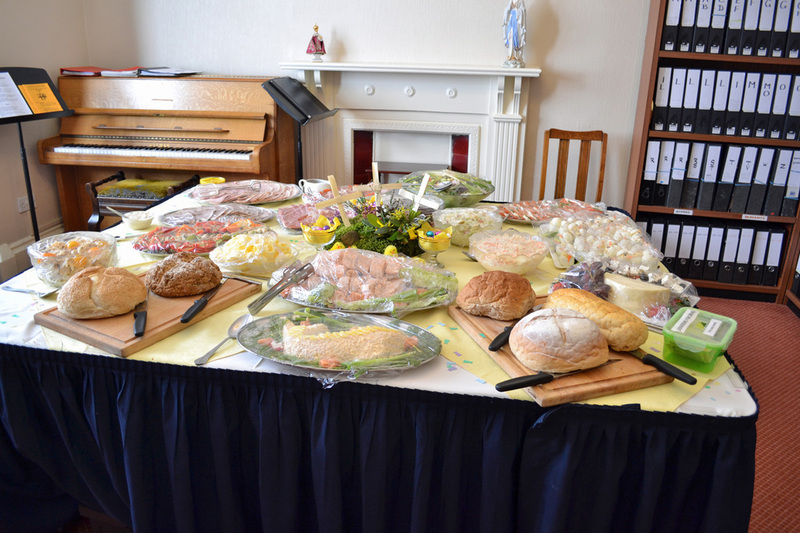 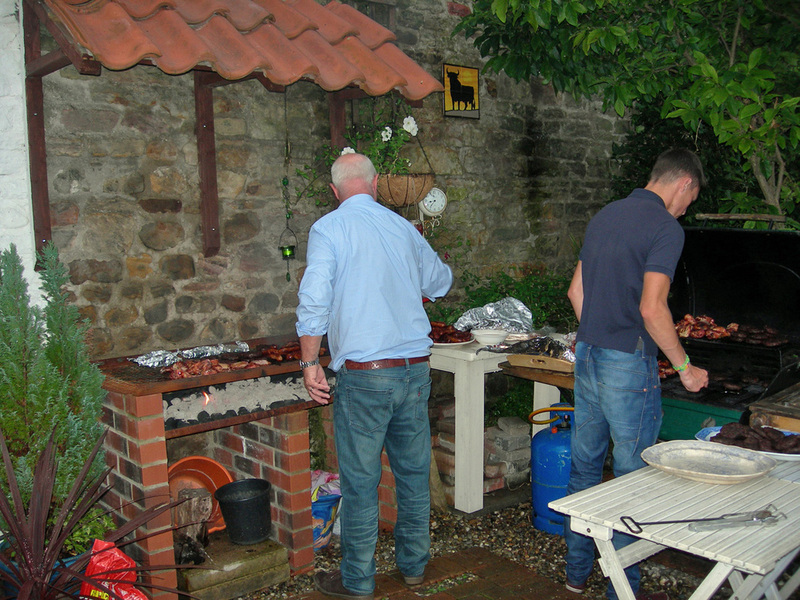 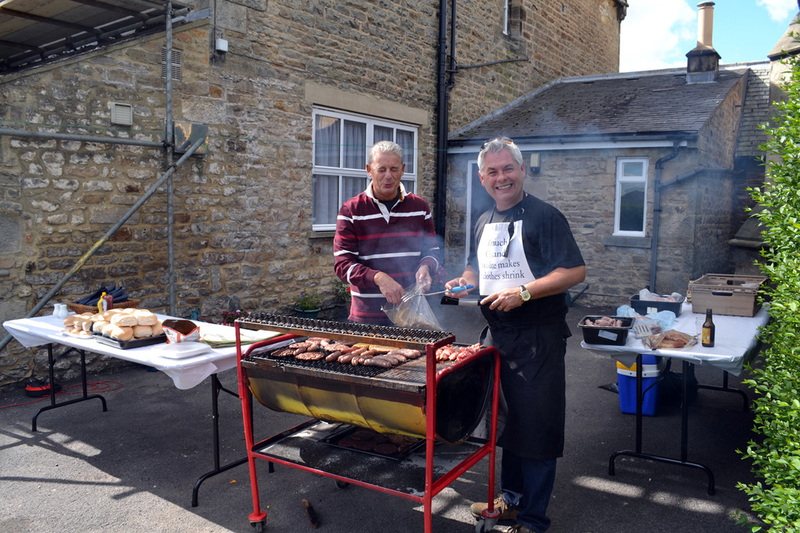 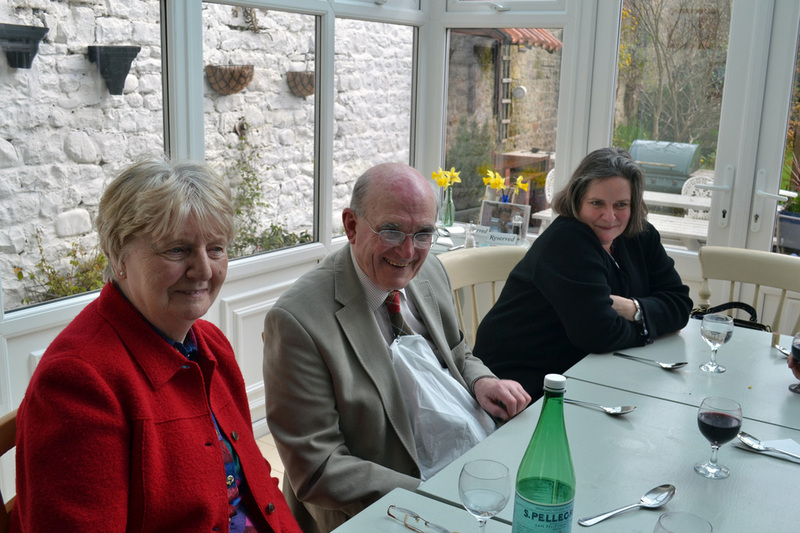 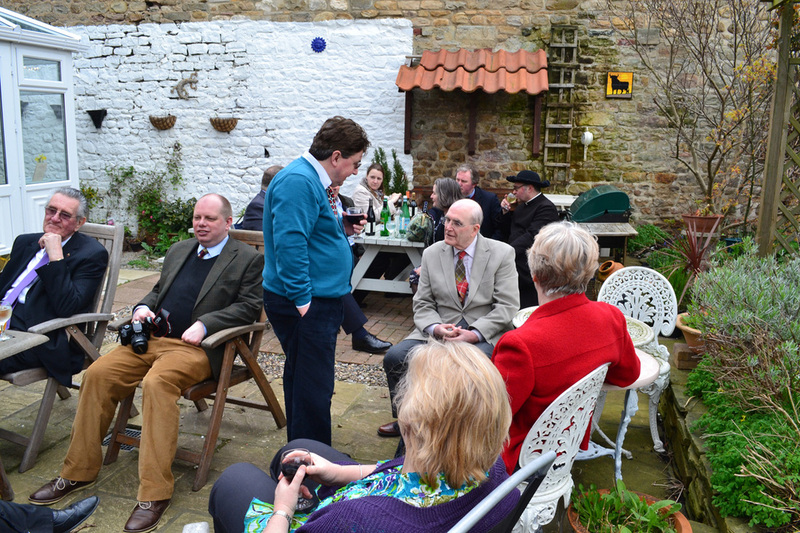 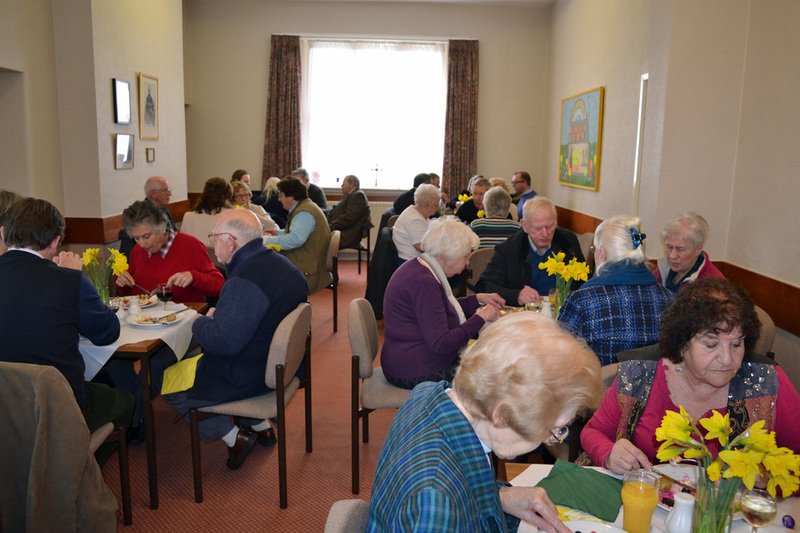 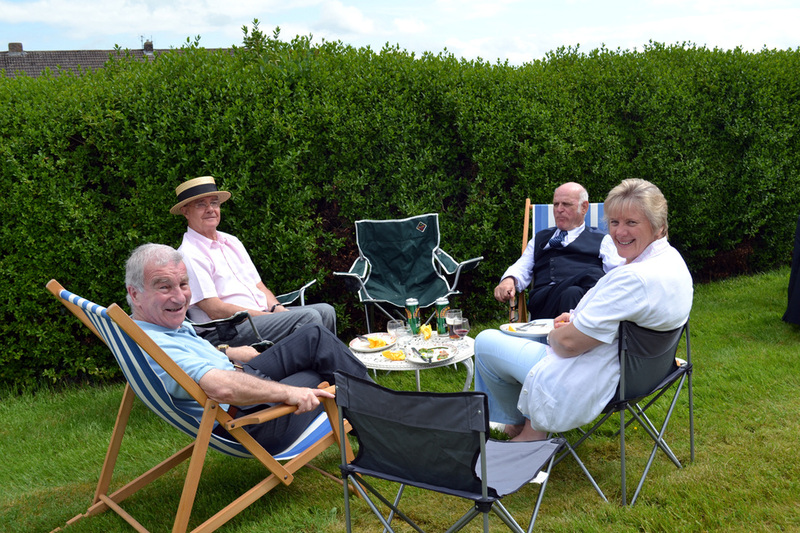 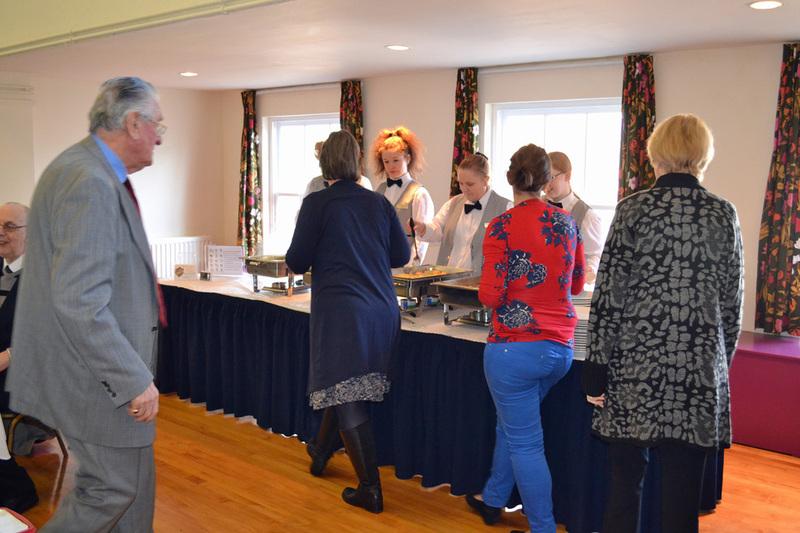 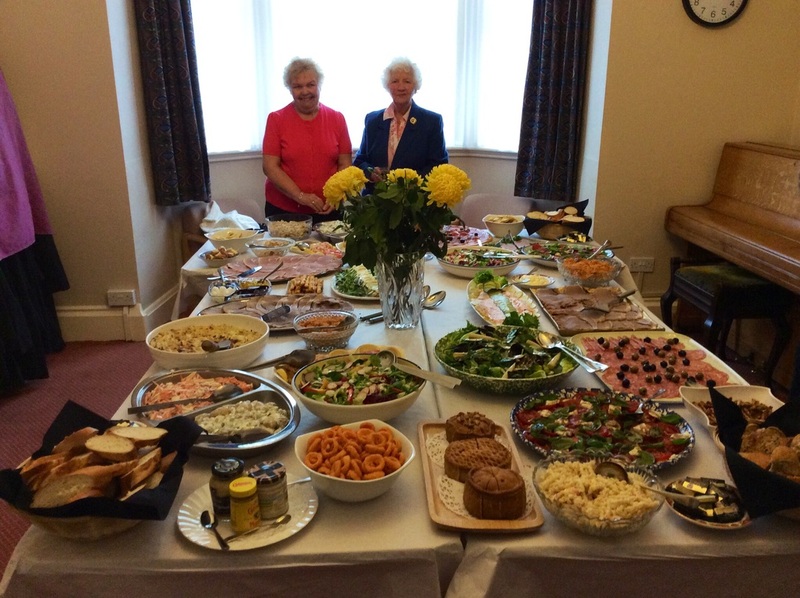 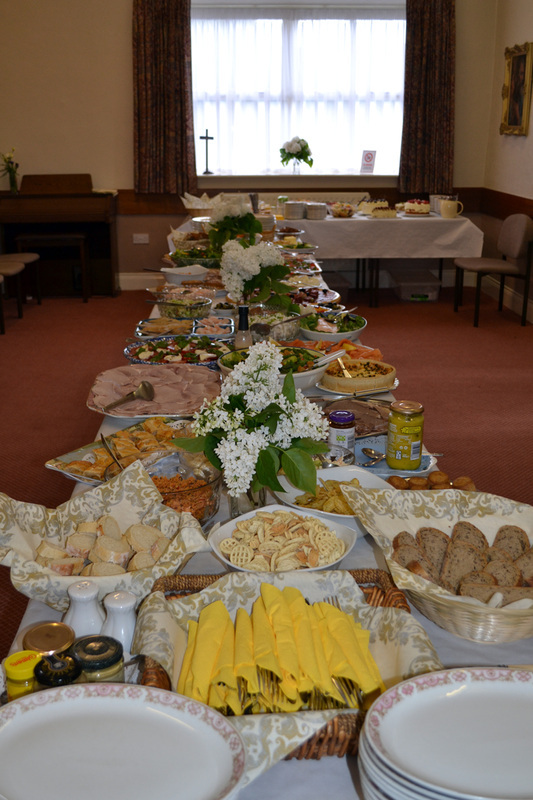 Our delicious Easter Brunch supplied and served by Haregill Lodge Catering, Masham. 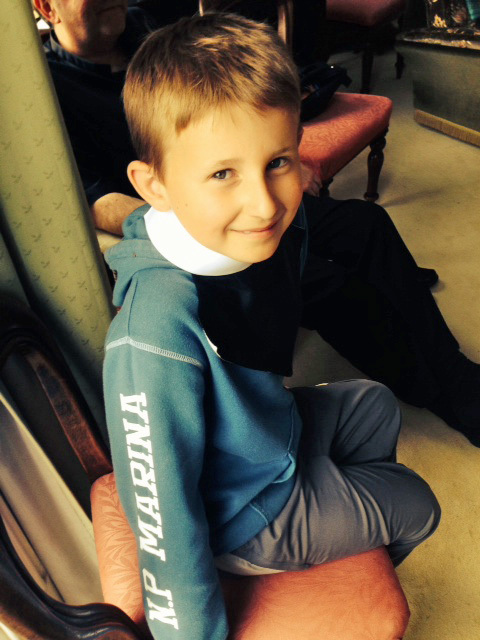 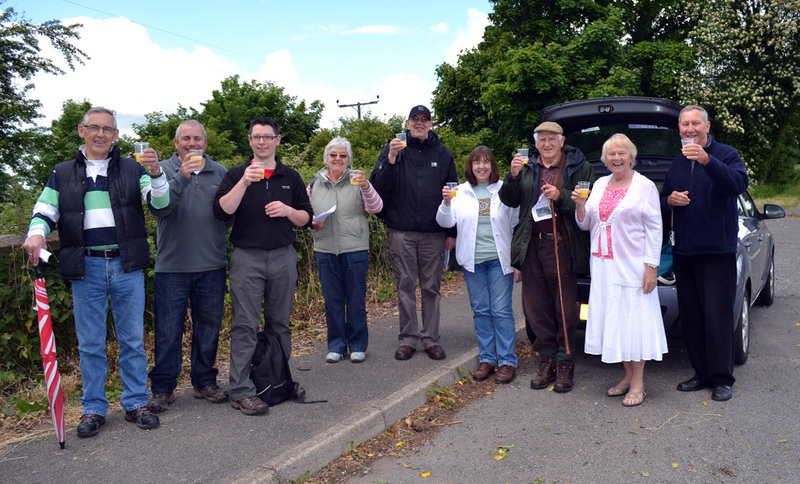 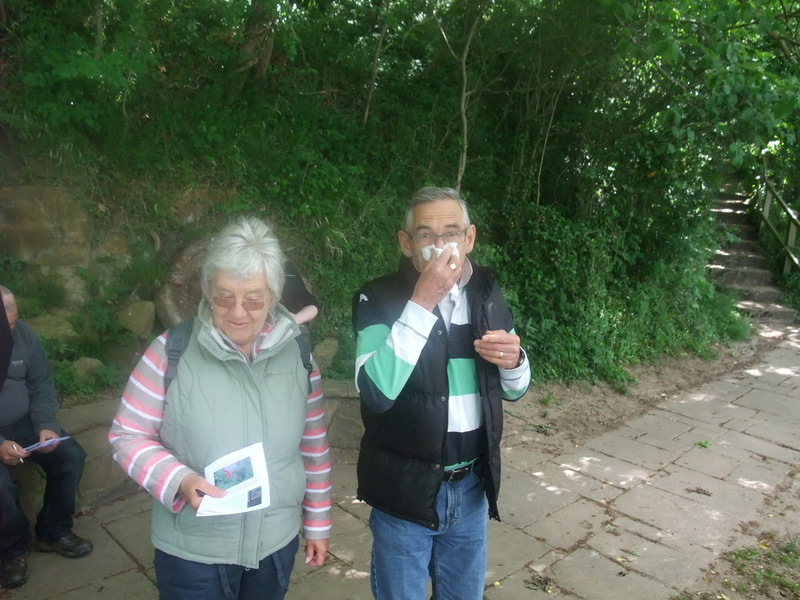 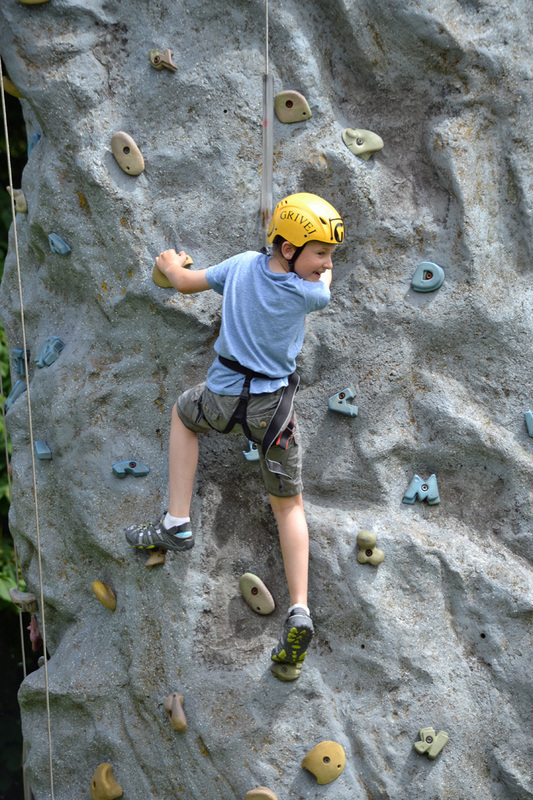 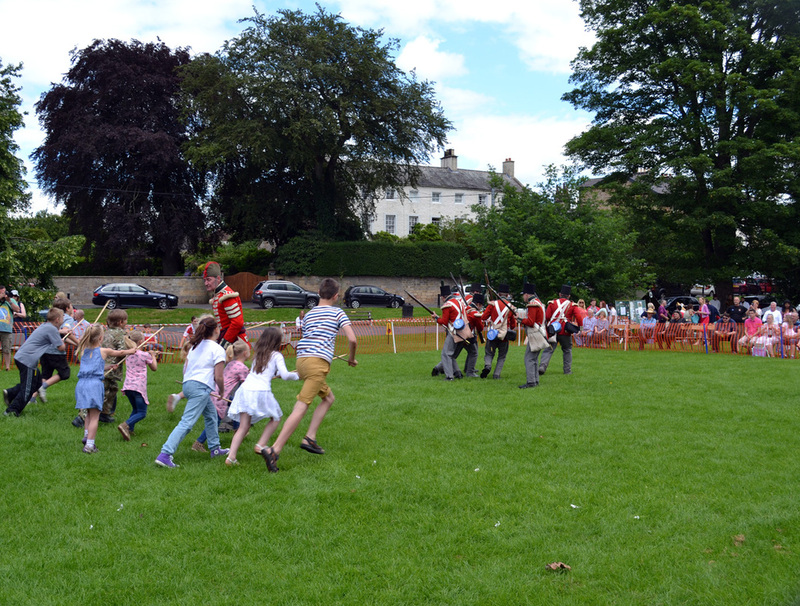 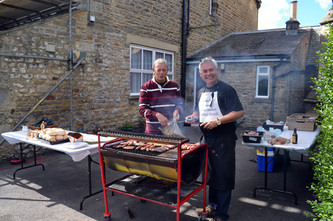 We raised £1,025 - a great effort by everyone! 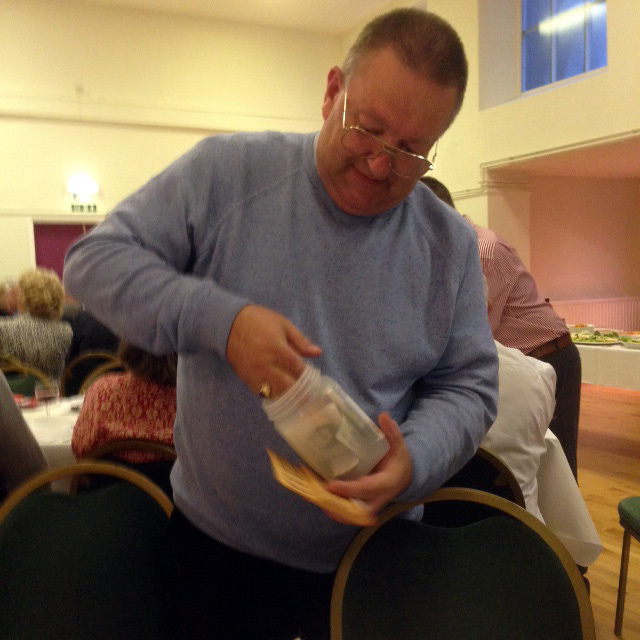 We made a profit of £1,000 tonight. 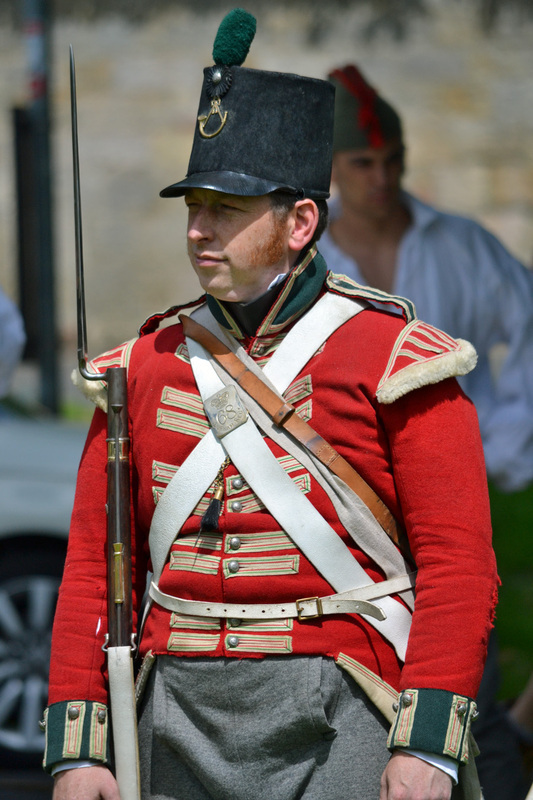 Very many thanks to all those who helped and supported this event. 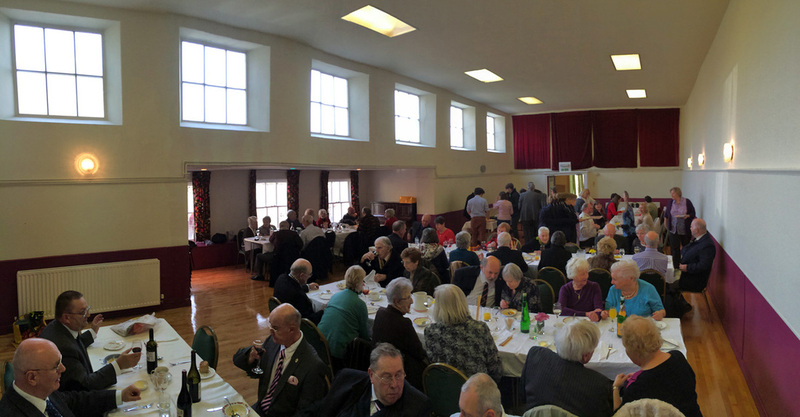 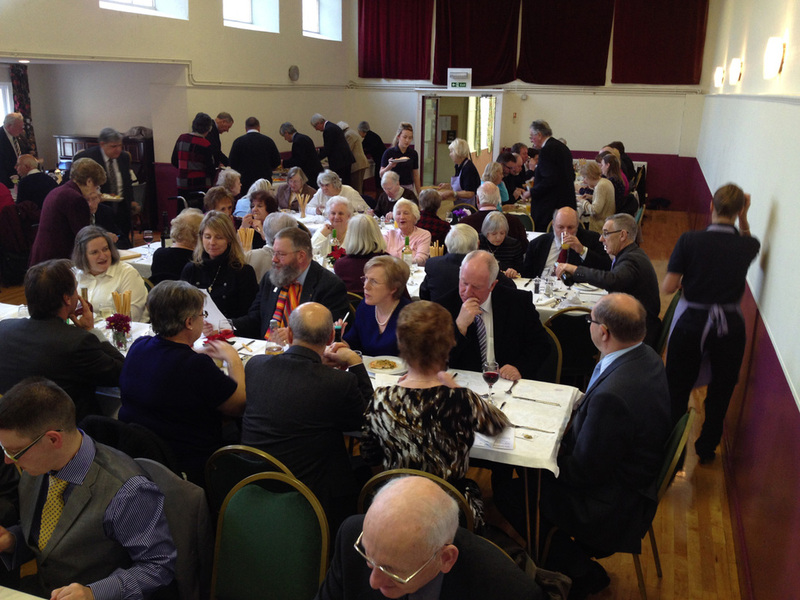 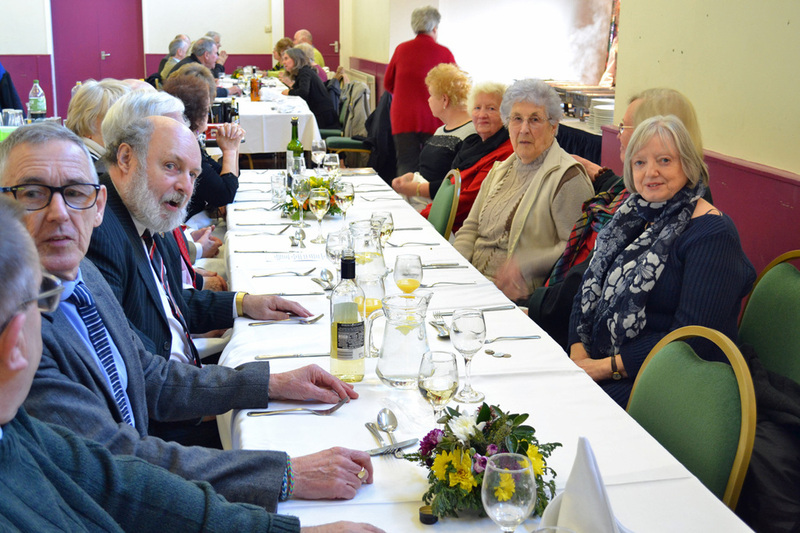 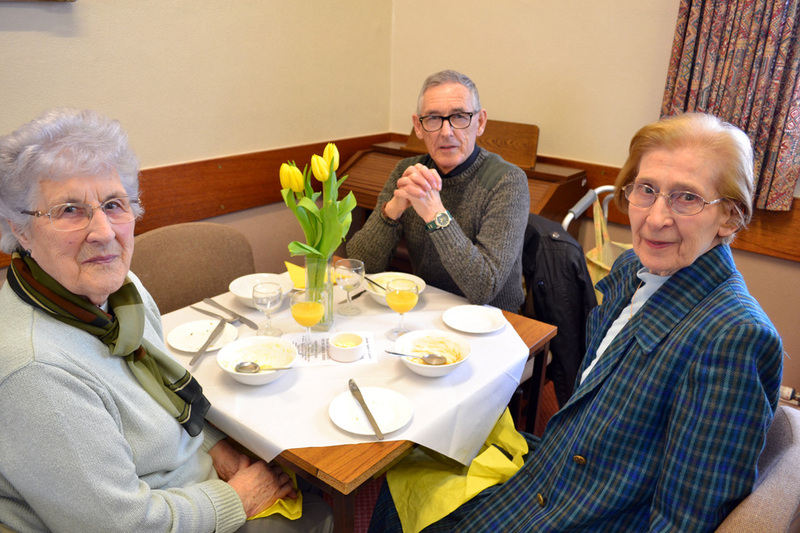 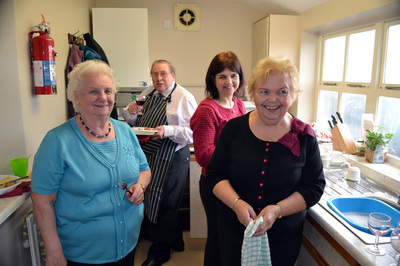 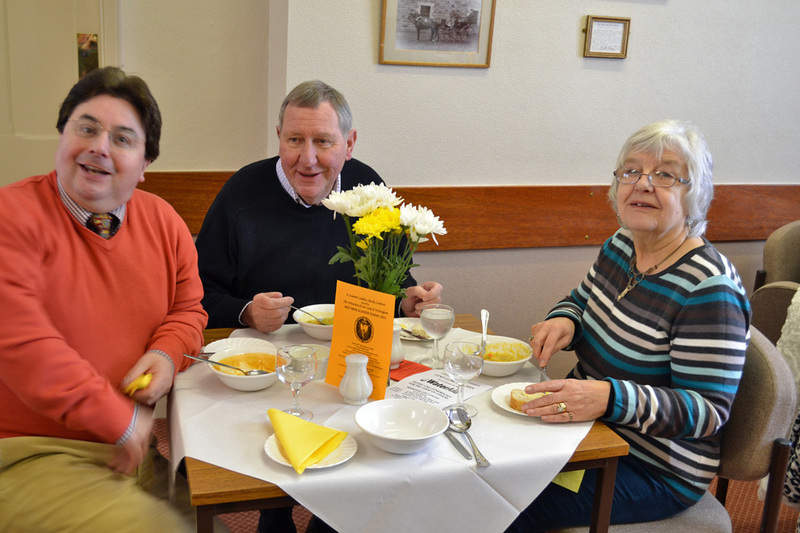 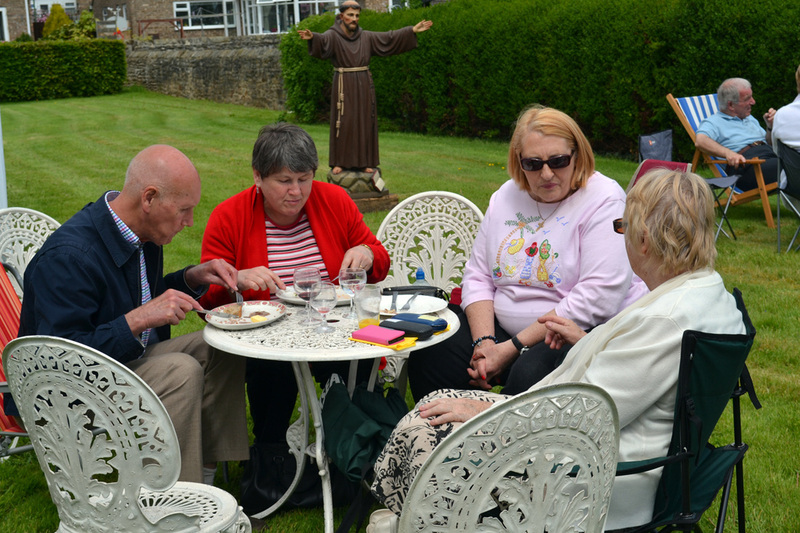 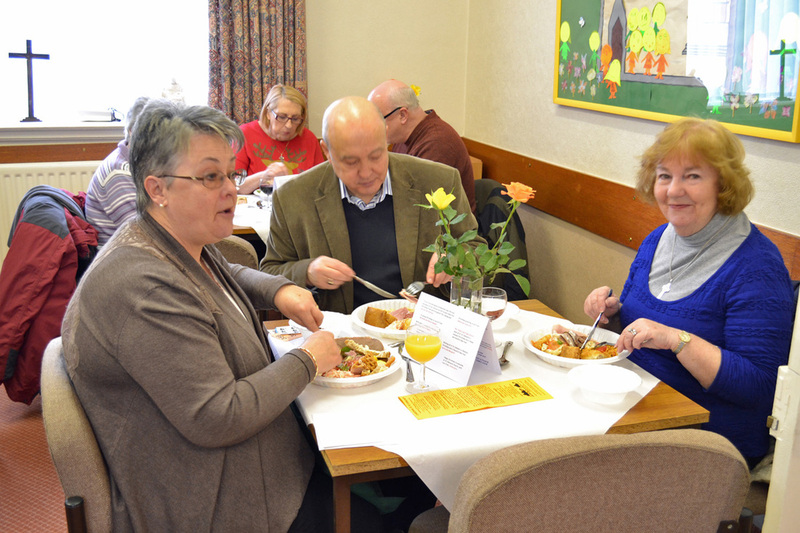 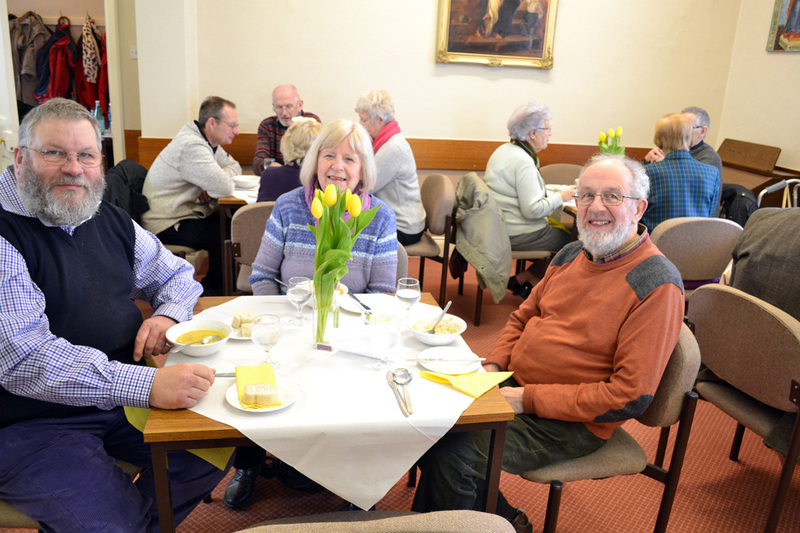 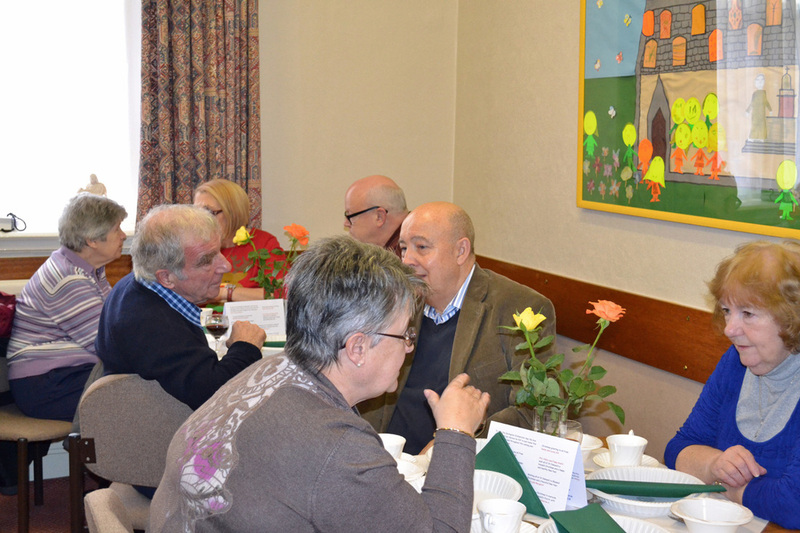 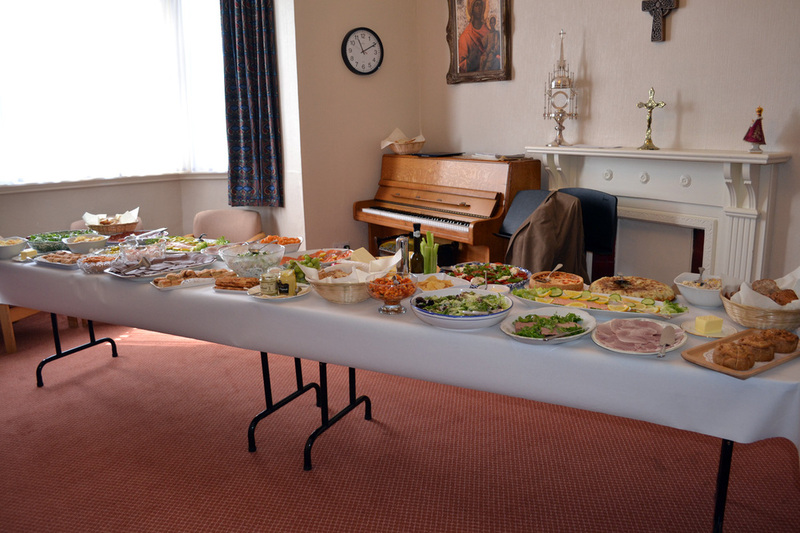 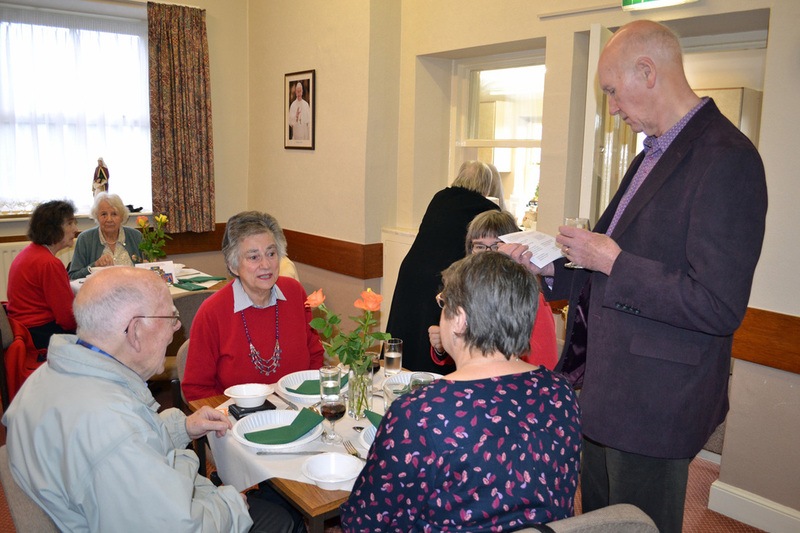 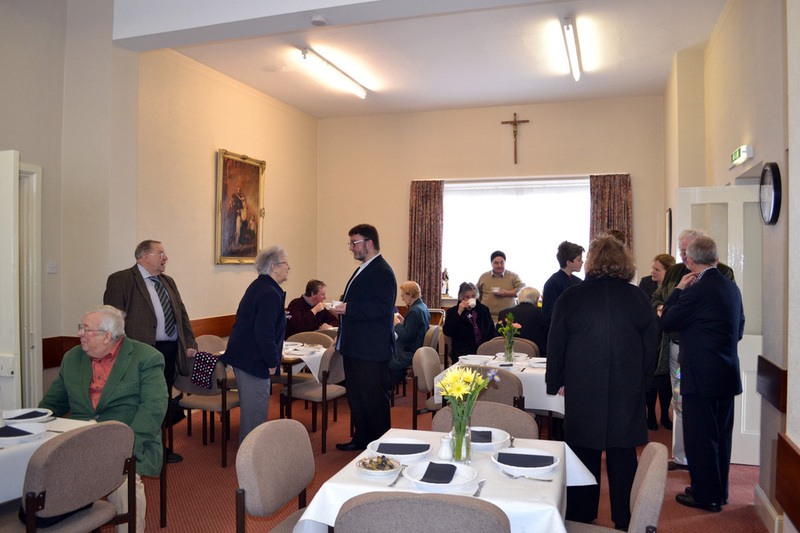 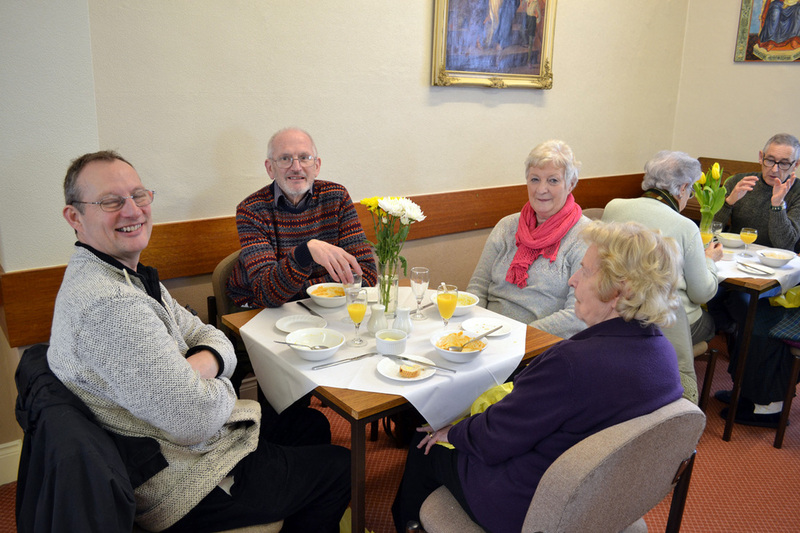 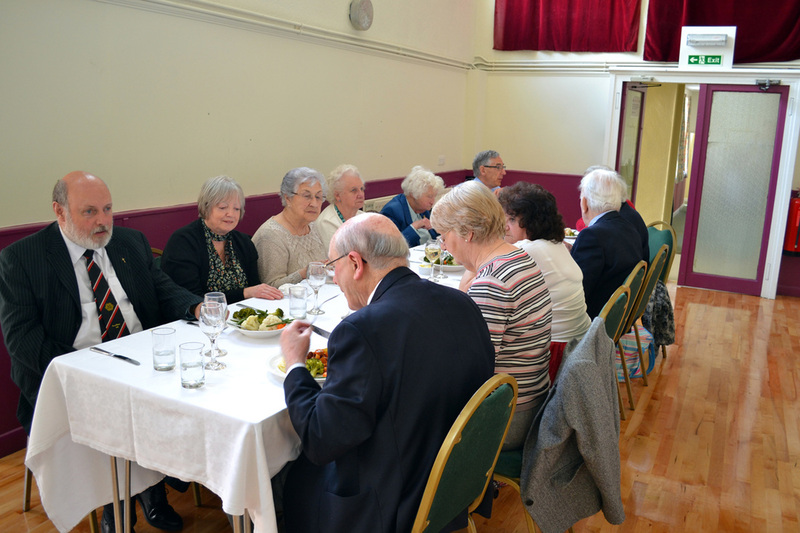 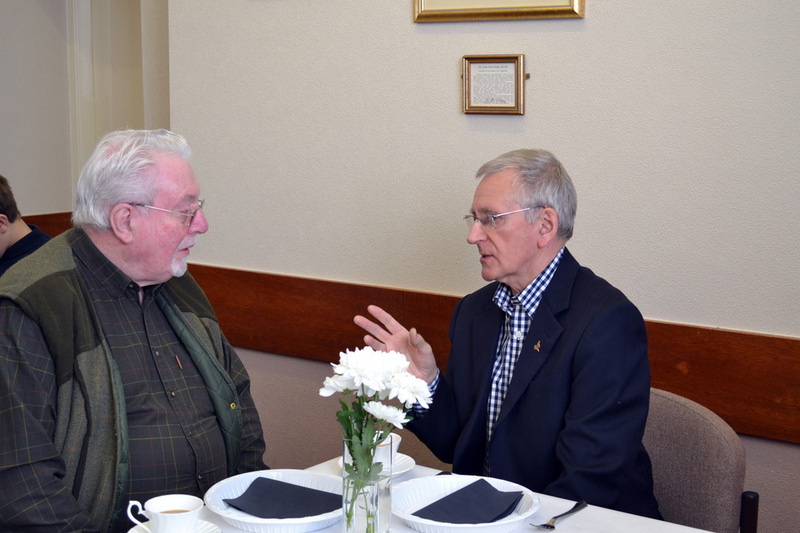 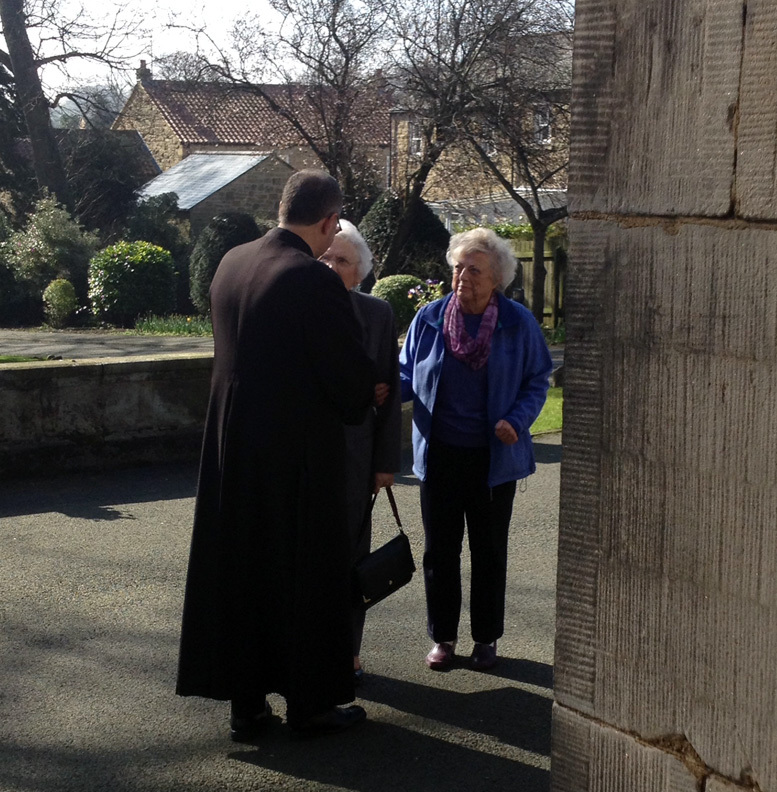 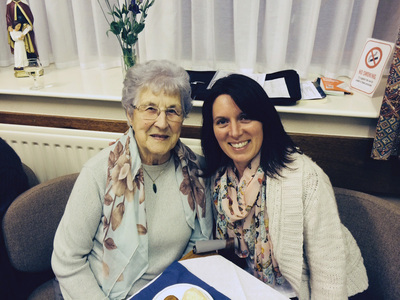 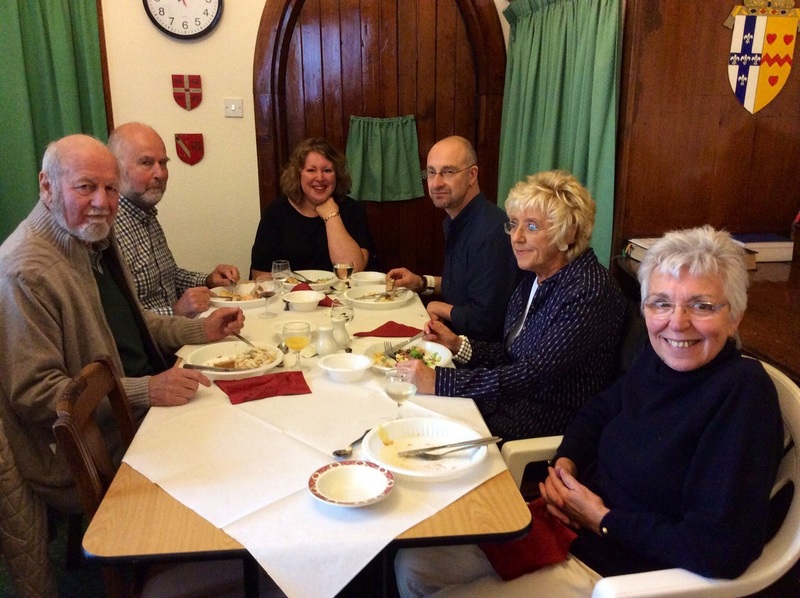 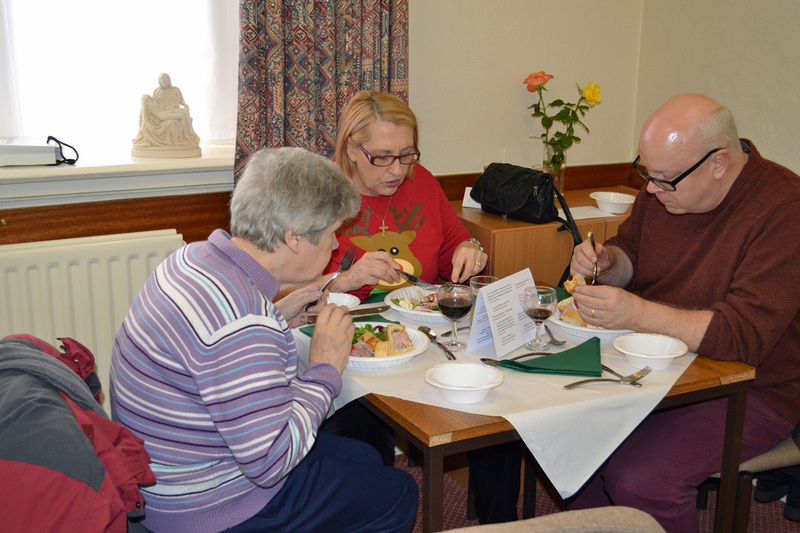 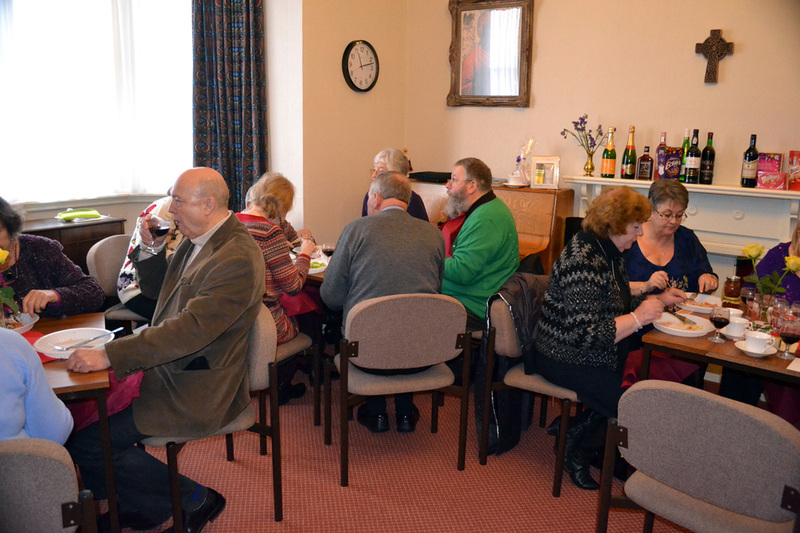 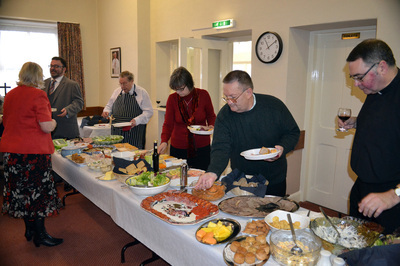 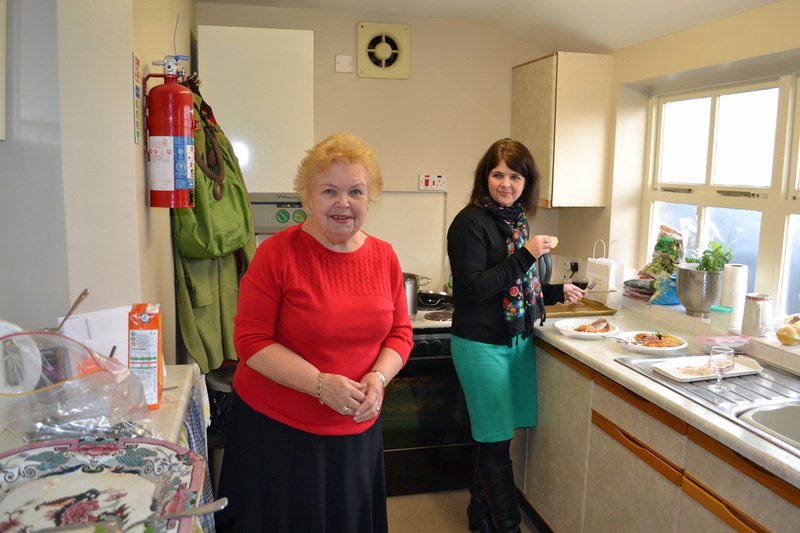 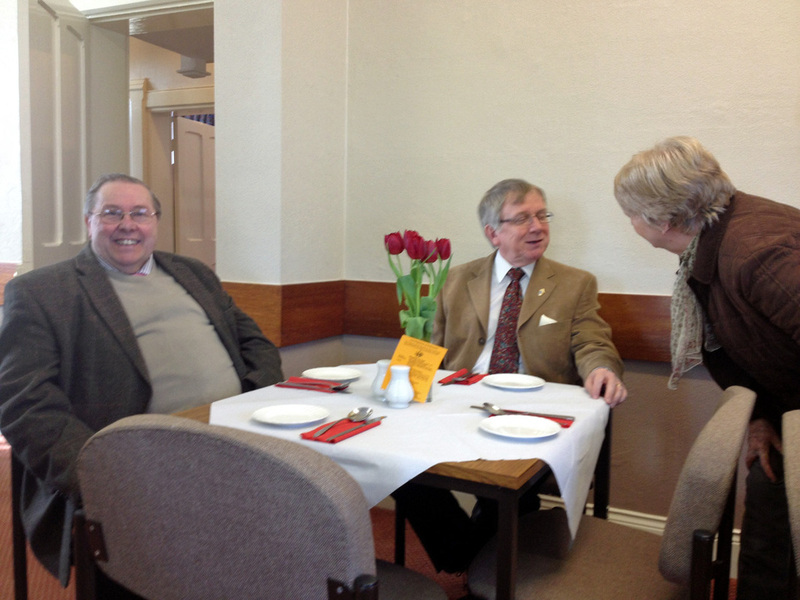 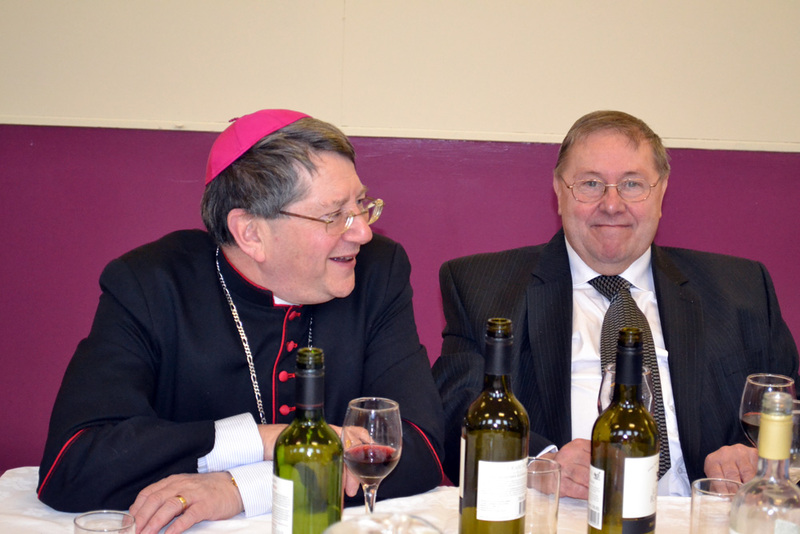 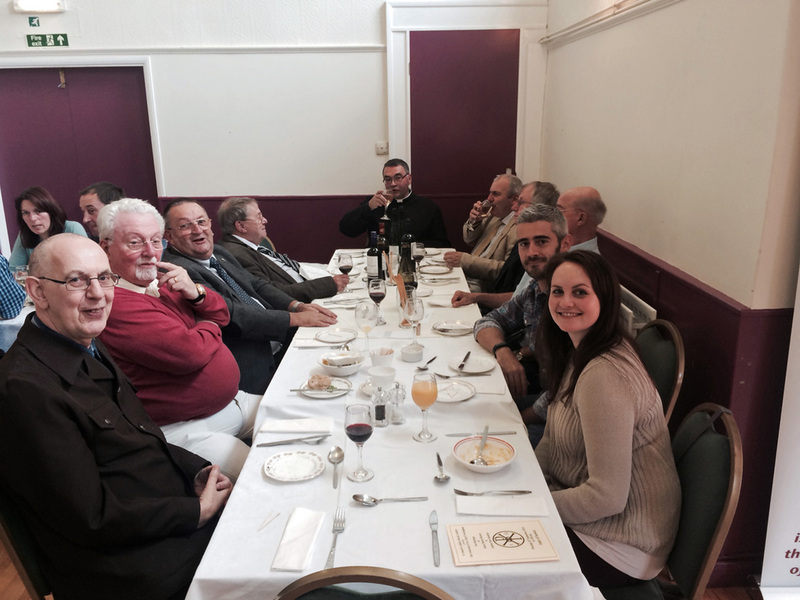 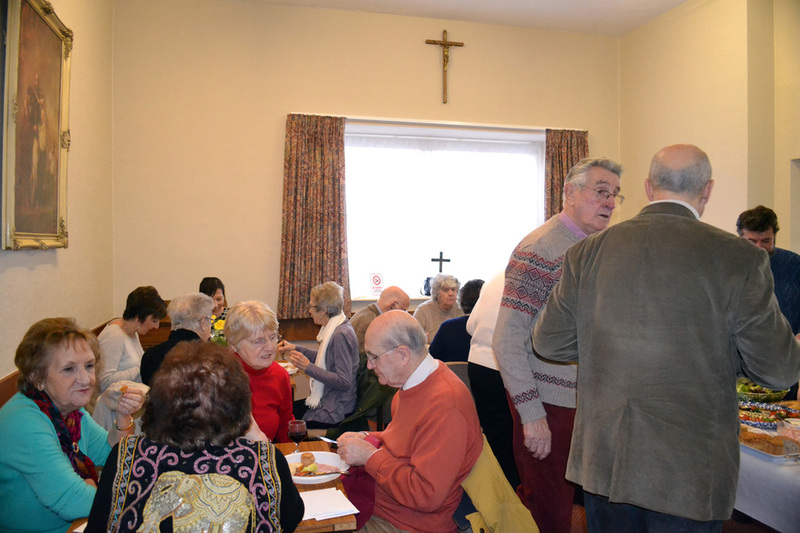 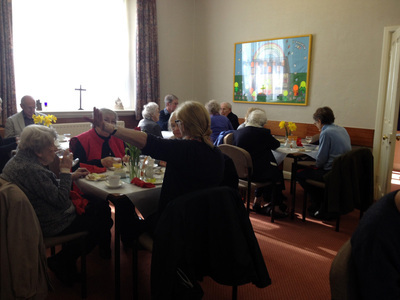 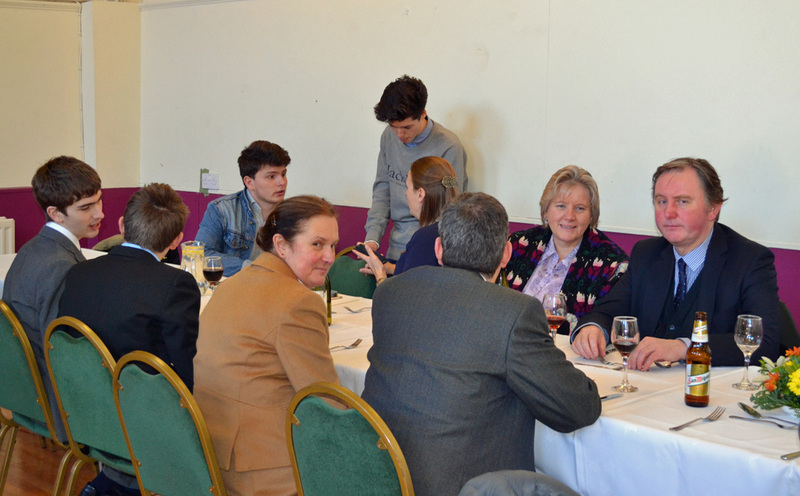 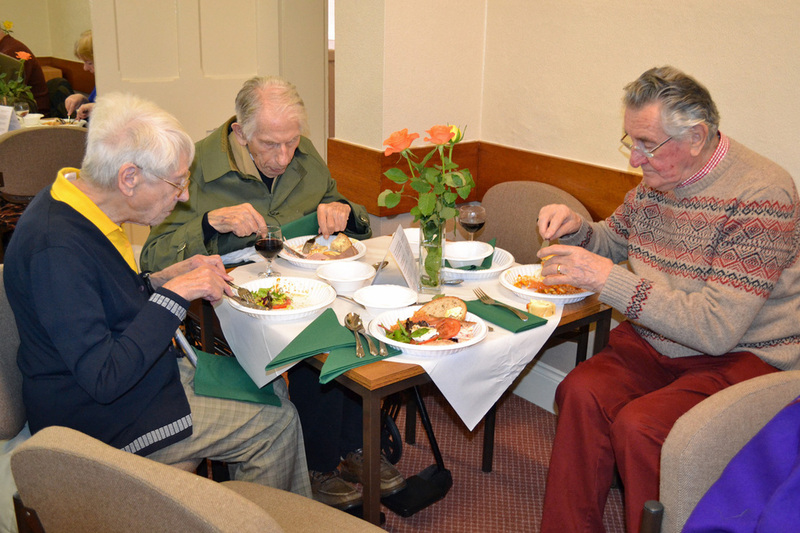 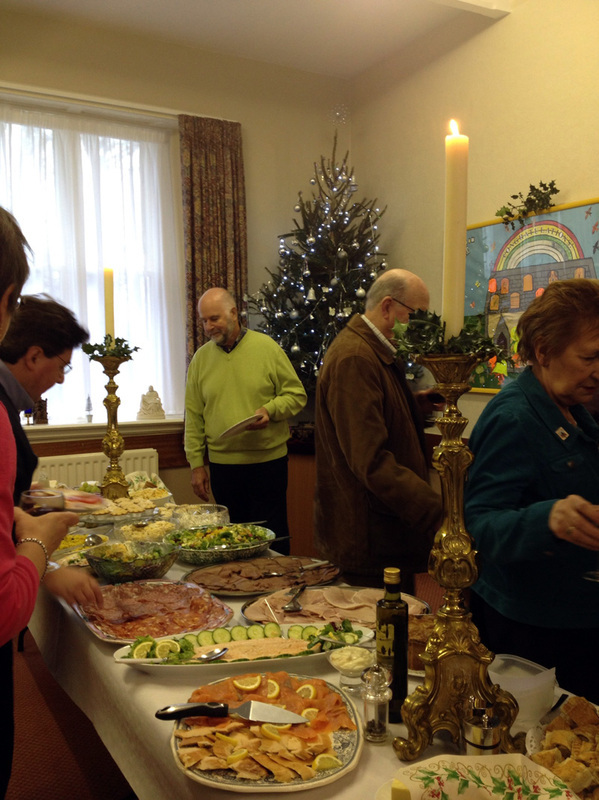 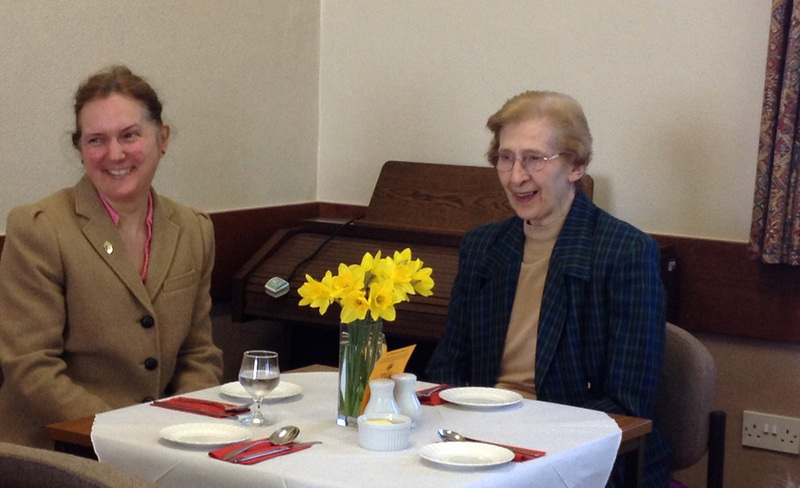 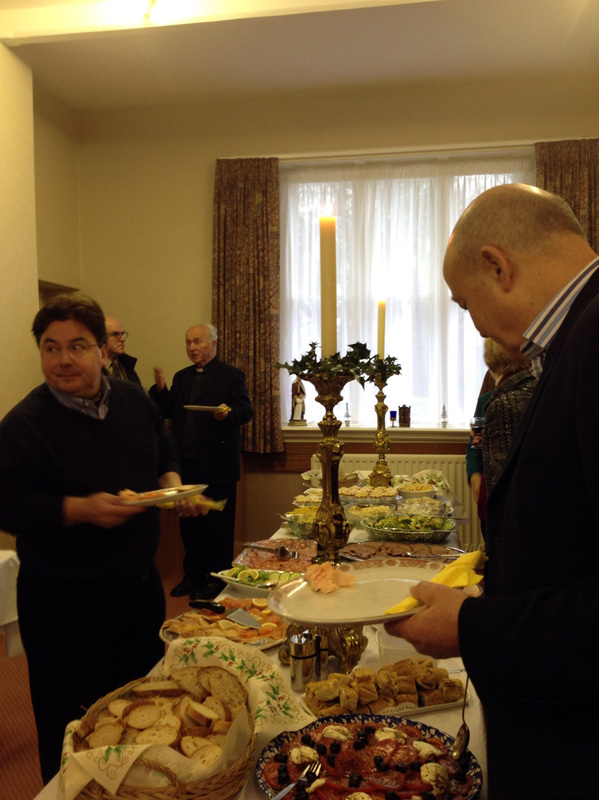 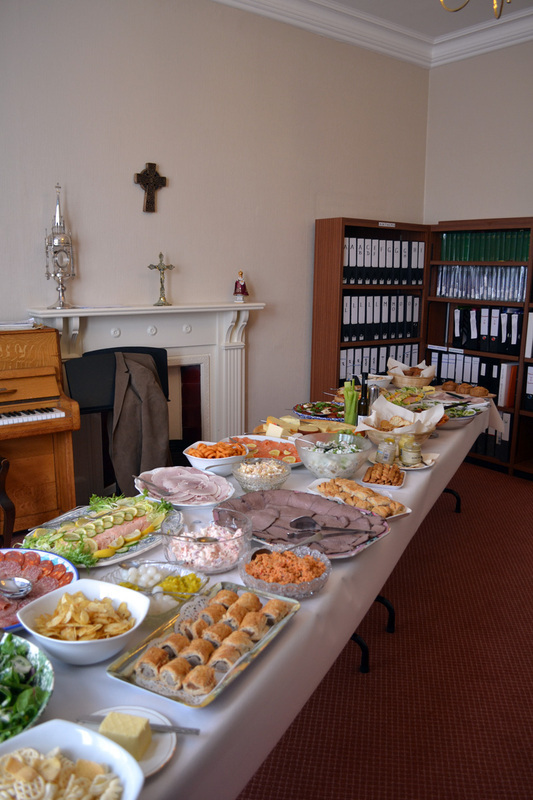 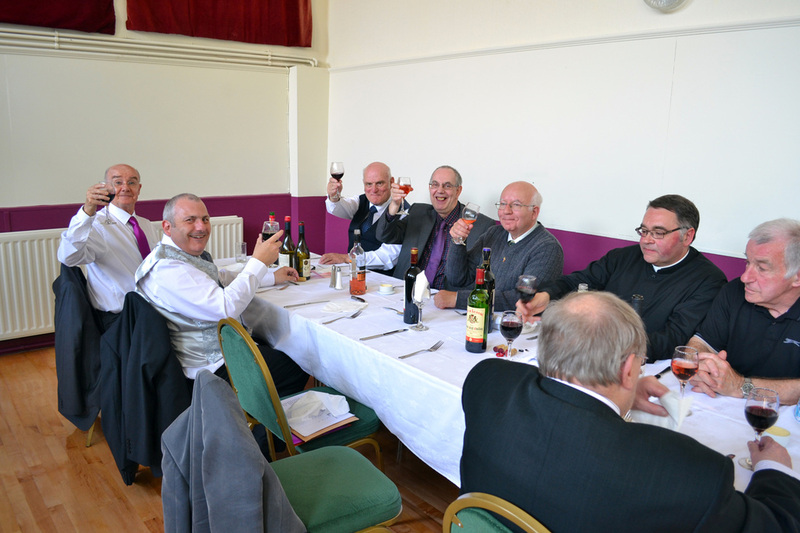 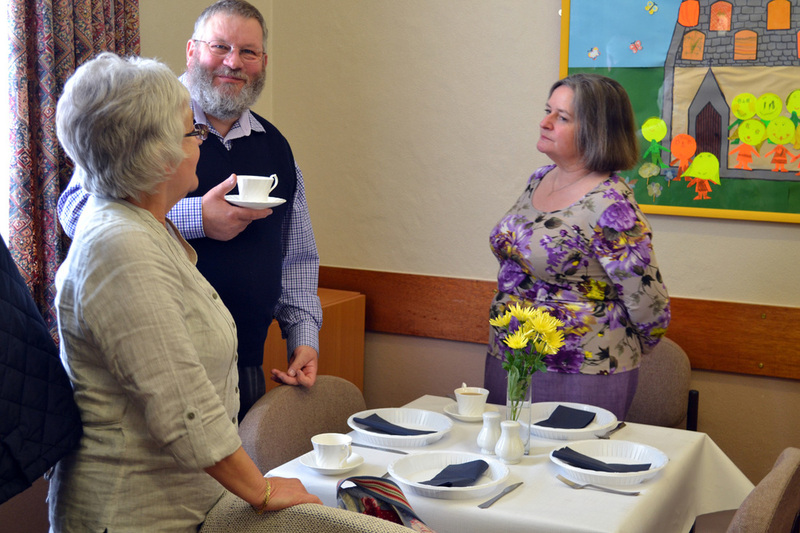 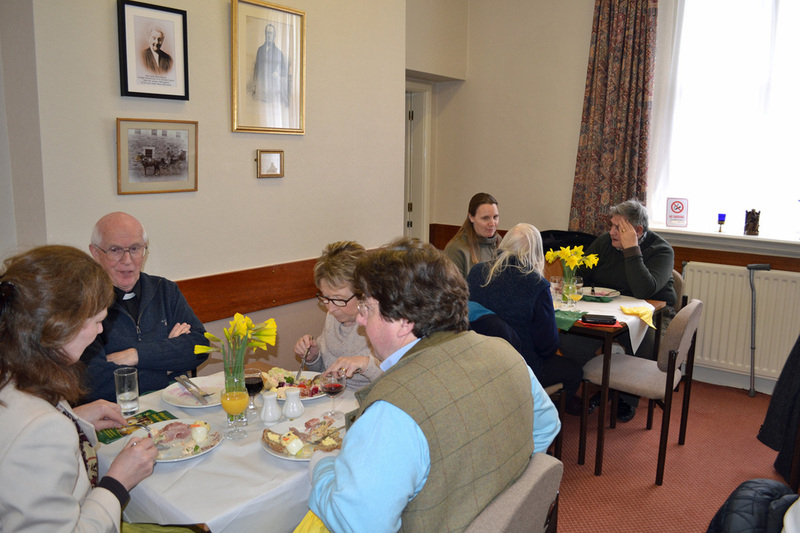 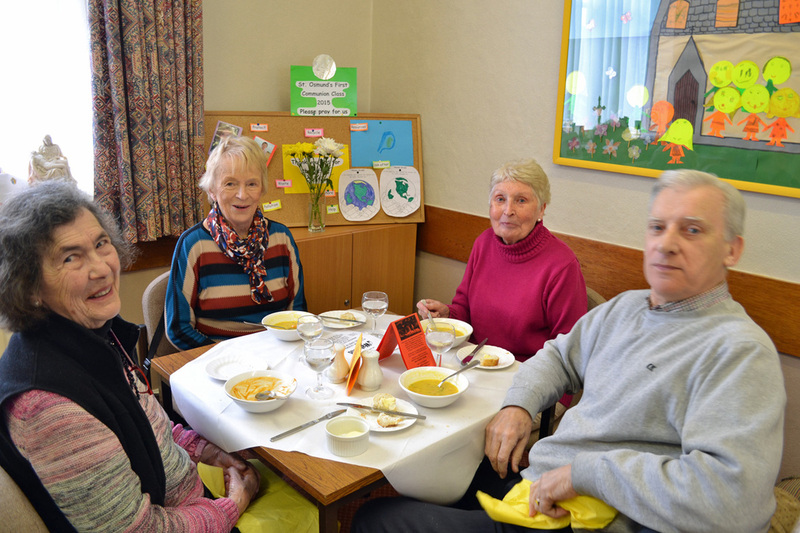 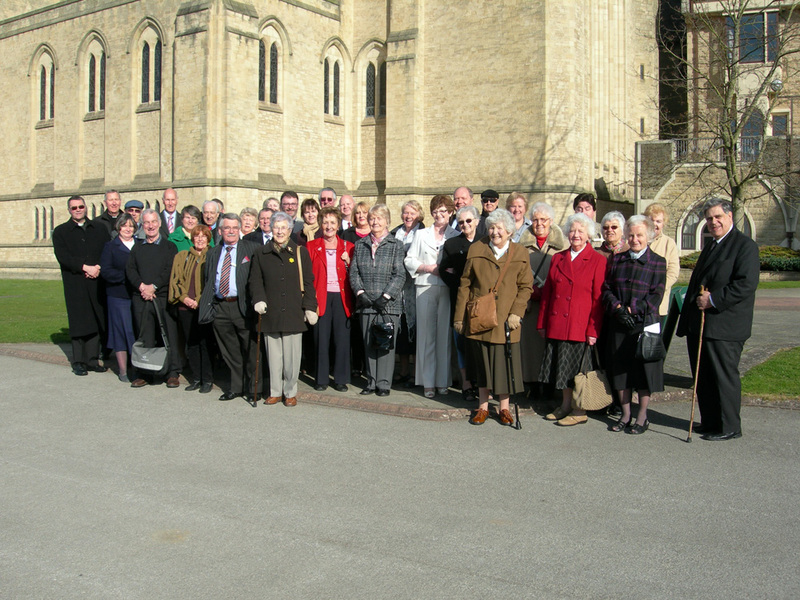 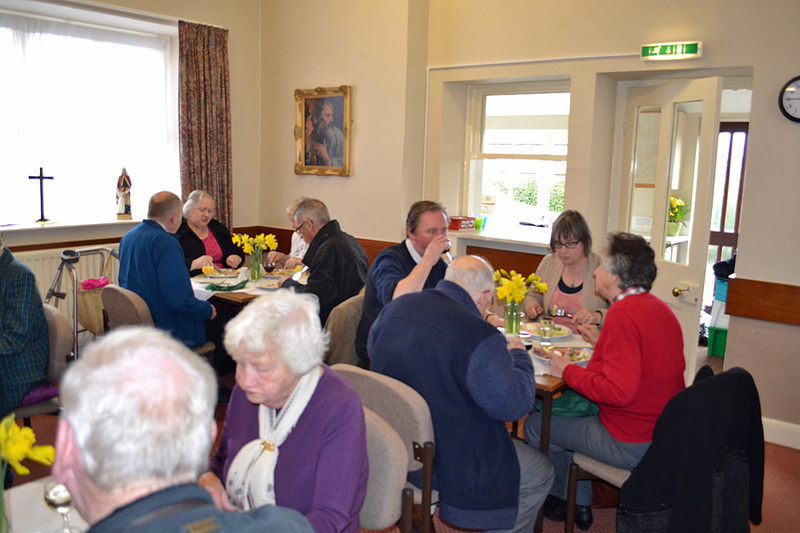 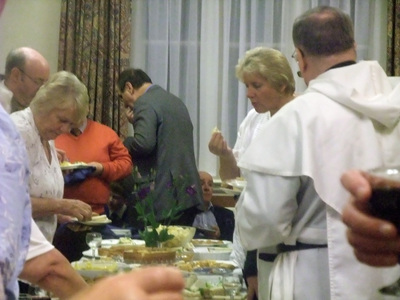 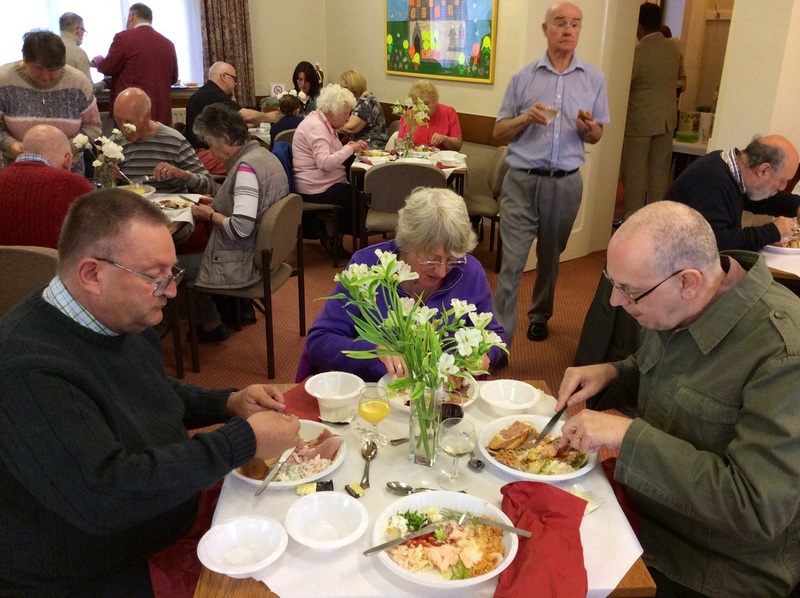 LENT LUNCH AT ST OSMUND'S CATHOLIC CHURCH, 25th FEBRUARY. 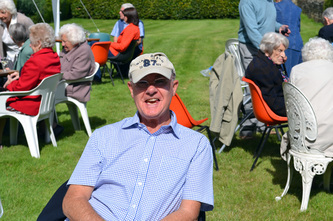 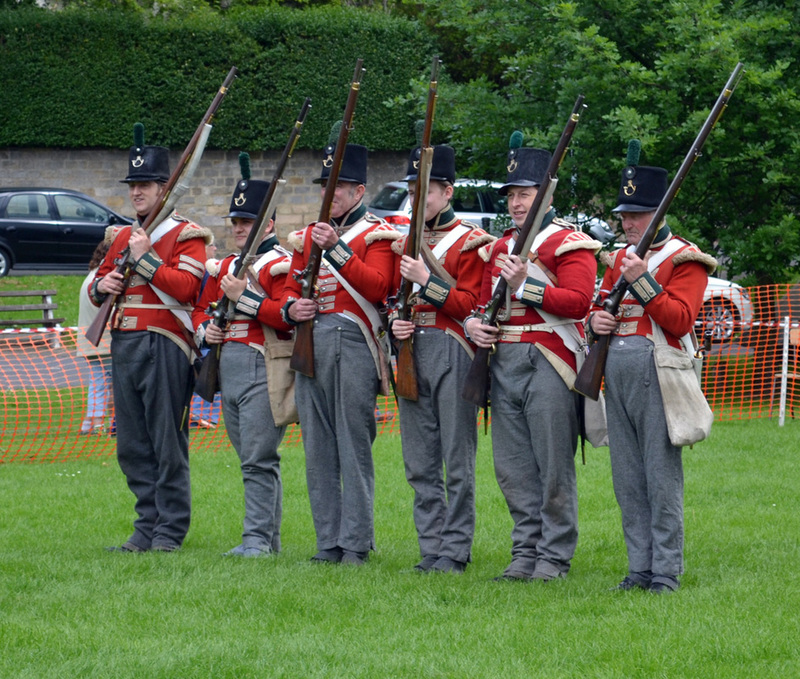 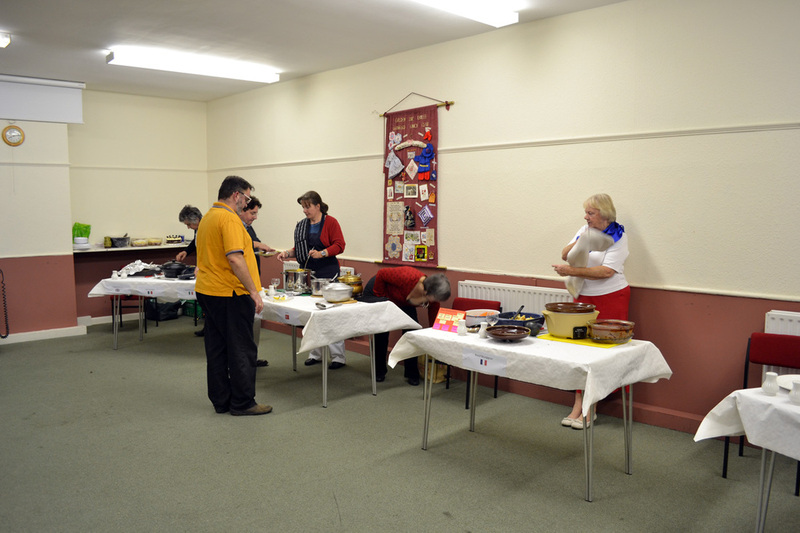 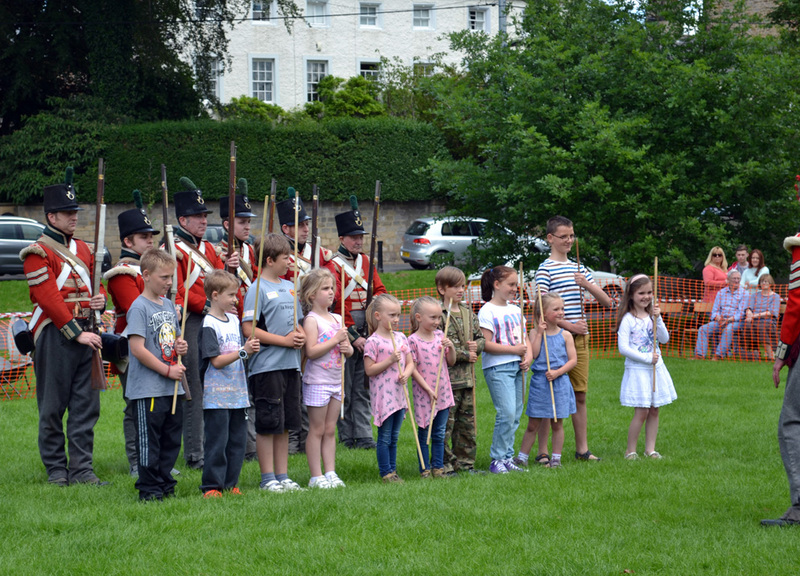 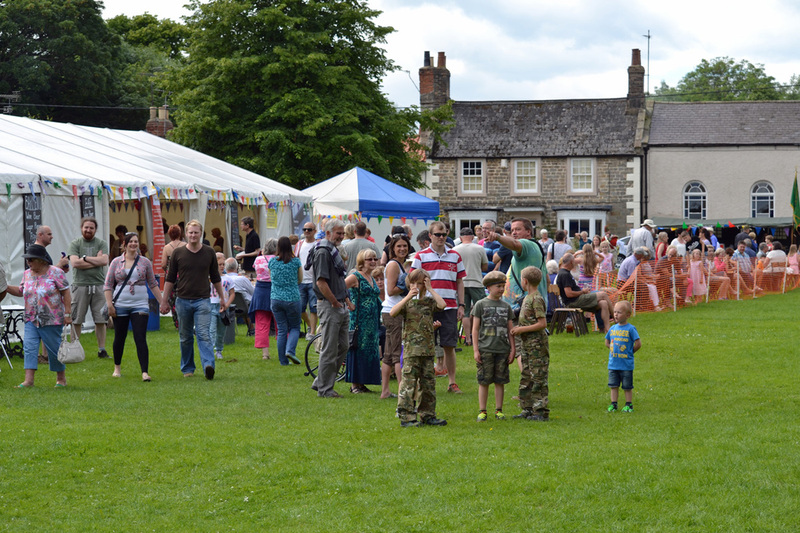 We made £1000 clear profit - very many thanks to all those who helped and all those who supported the event. 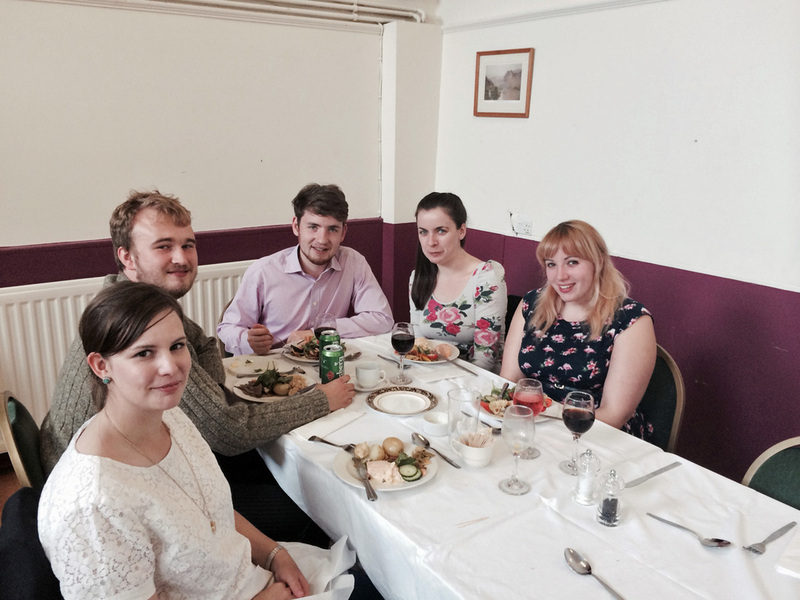 We made £1200 +. 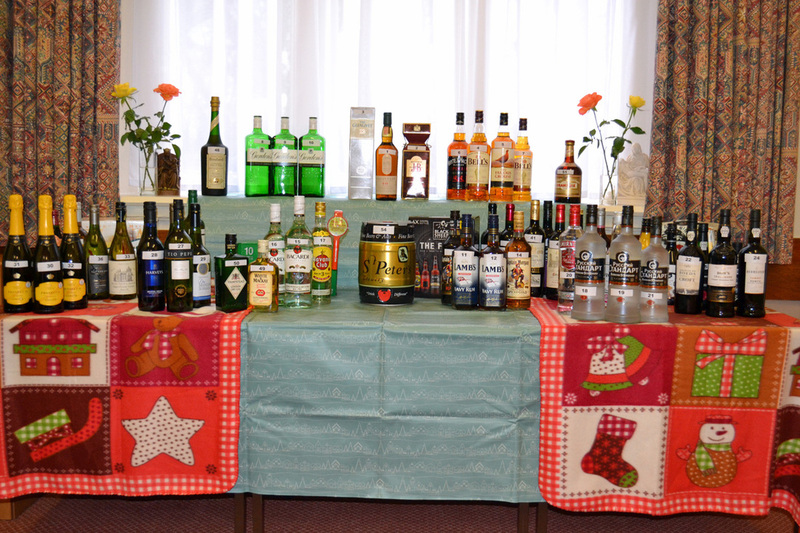 Many thanks to all who donated bottles and sold tickets and special thanks to Andrew and Darren for organising this event for us. 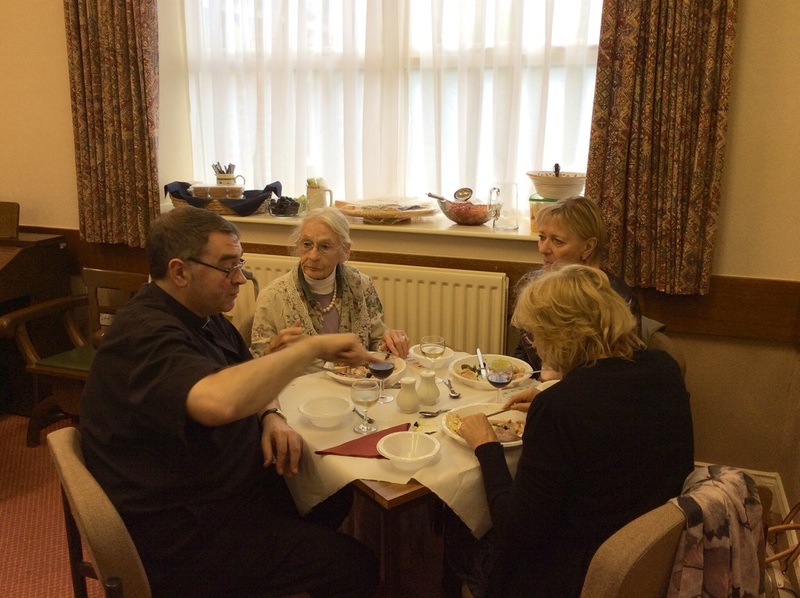 ANOTHER GREAT BRUNCH PREPARED BY FATHER GRIEVES AND ENJOYED BY ALL. 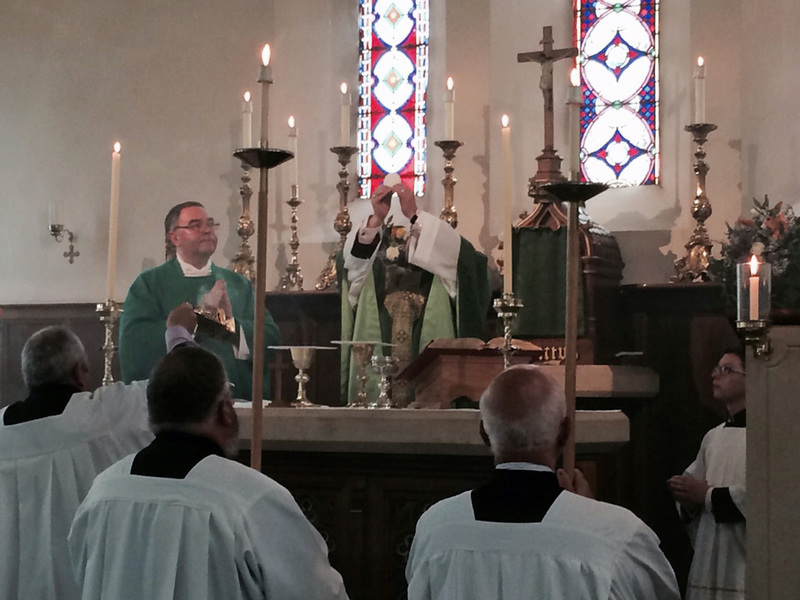 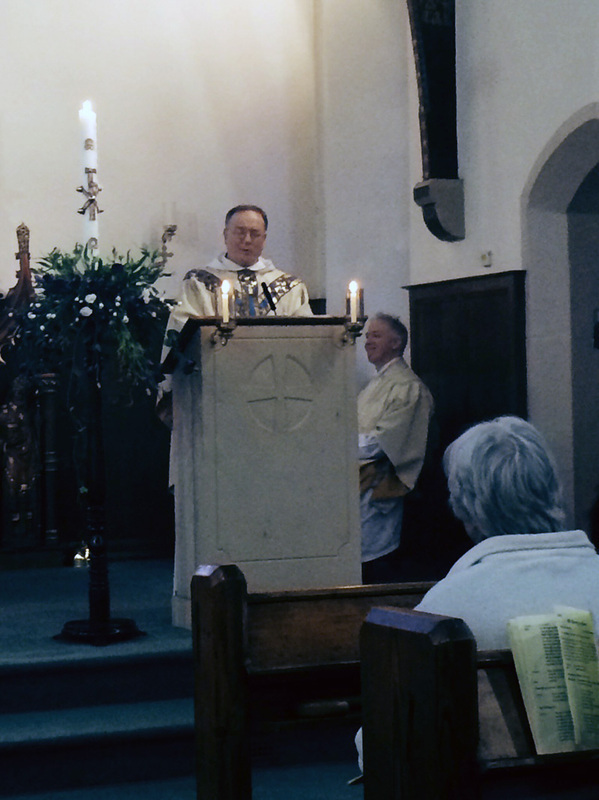 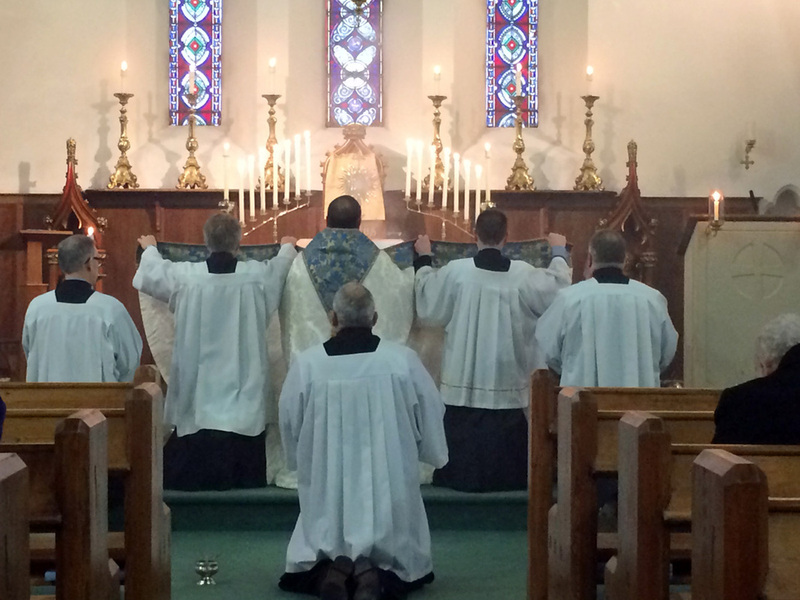 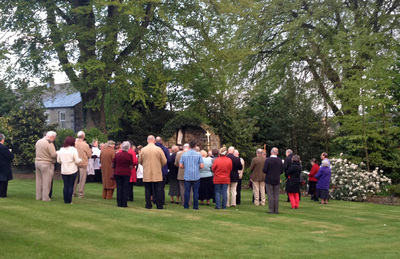 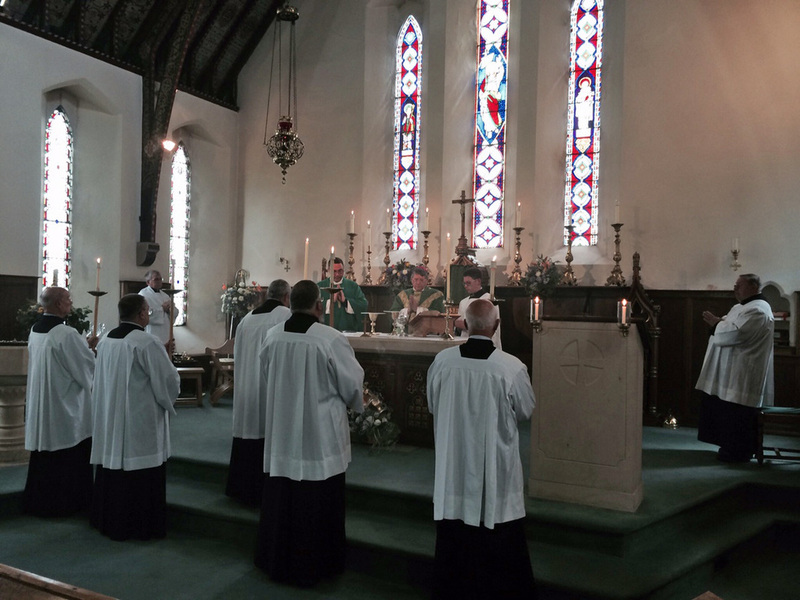 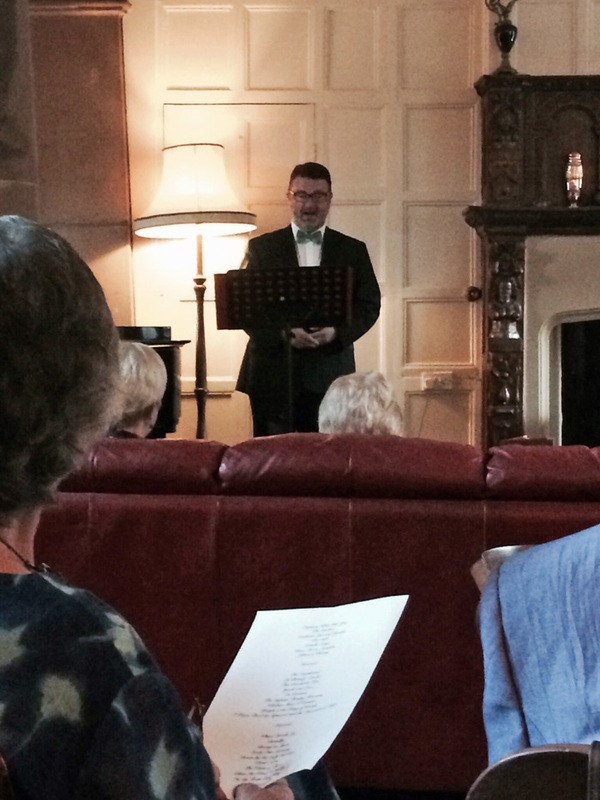 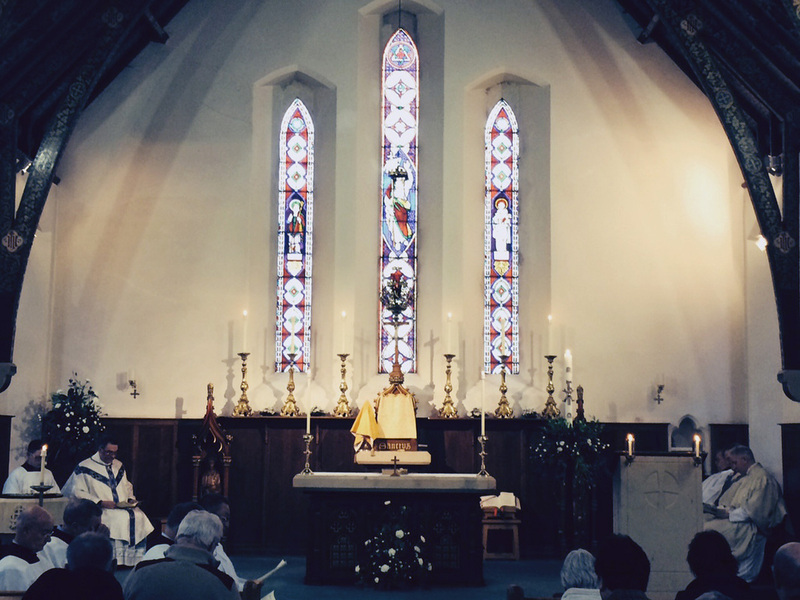 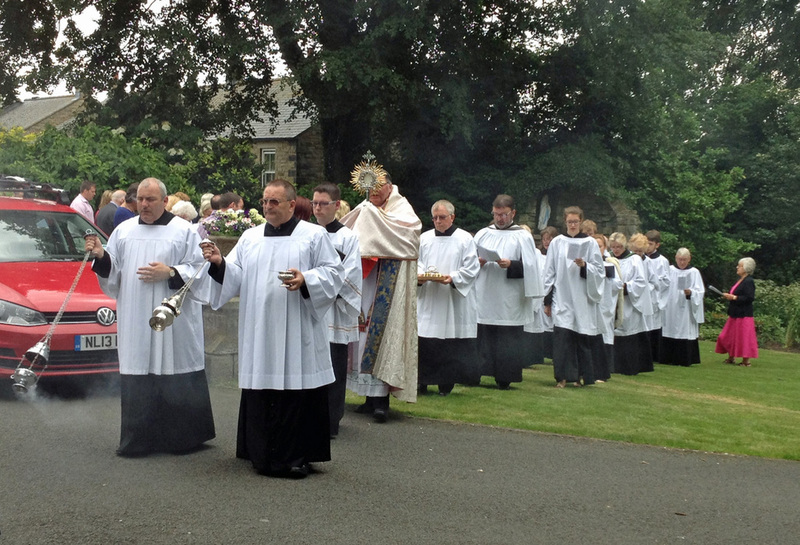 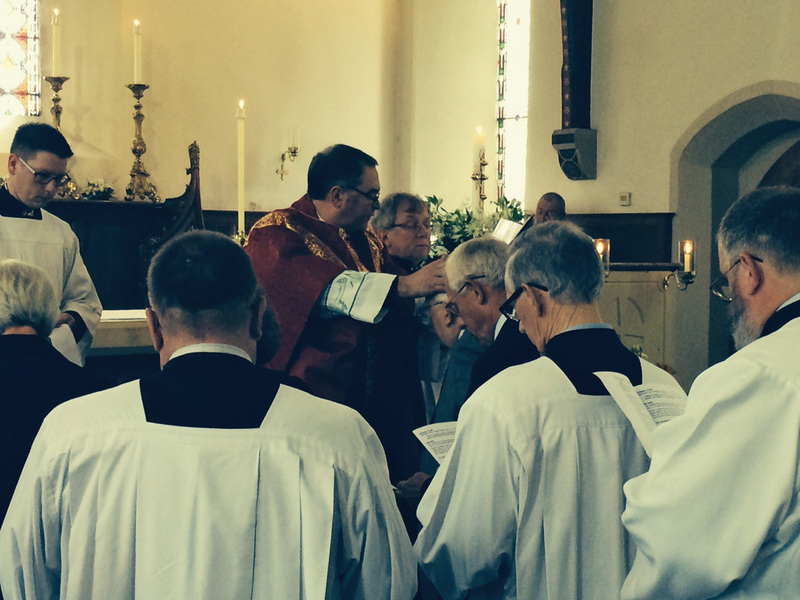 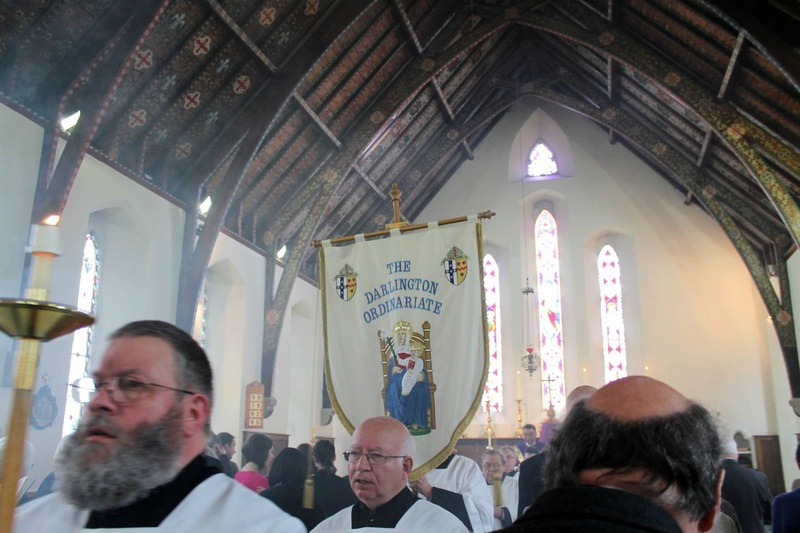 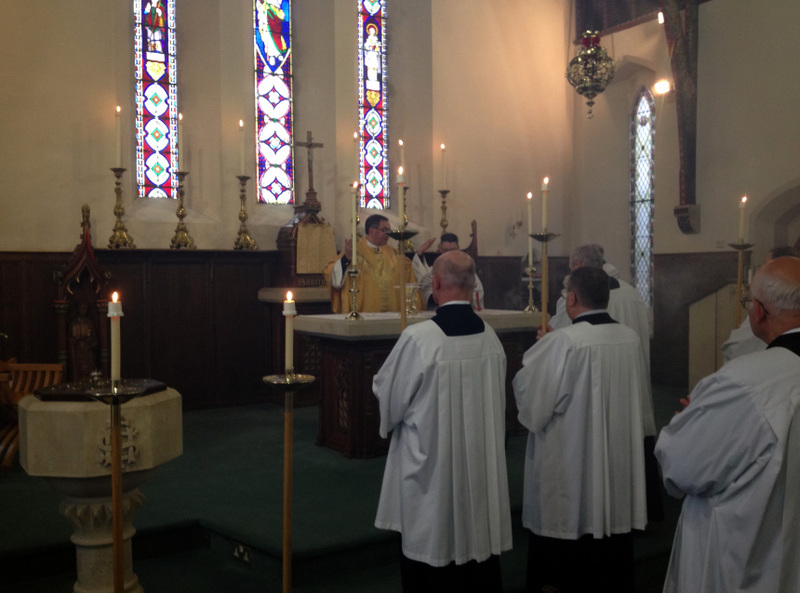 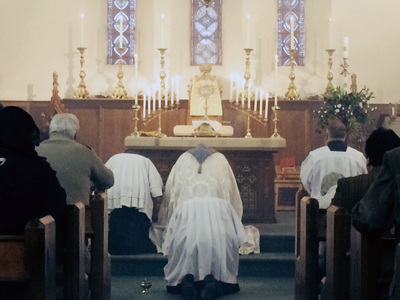 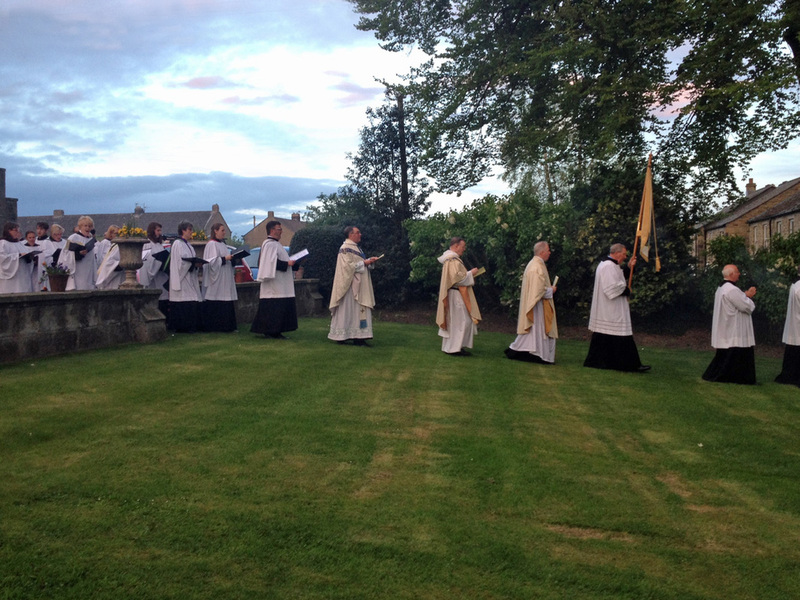 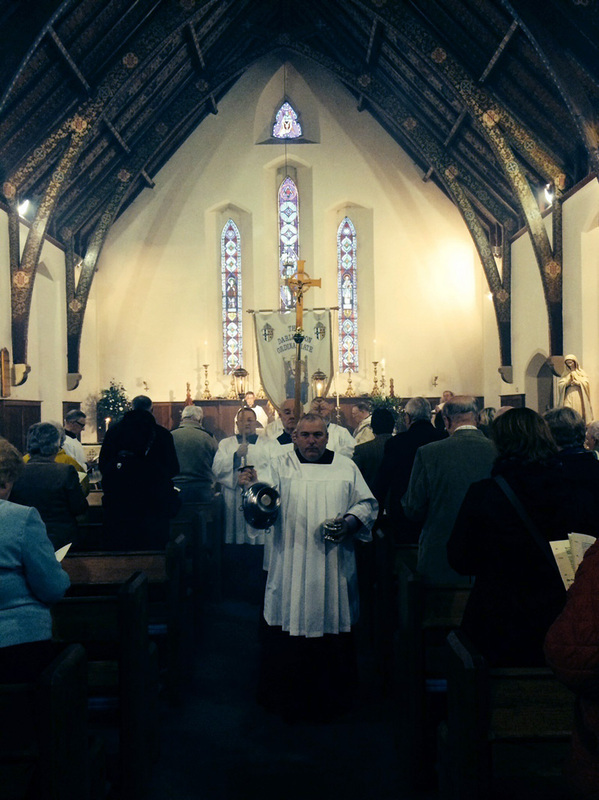 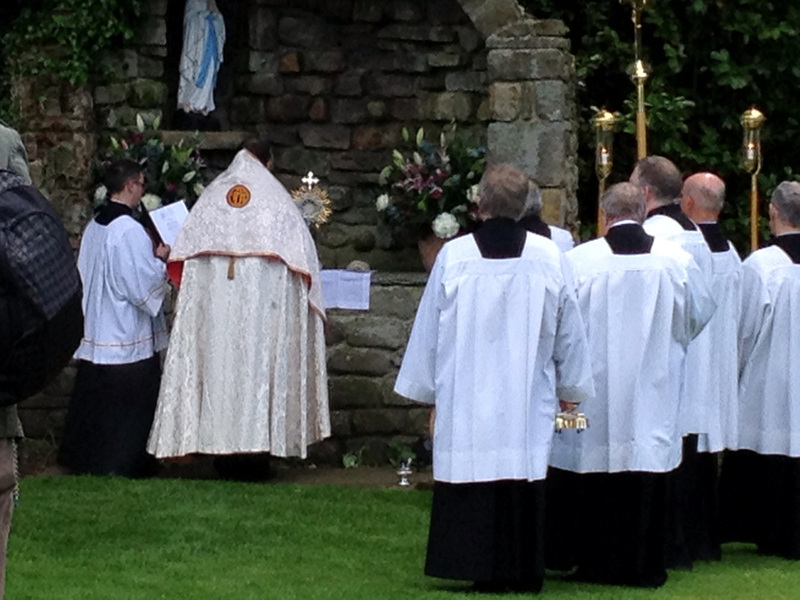 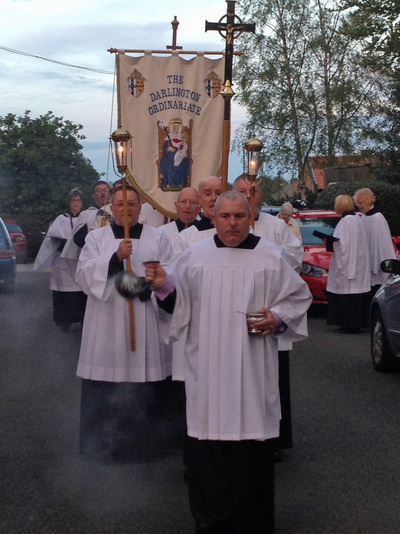 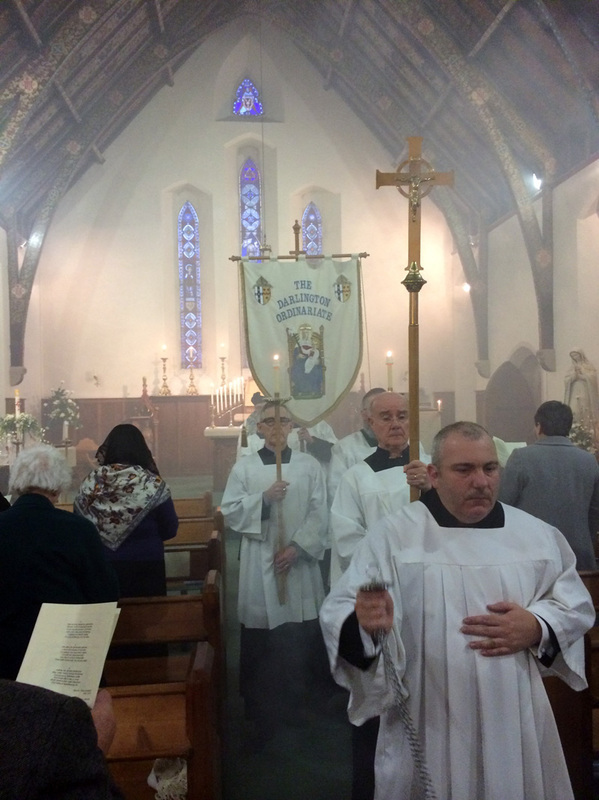 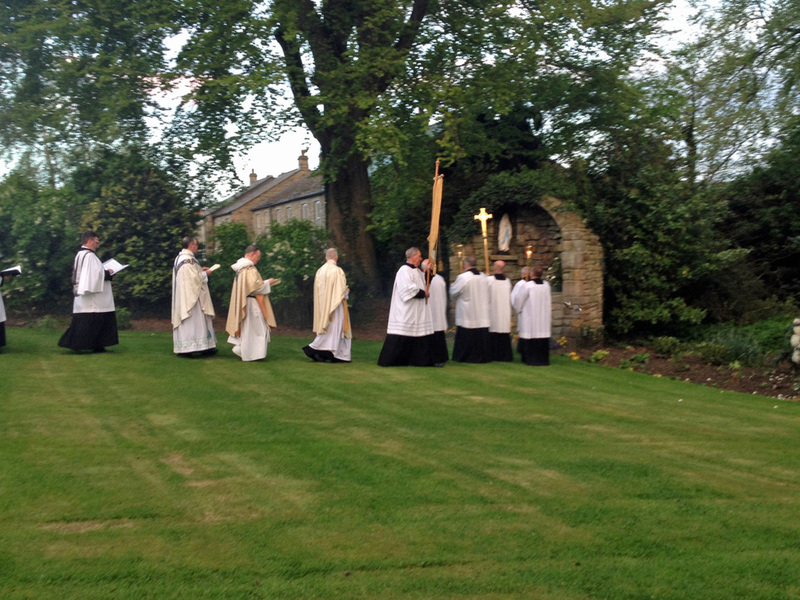 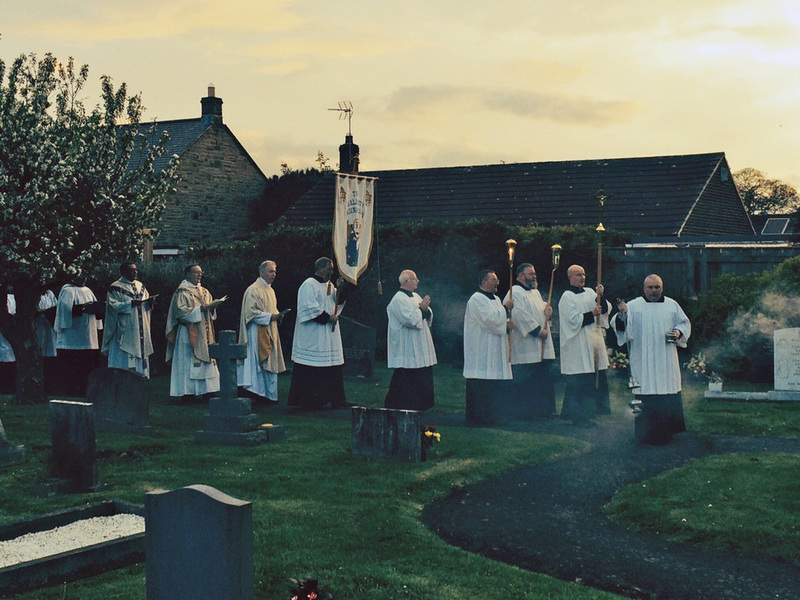 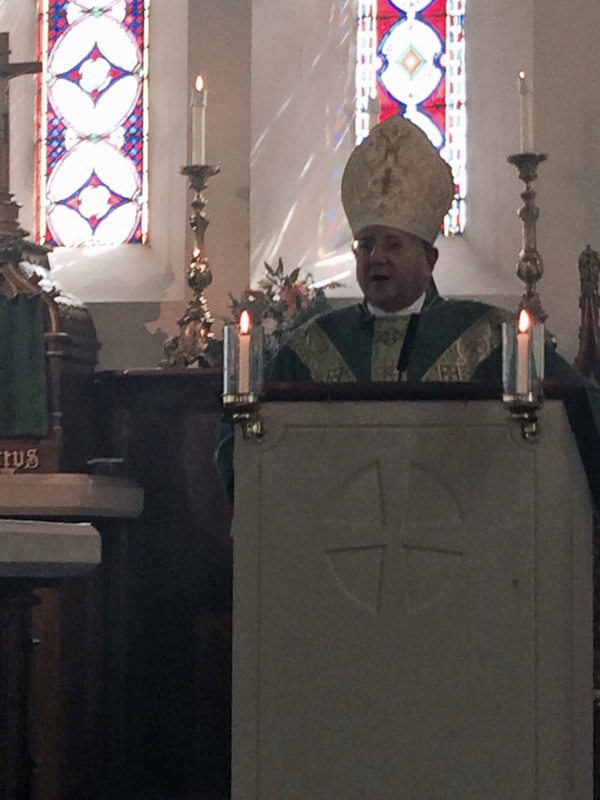 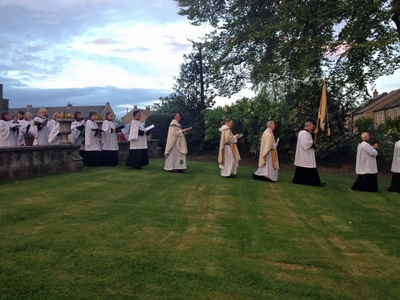 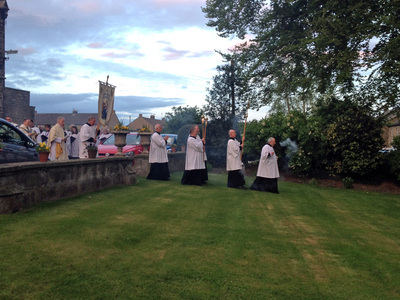 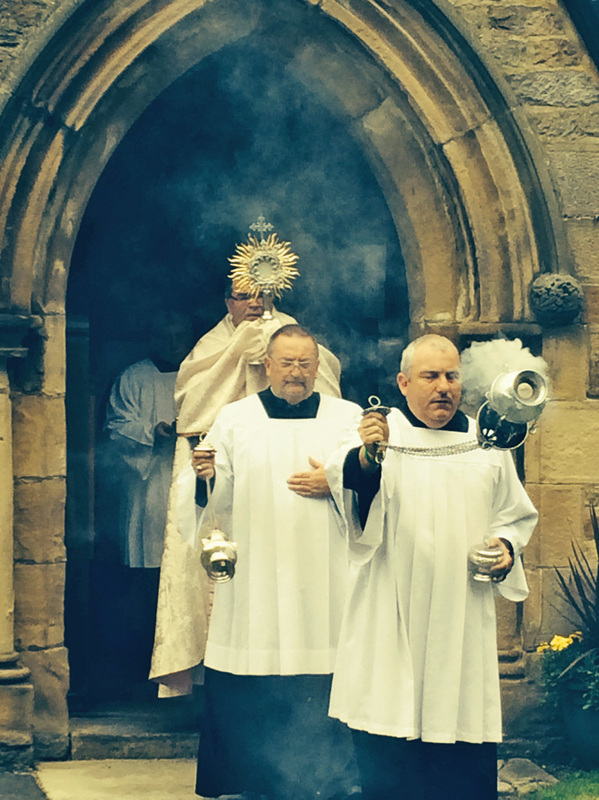 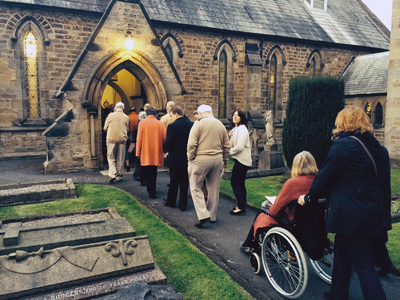 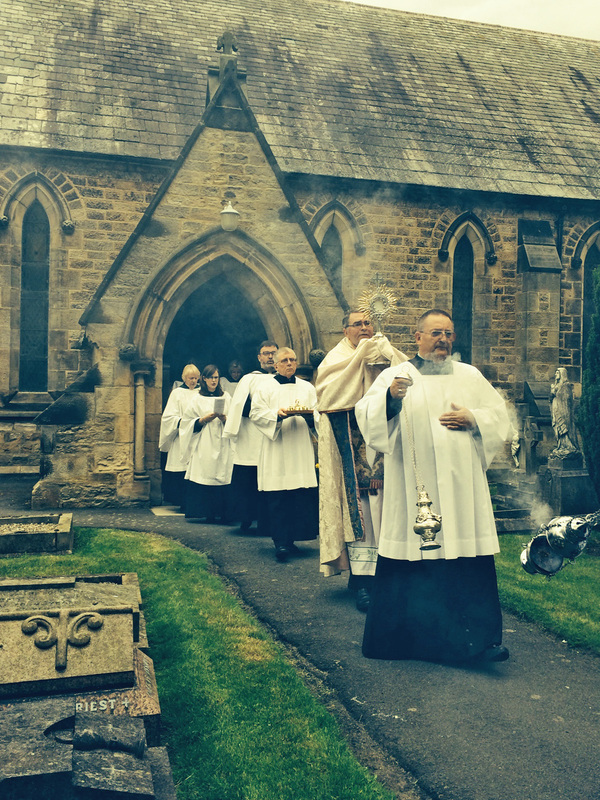 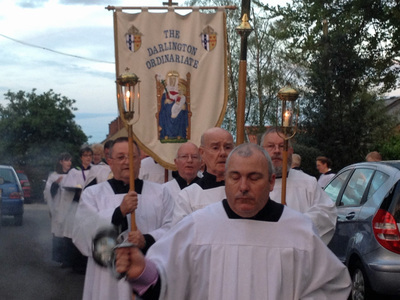 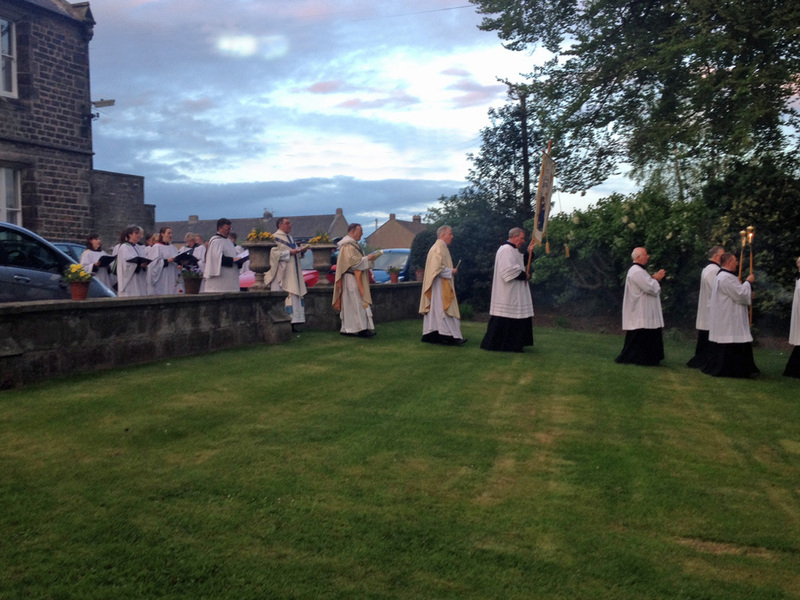 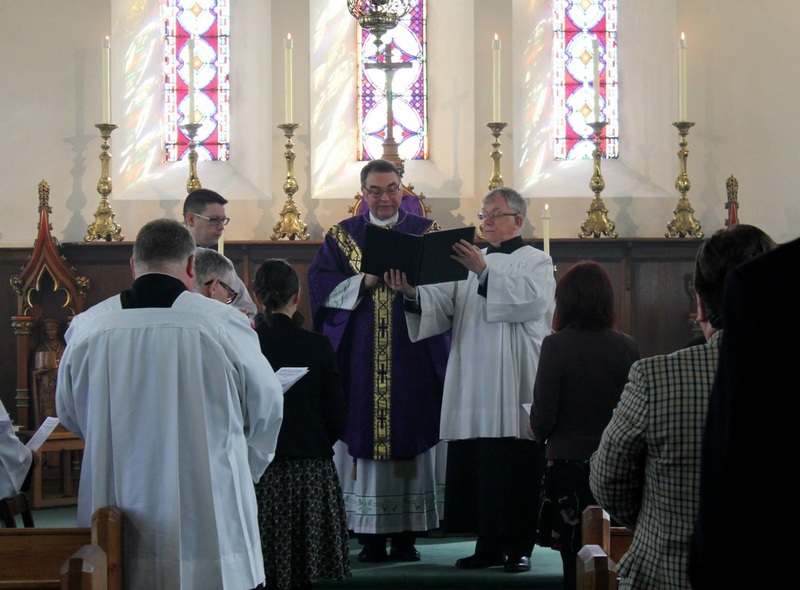 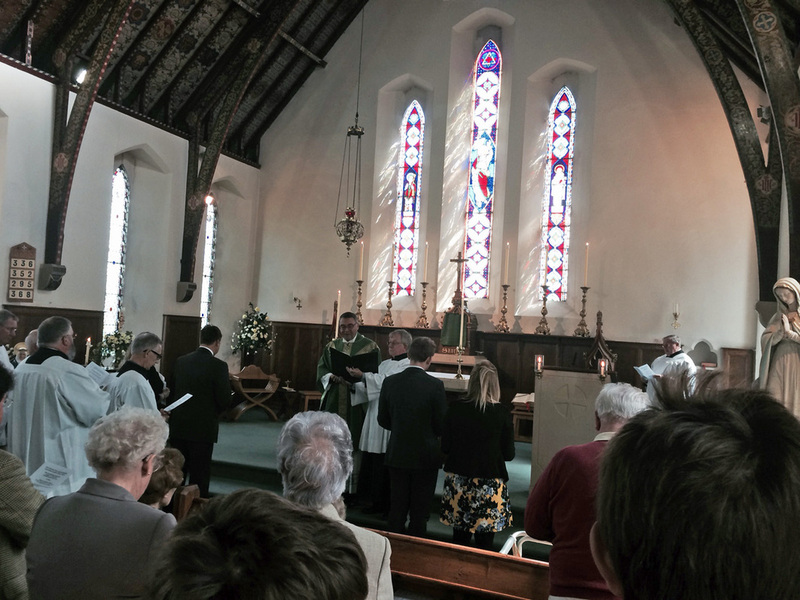 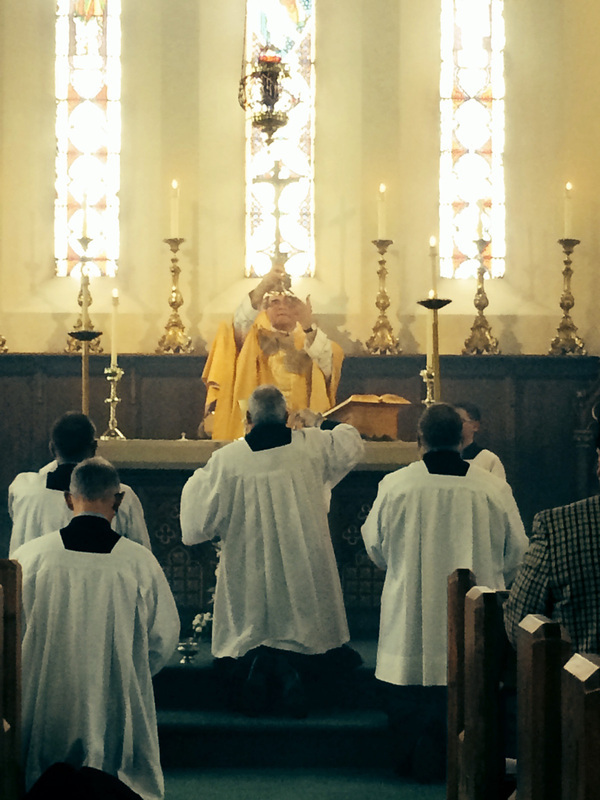 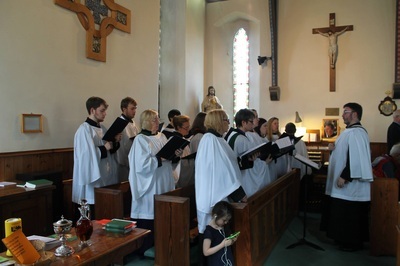 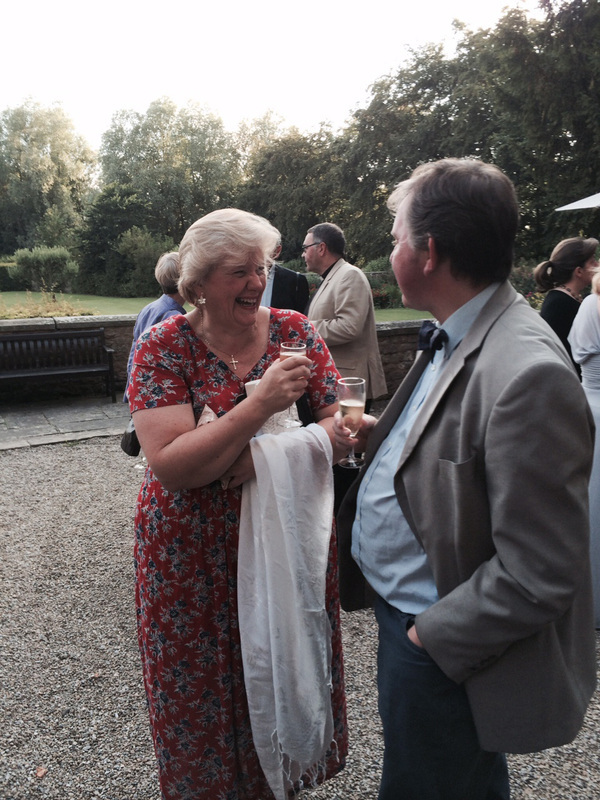 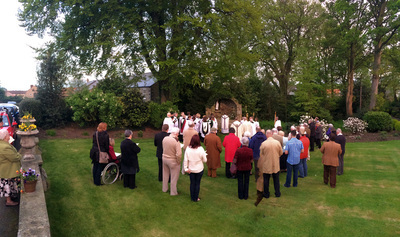 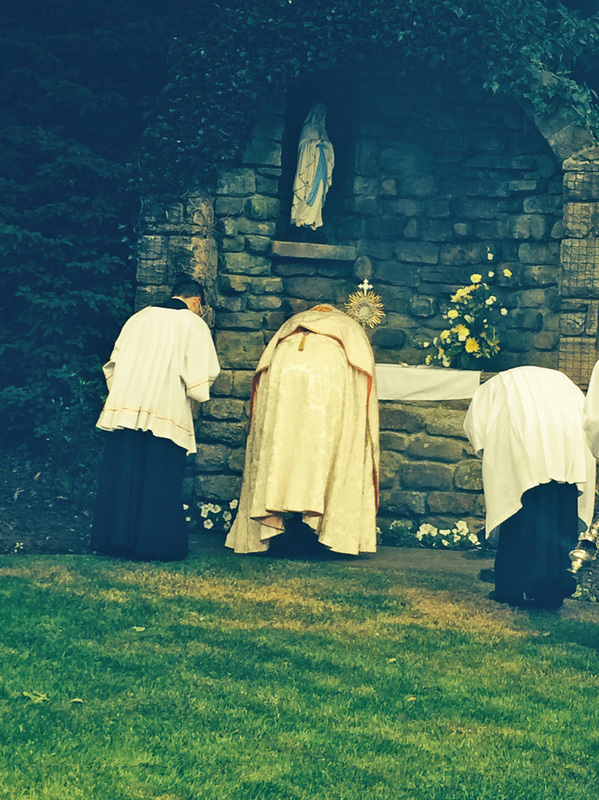 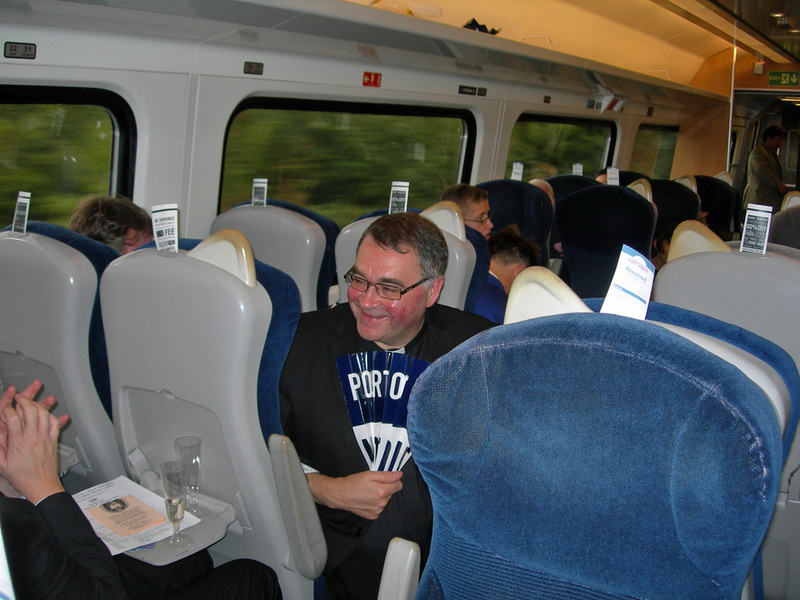 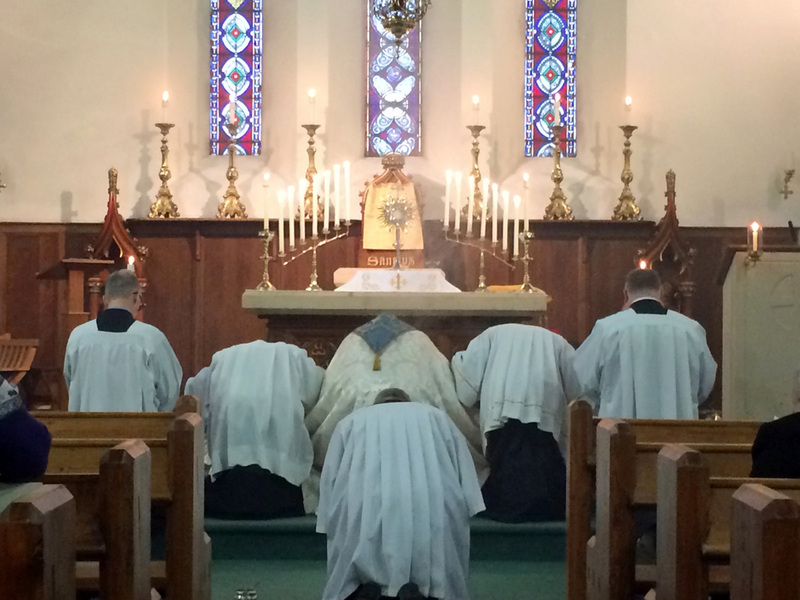 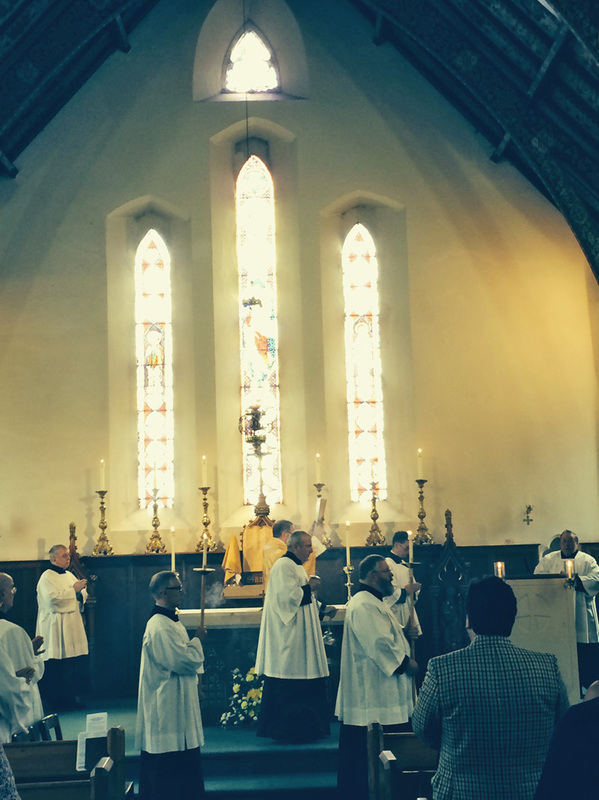 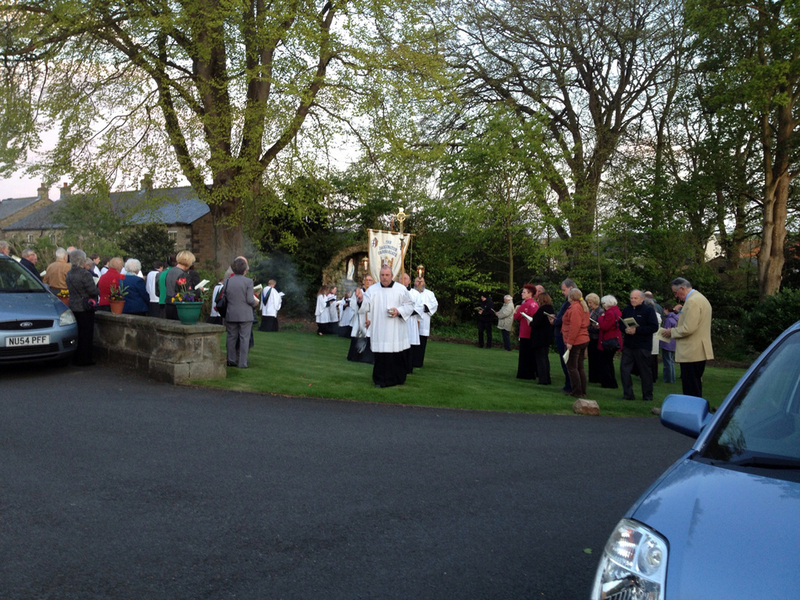 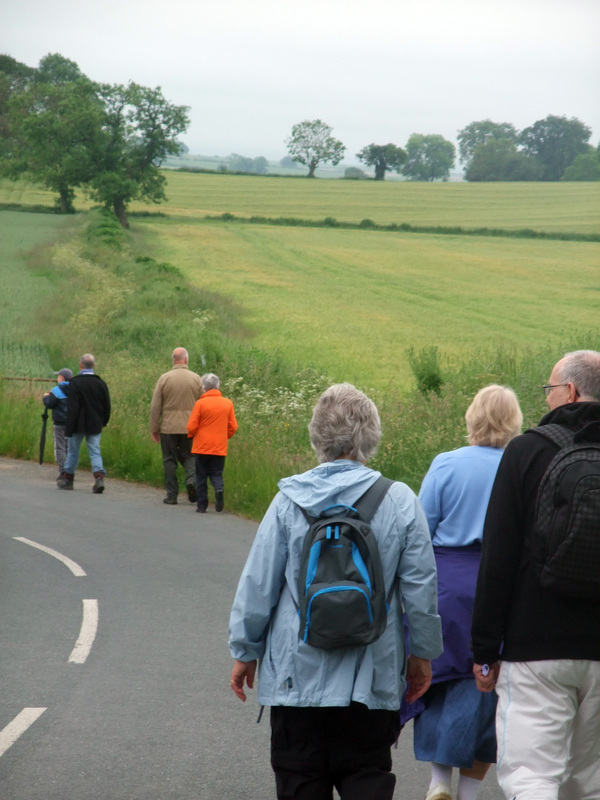 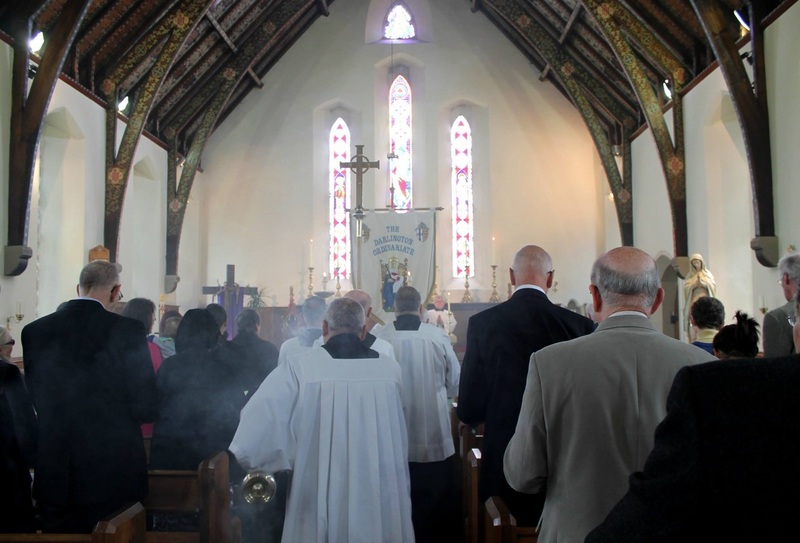 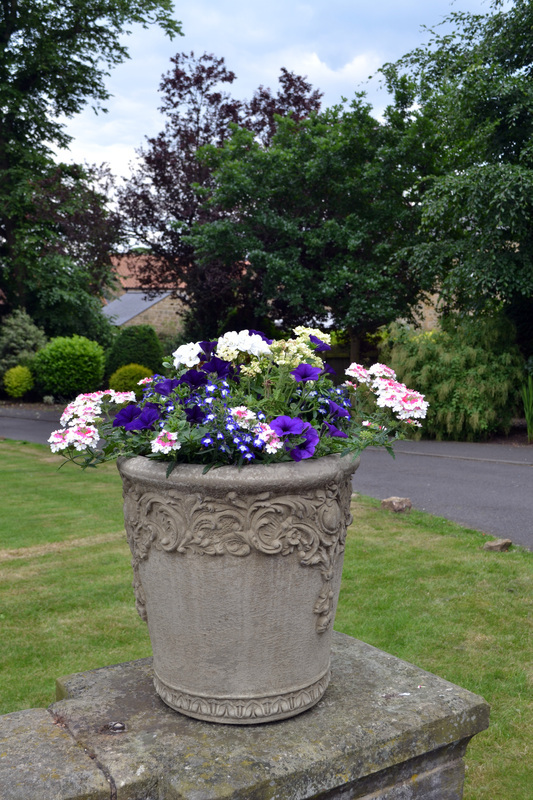 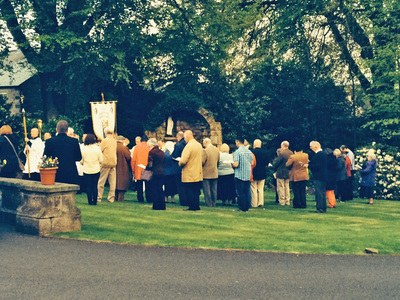 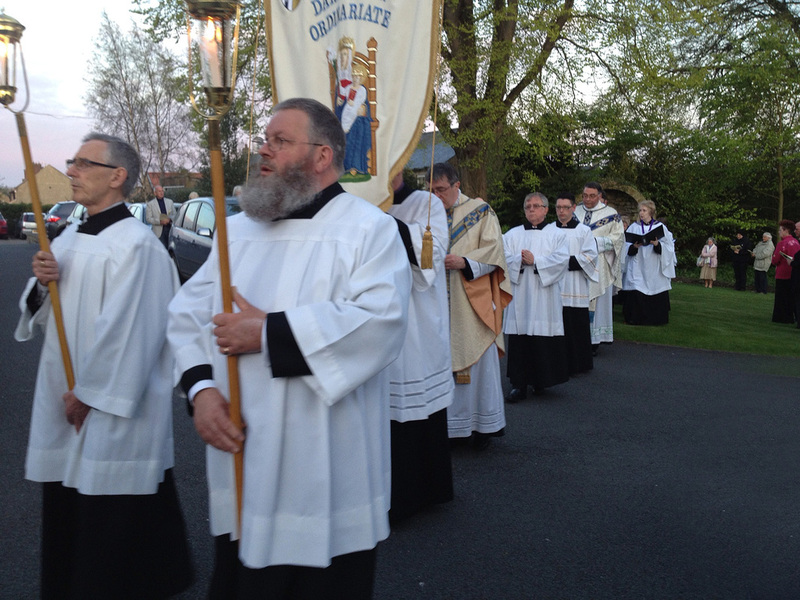 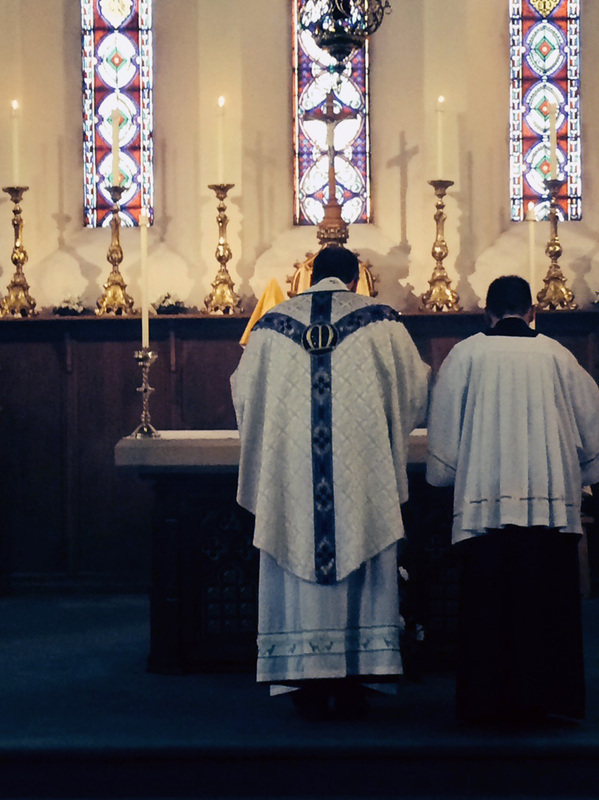 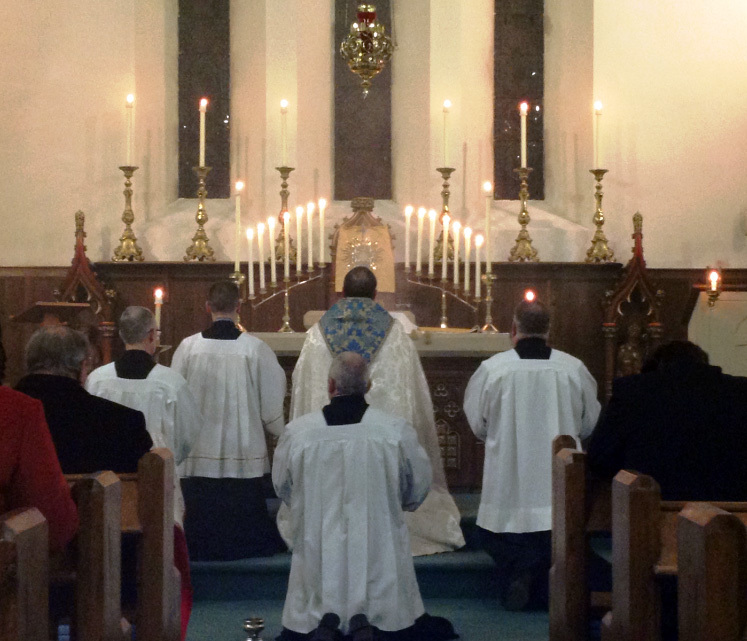 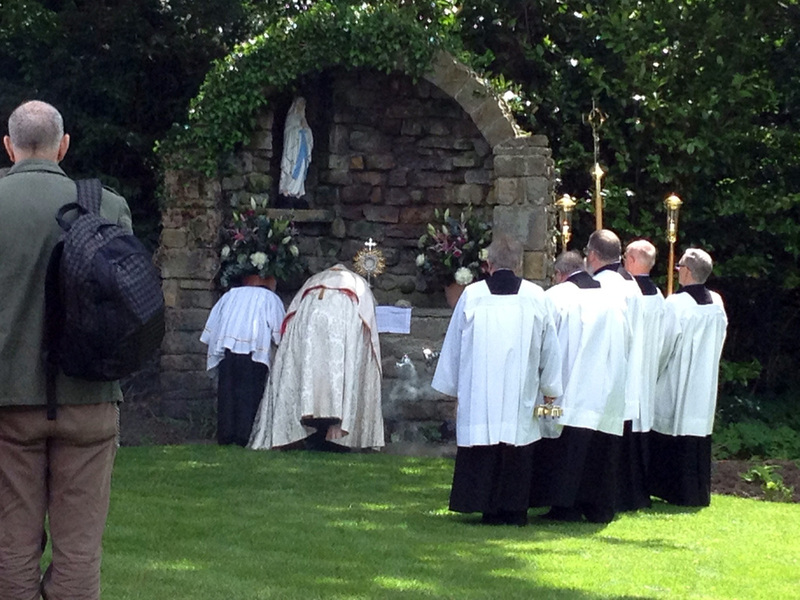 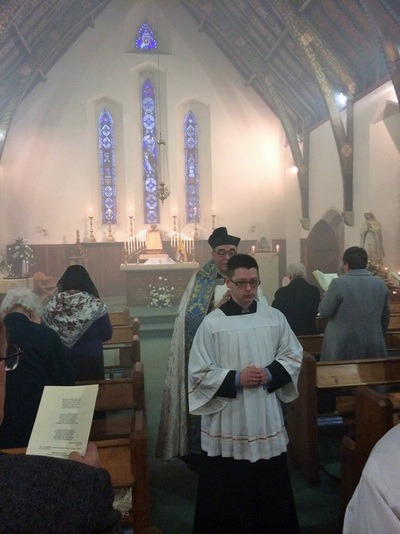 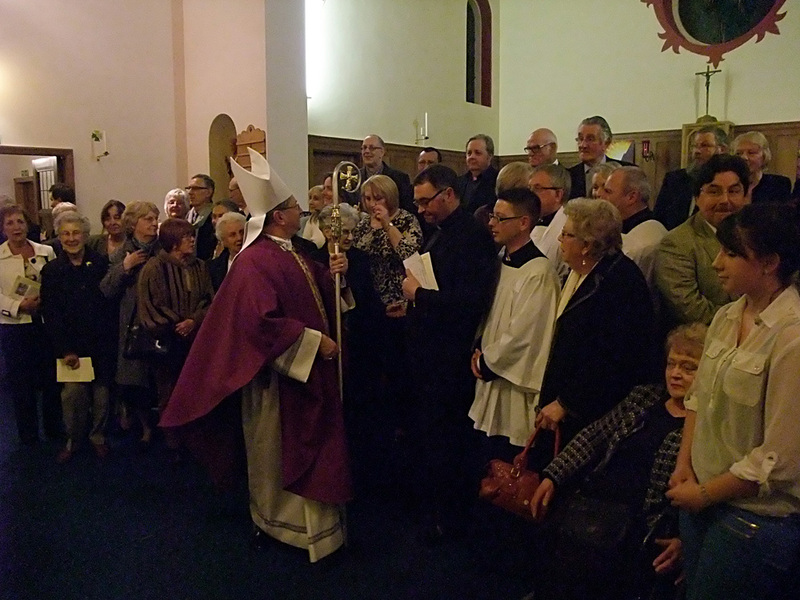 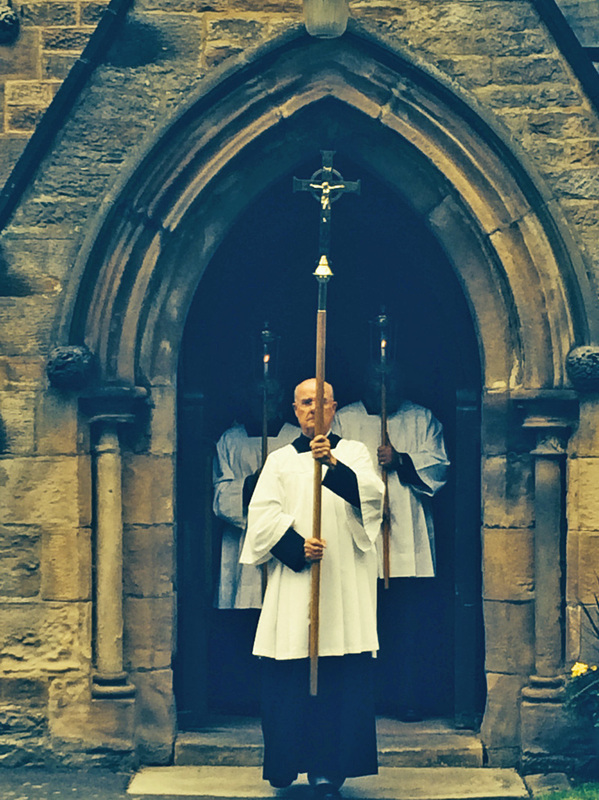 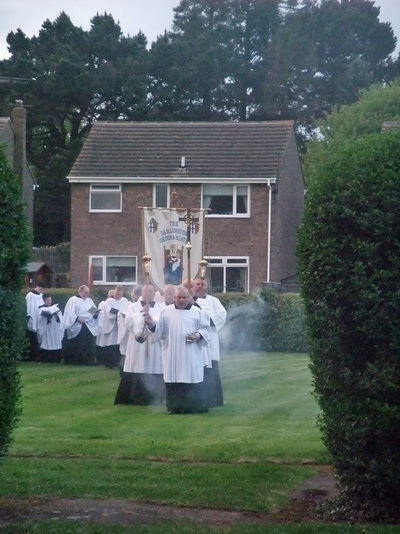 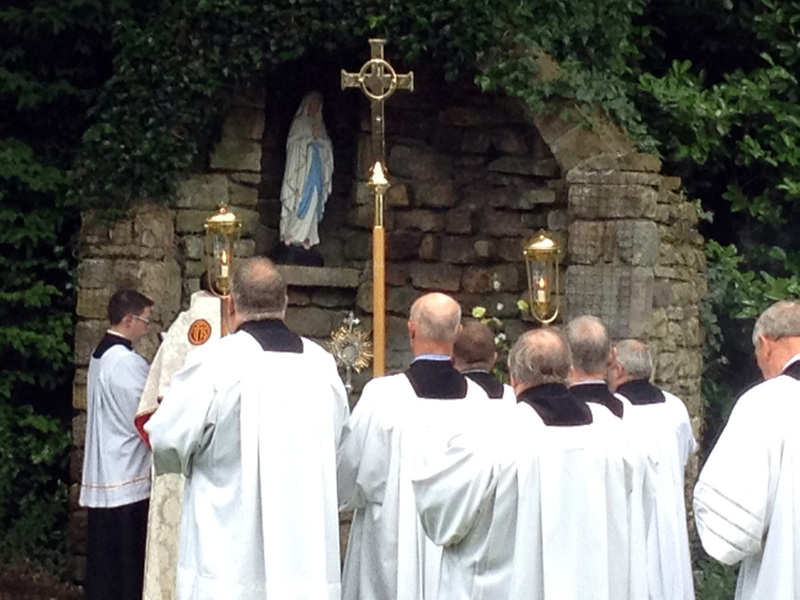 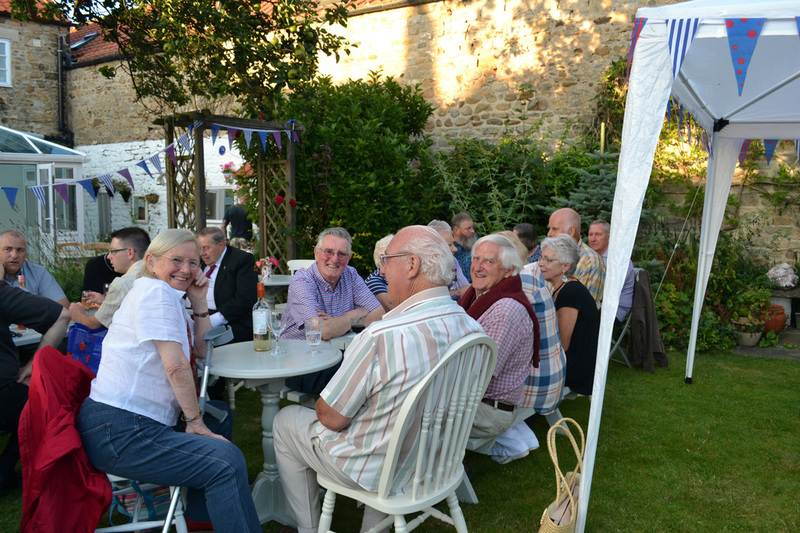 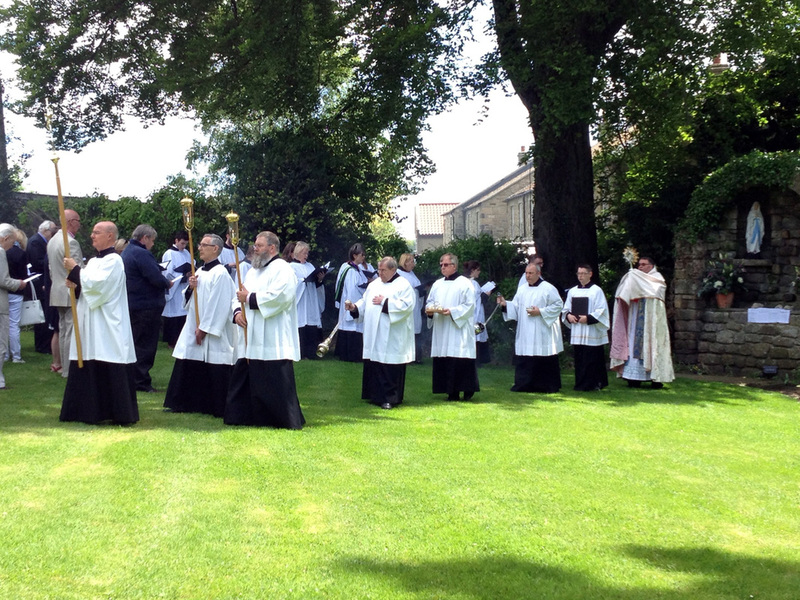 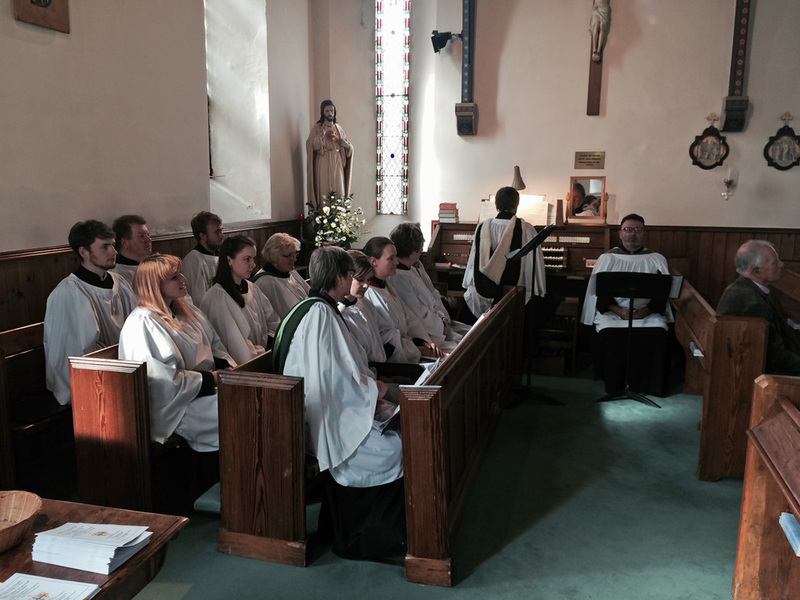 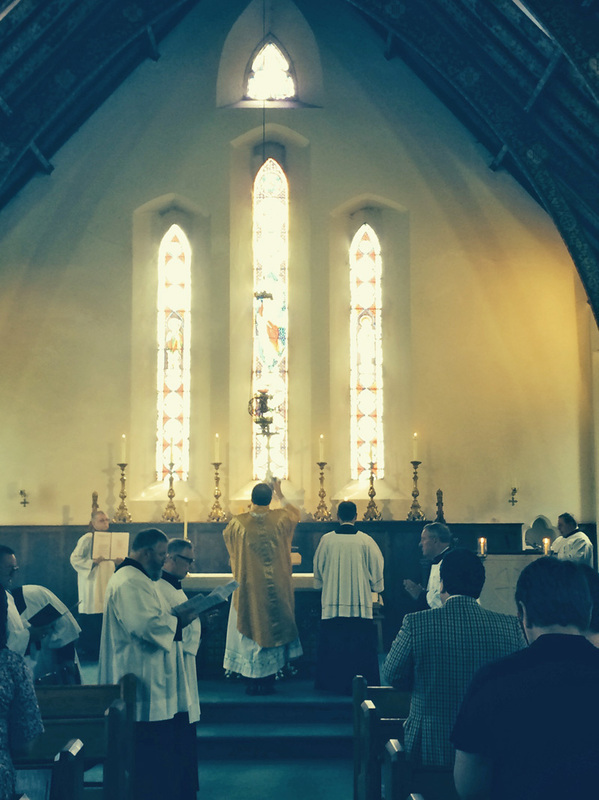 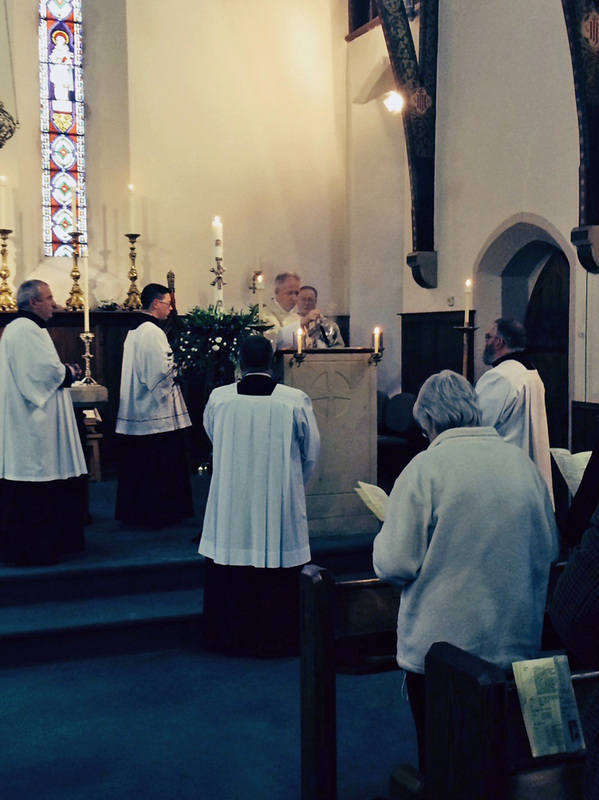 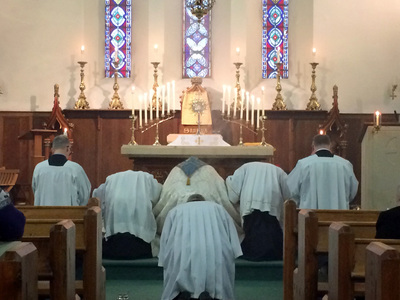 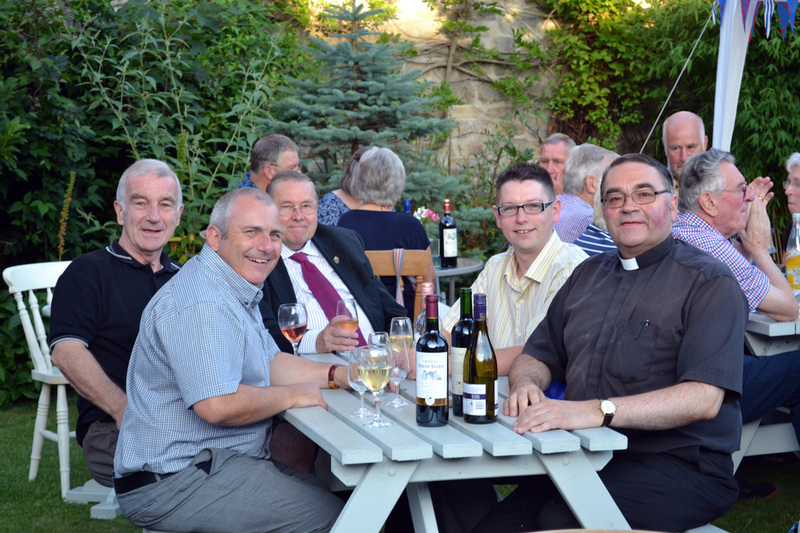 (Attended by 57 and making £457 for Ordinariate funds - many thanks to all who helped and supported this event). 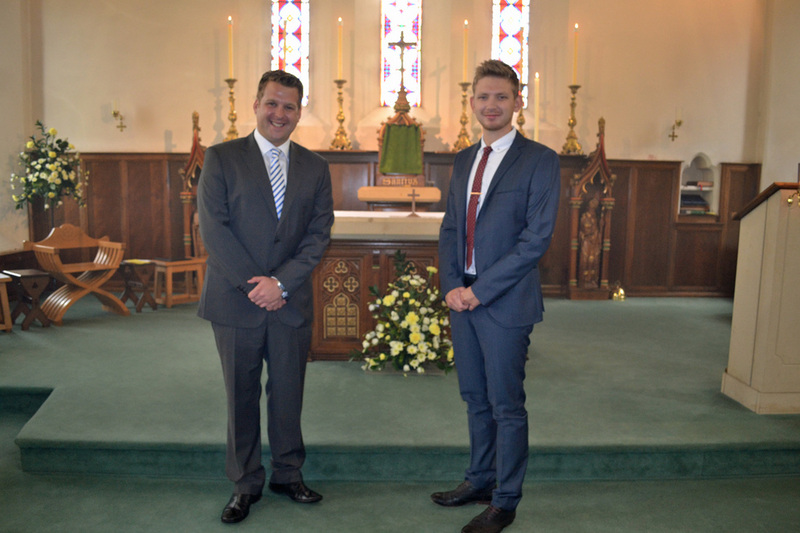 Mr Mark Roberts, received and confirmed into the Catholic Church today. 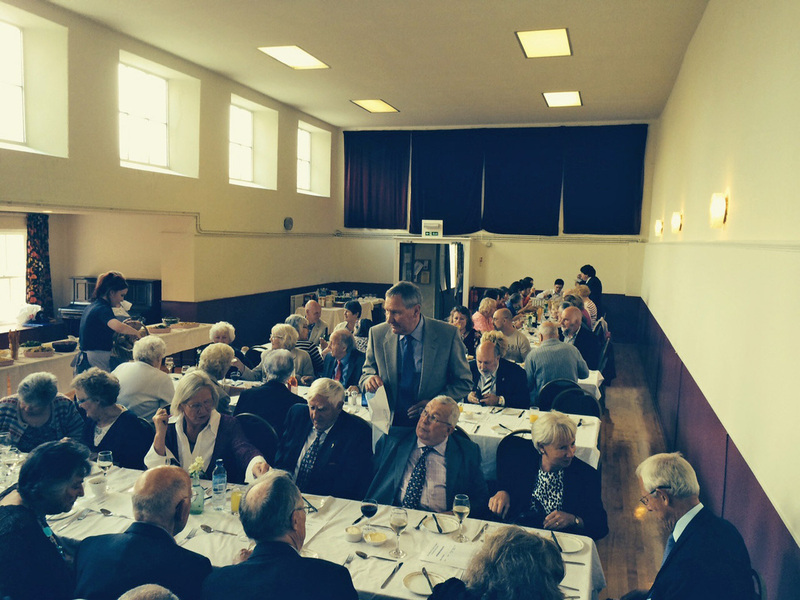 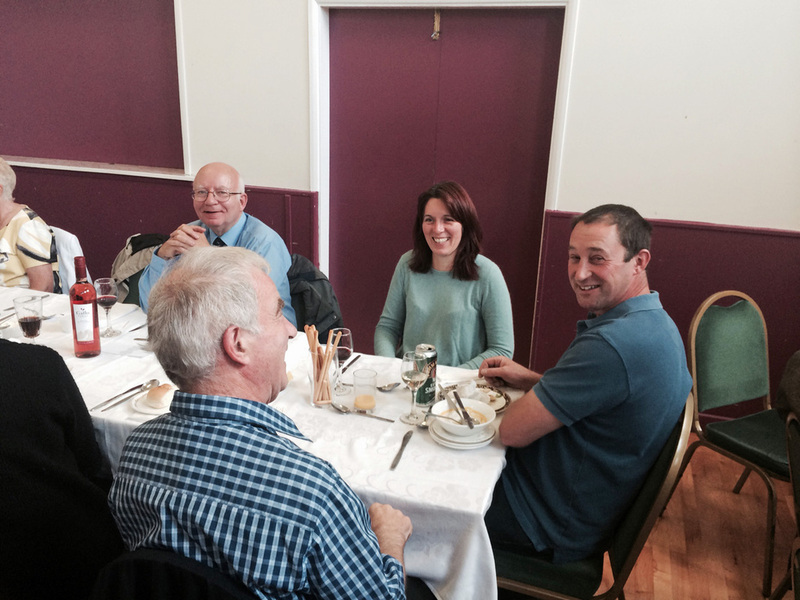 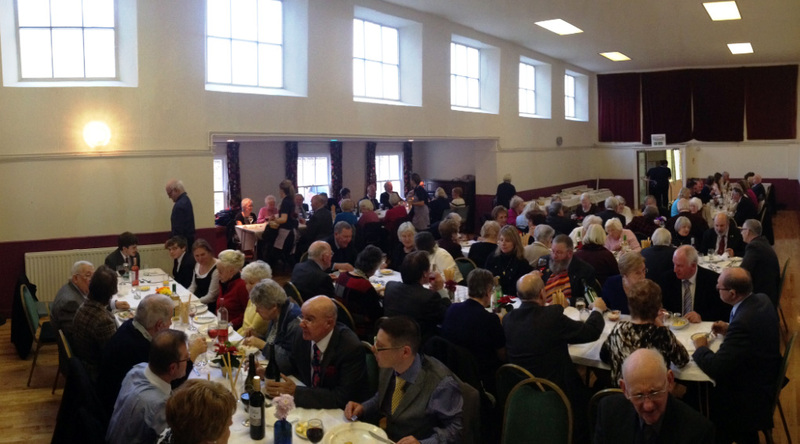 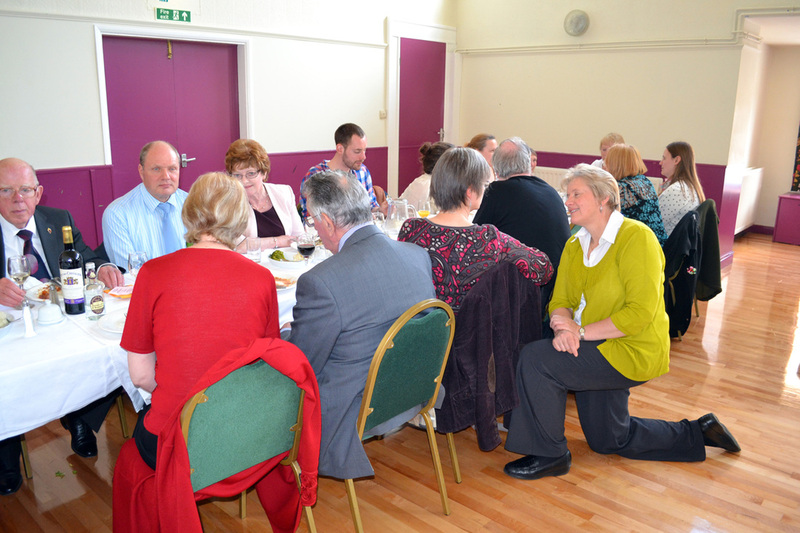 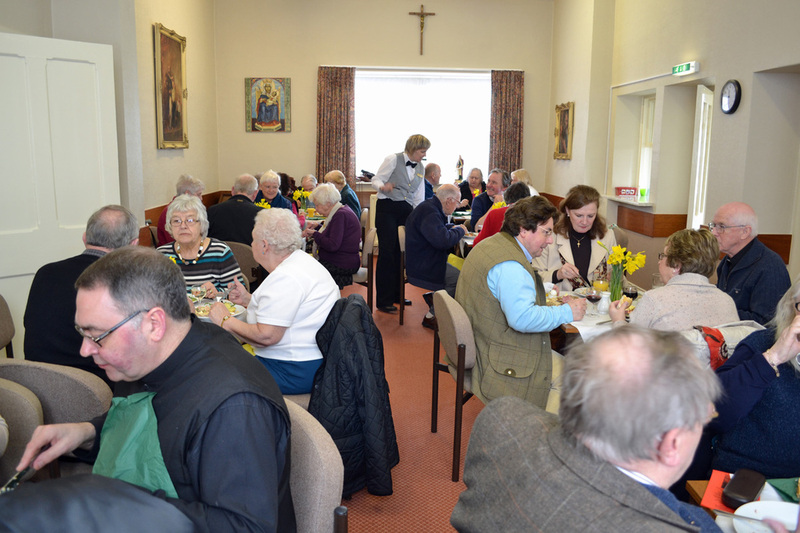 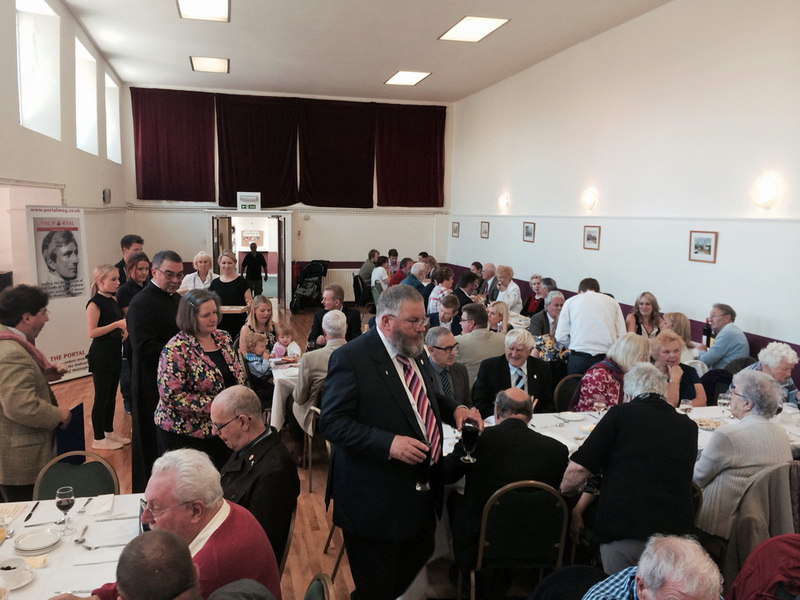 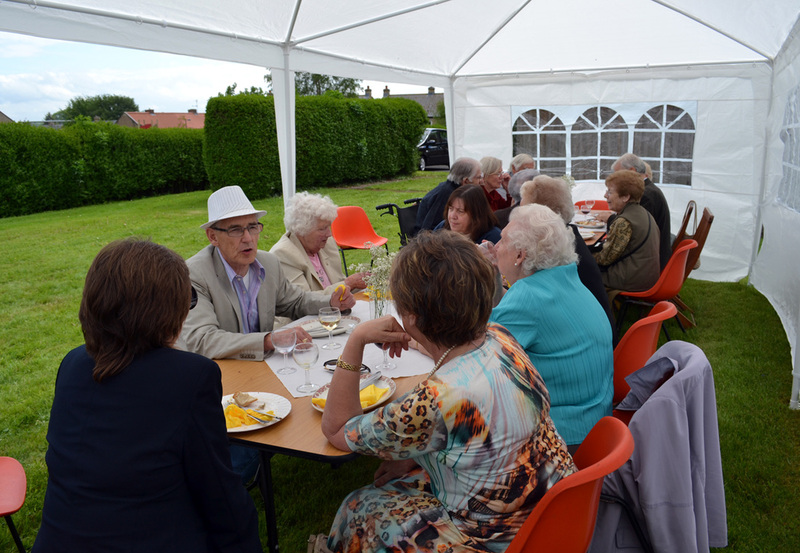 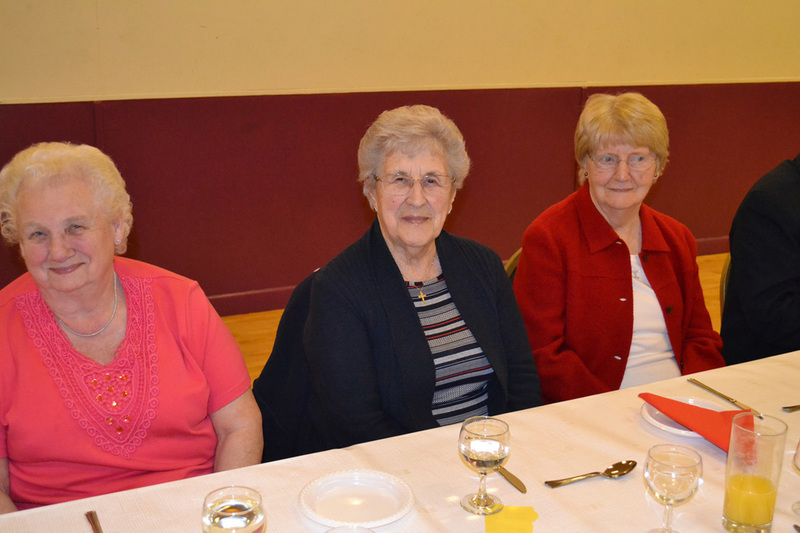 We were delighted to welcome 92 guests to our Christ The King Parish Lunch. 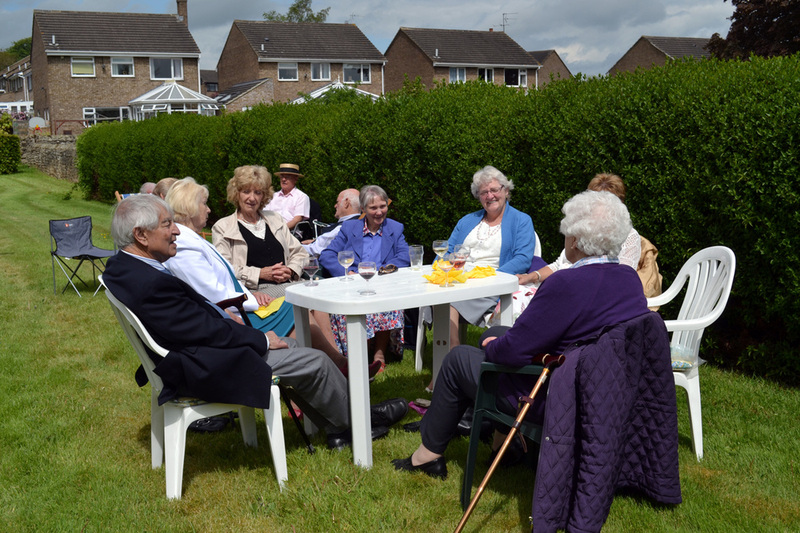 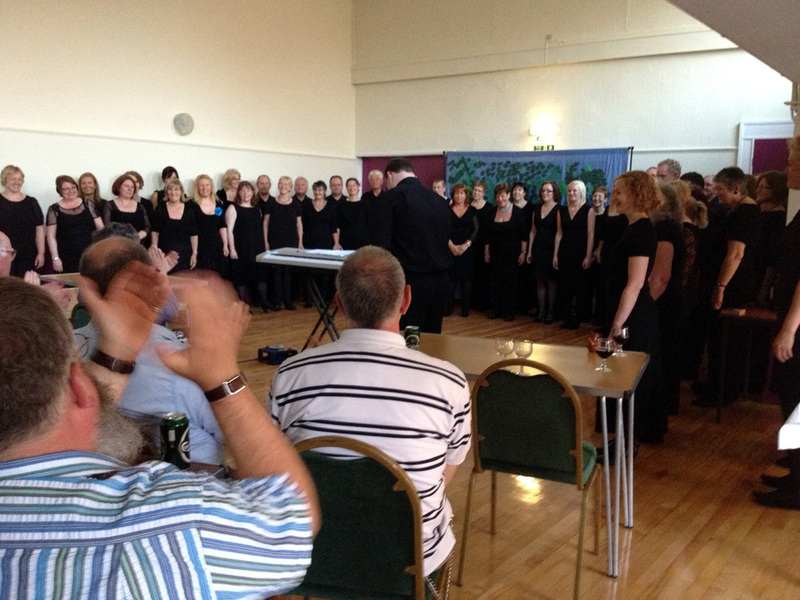 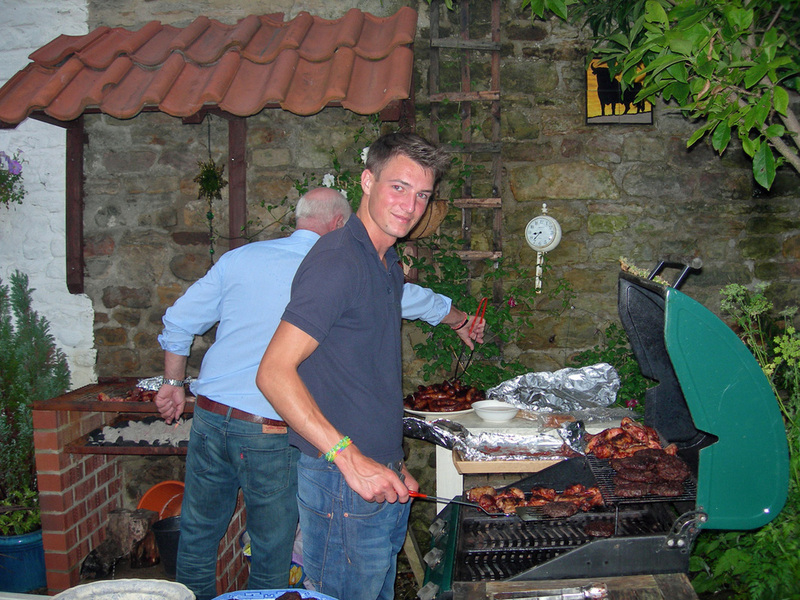 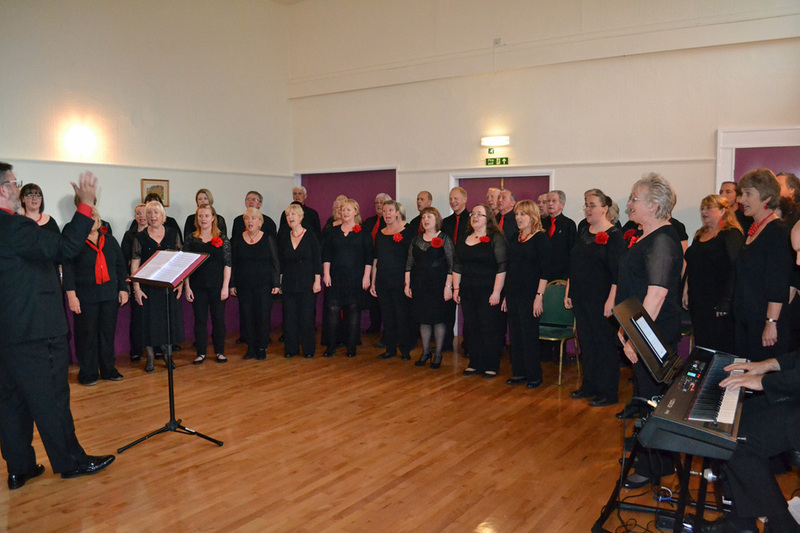 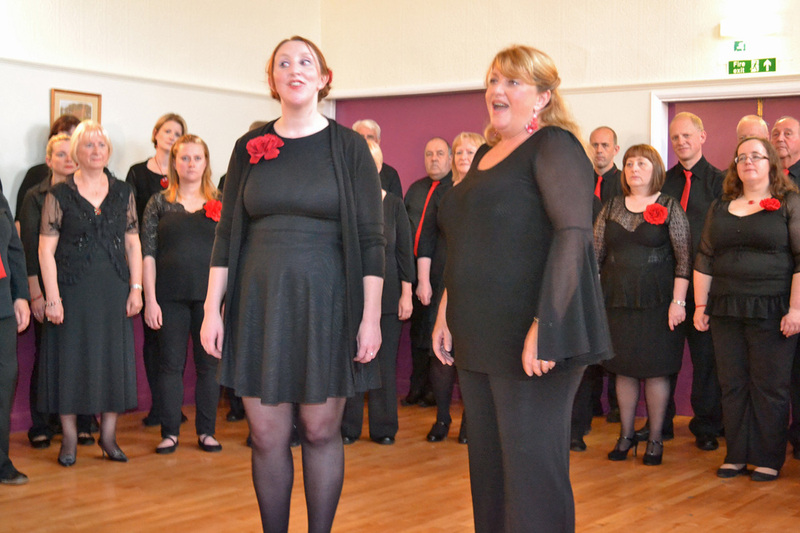 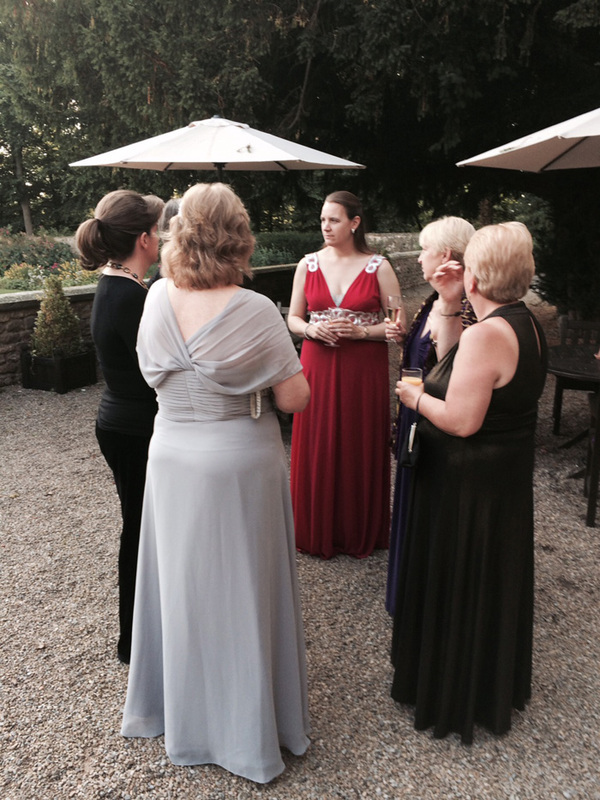 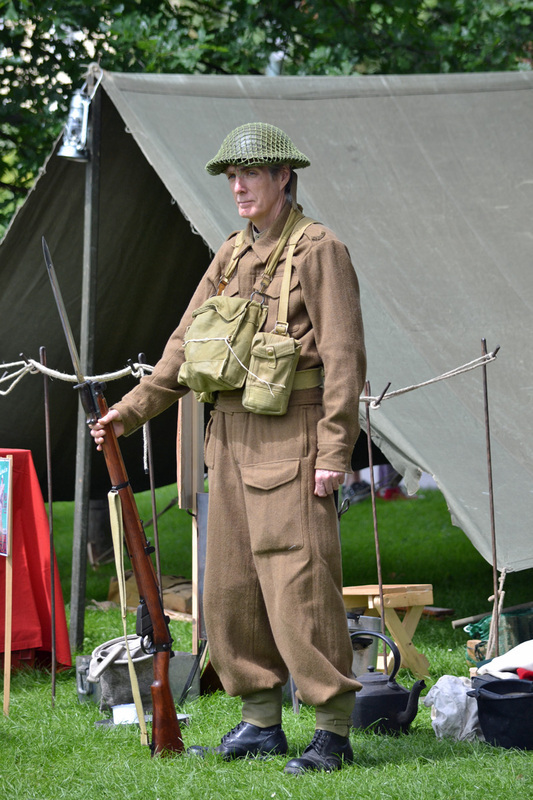 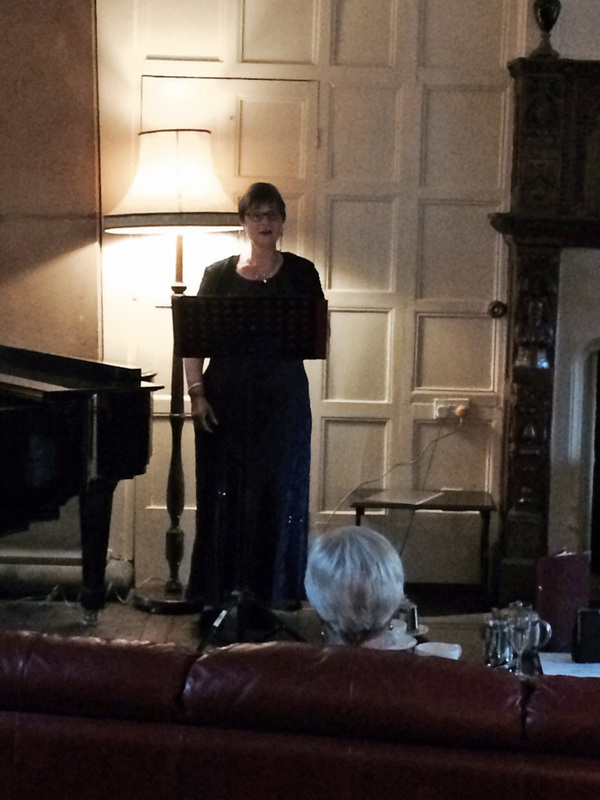 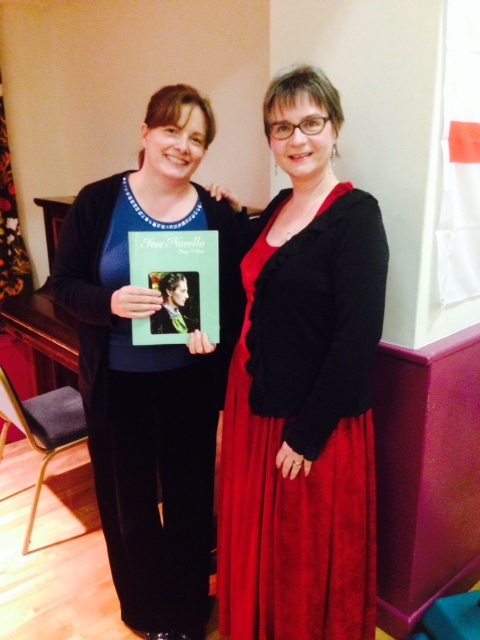 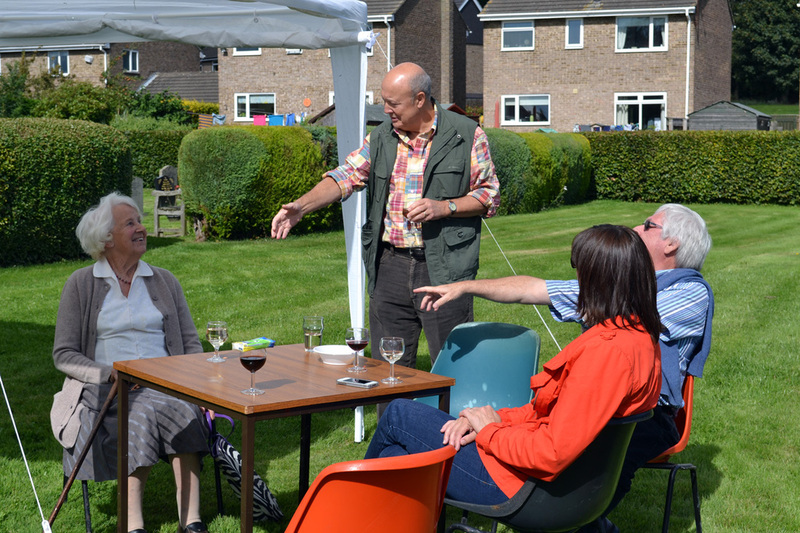 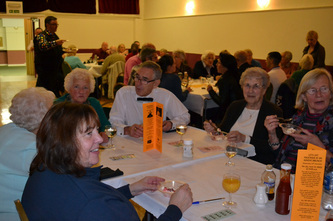 This event raised £1,300 + Gift Aid. 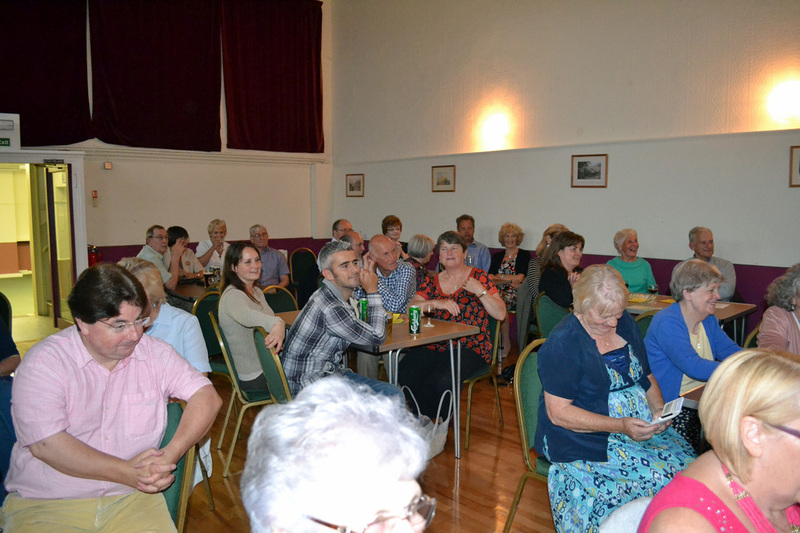 Many thanks to all who made it possible and the 80 people who attended and supported us. 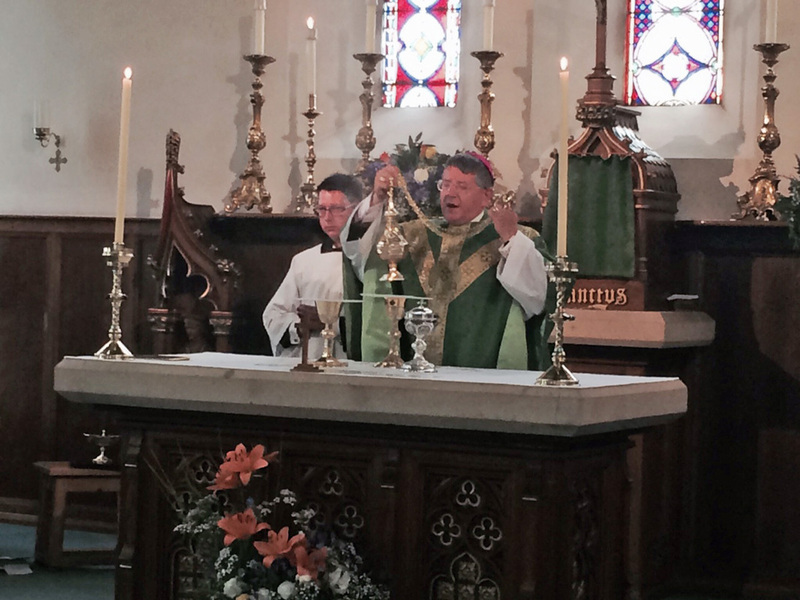 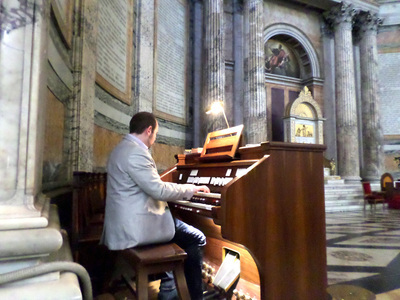 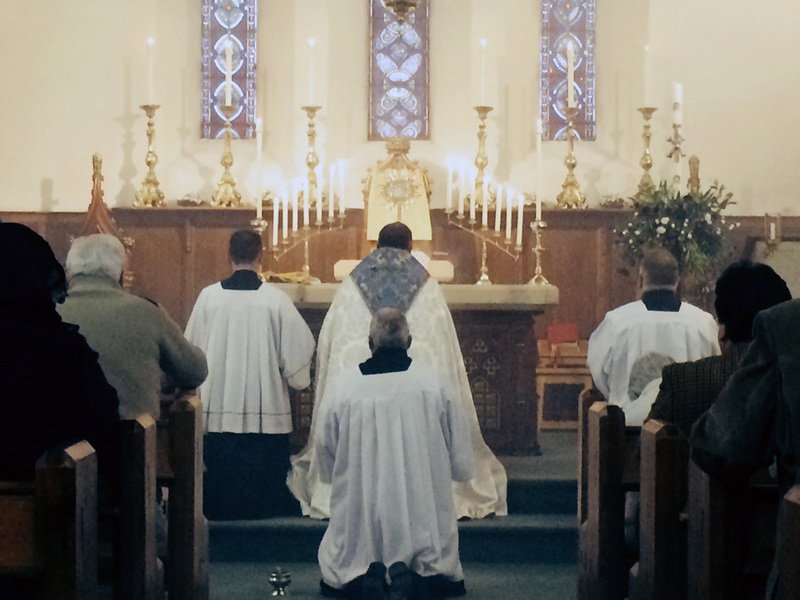 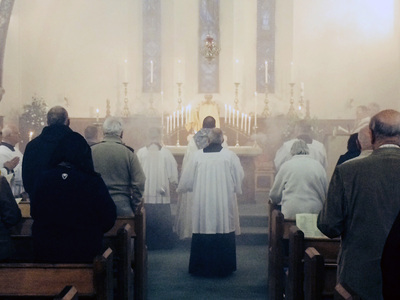 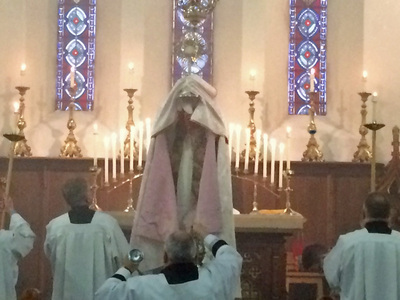 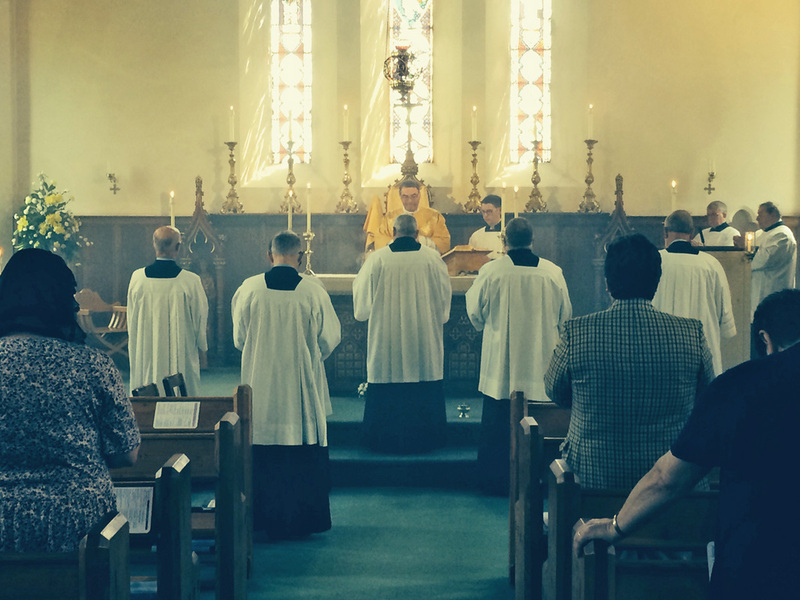 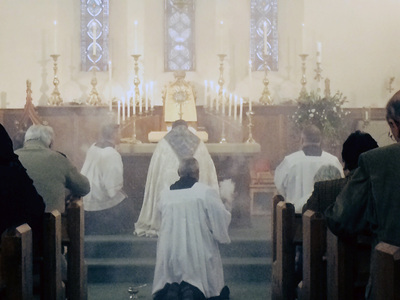 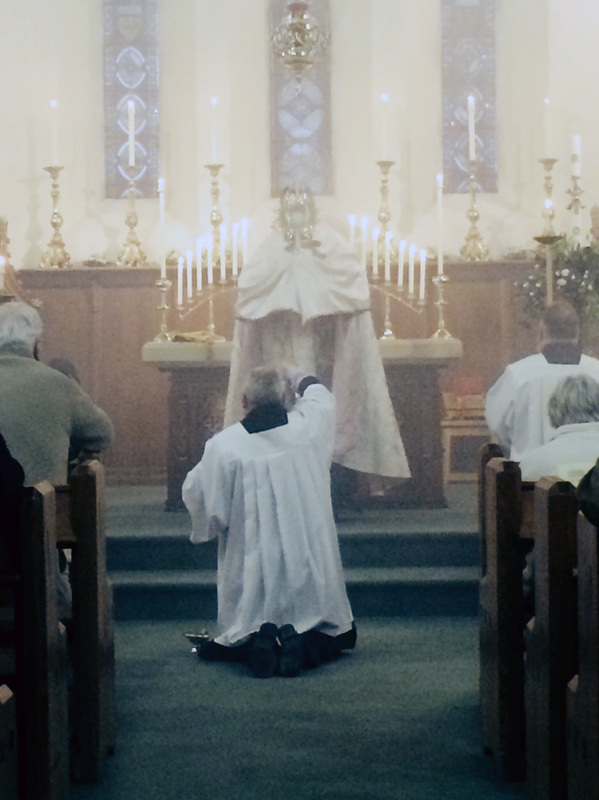 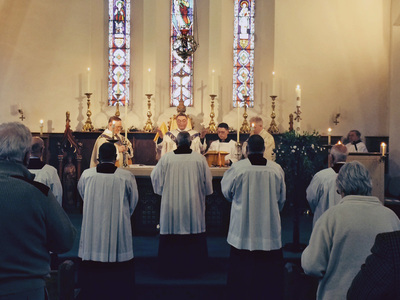 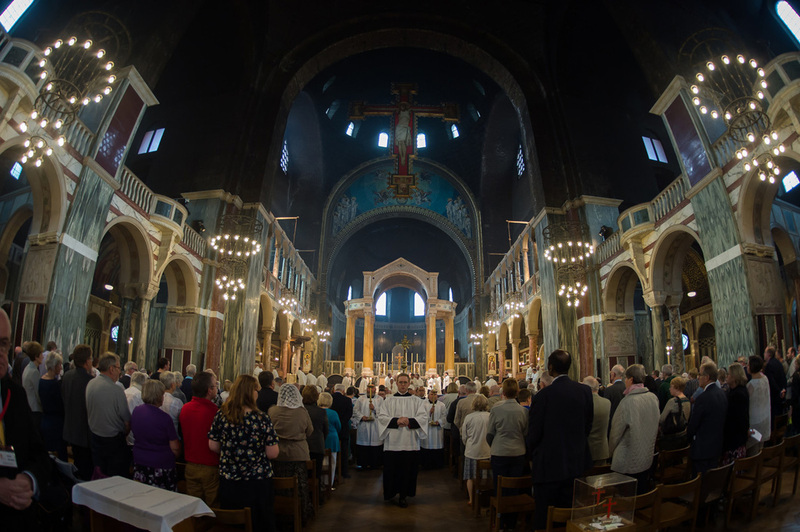 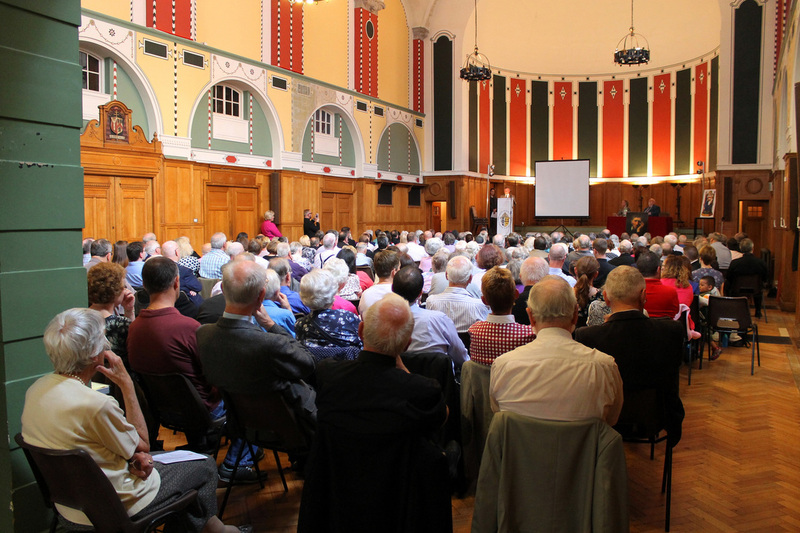 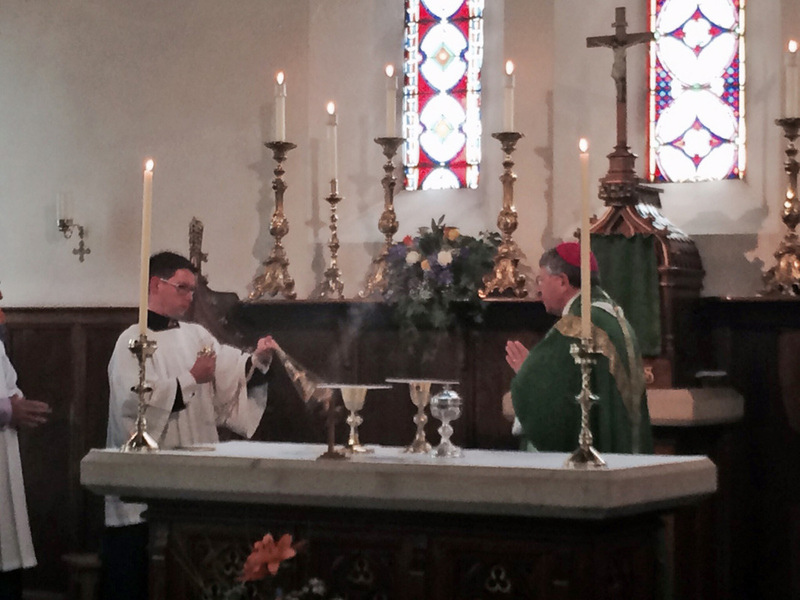 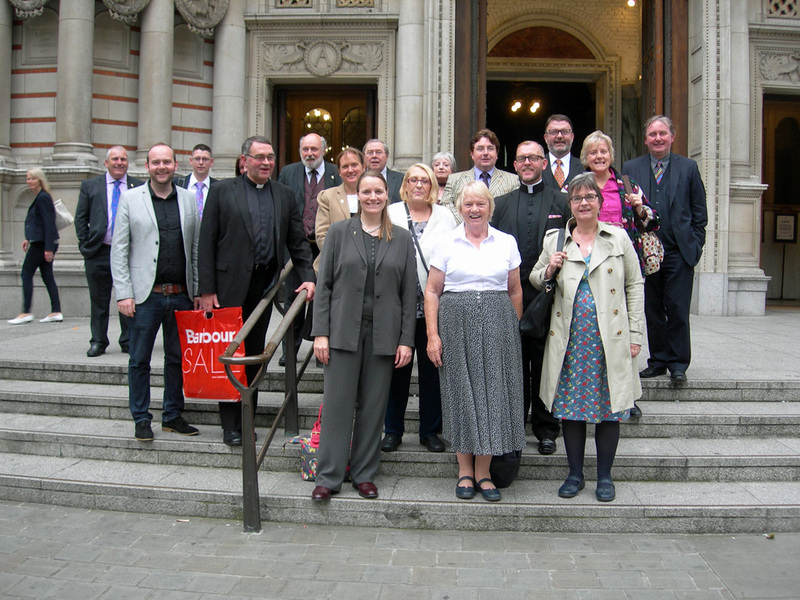 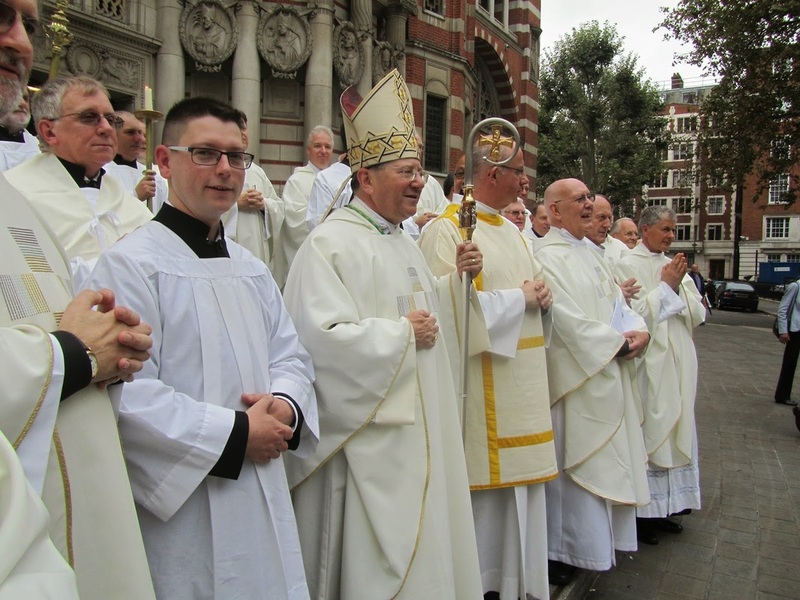 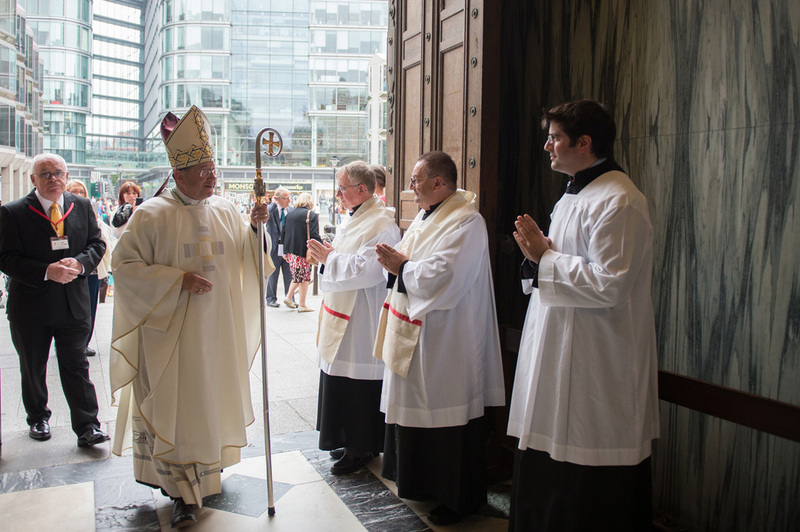 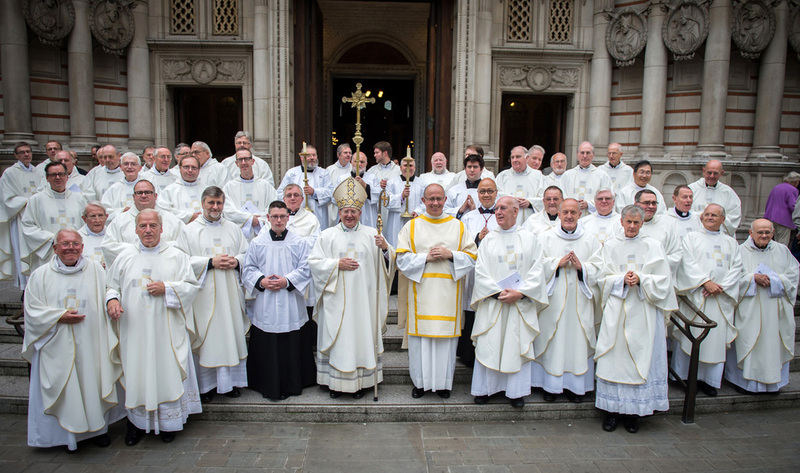 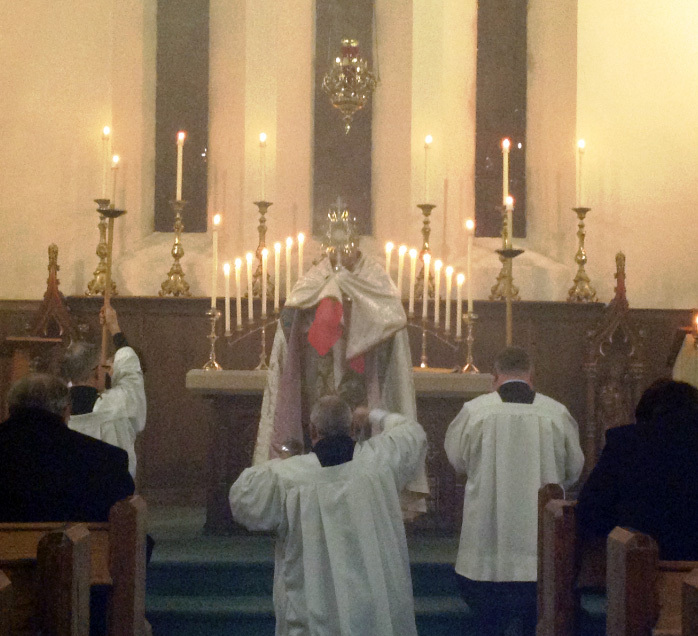 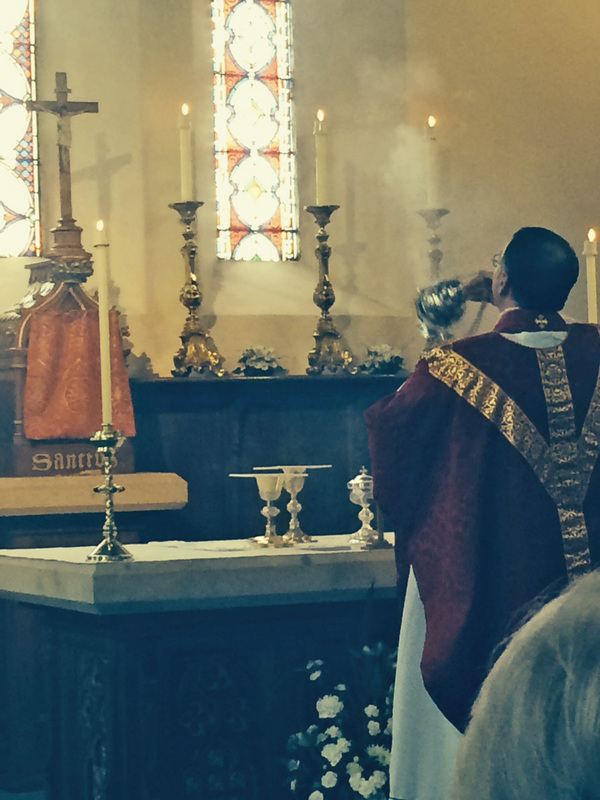 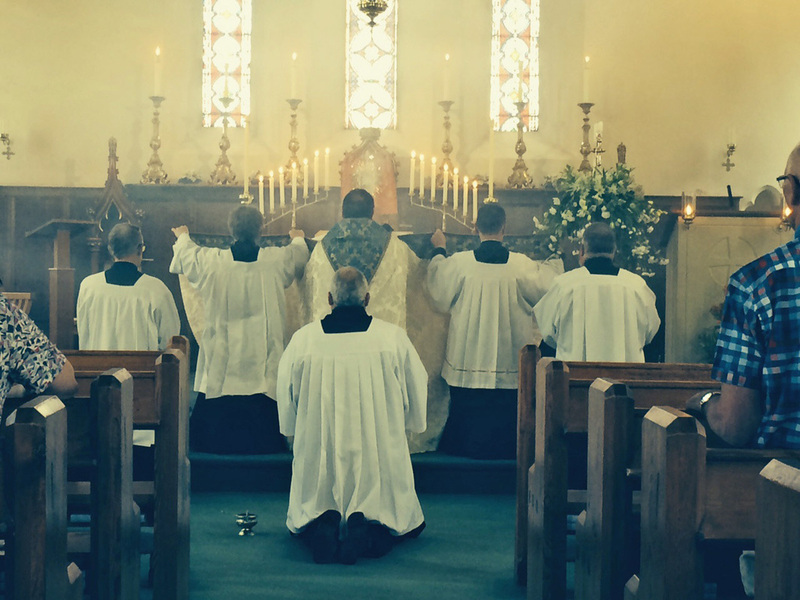 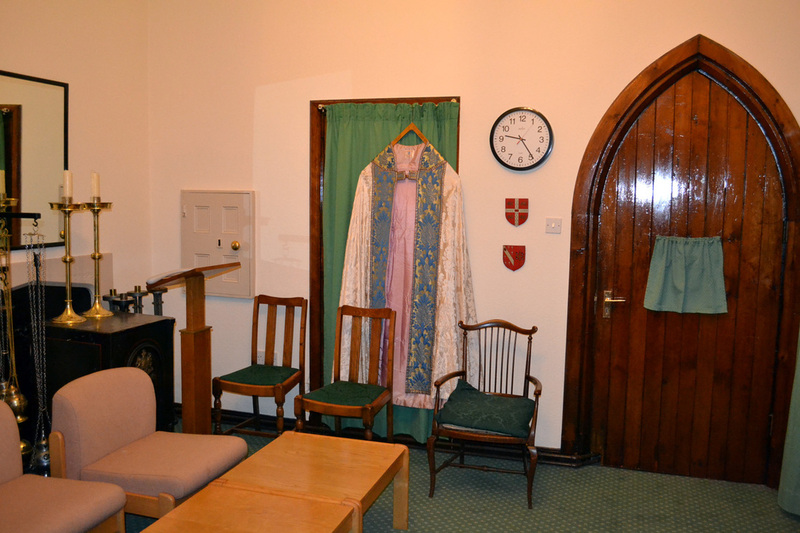 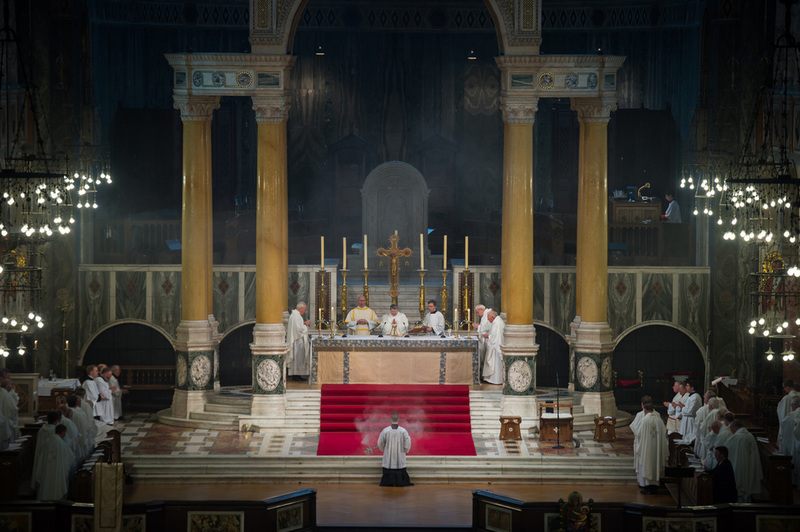 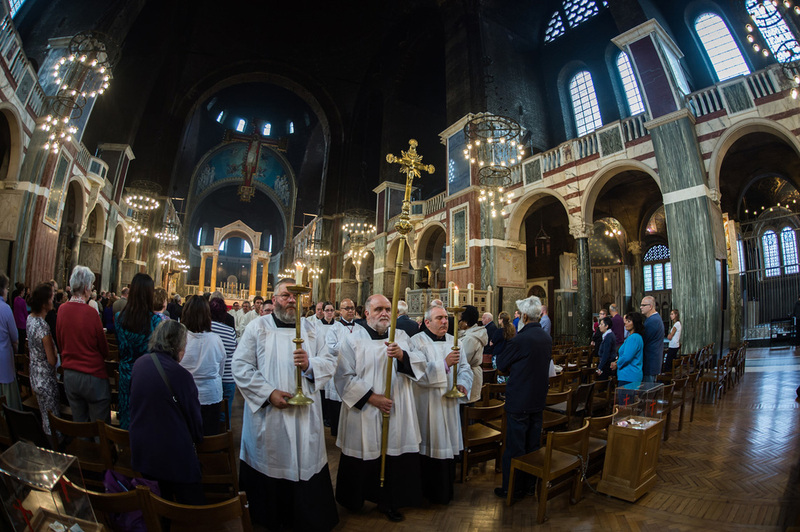 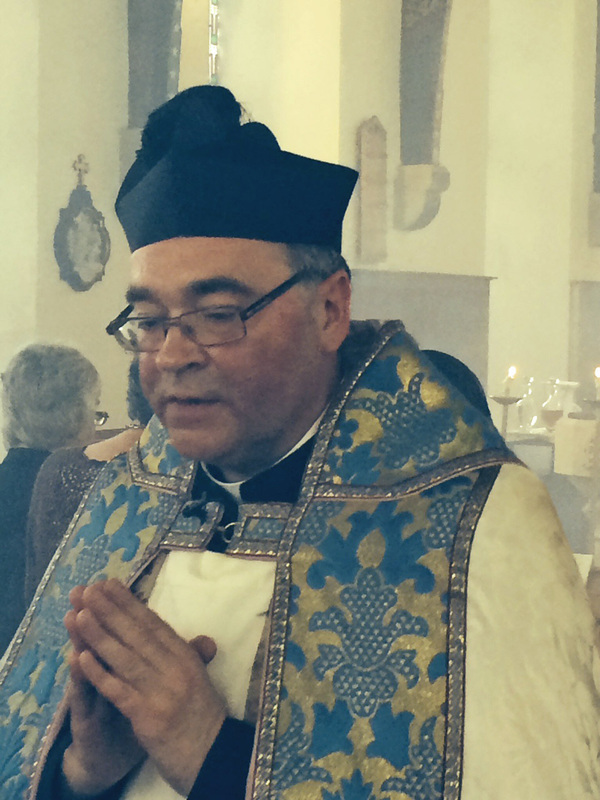 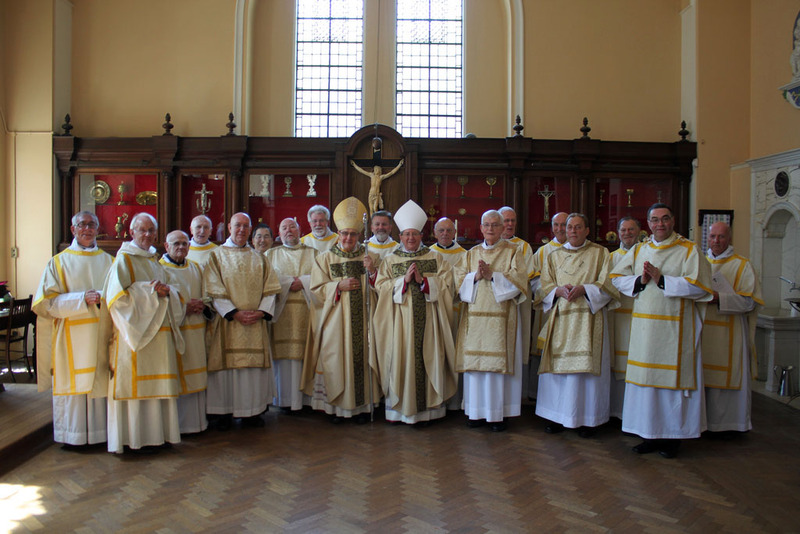 The Festival of the Ordinariate of Our Lady of Walsingham held in Westminster Hall, with Mass Offered in Westminster Cathedral, Celebrant: Rt Revd Monsignor Keith Newton, 20th September 2014. 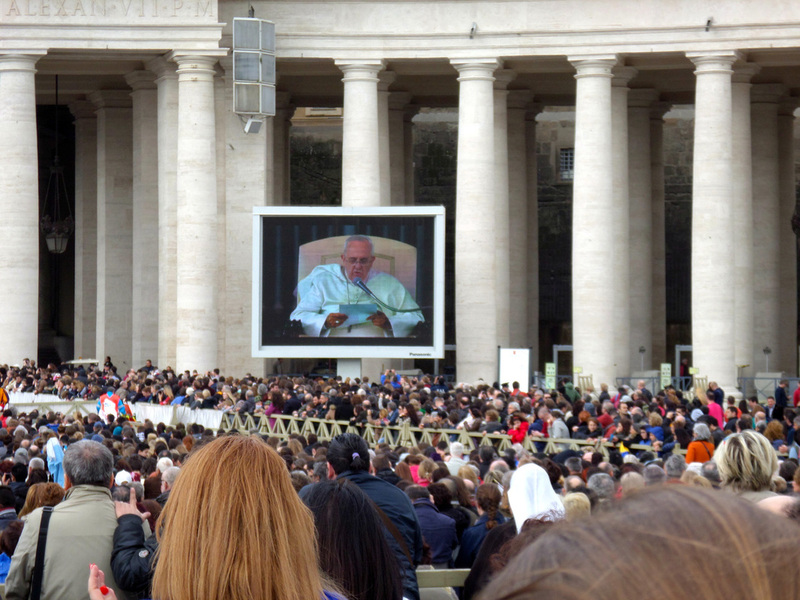 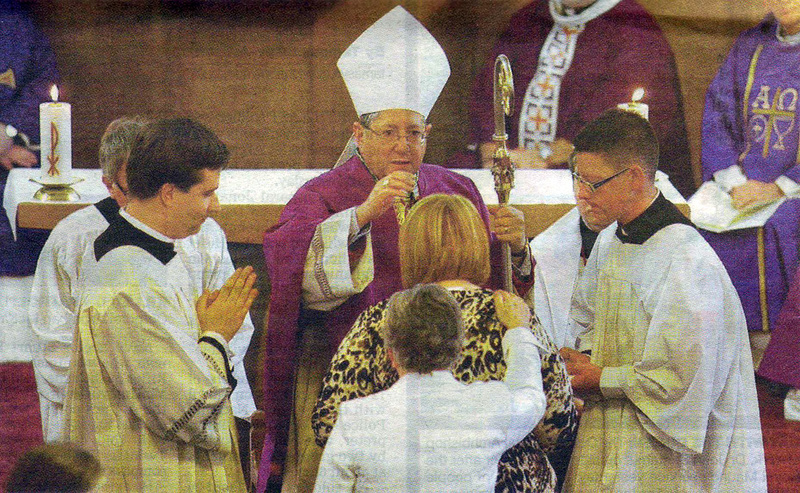 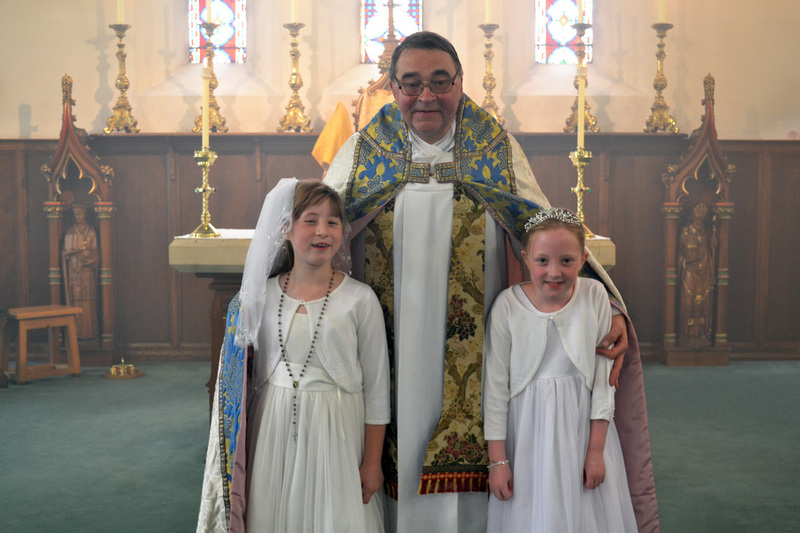 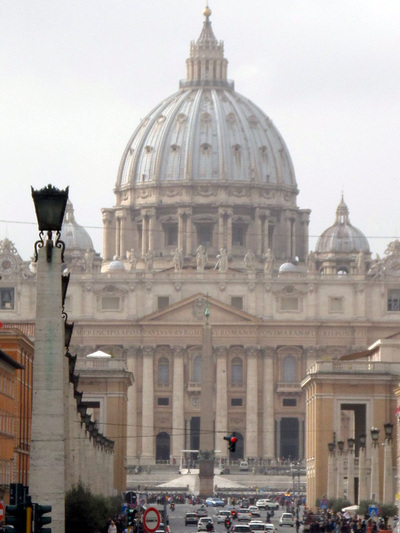 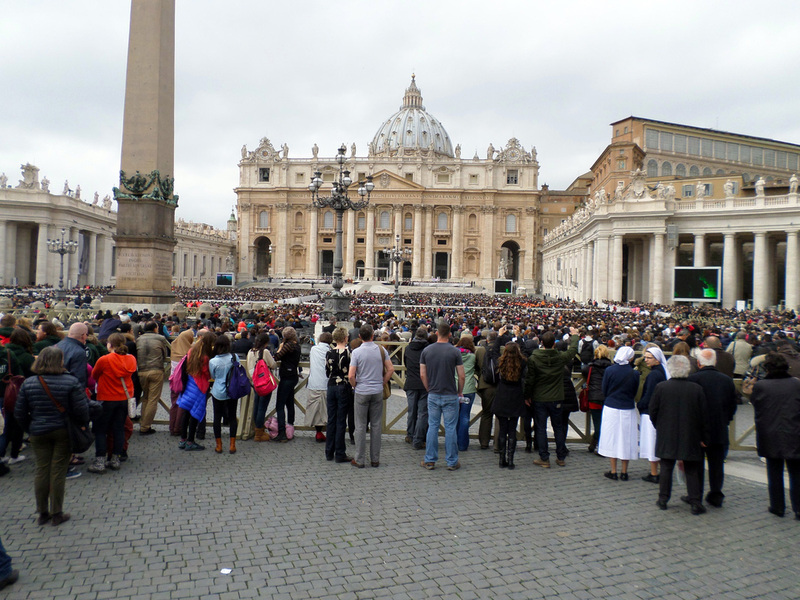 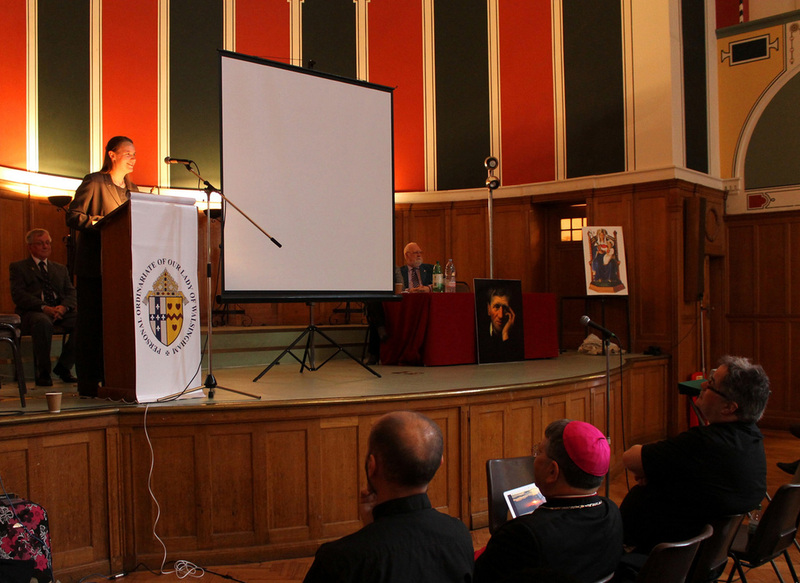 The images below are the copyright of Mazur/Catholic News Agency and may NOT be downloaded or reproduced. 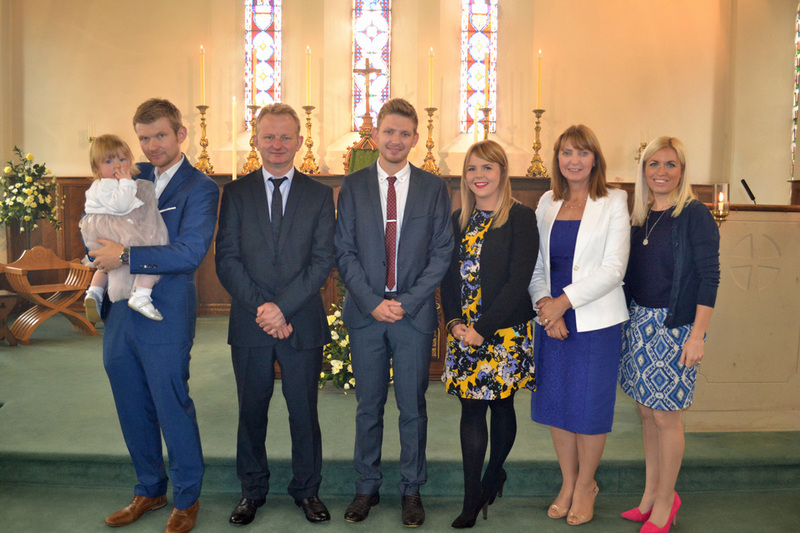 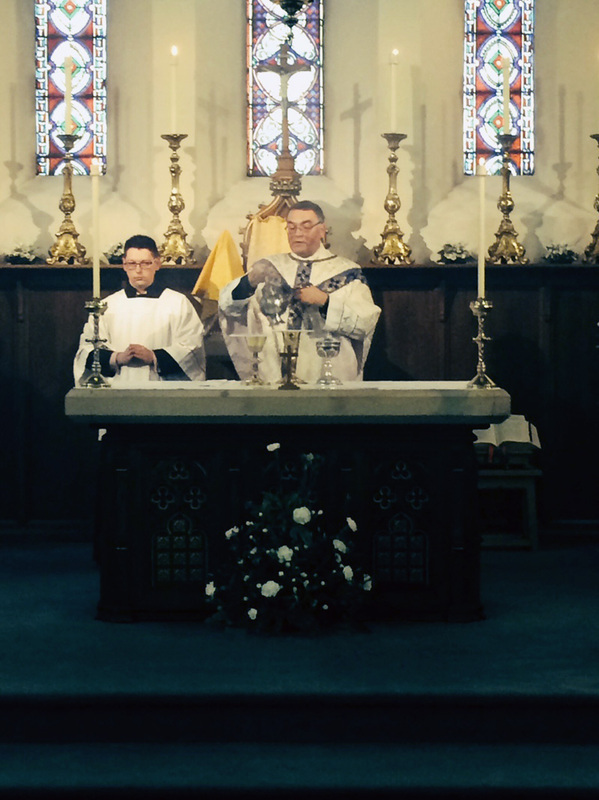 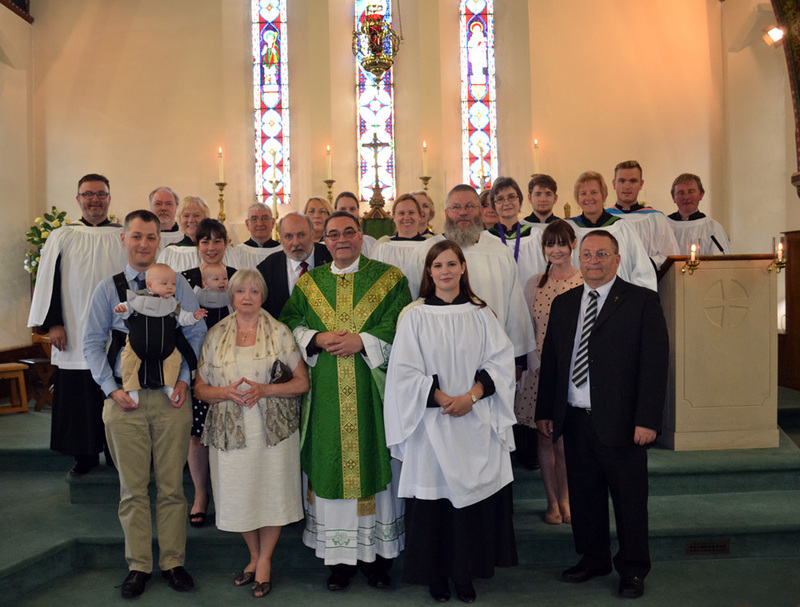 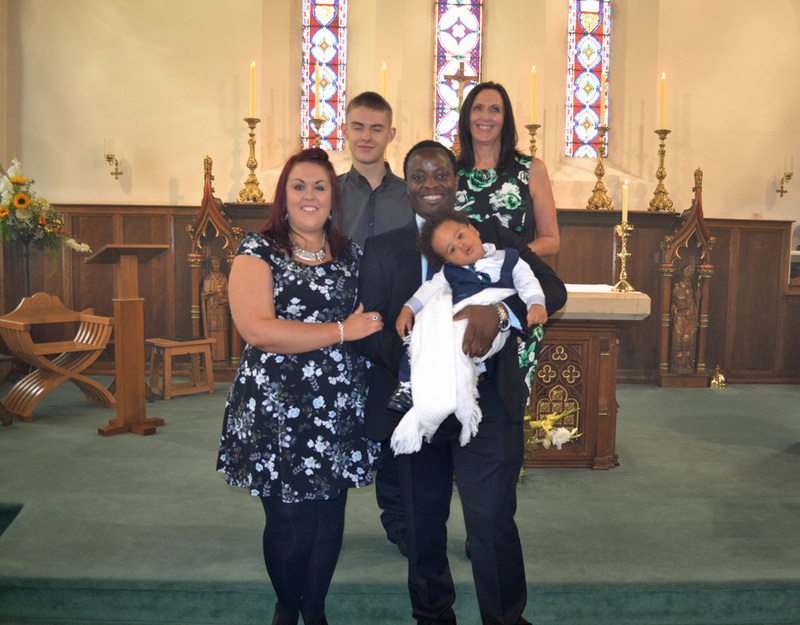 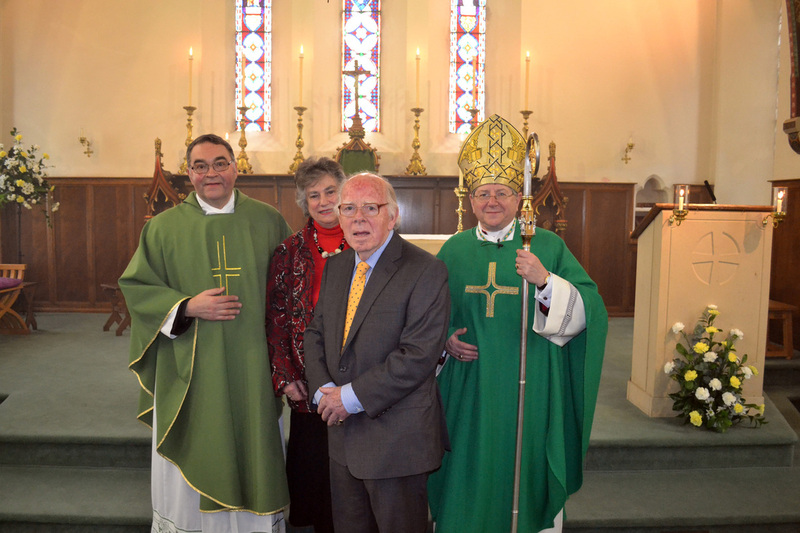 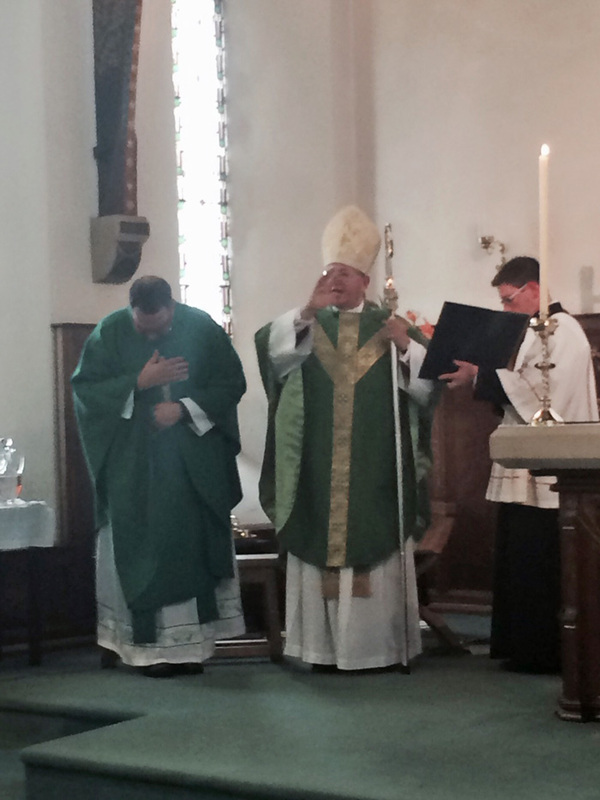 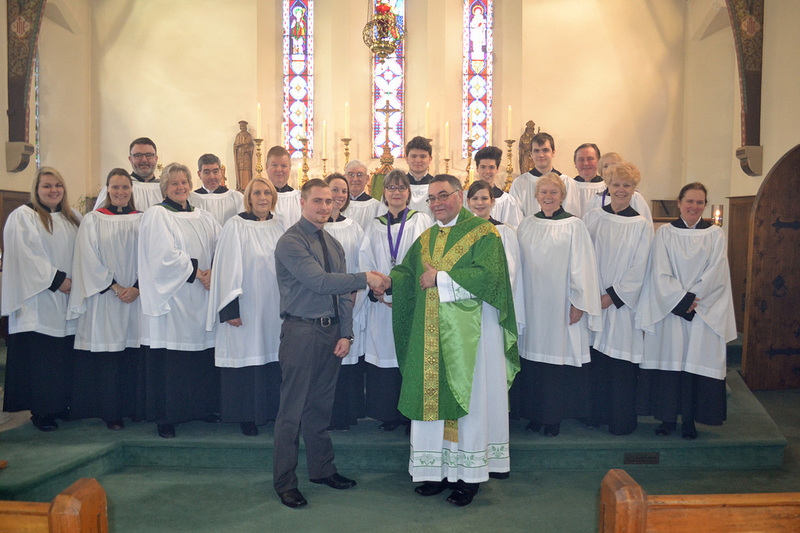 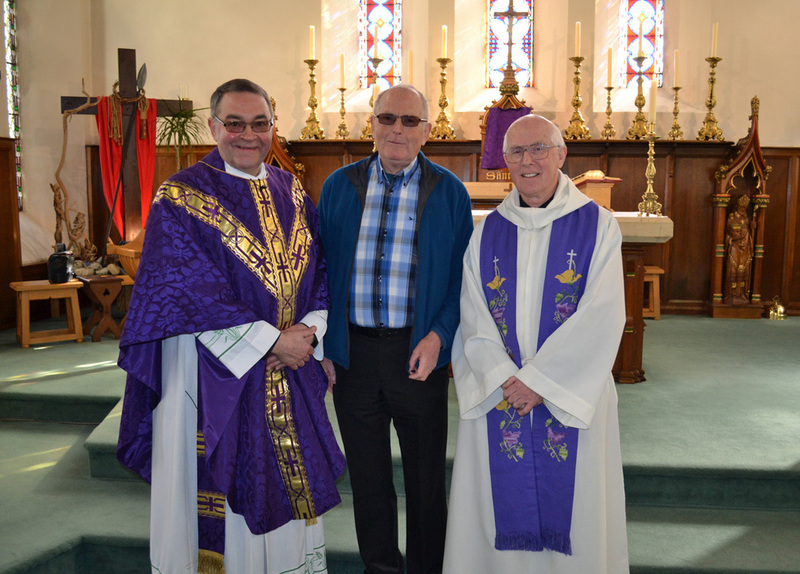 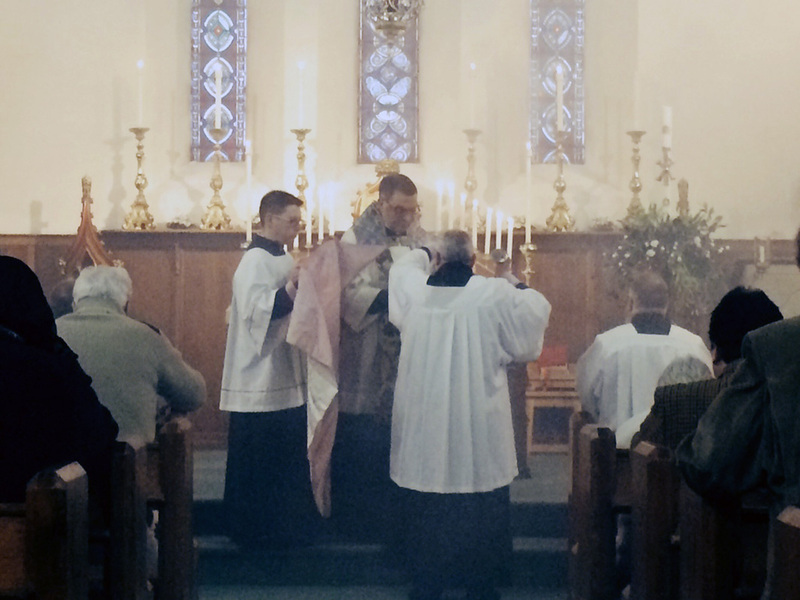 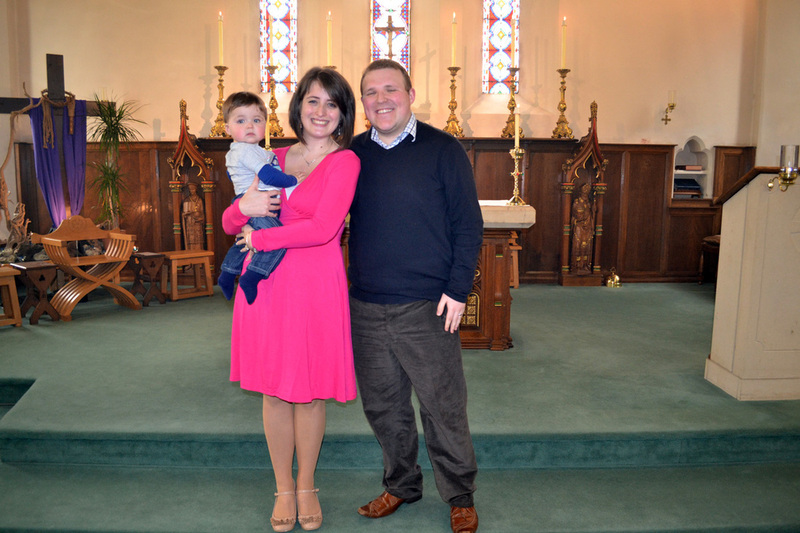 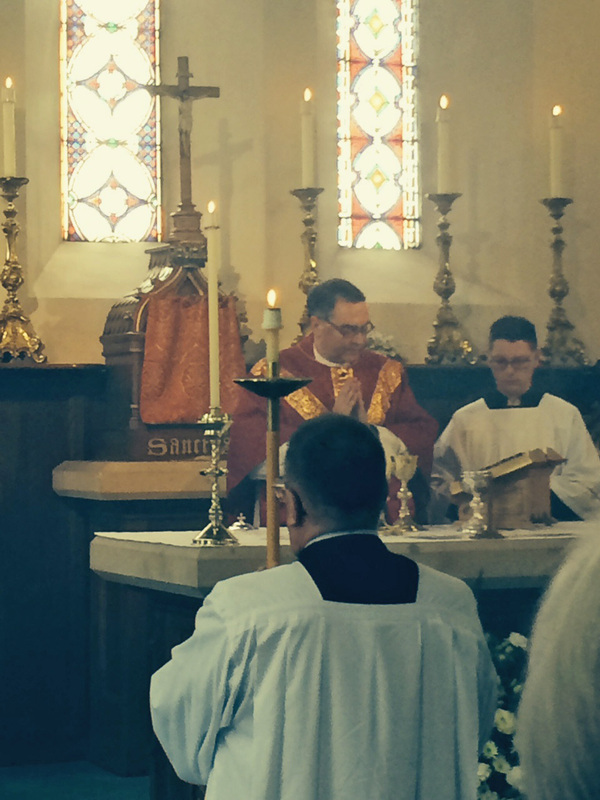 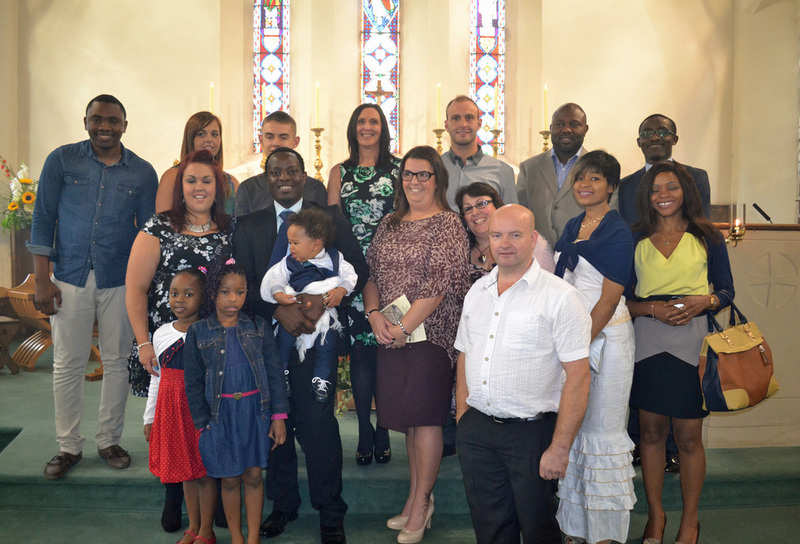 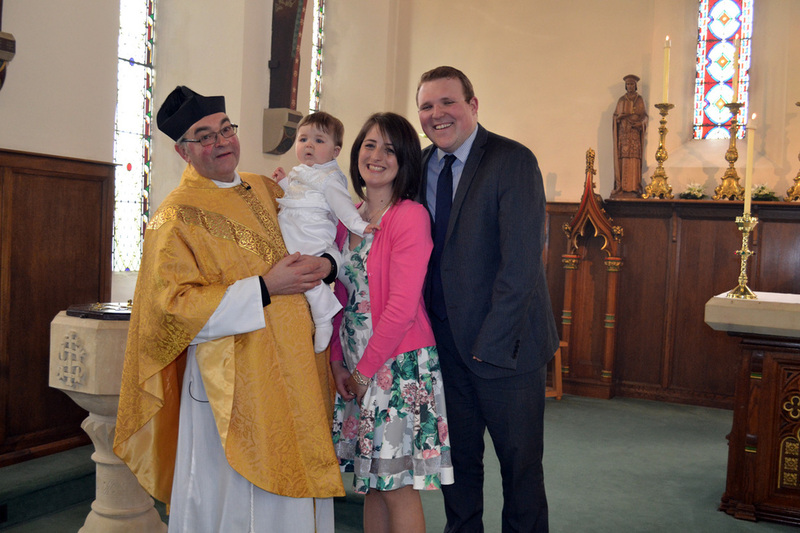 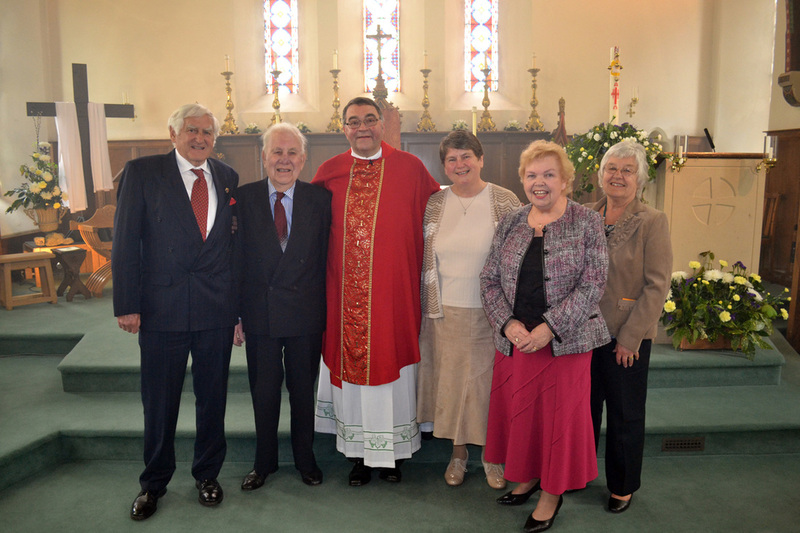 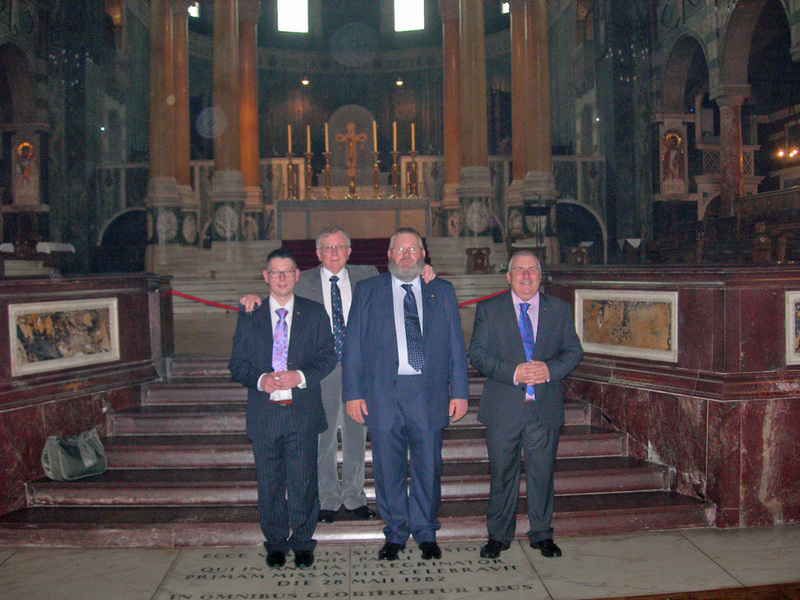 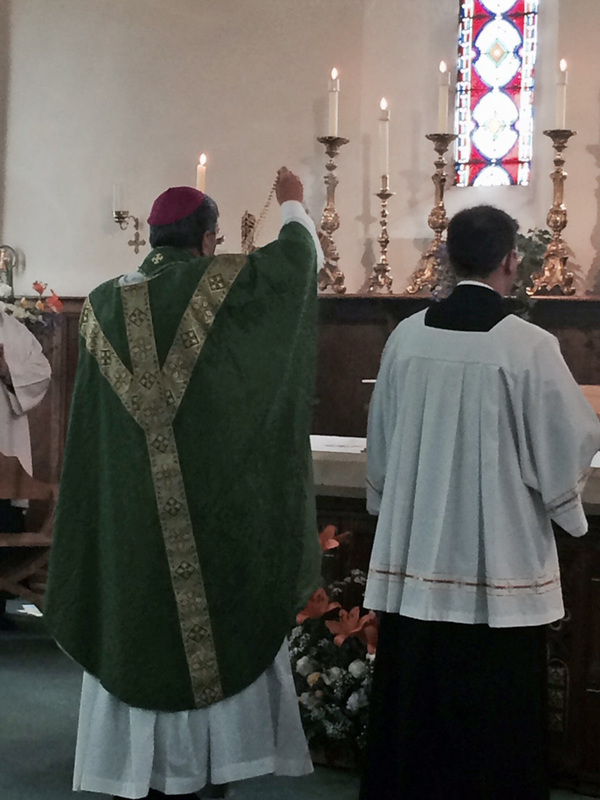 Wednesday 17th September 2014, Mr Alan Hugo (centre) Received and Confirmed during this morning's Holy Mass. 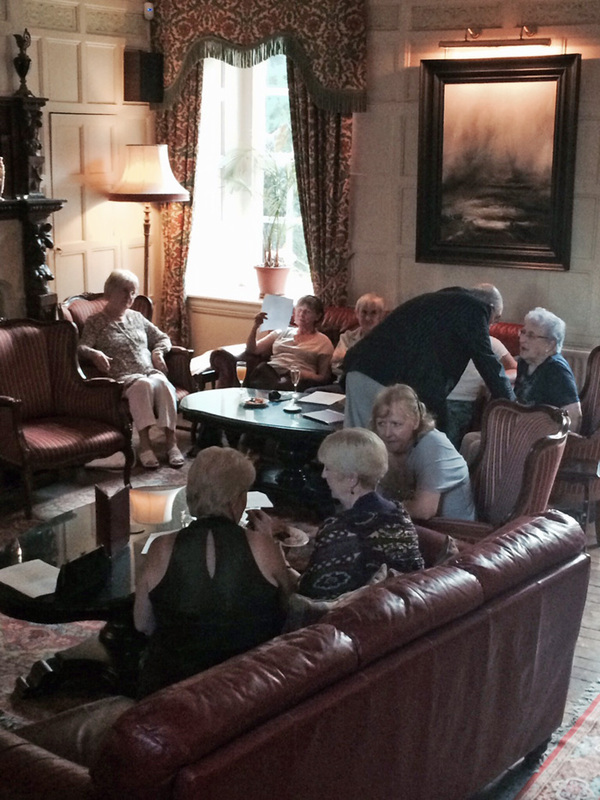 Mr Hugo enjoys coffee and a good chat with all his friends. 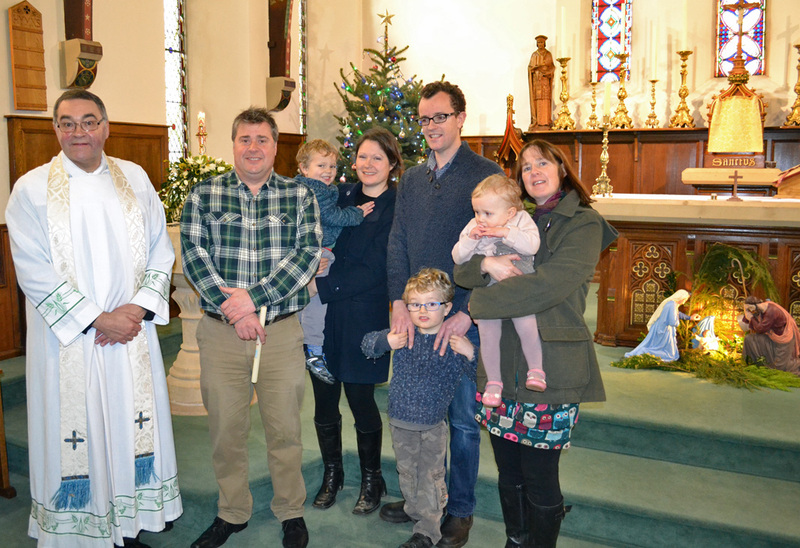 We say farewell to Glen, Sophia, Jasper and Suzanna Blowfield and wish them Bon Voyage as they prepare to depart for the USA. 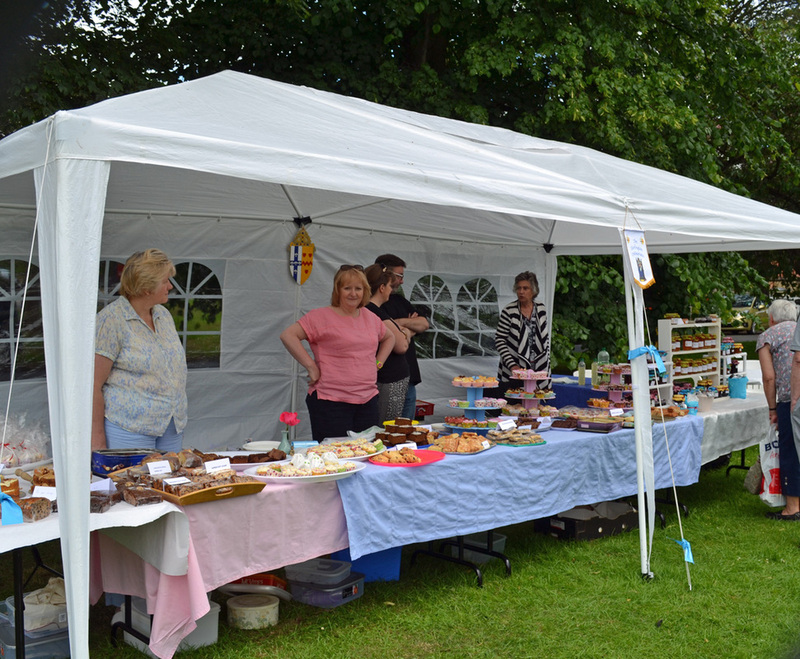 Our well-stocked stall, mmmmmm cakes! 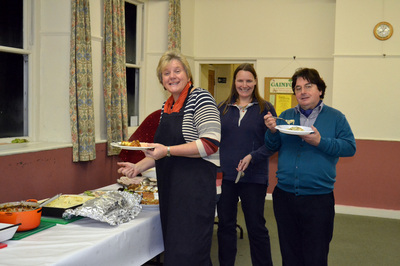 Many thanks to all who helped. 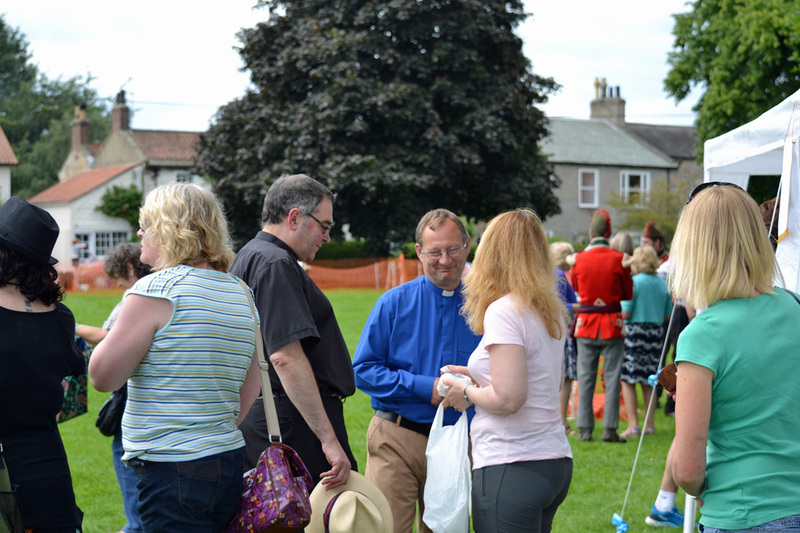 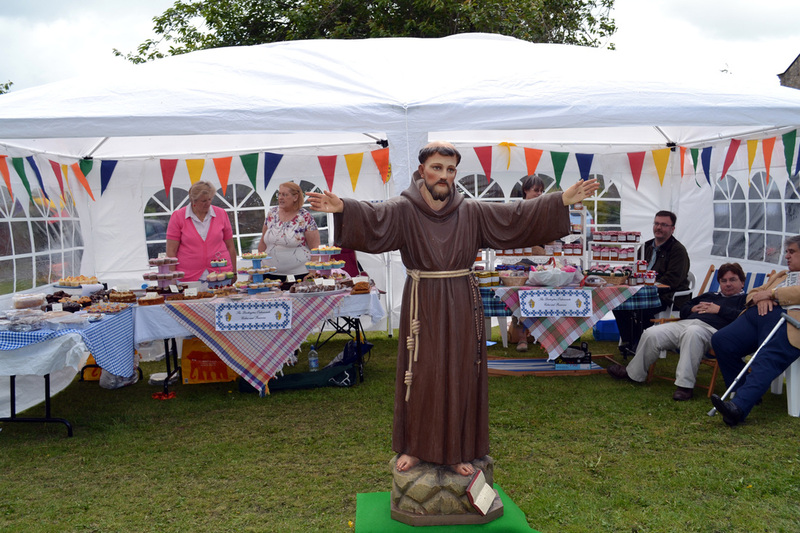 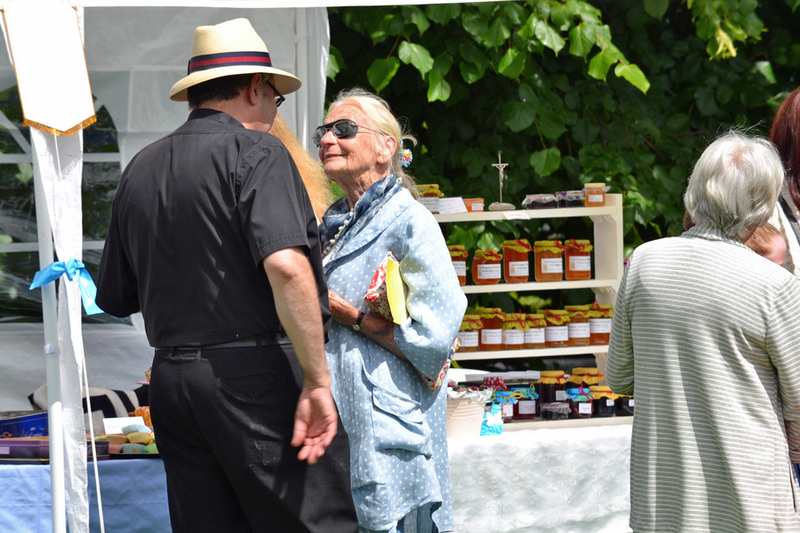 Father Grieves chats to the villagers in front of our stall. 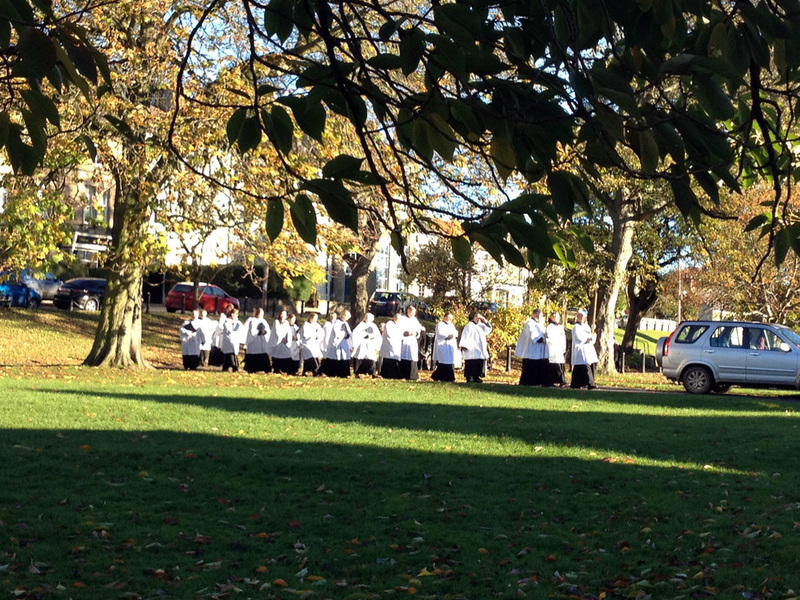 ...but then they decide to join up. 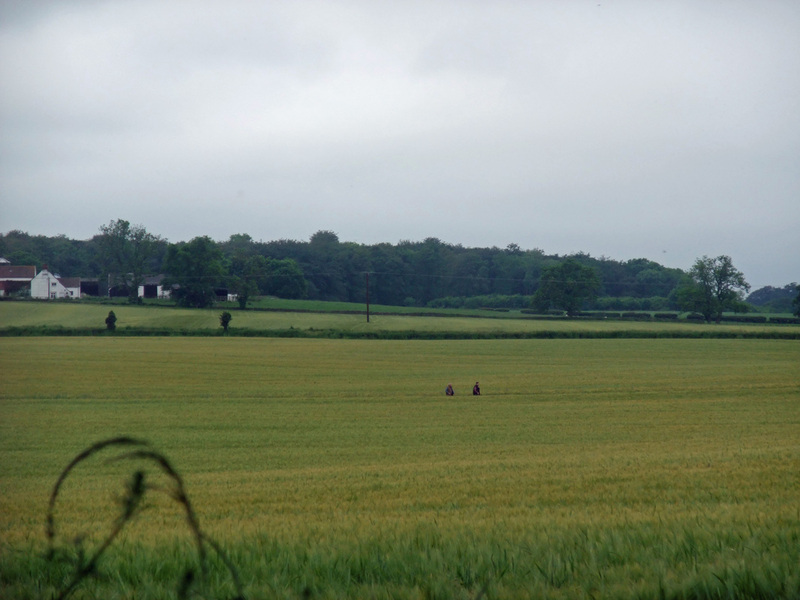 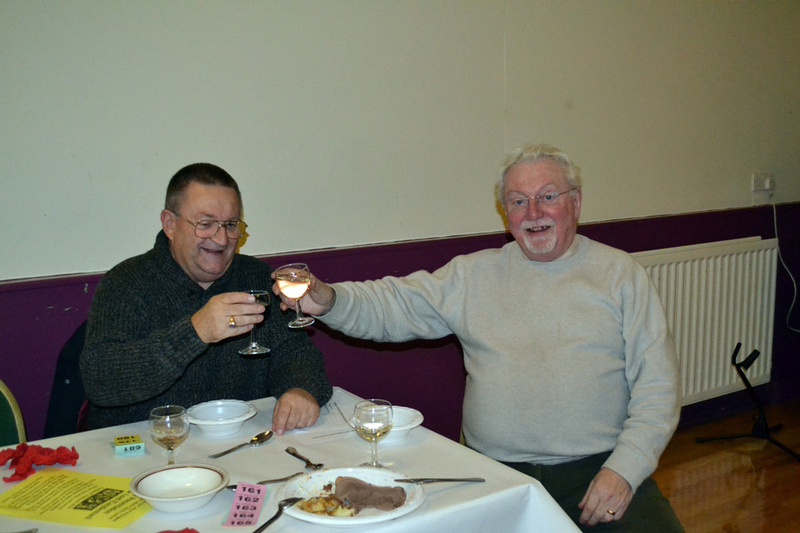 Darren and Shaun plough a lonely furrow - but they made it to the Bucks Fizz. 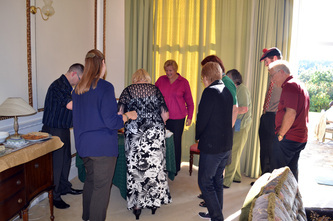 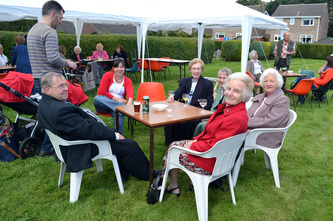 Christine Hutchinson (second left) received today. 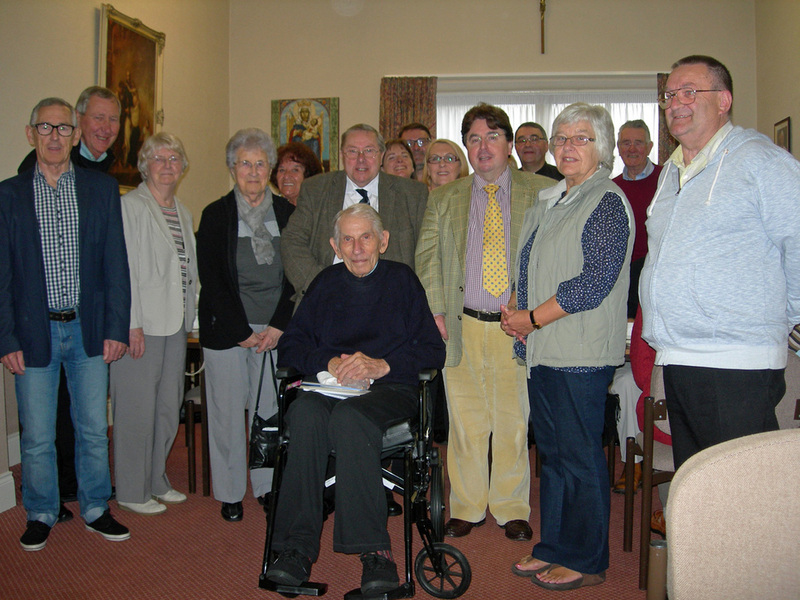 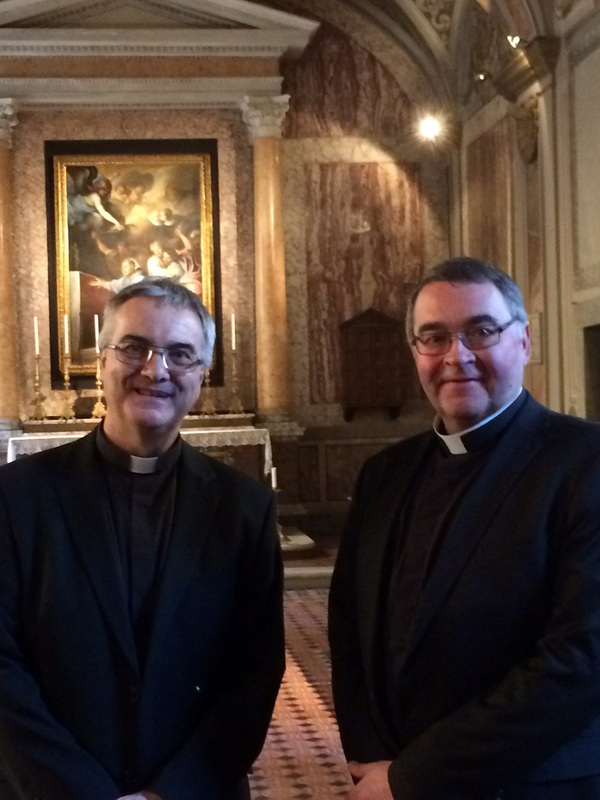 Today were visited by Mr Dylan Parry, editor of 'OREMUS' the magazine of Westminster Cathedral and Friend of the Ordinariate. 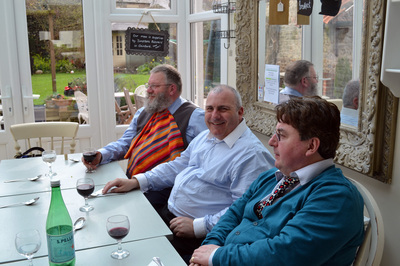 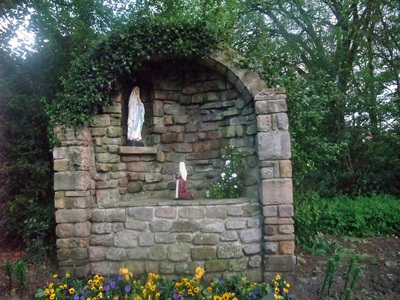 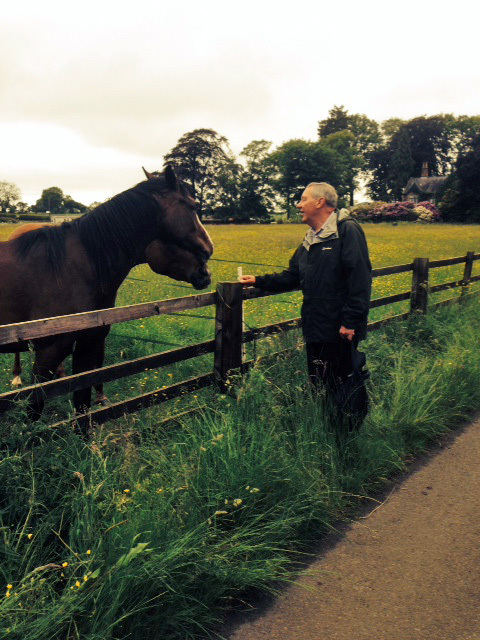 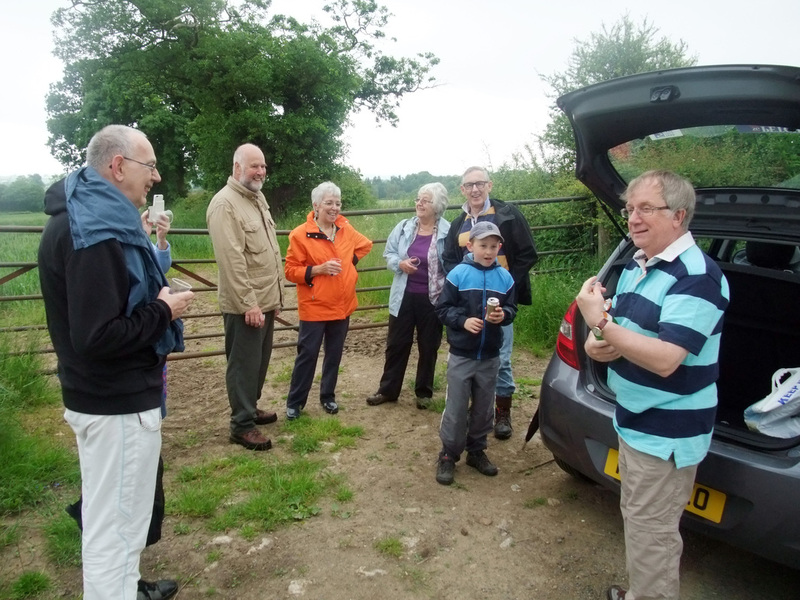 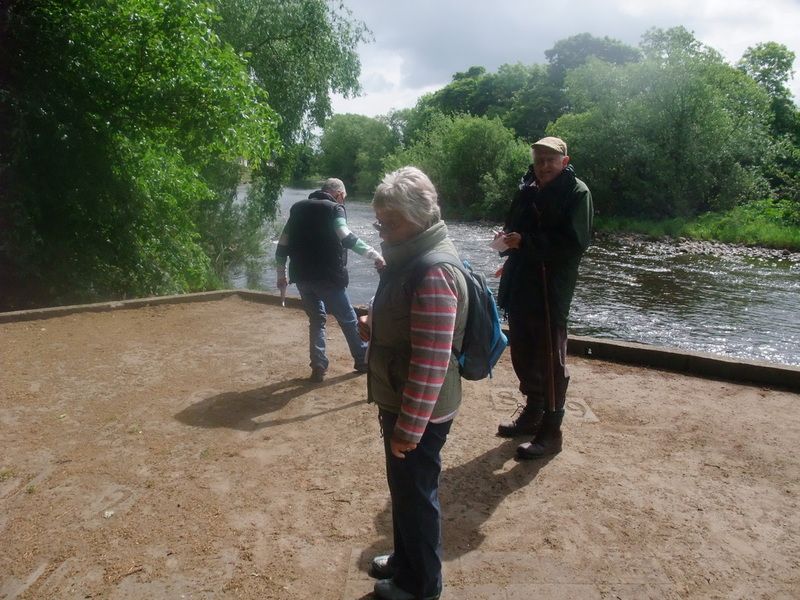 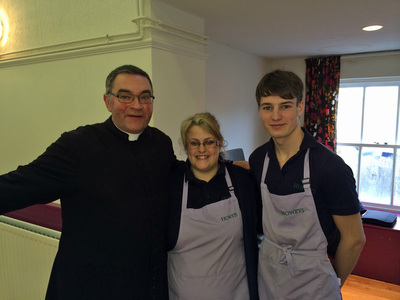 Mr Parry attended our Mass and then it was lunch at Howeys of Gainford. 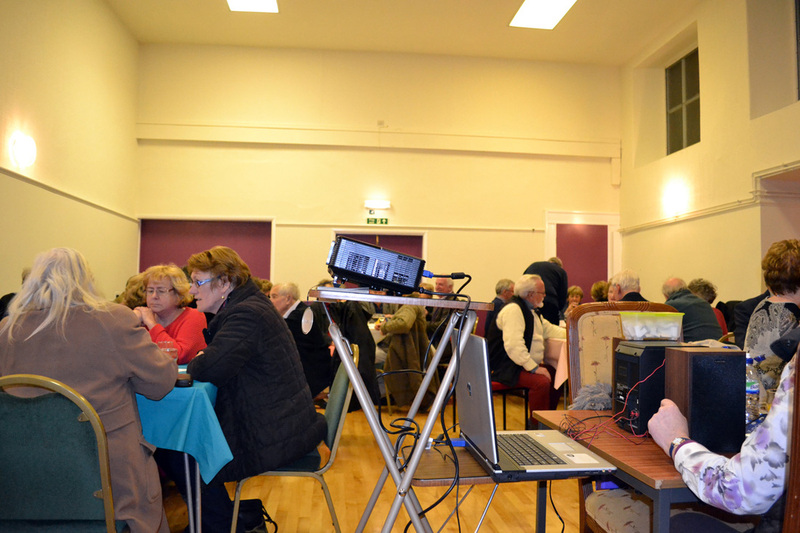 Our 'Hi-tech' Quiz Night held on 28th March in Gainford Village Hall. 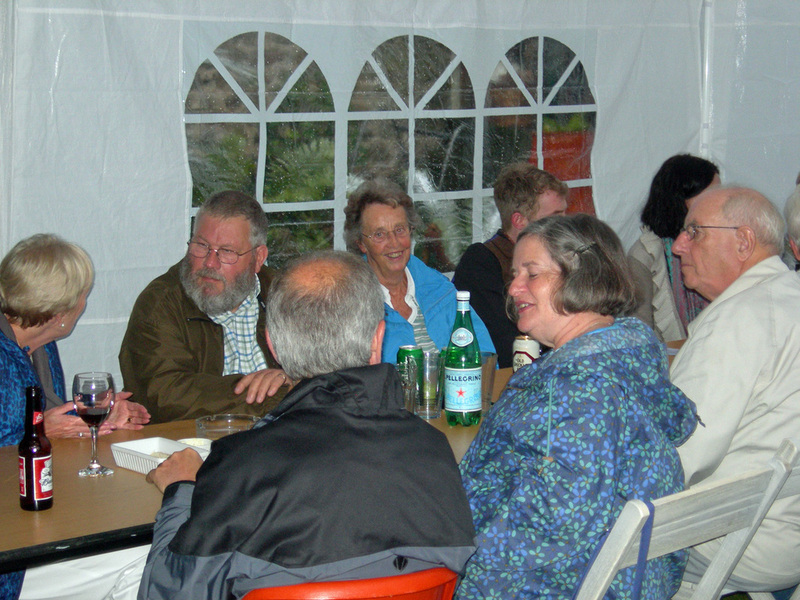 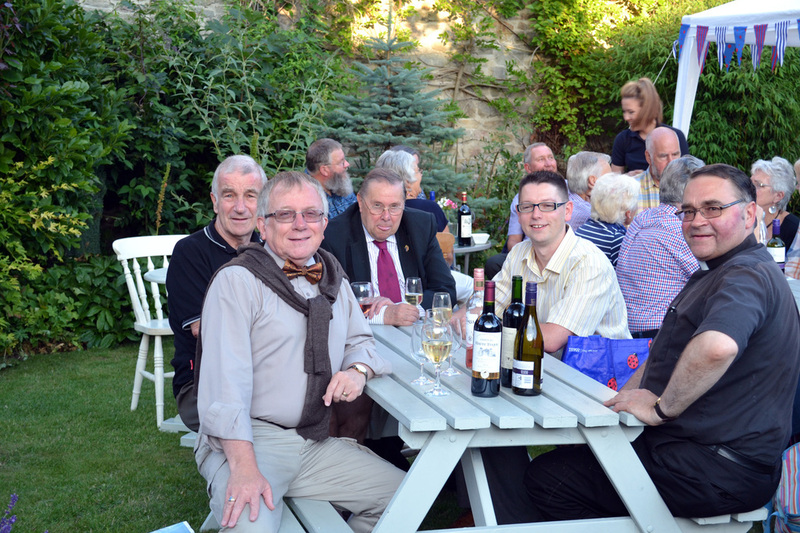 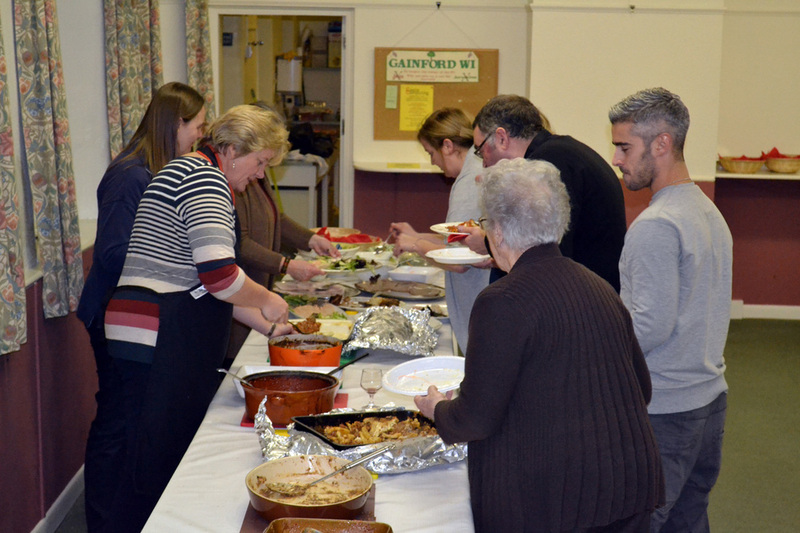 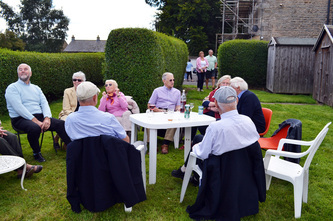 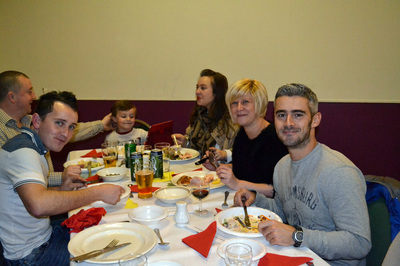 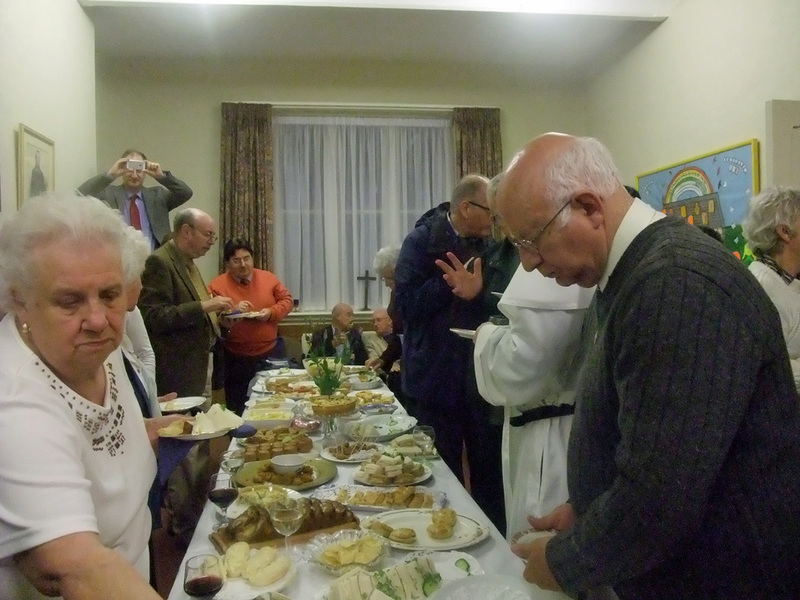 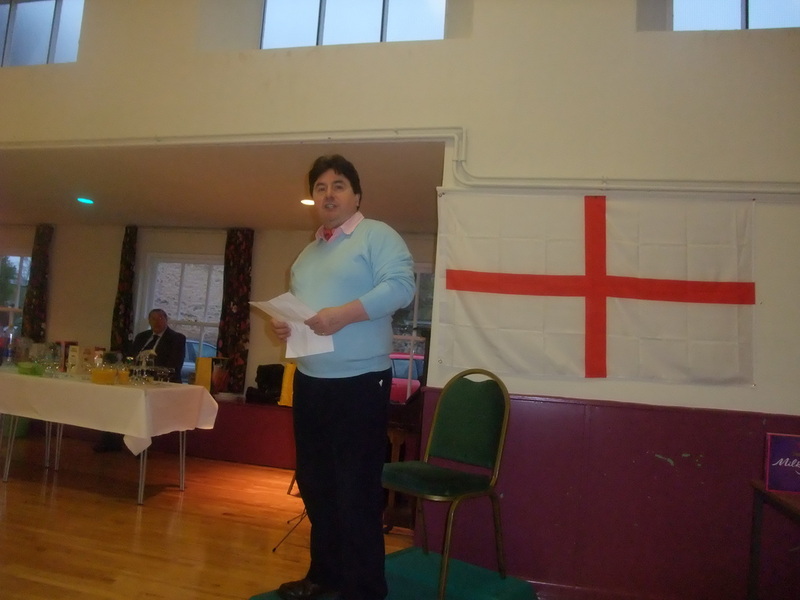 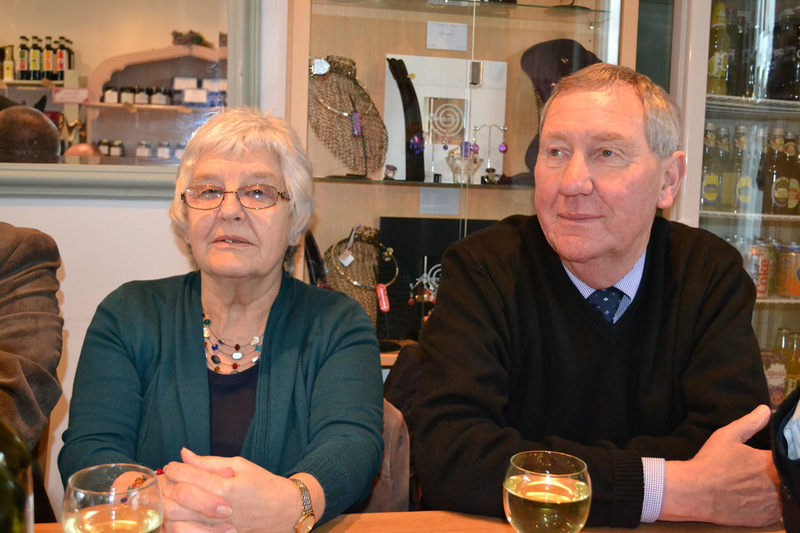 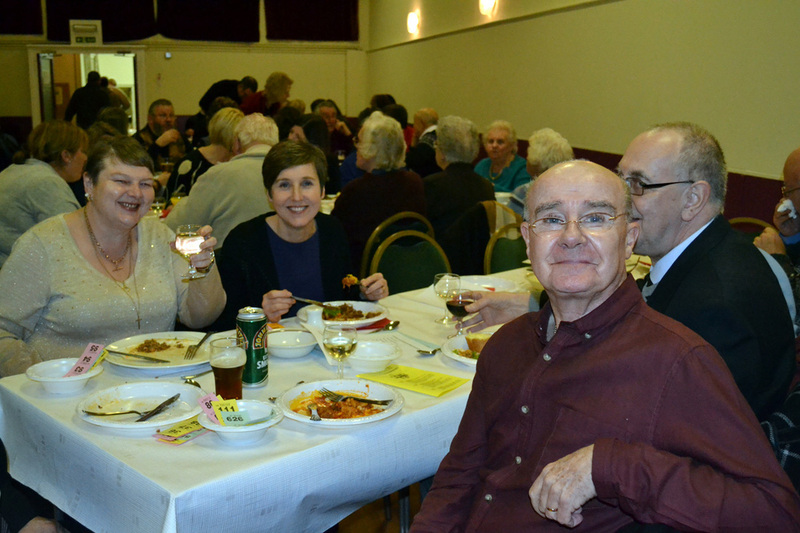 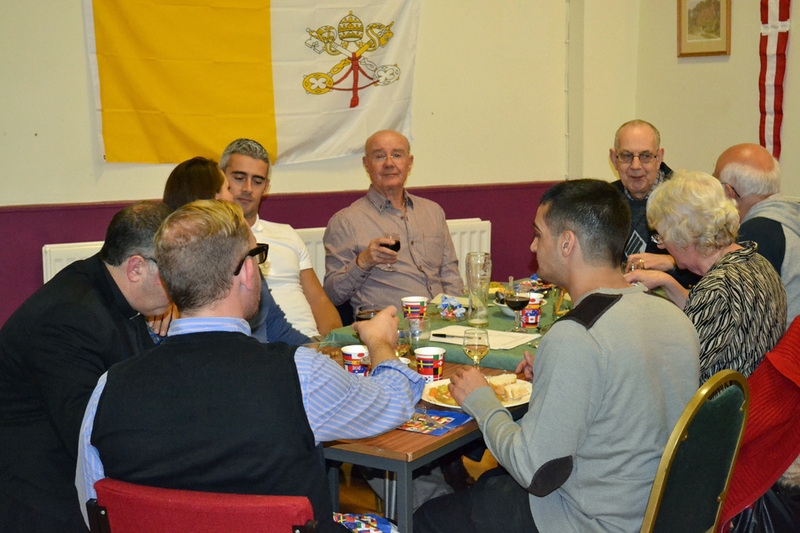 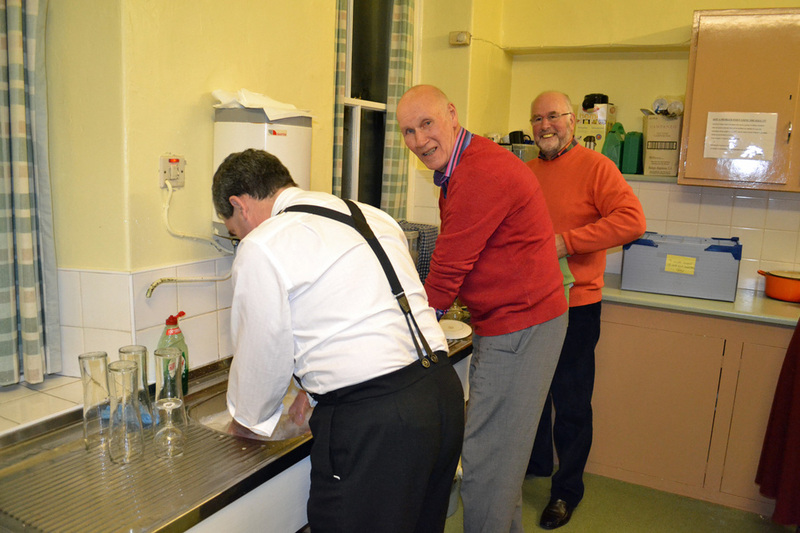 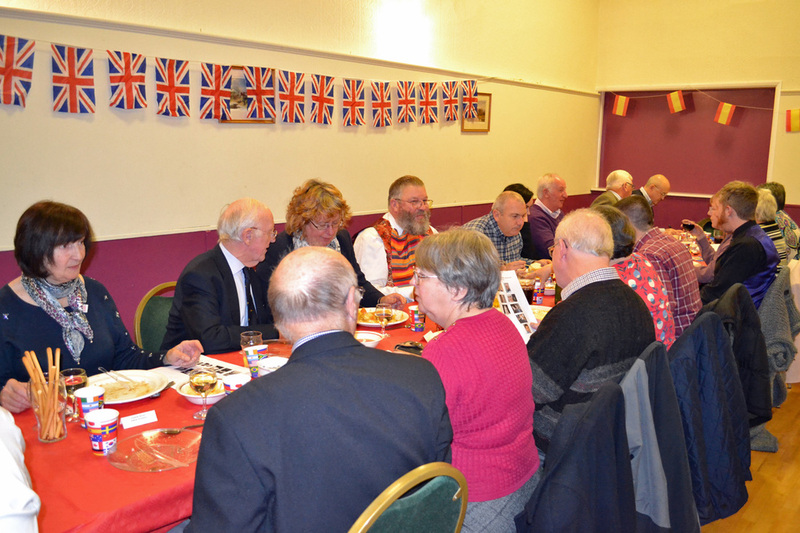 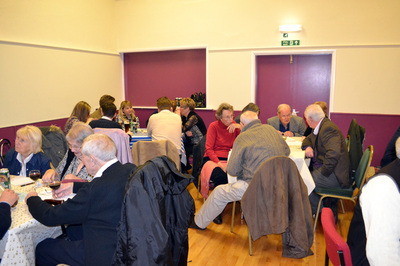 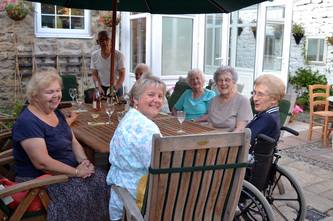 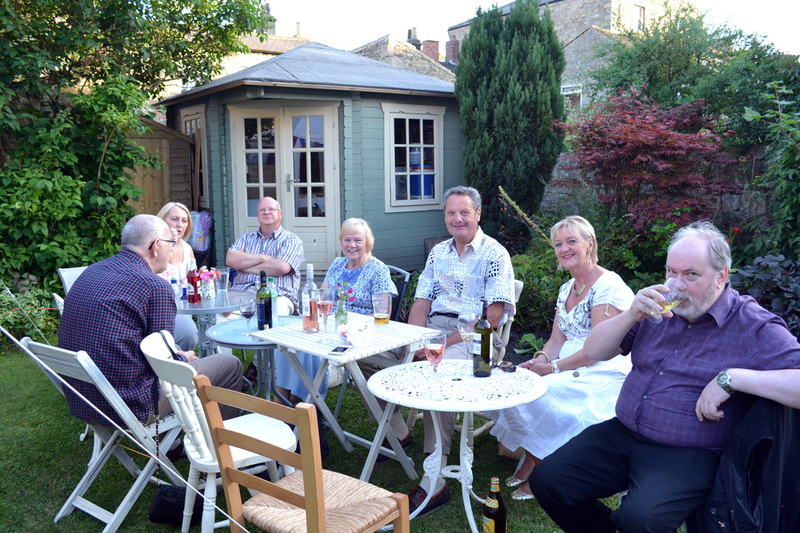 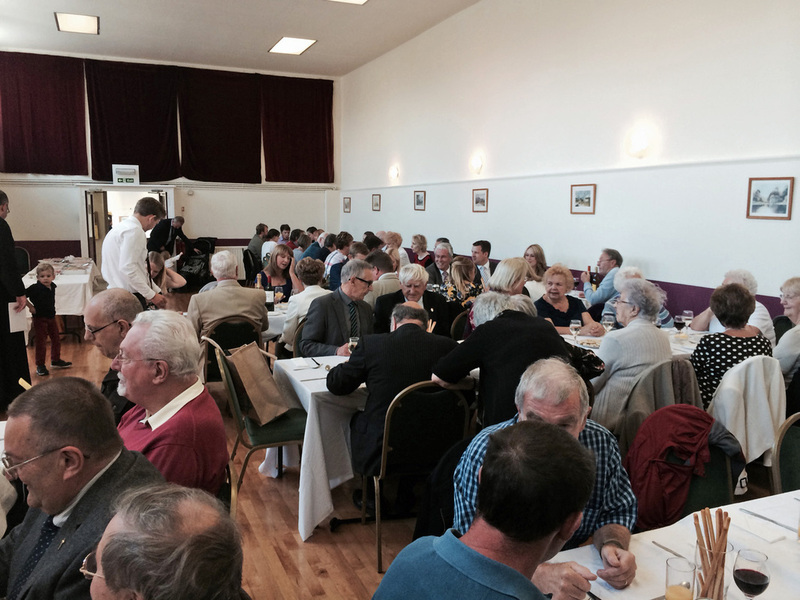 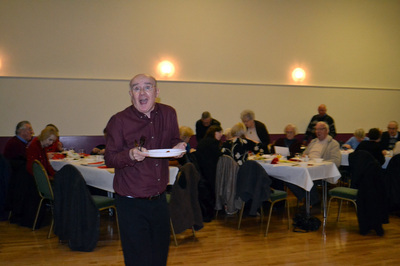 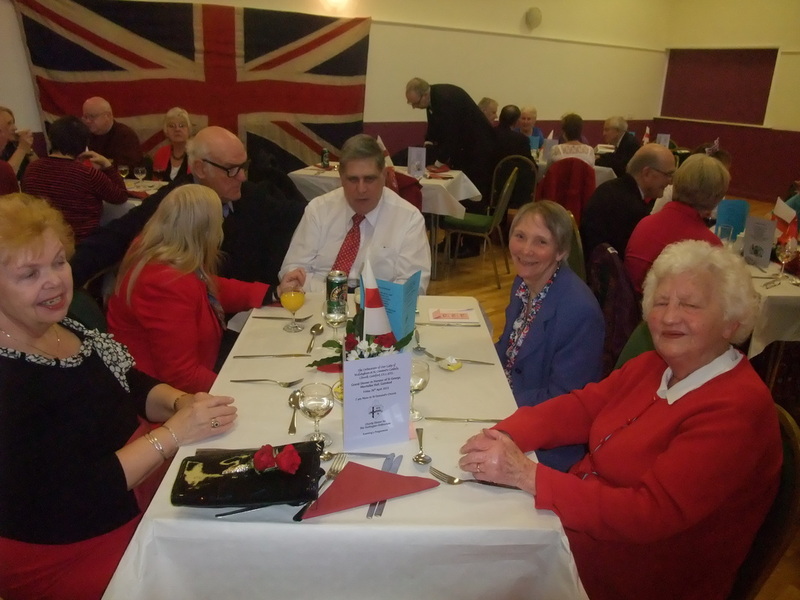 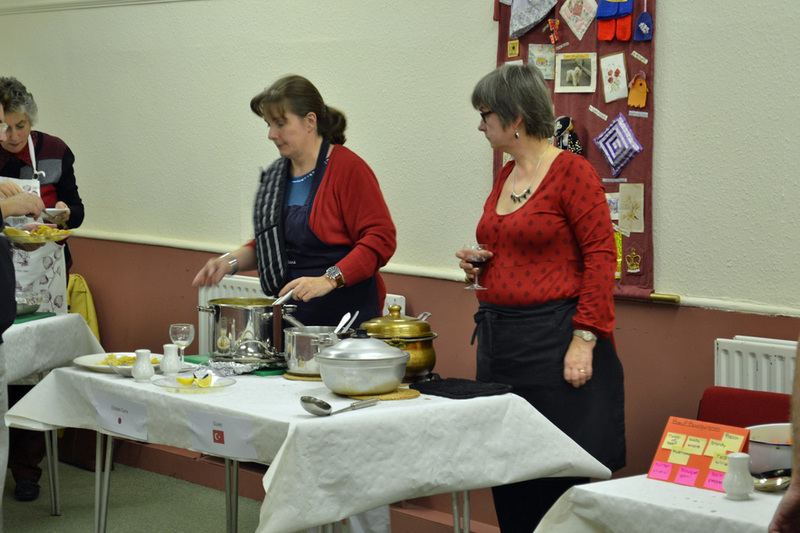 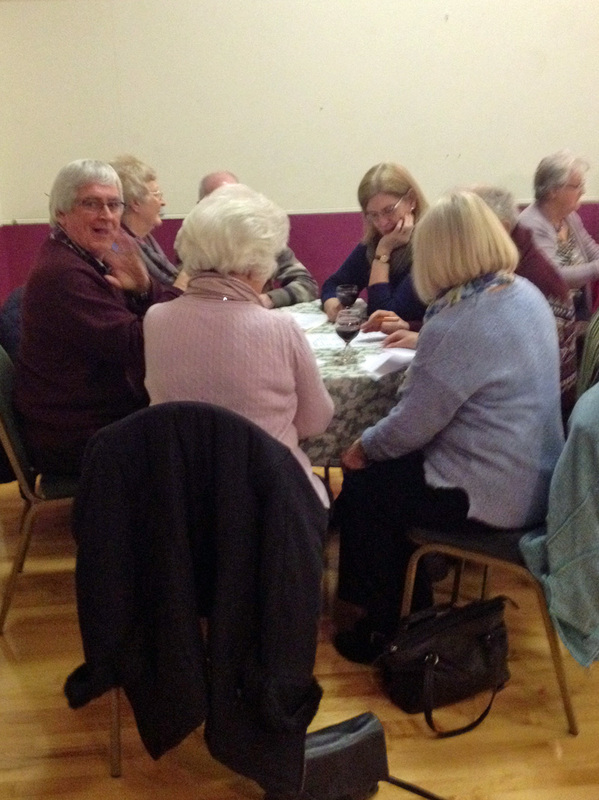 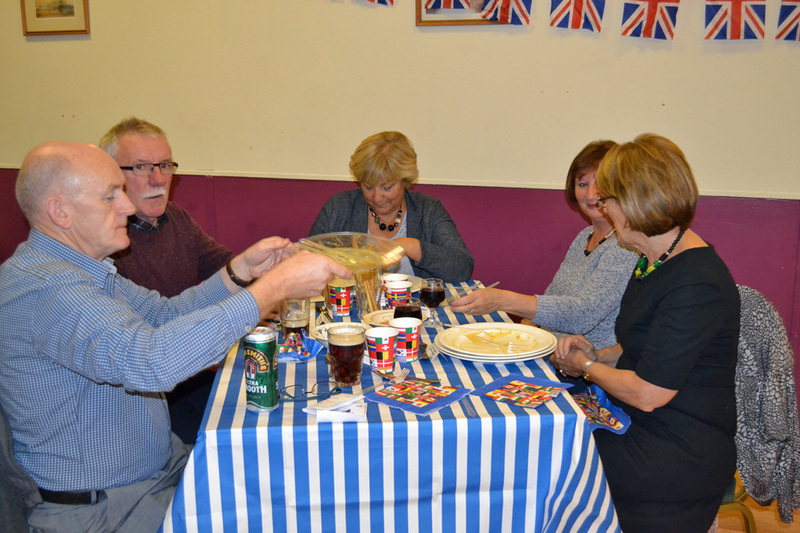 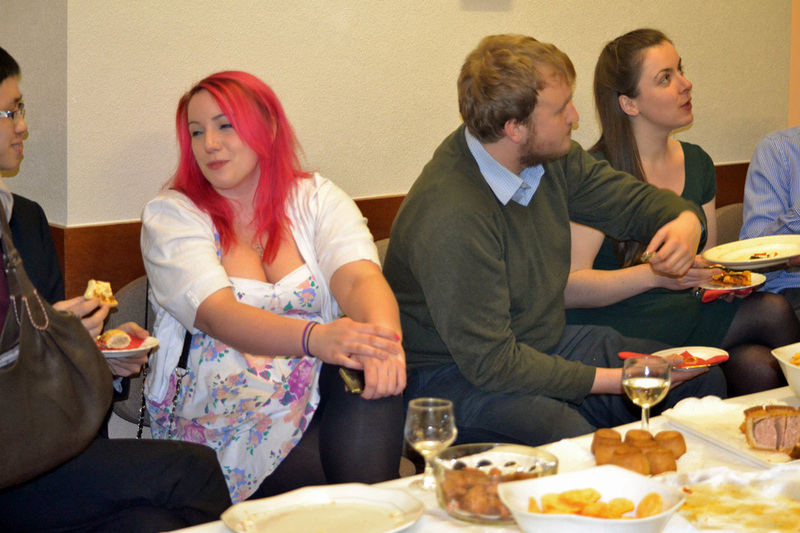 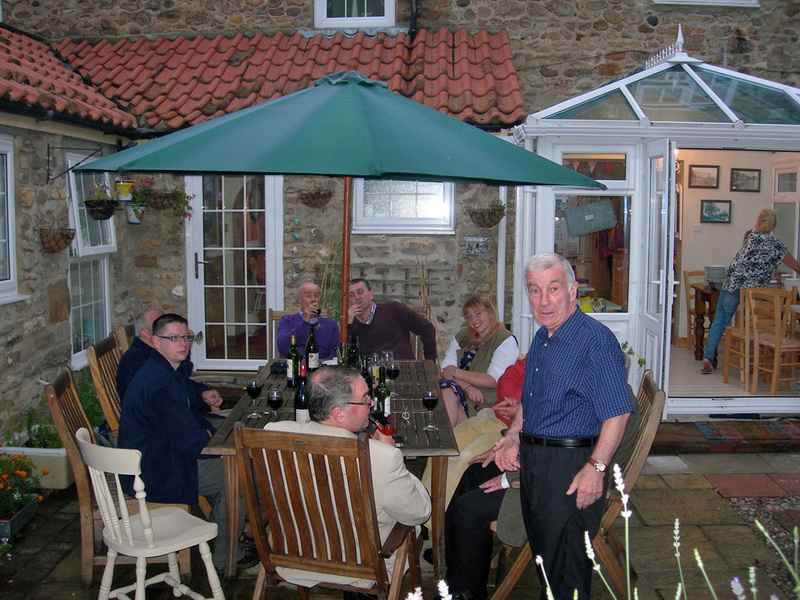 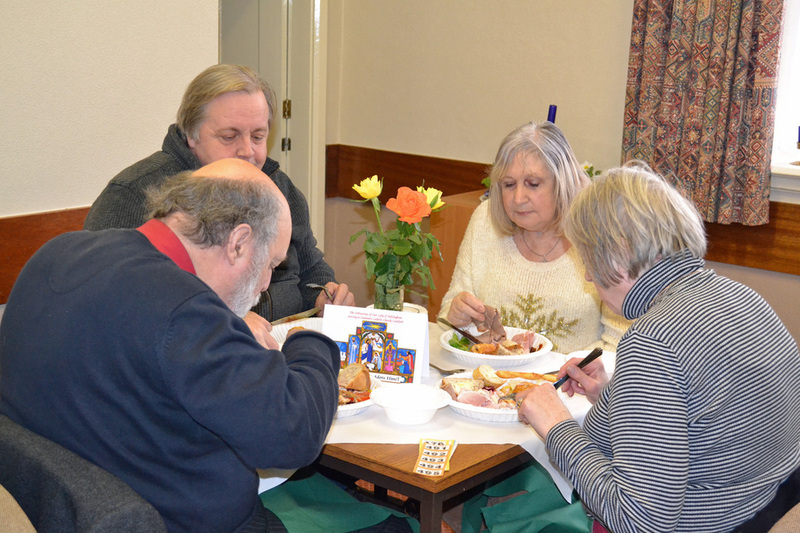 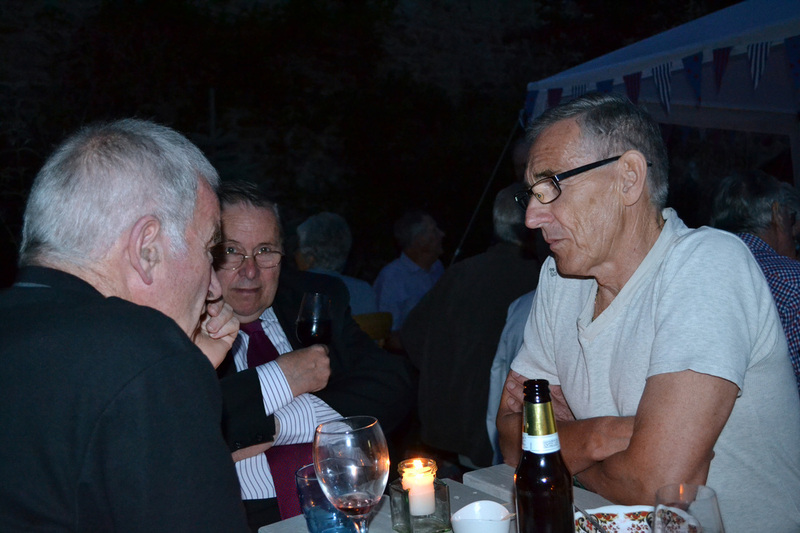 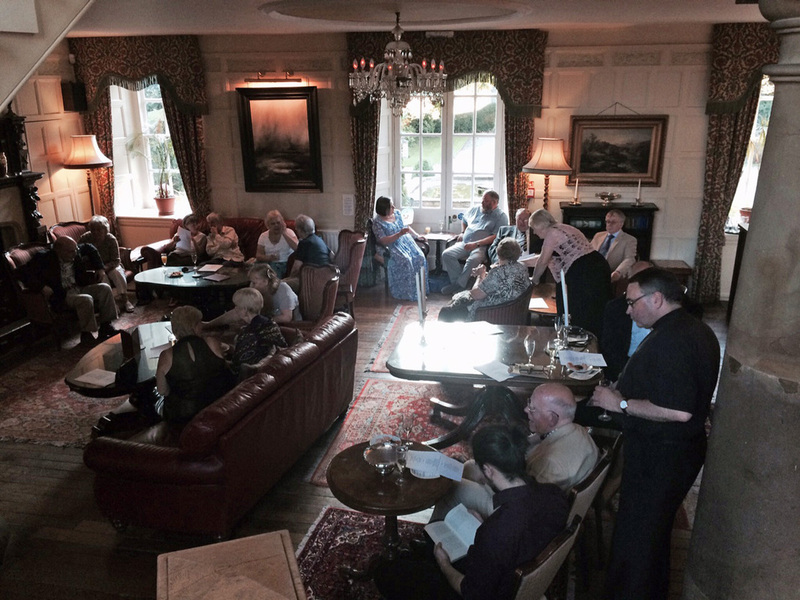 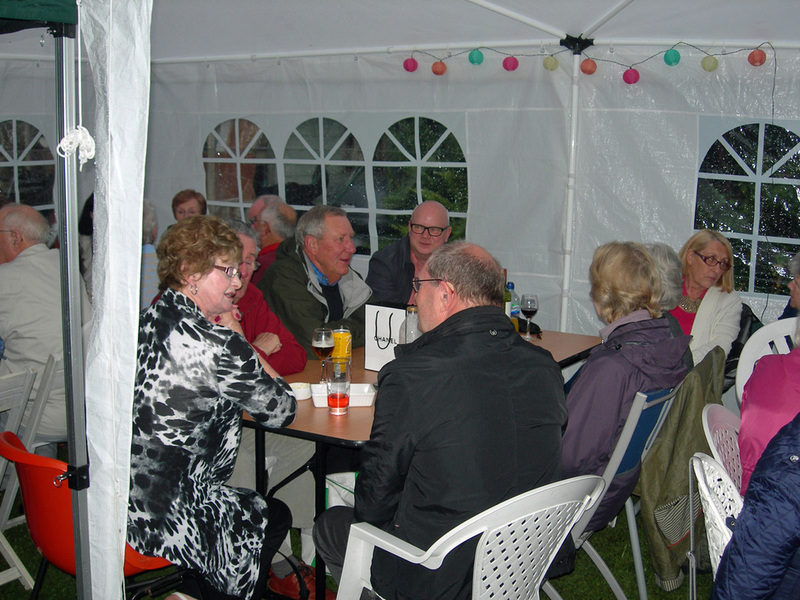 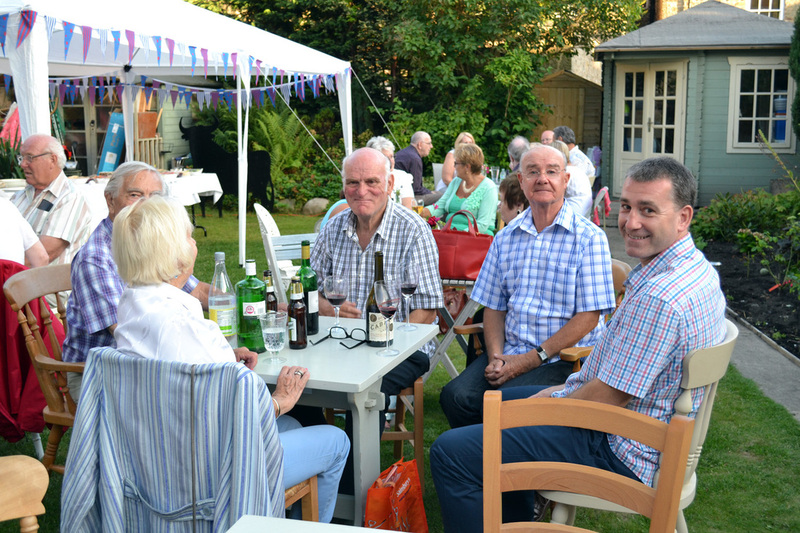 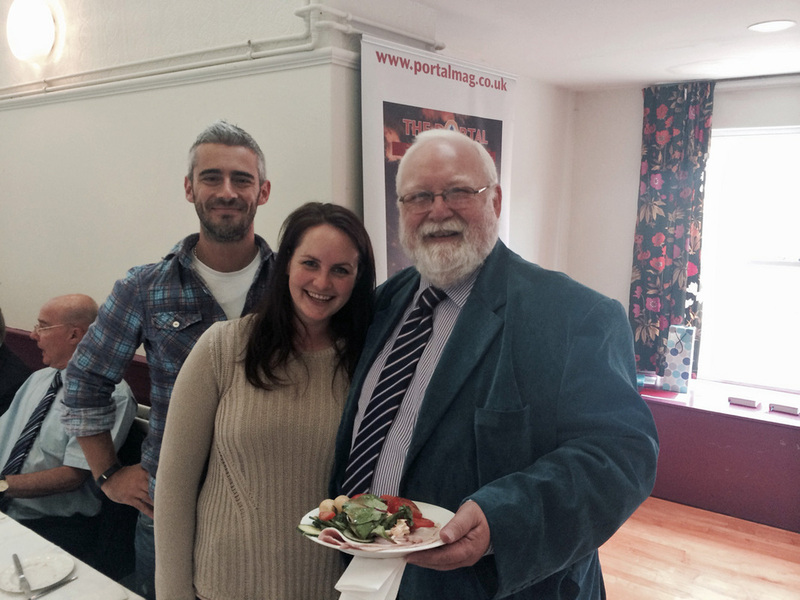 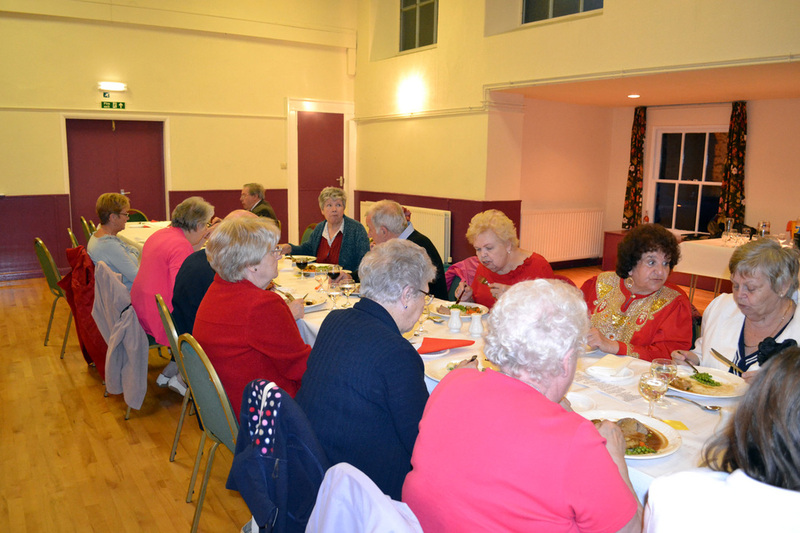 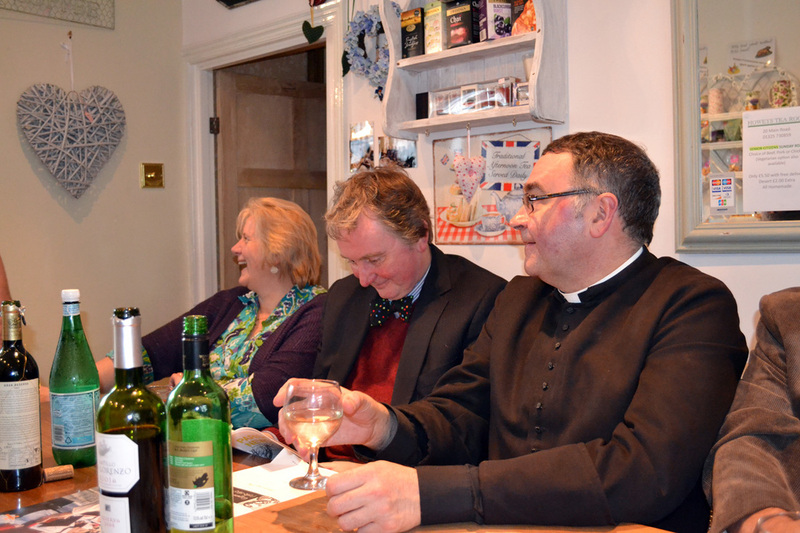 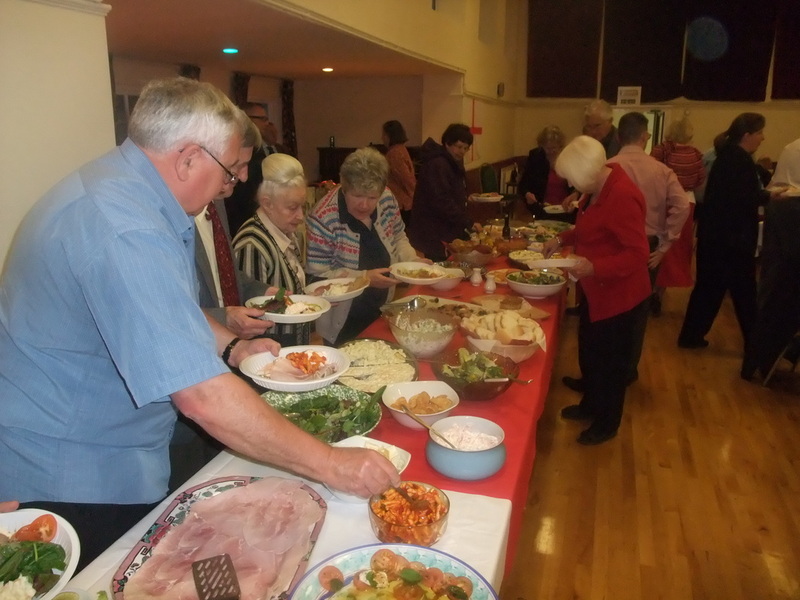 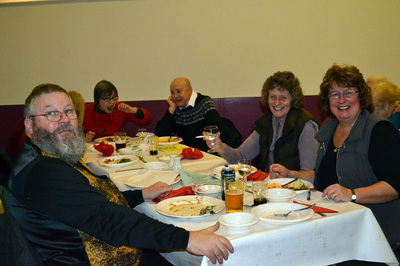 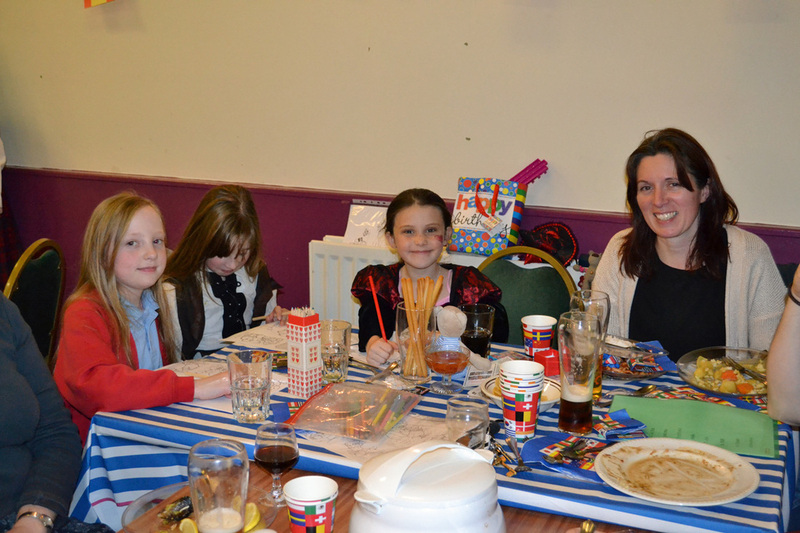 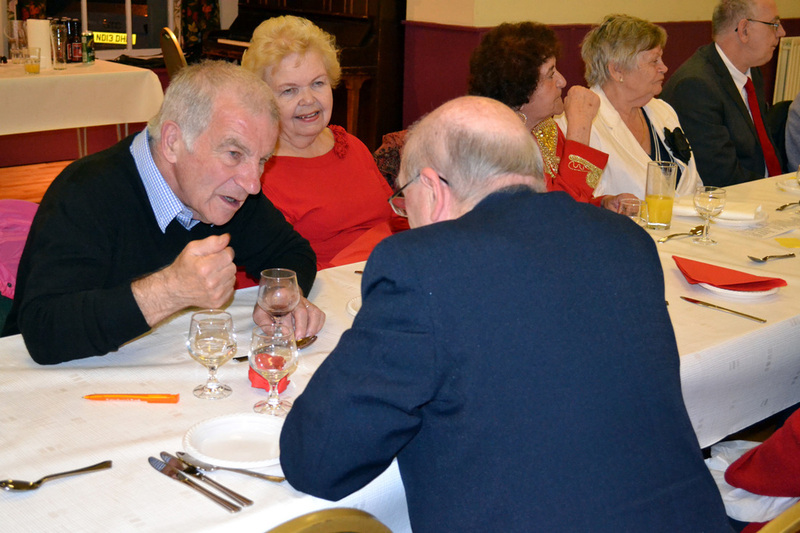 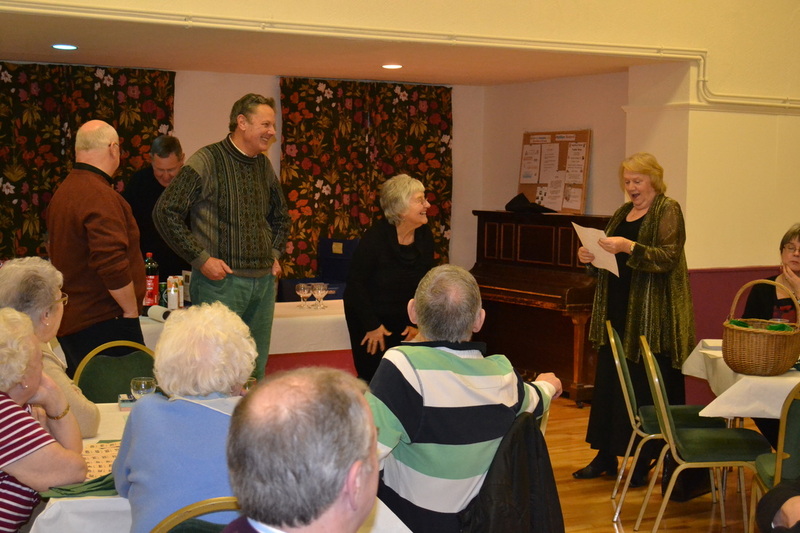 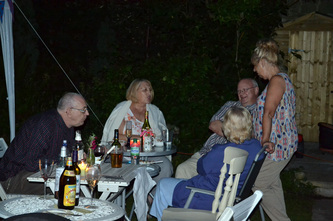 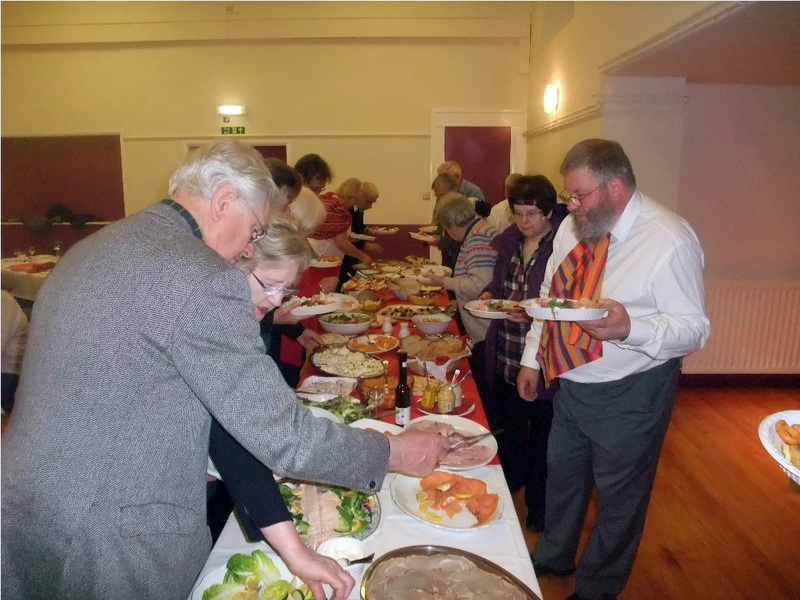 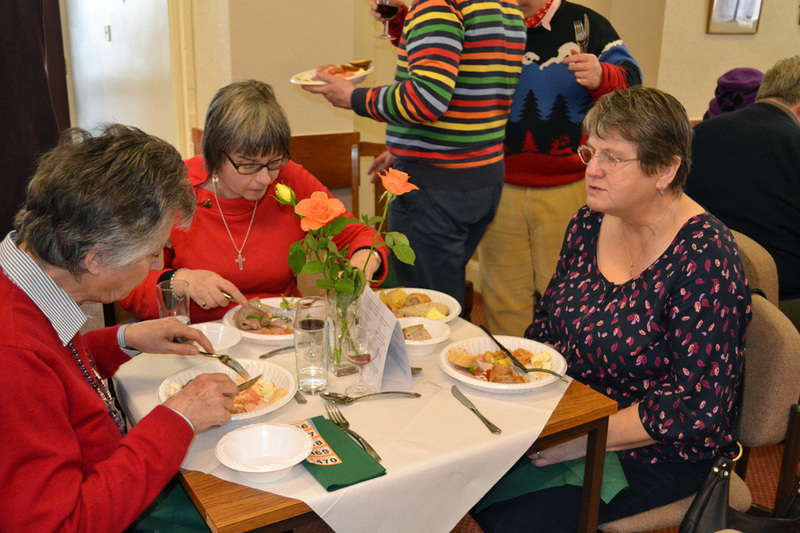 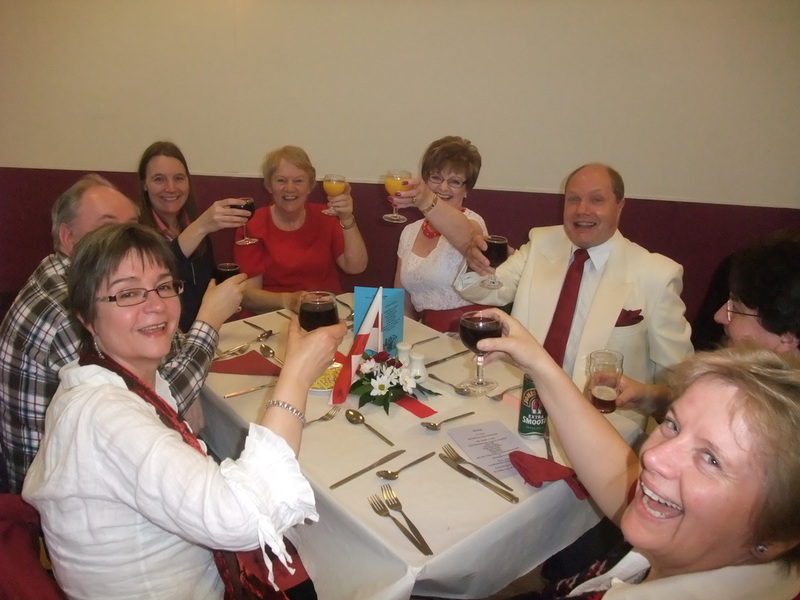 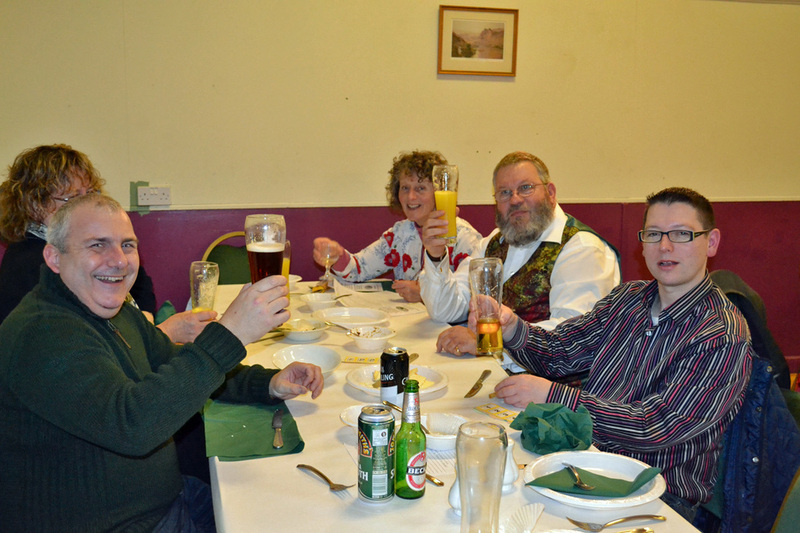 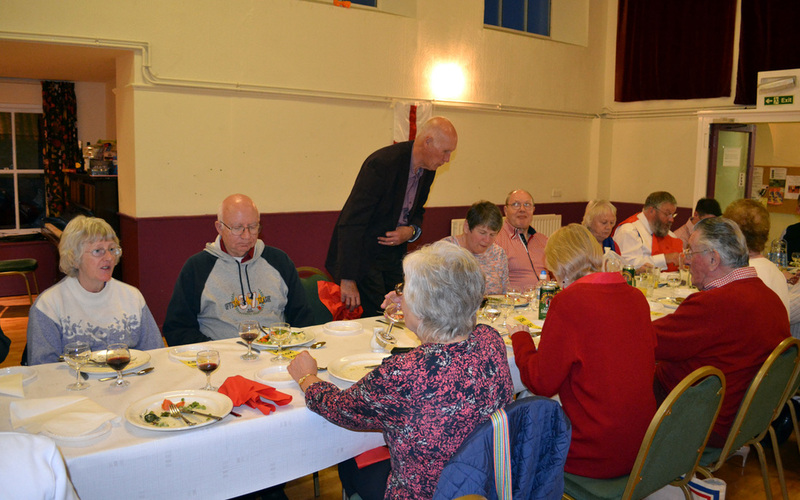 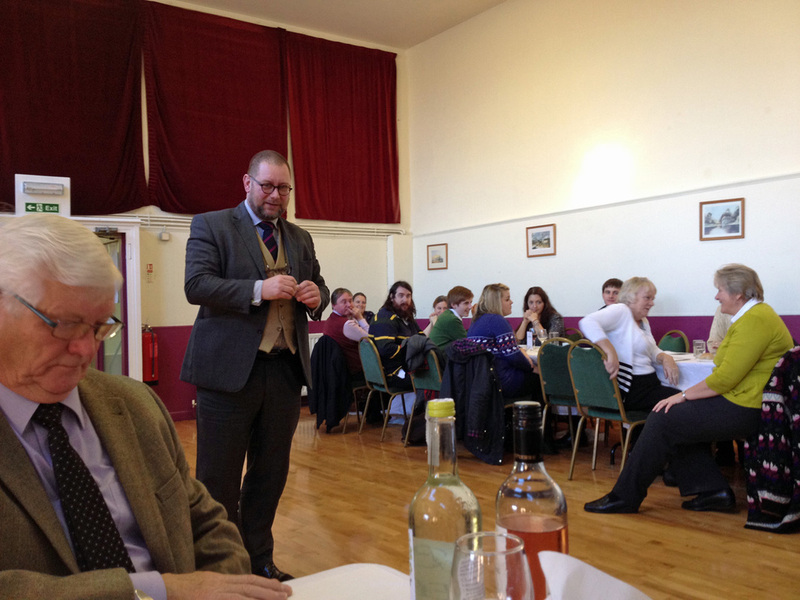 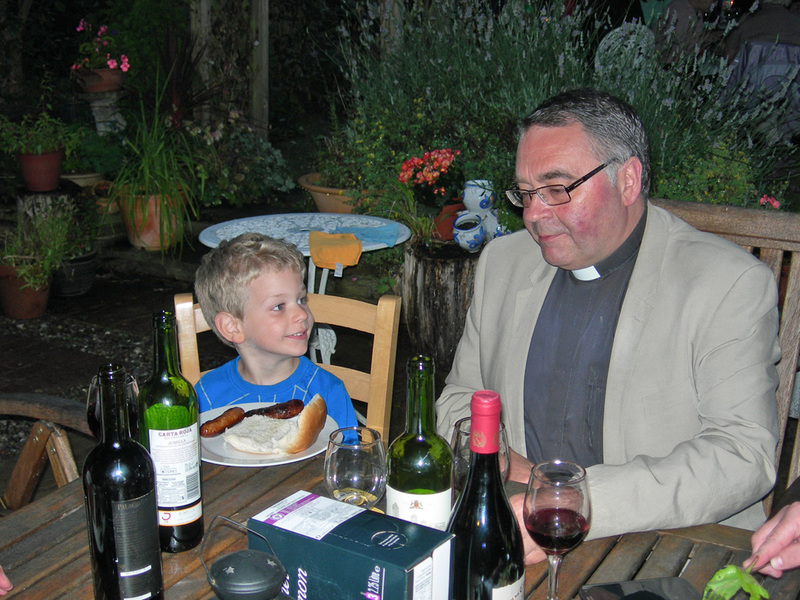 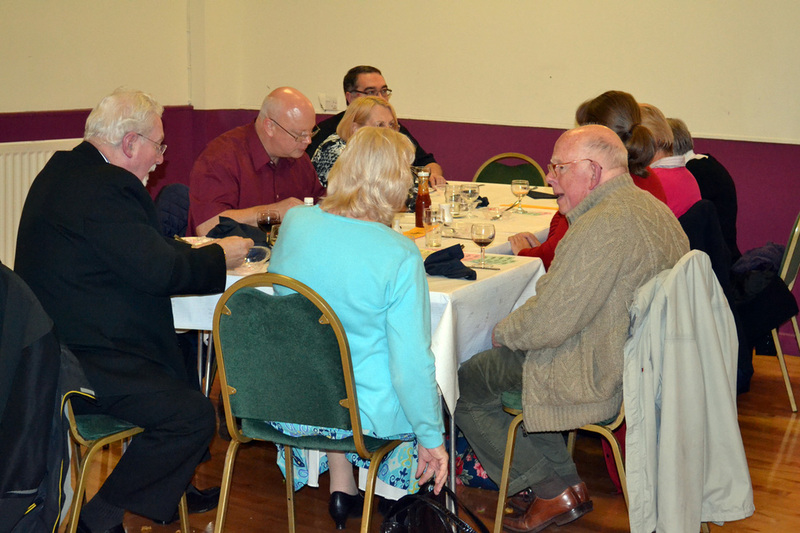 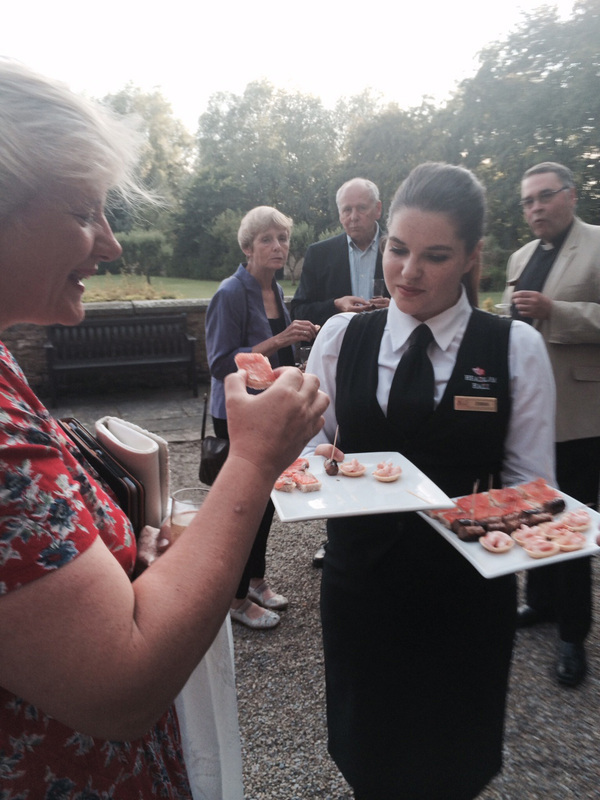 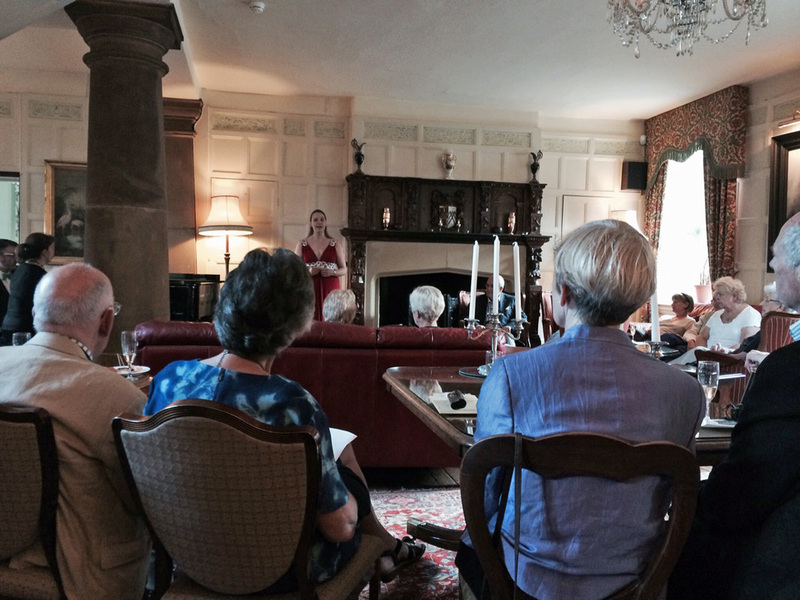 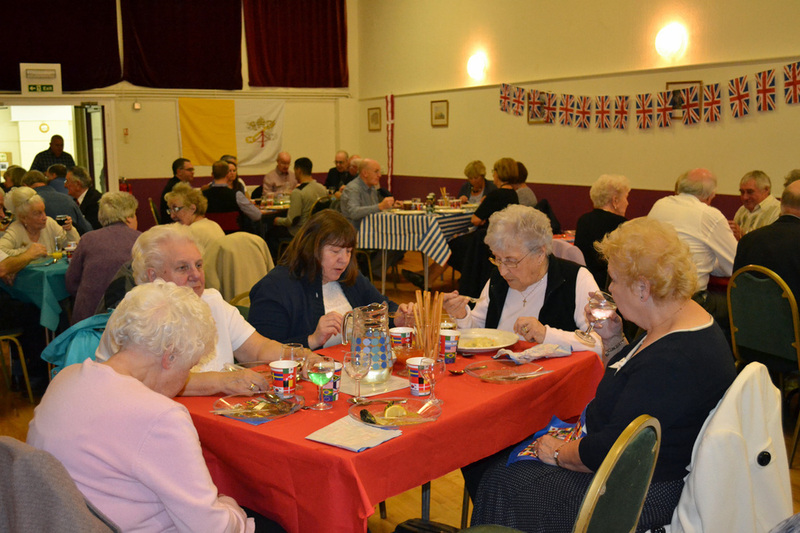 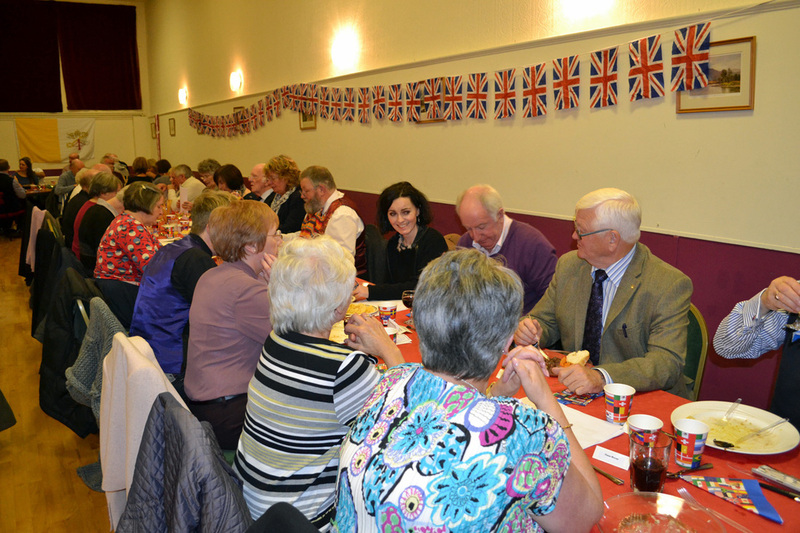 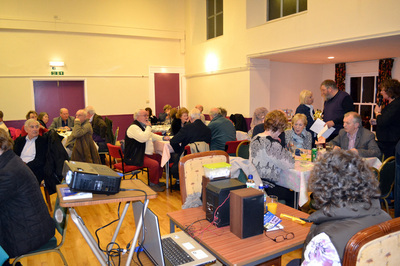 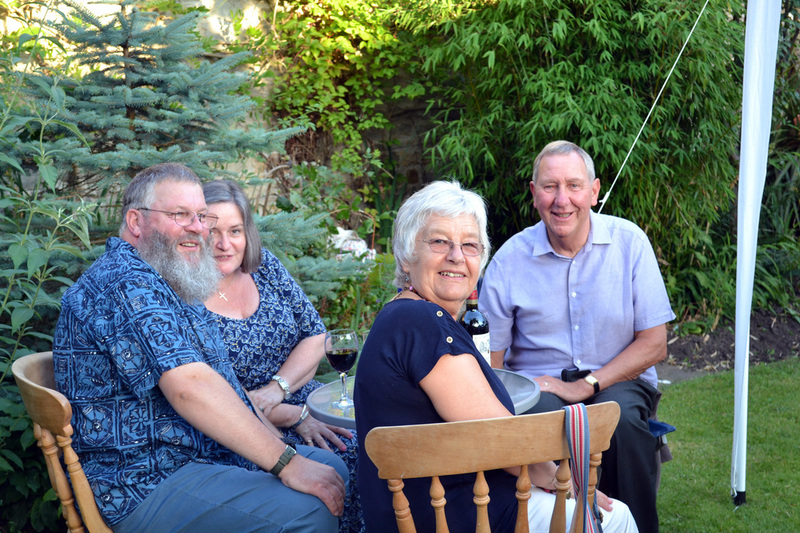 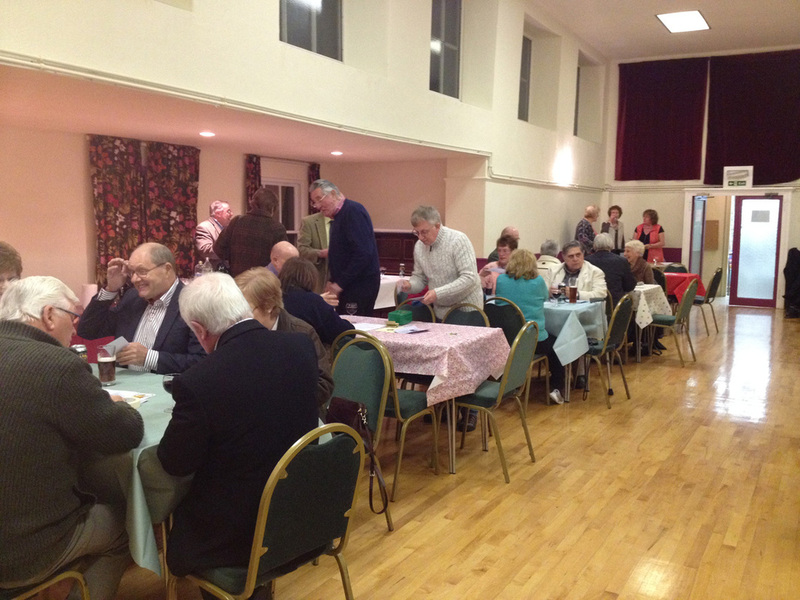 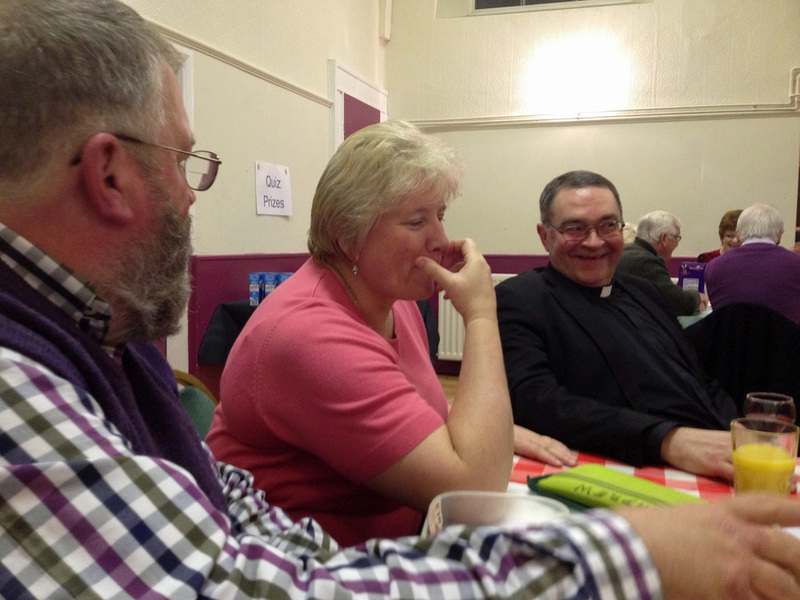 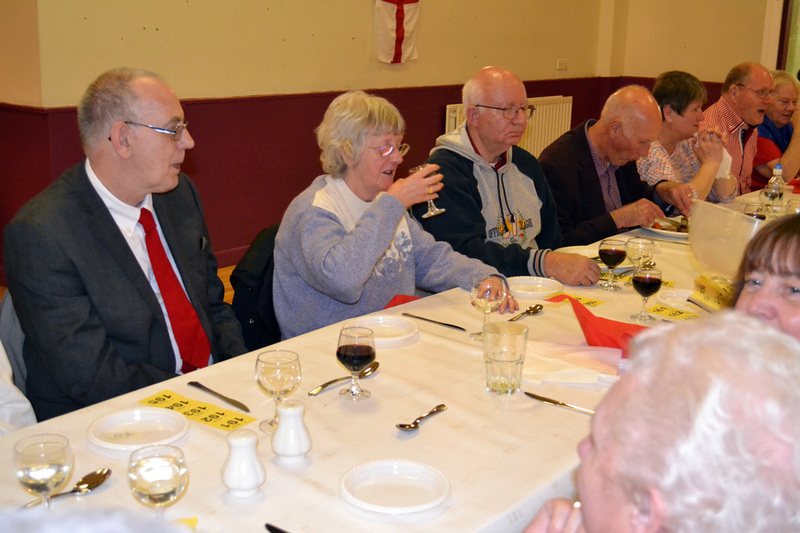 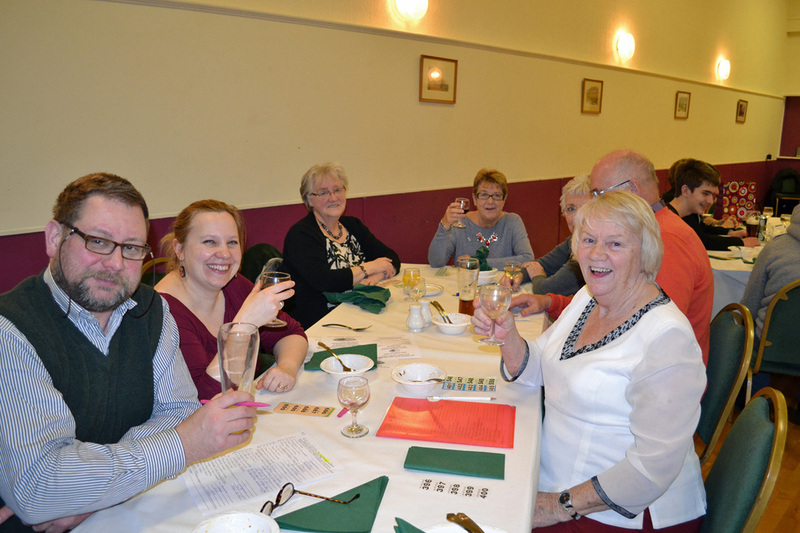 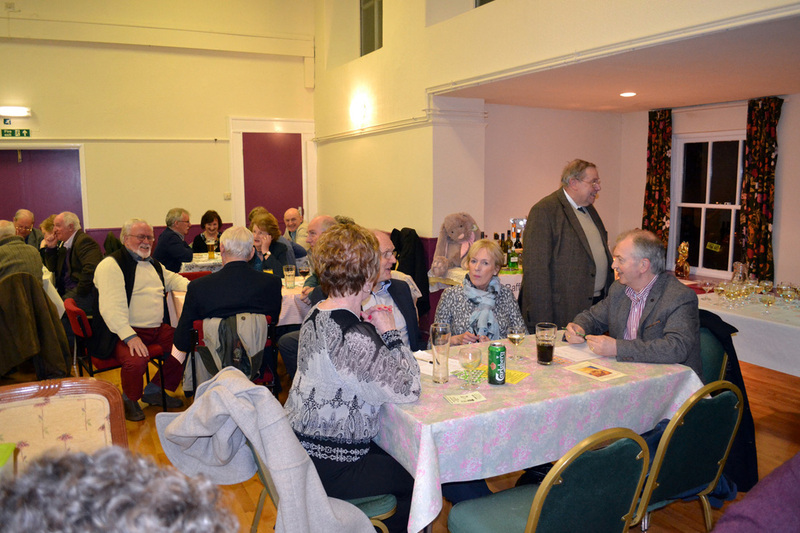 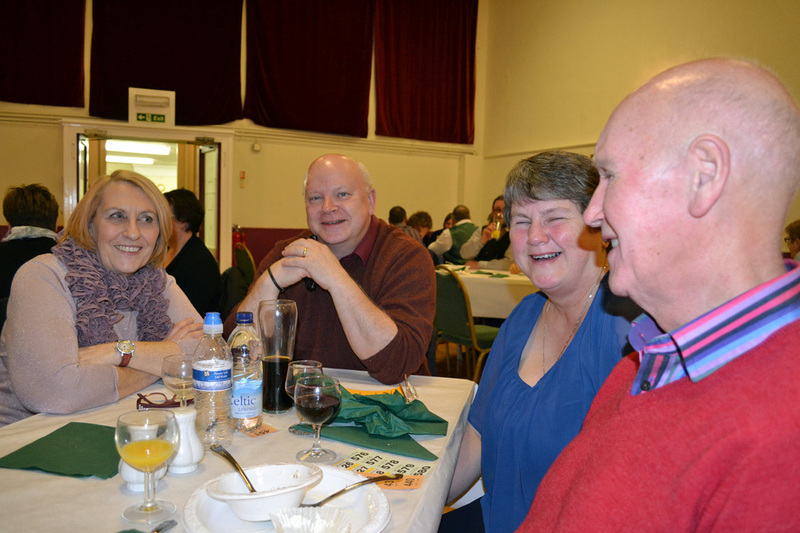 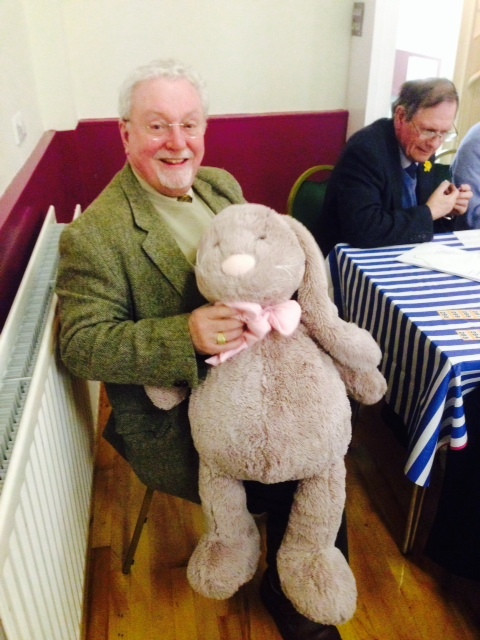 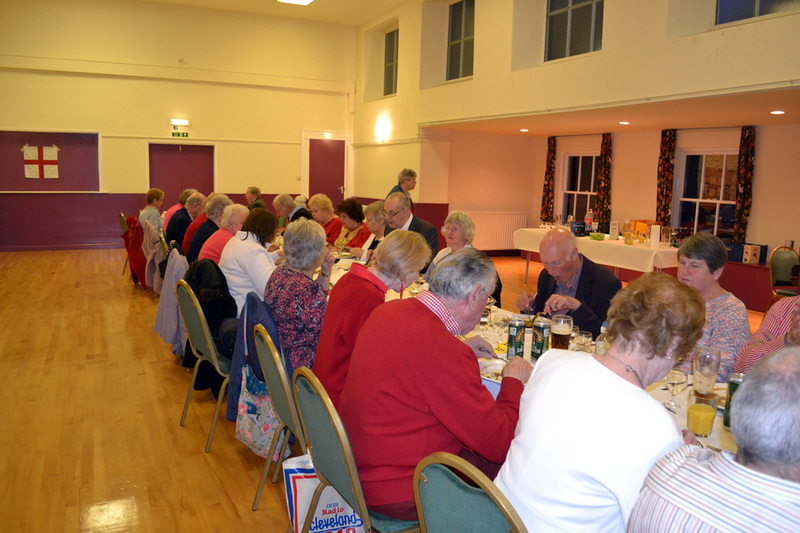 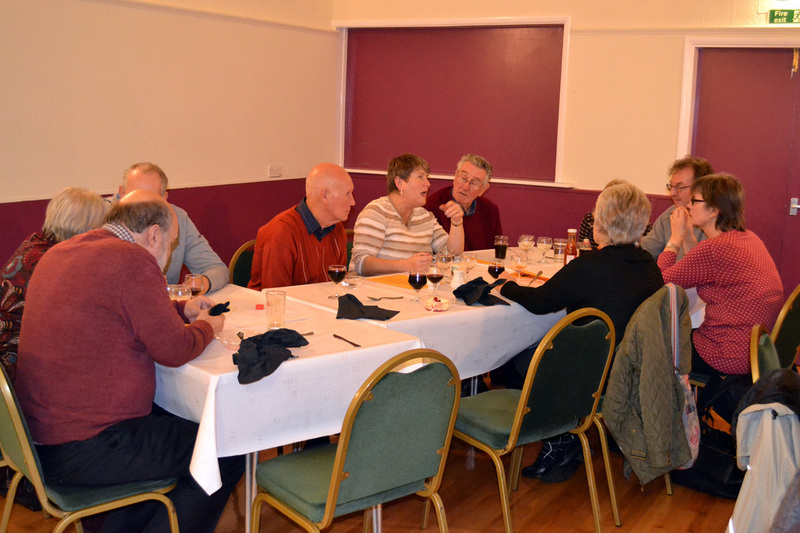 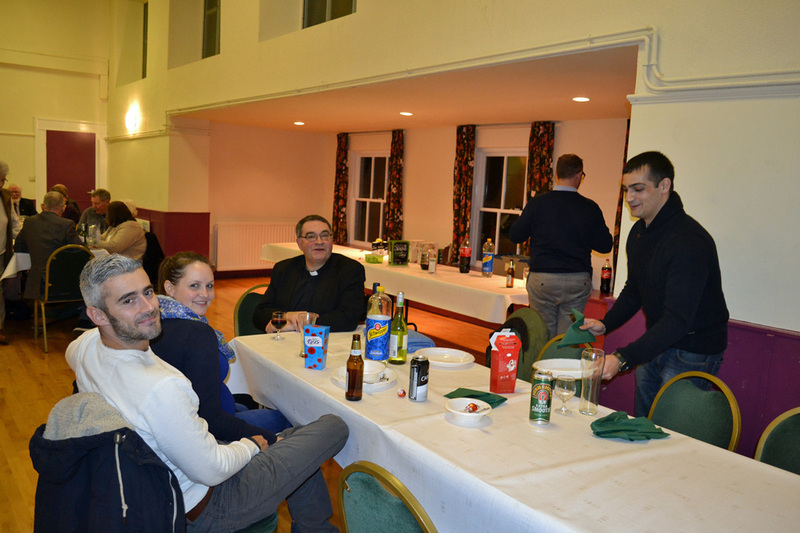 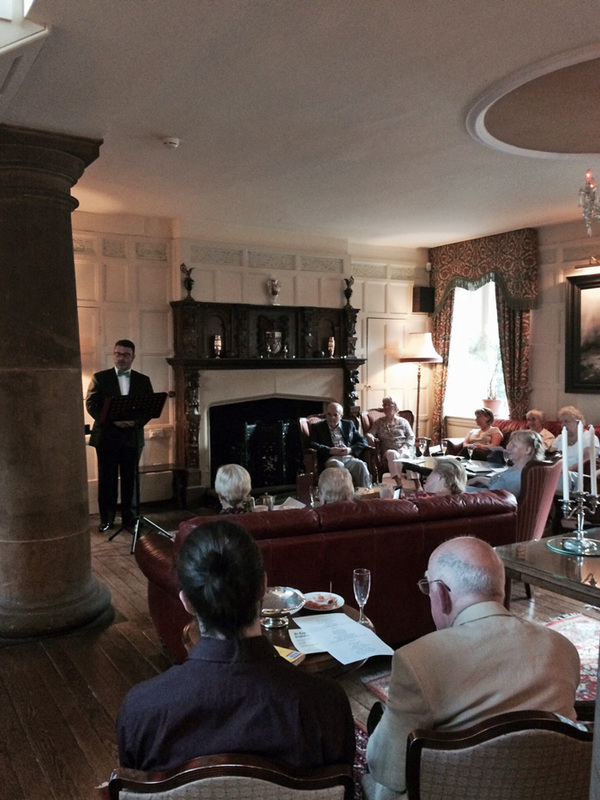 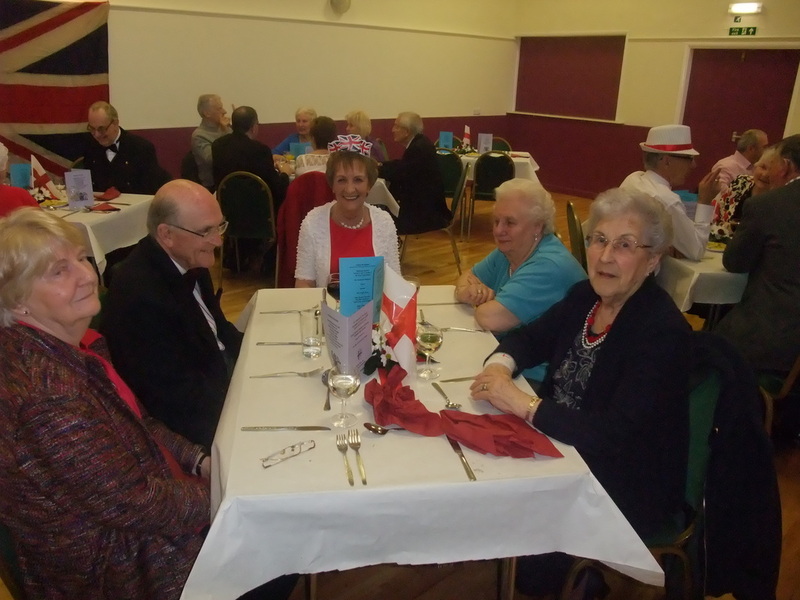 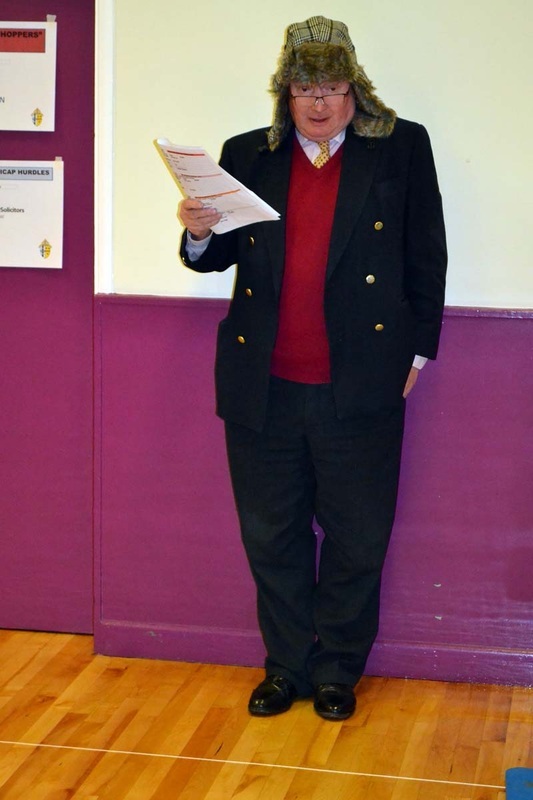 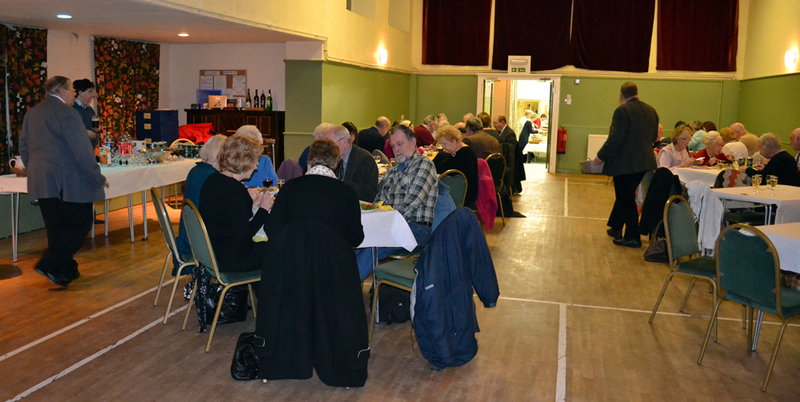 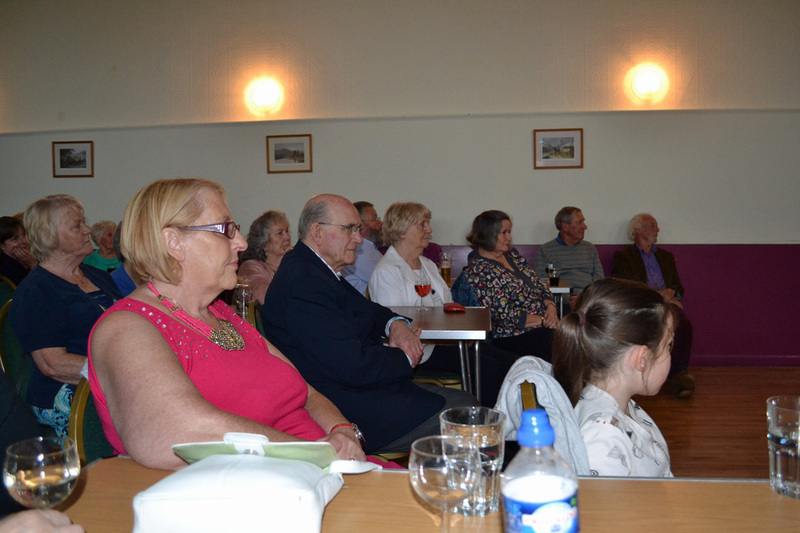 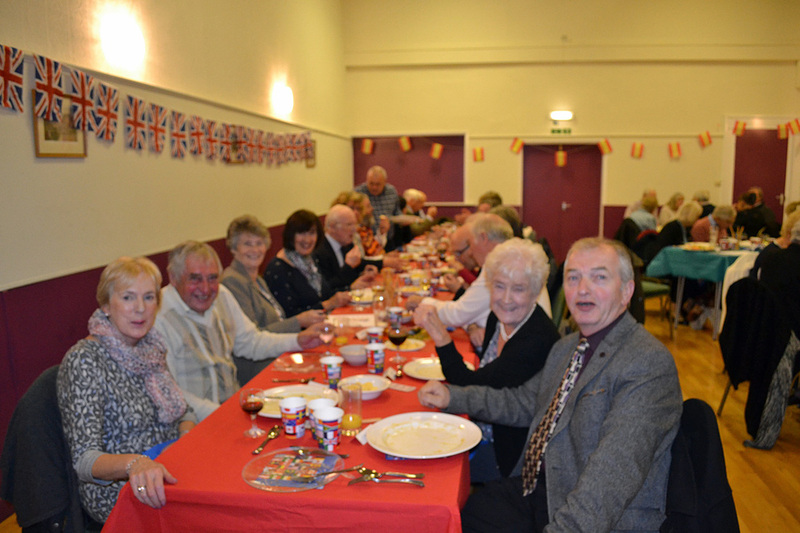 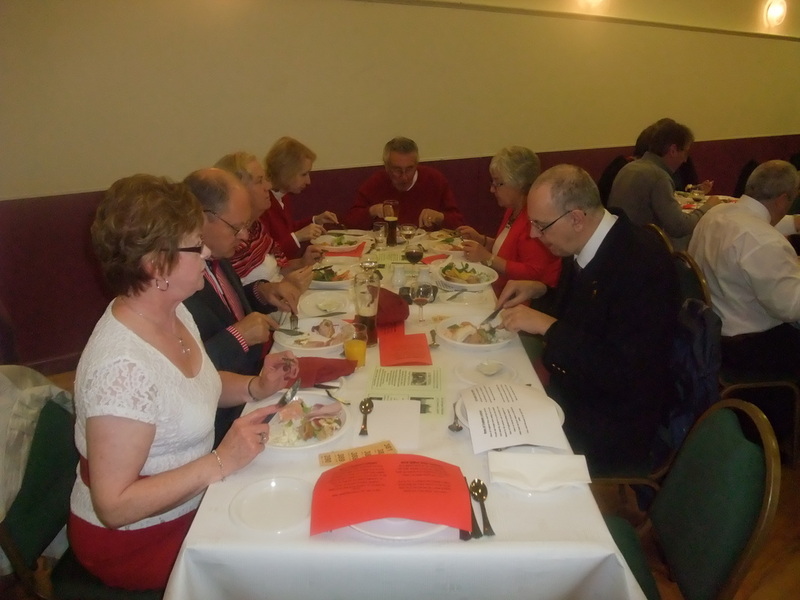 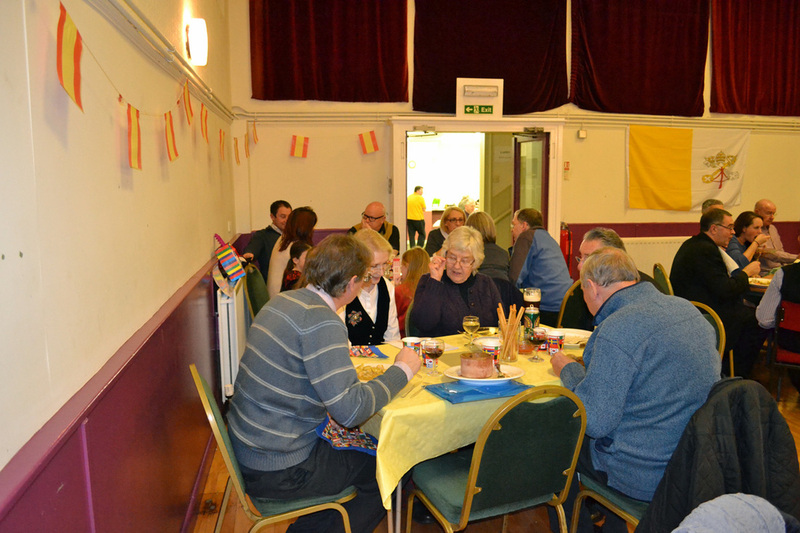 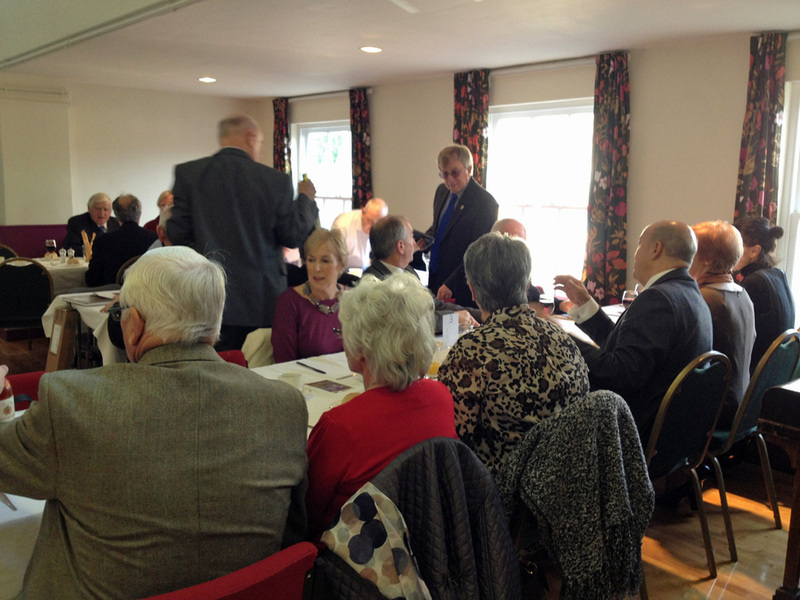 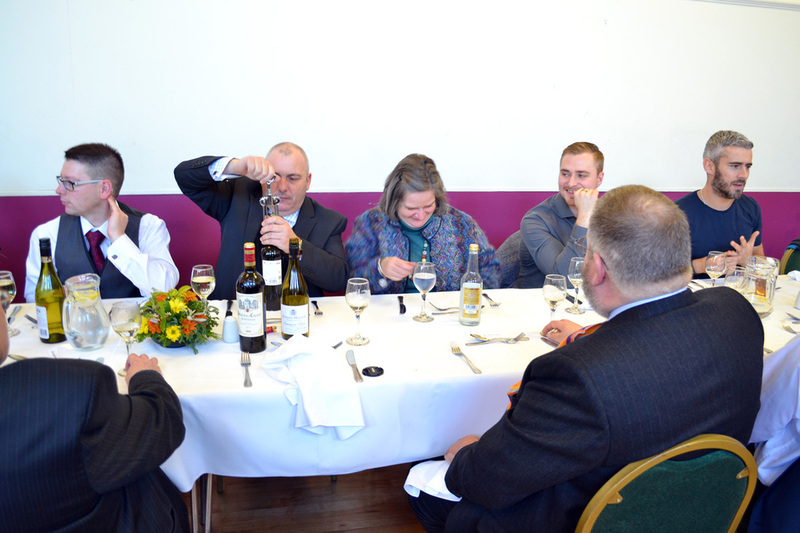 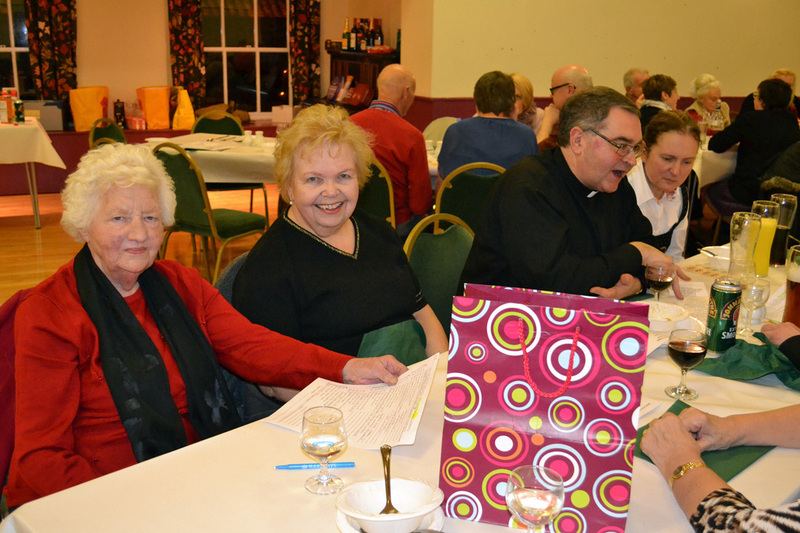 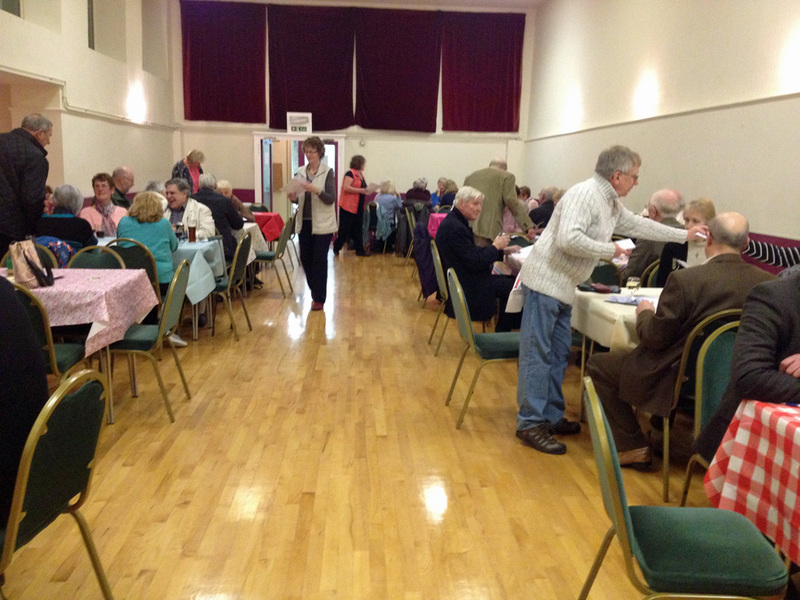 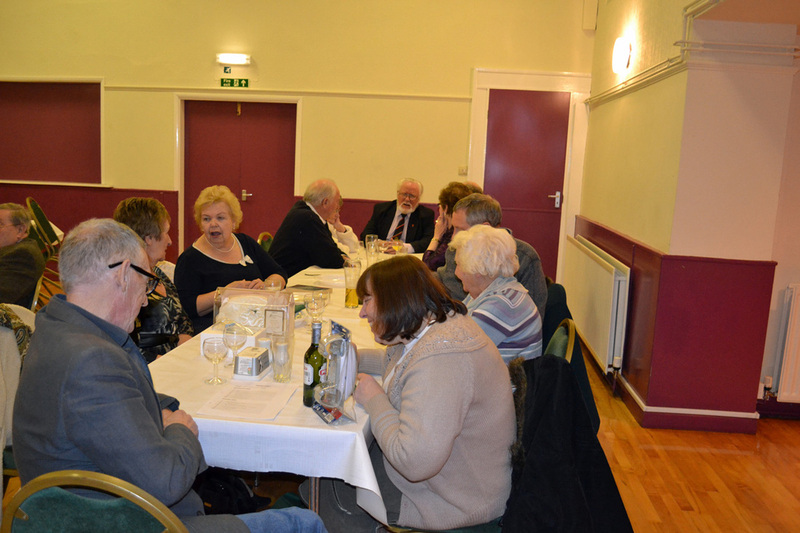 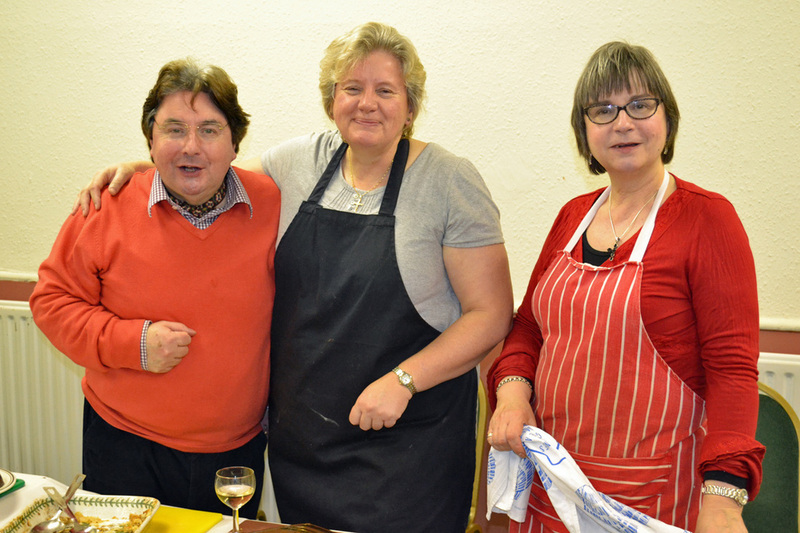 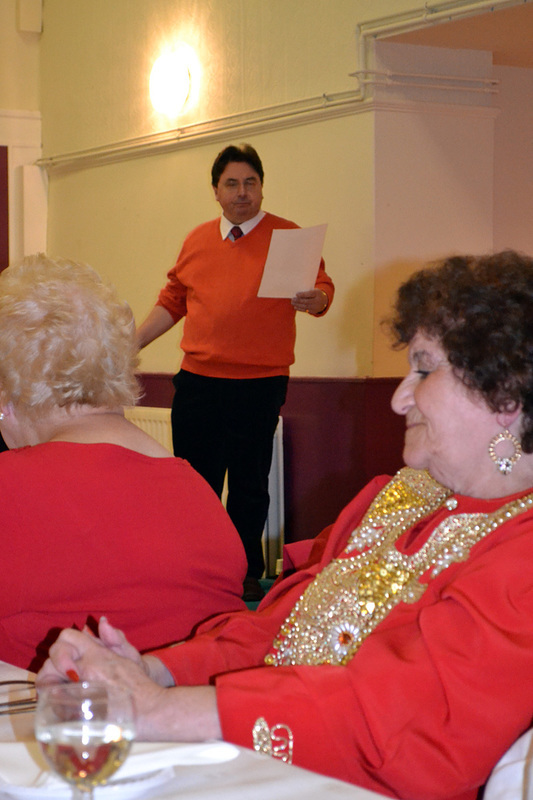 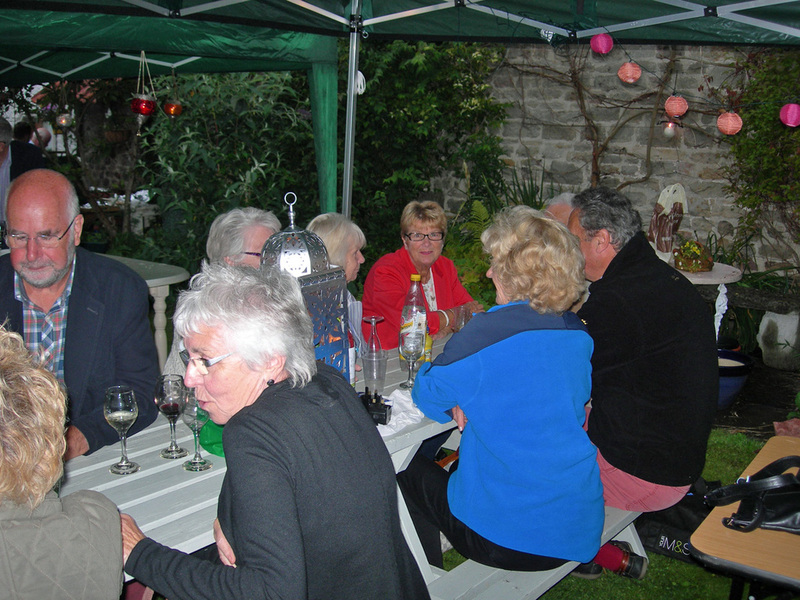 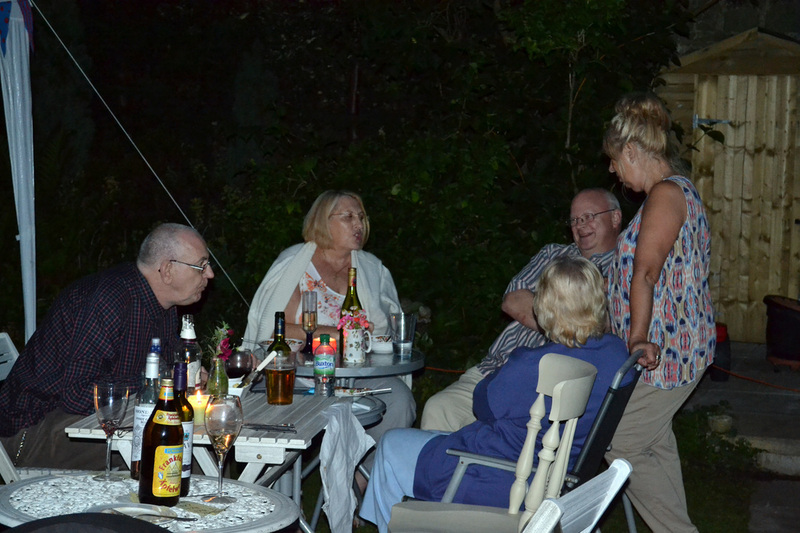 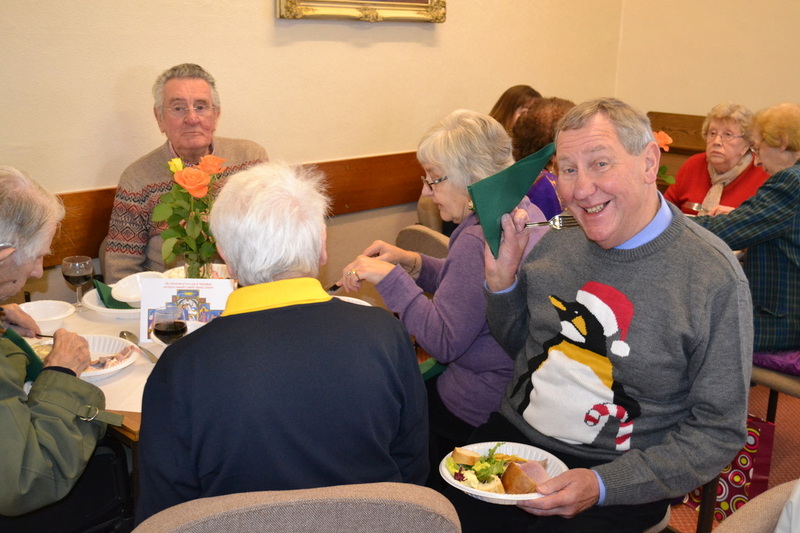 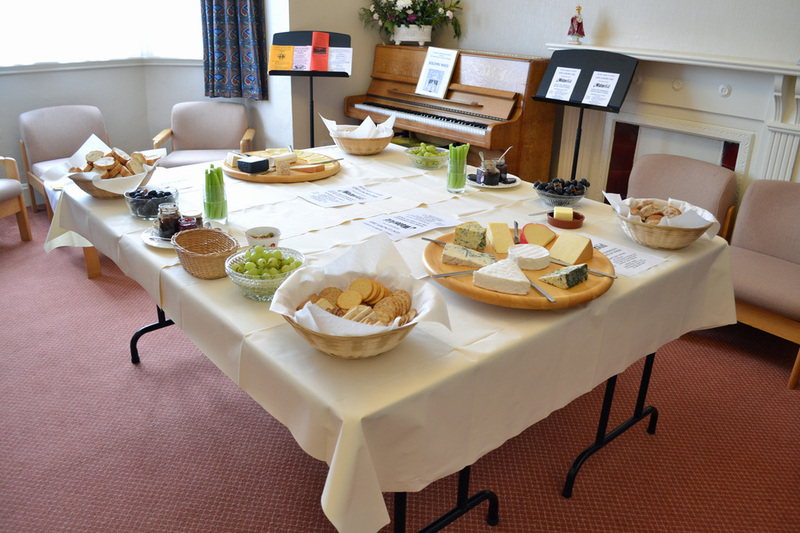 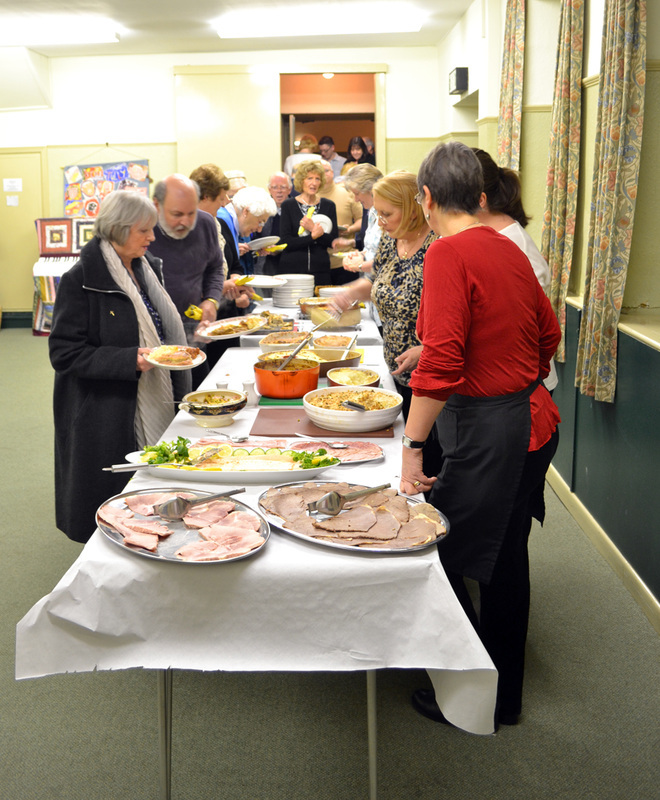 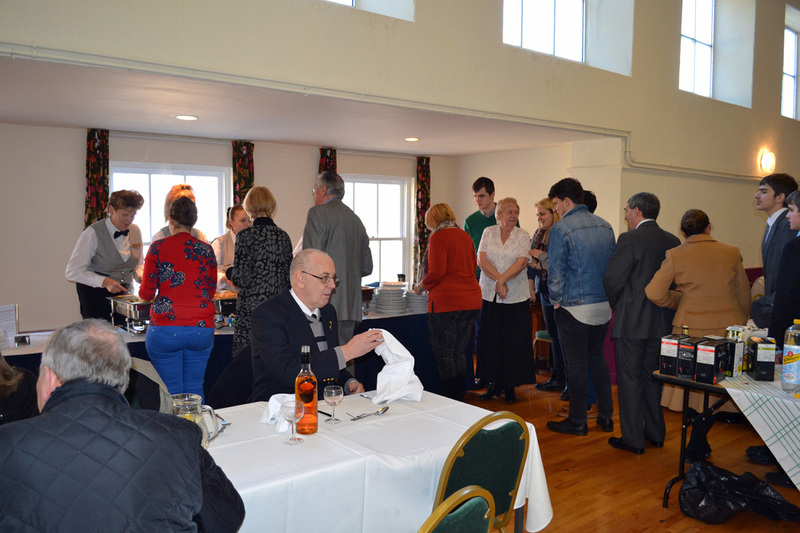 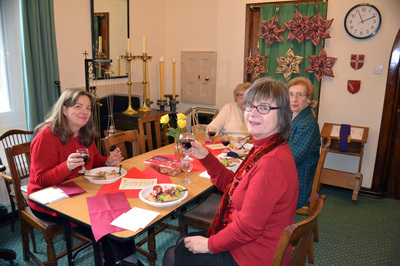 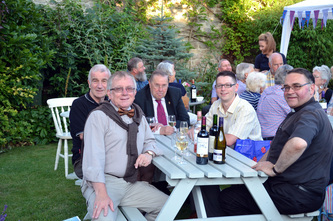 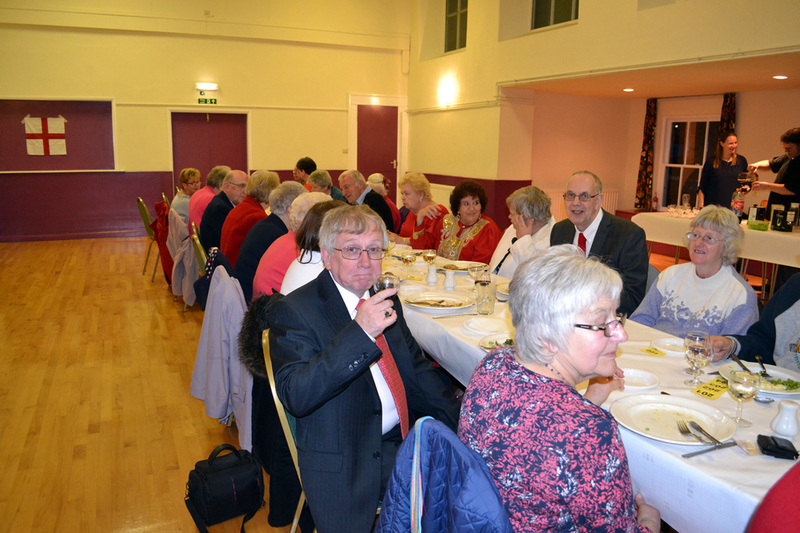 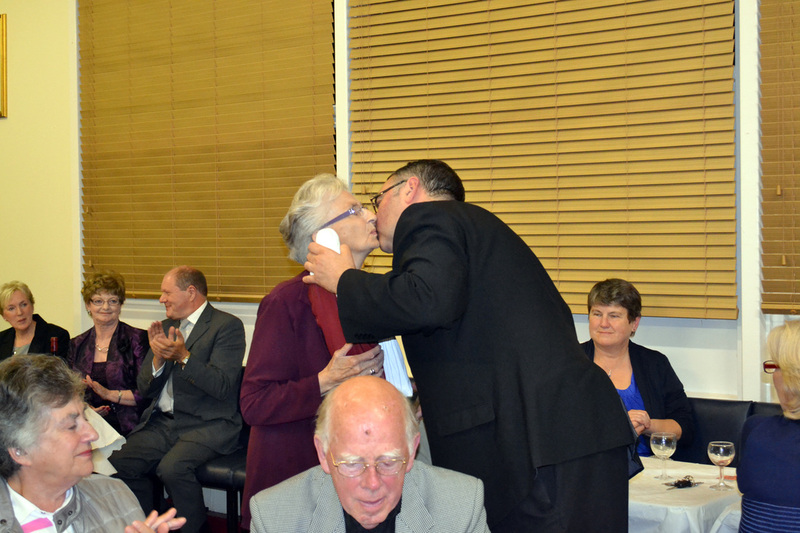 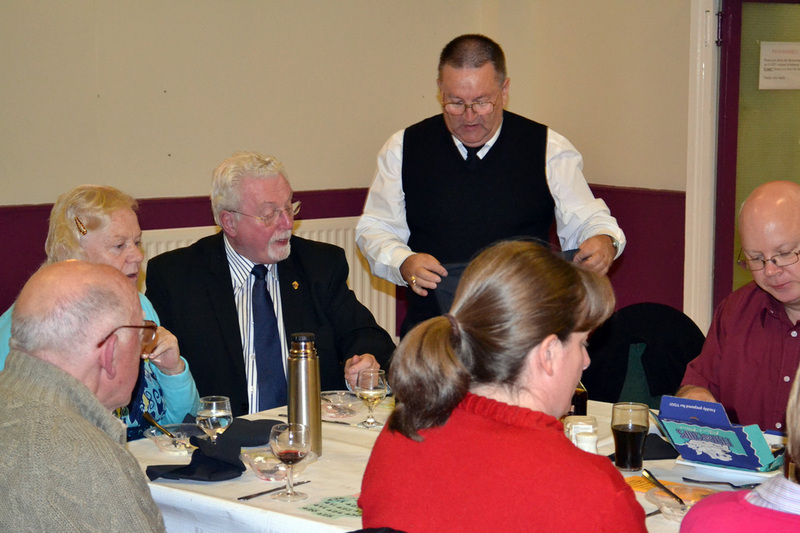 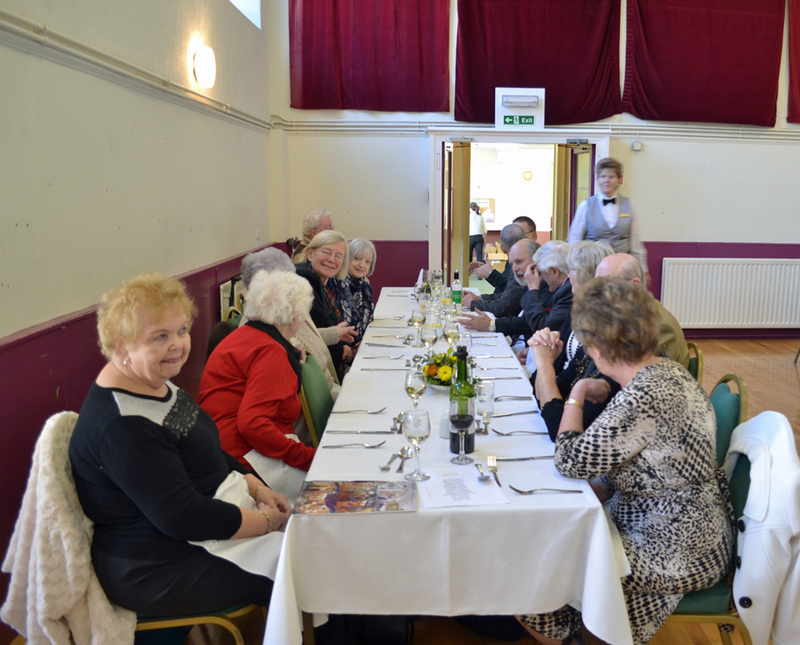 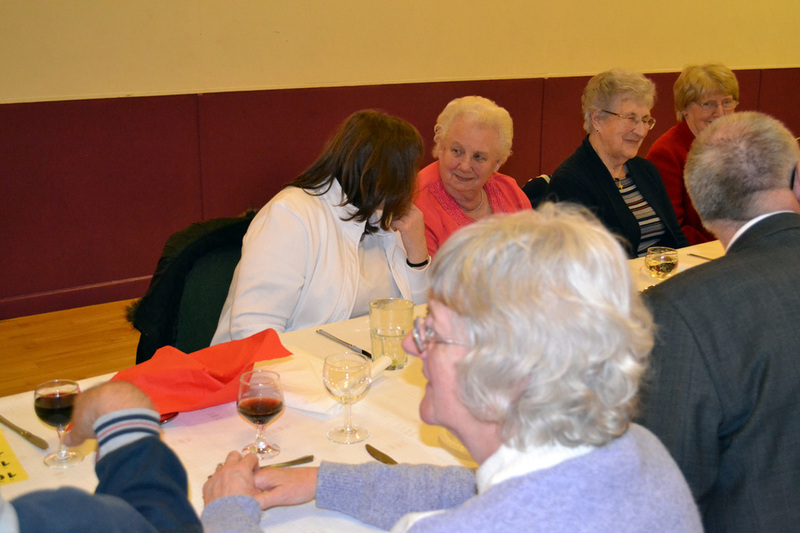 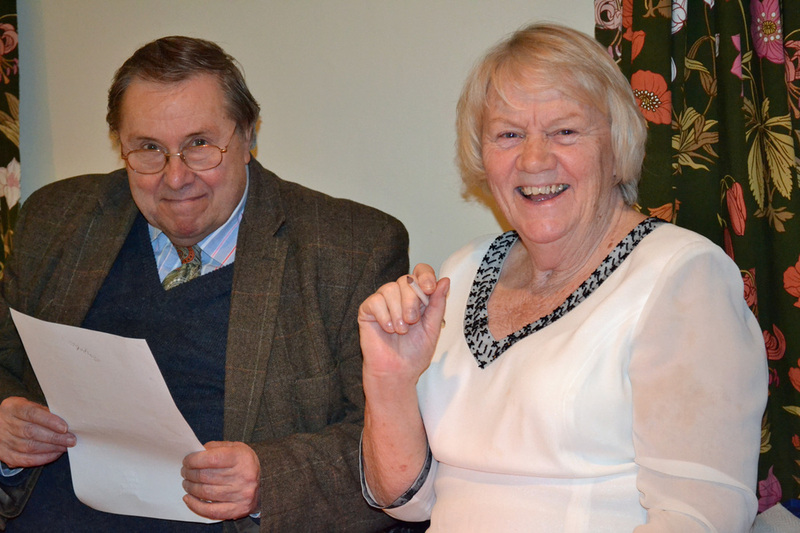 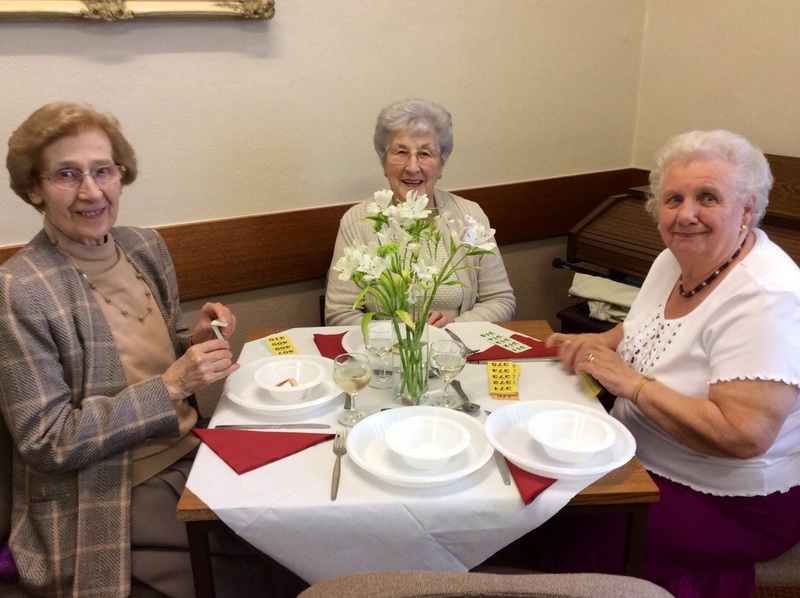 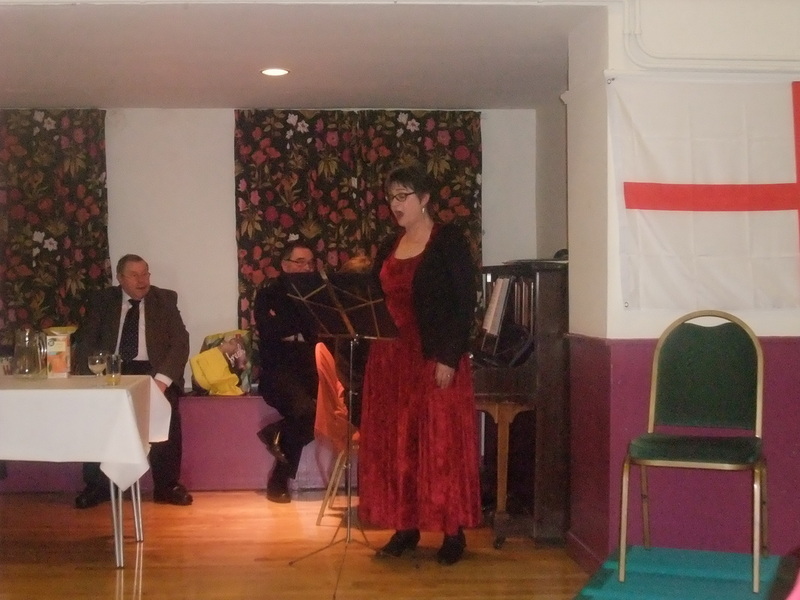 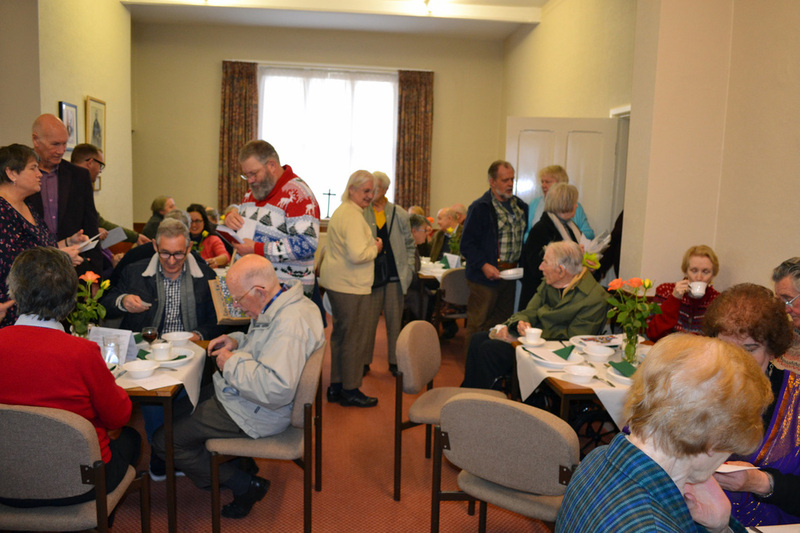 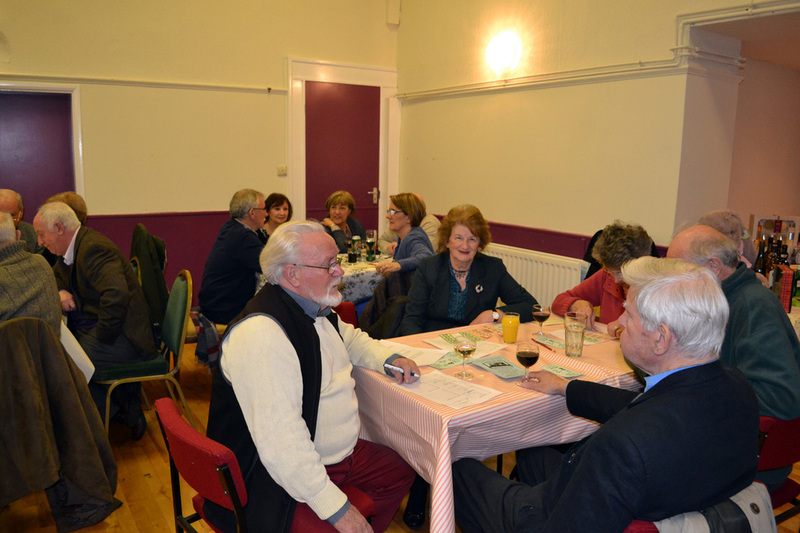 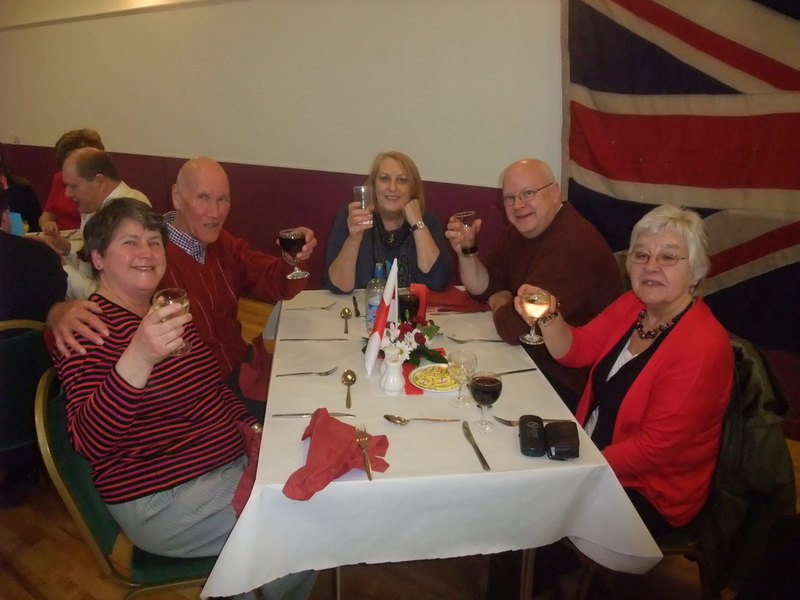 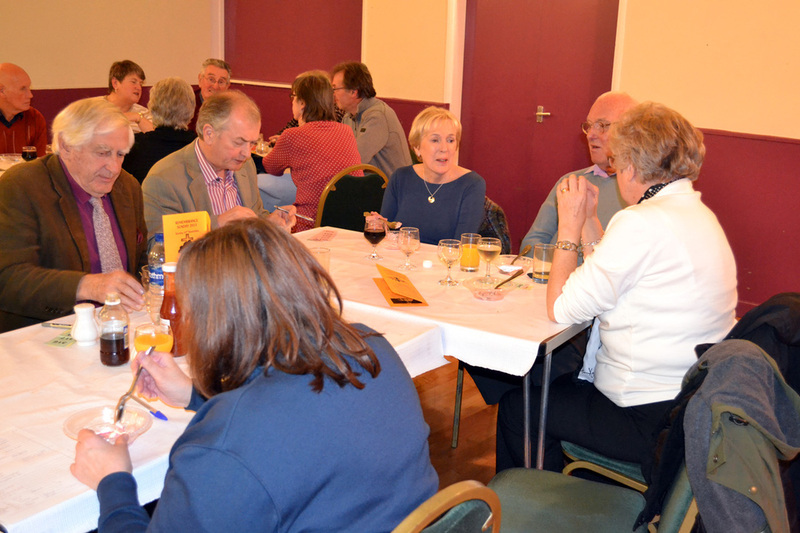 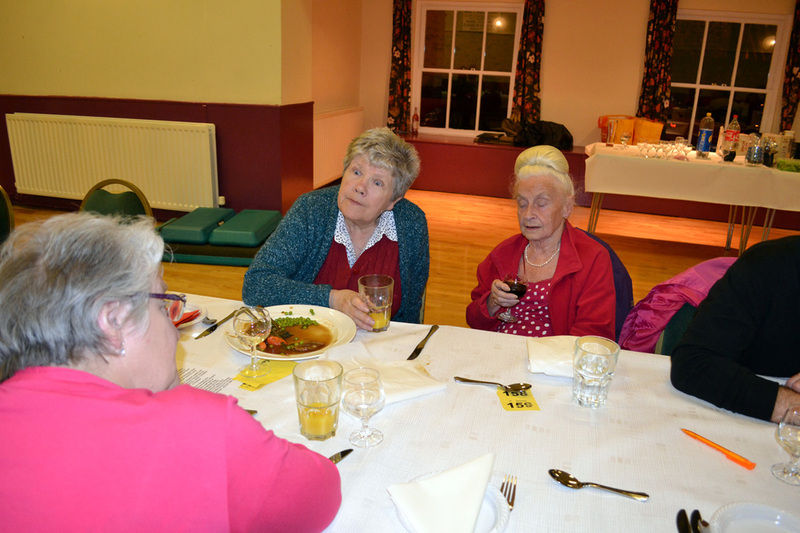 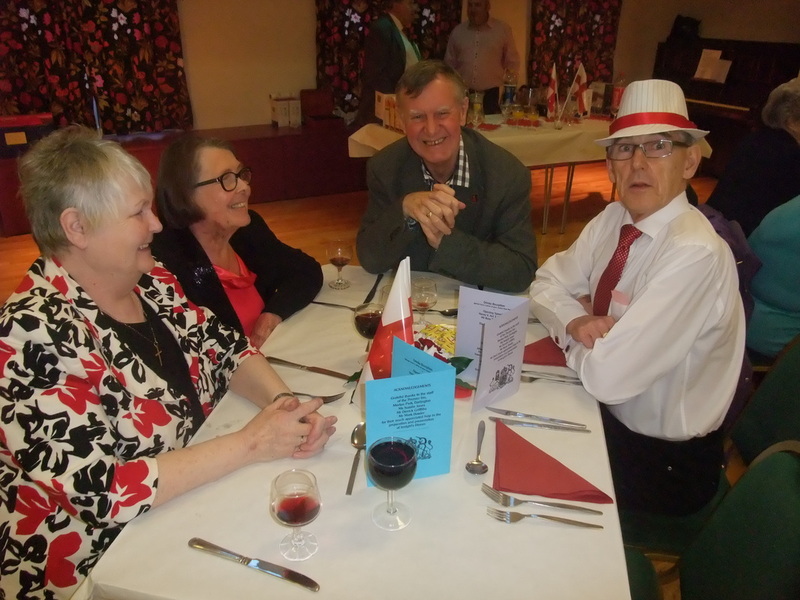 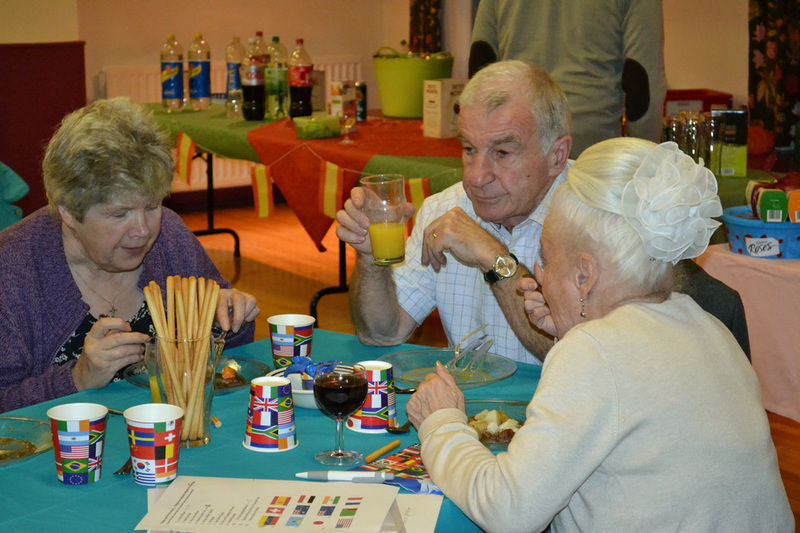 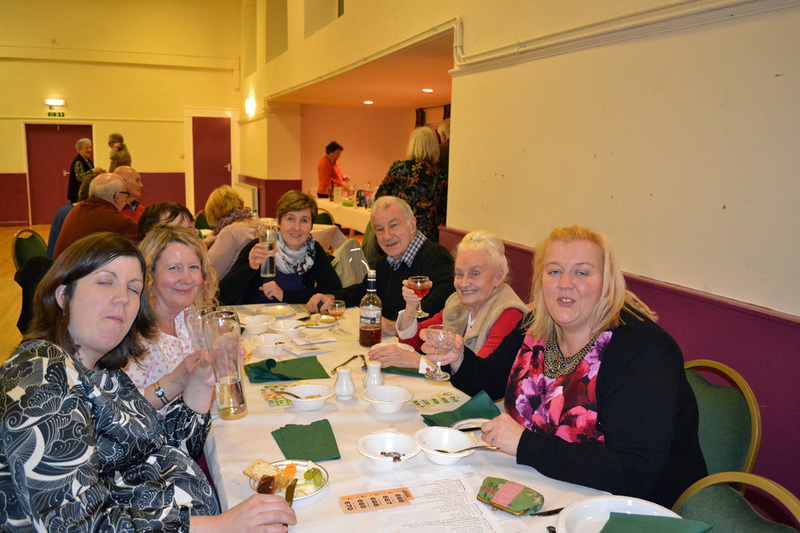 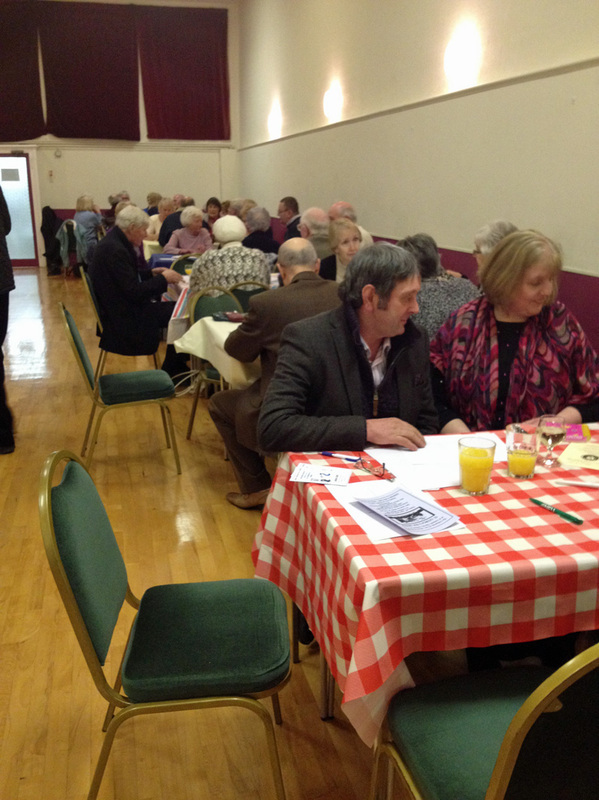 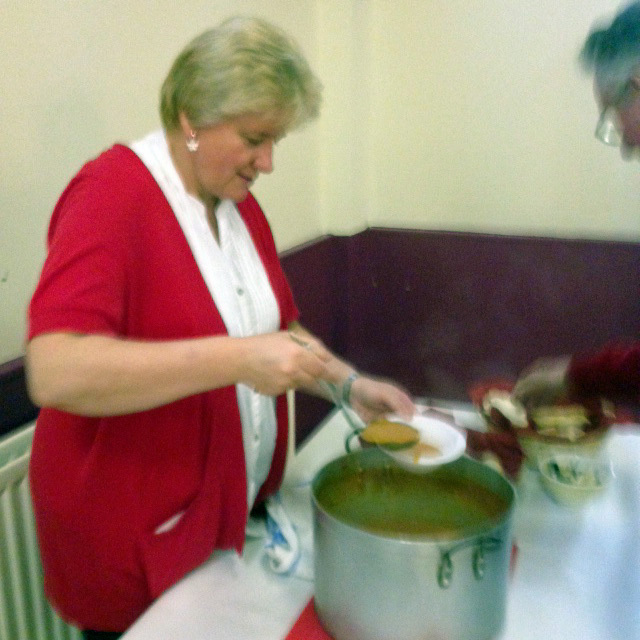 Ninety guests enjoyed a challenging quiz, a hot supper and good company. 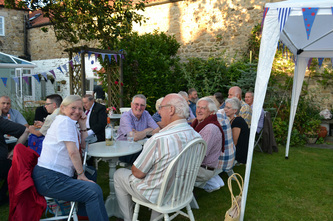 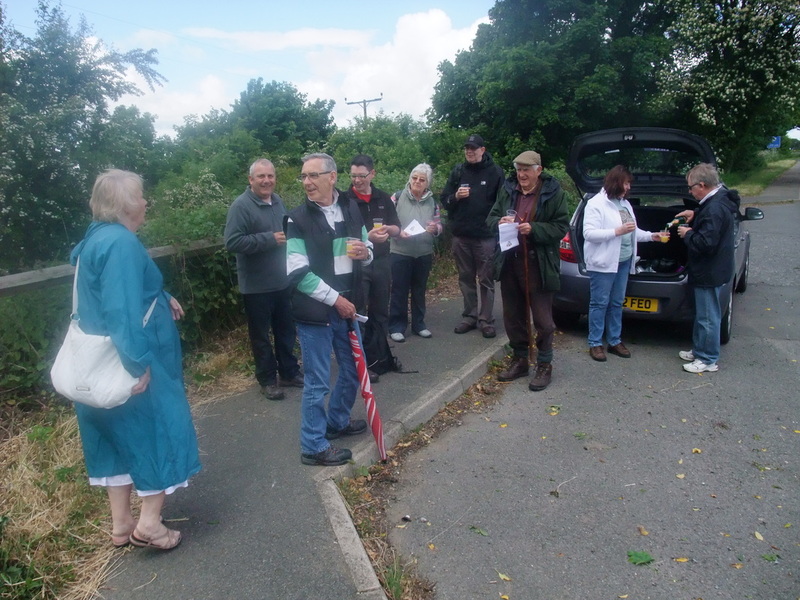 We made £1,305 profit, many thanks to all who gave their support. 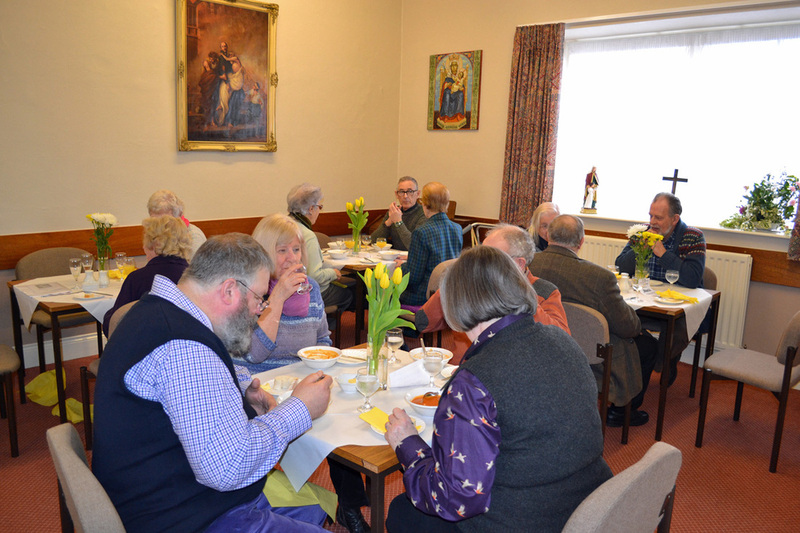 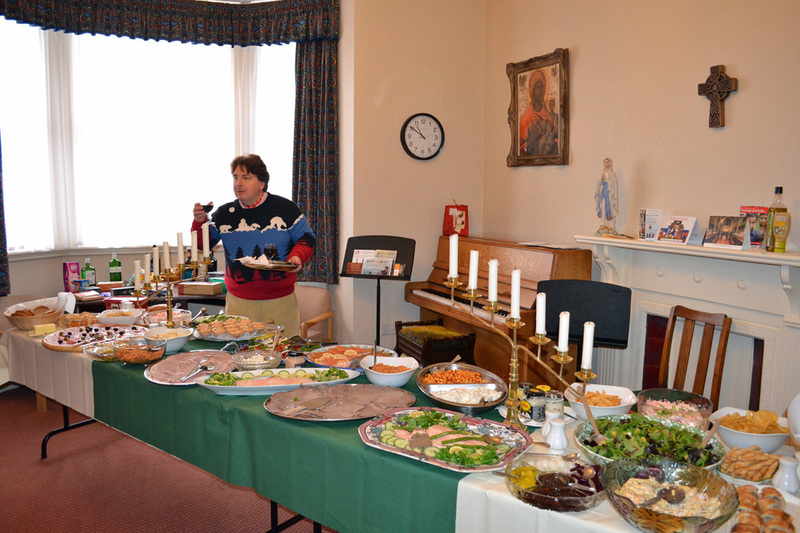 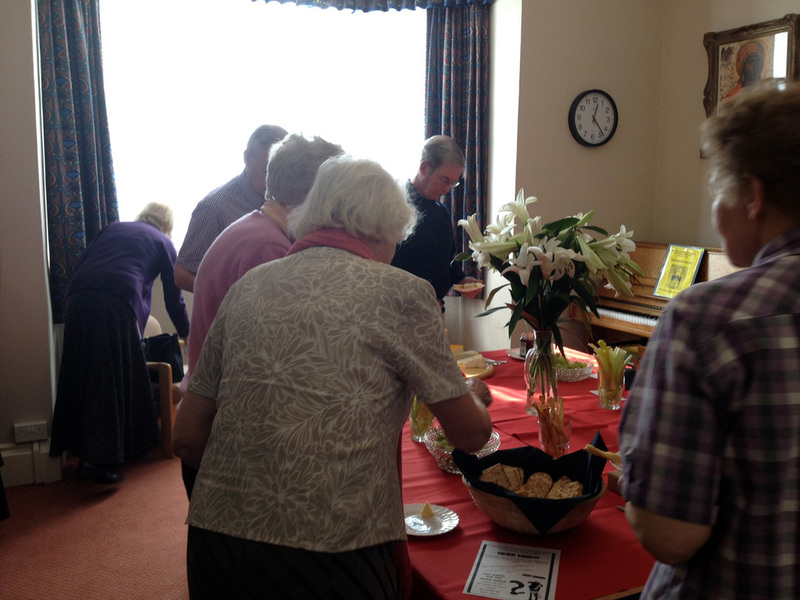 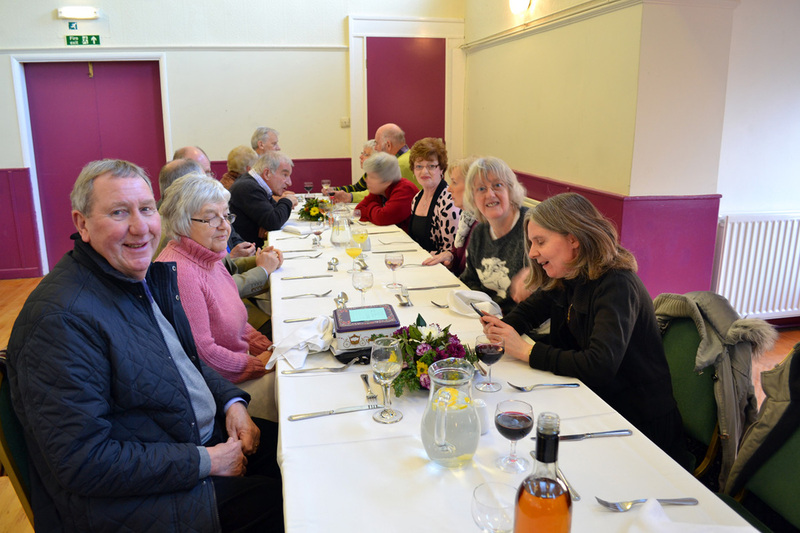 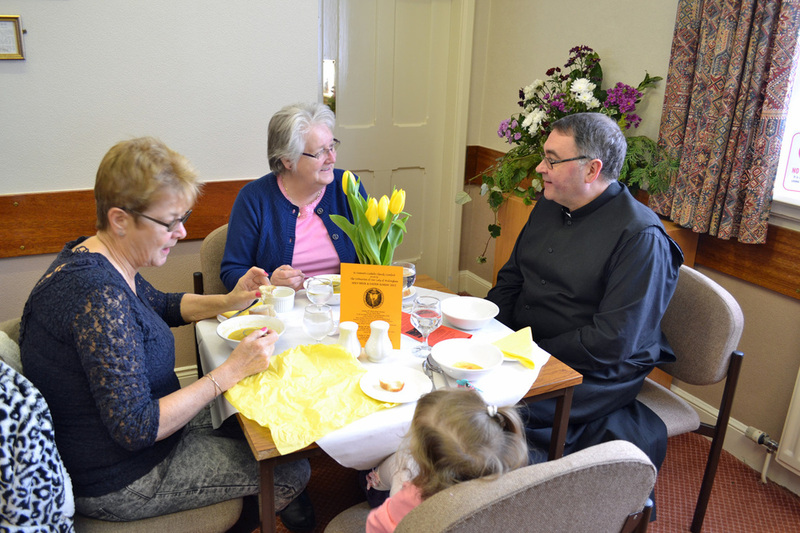 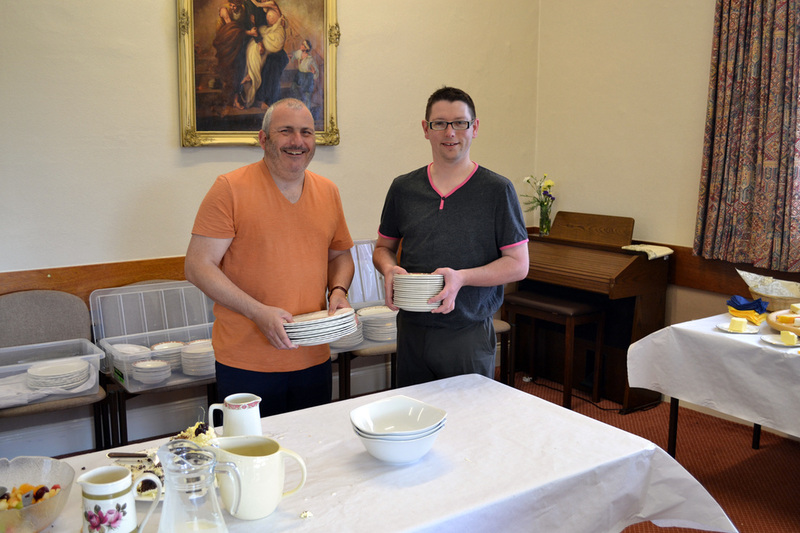 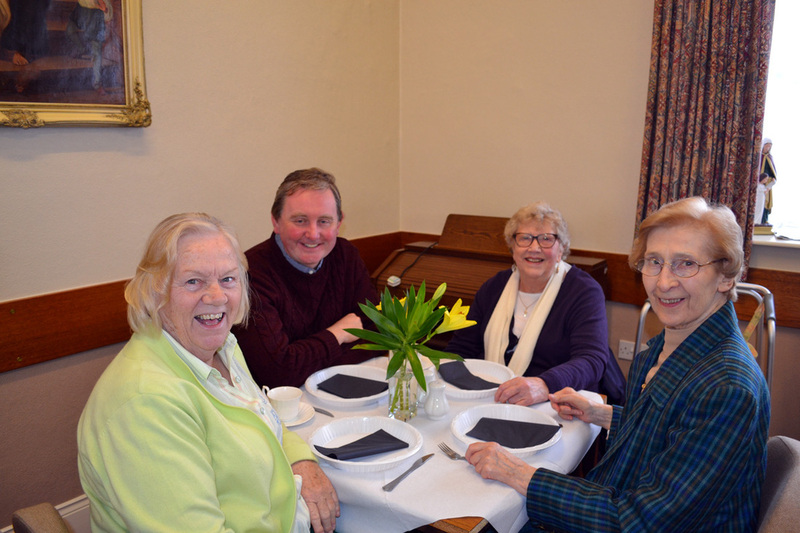 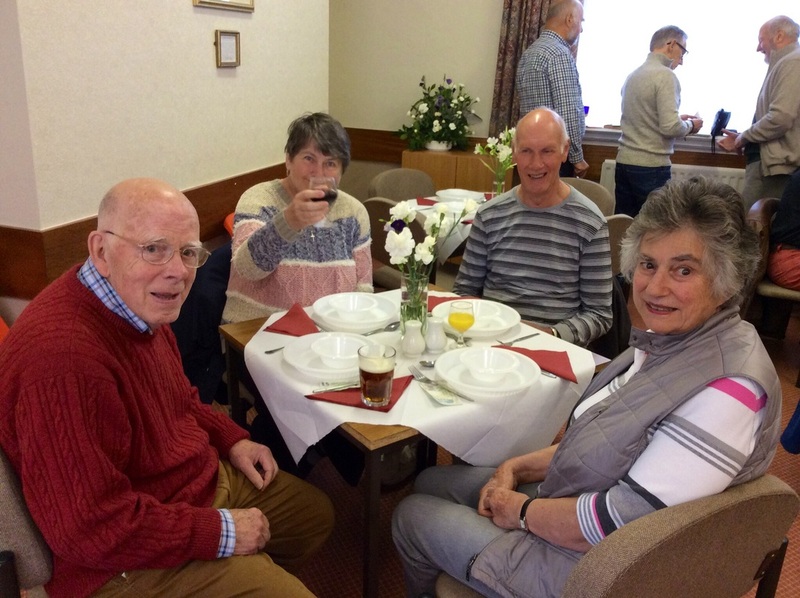 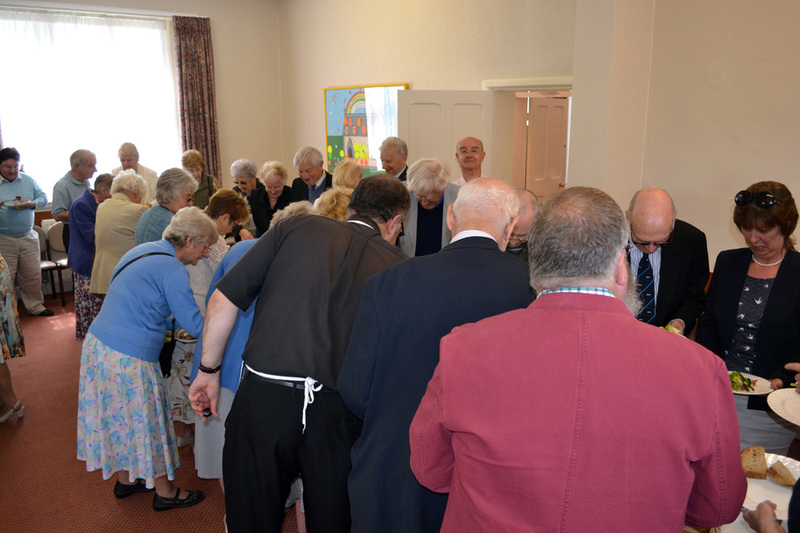 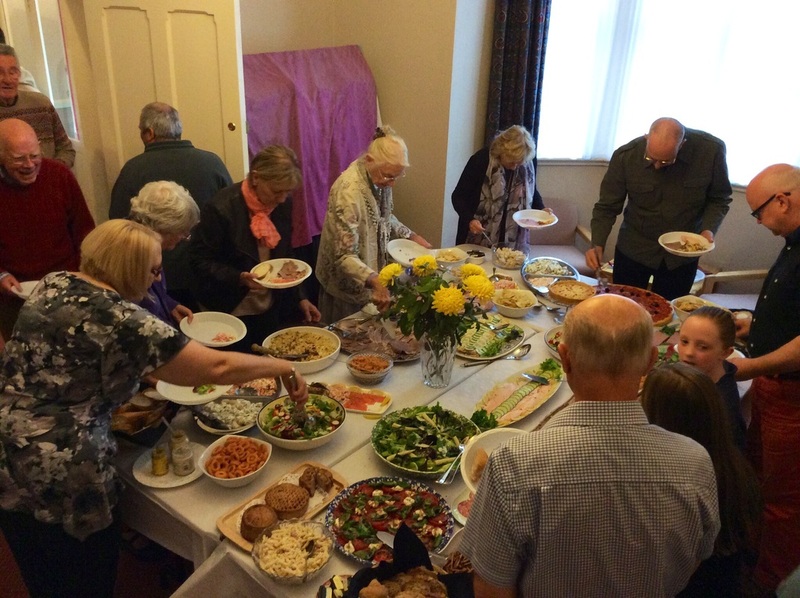 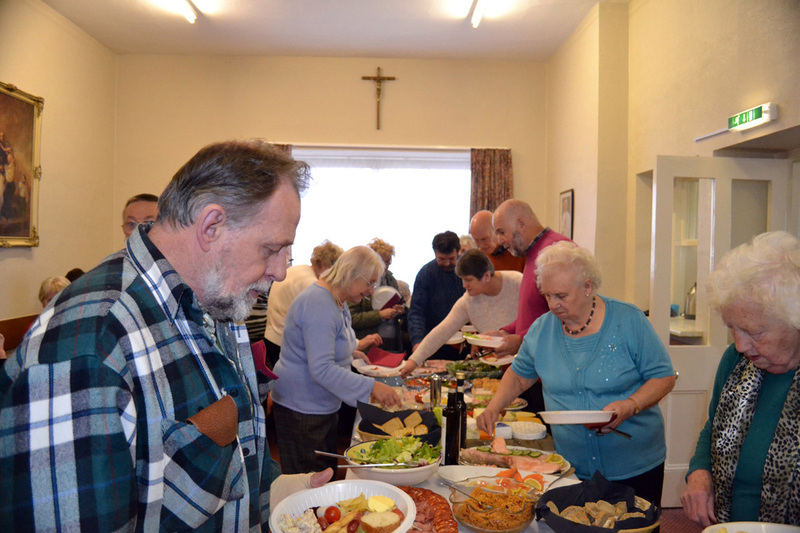 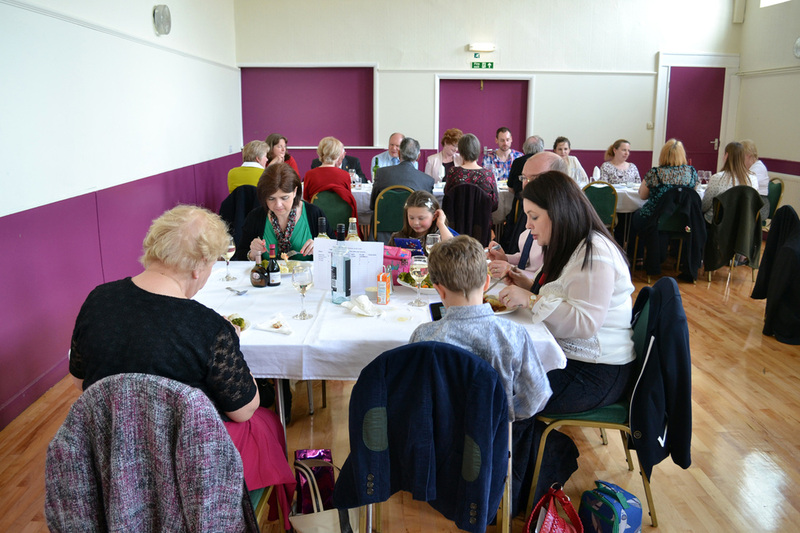 Ecumenical Lunch held on March 12 at St Osmund's Catholic Church, Gainford; lots of people came and we raised more than £200 for WaterAid. 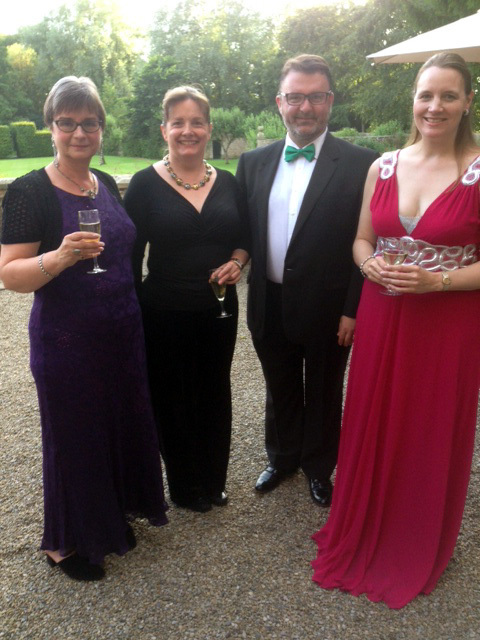 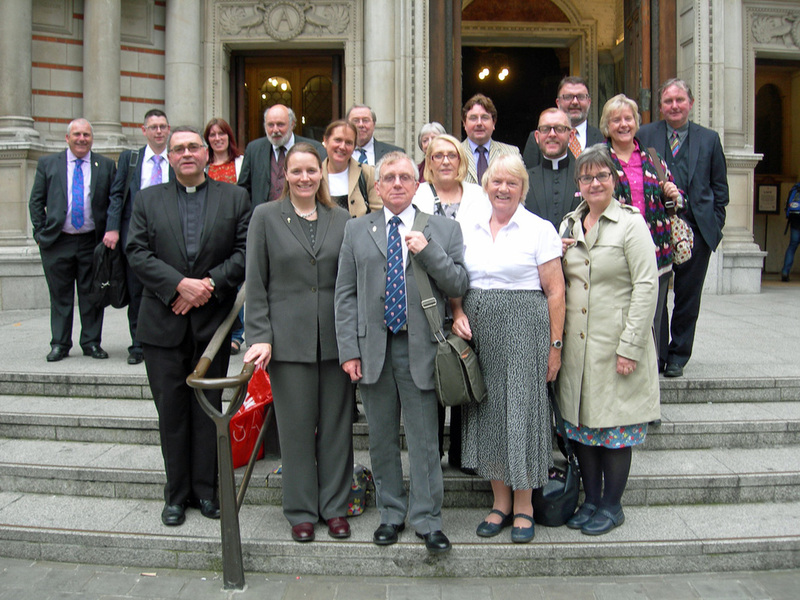 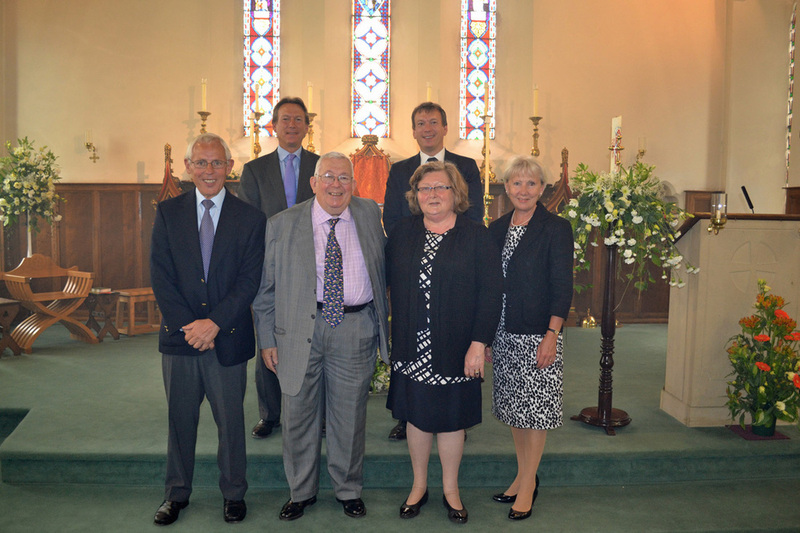 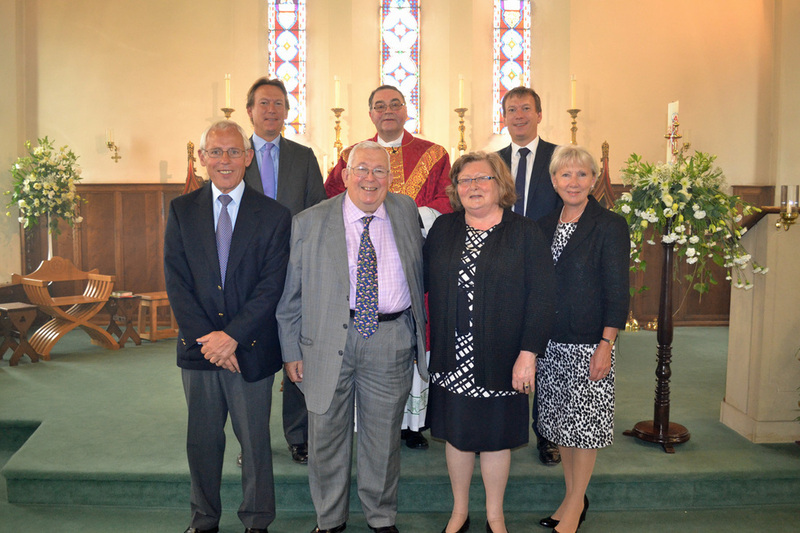 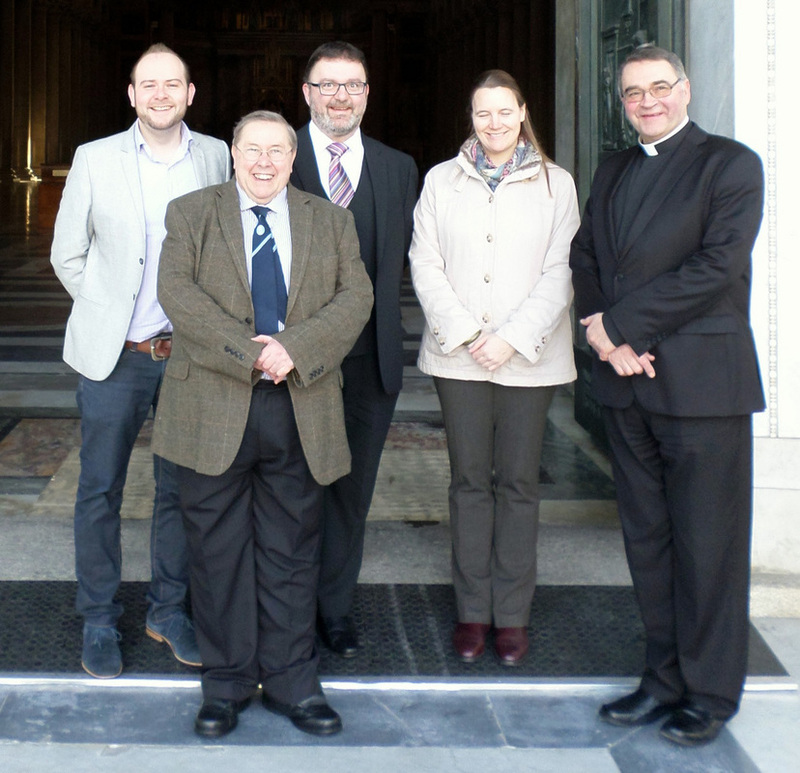 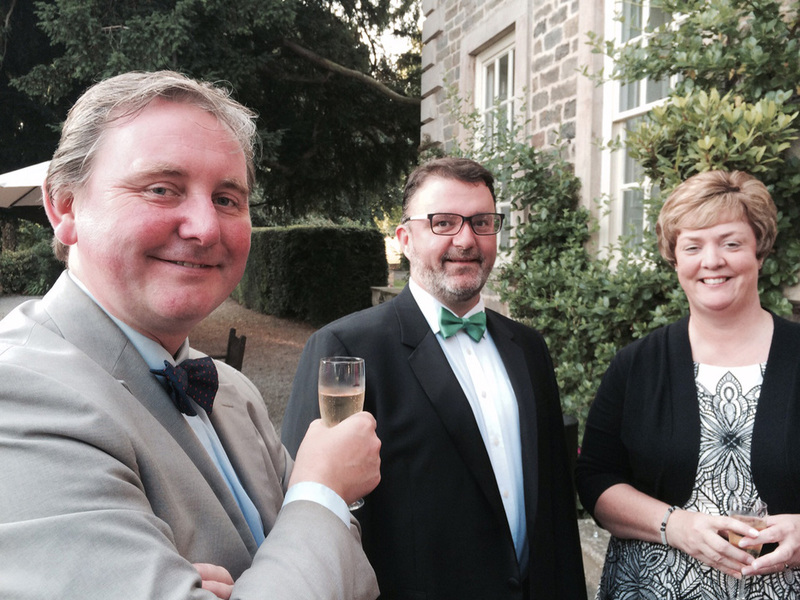 Congratulations to James Beddoe (far left) who has recently been appointed Lay Clerk at Worcester Cathedral. 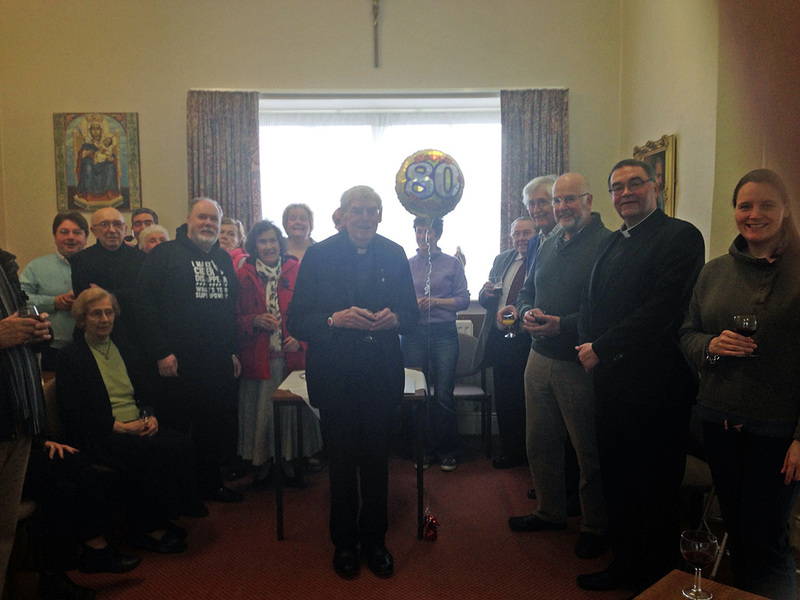 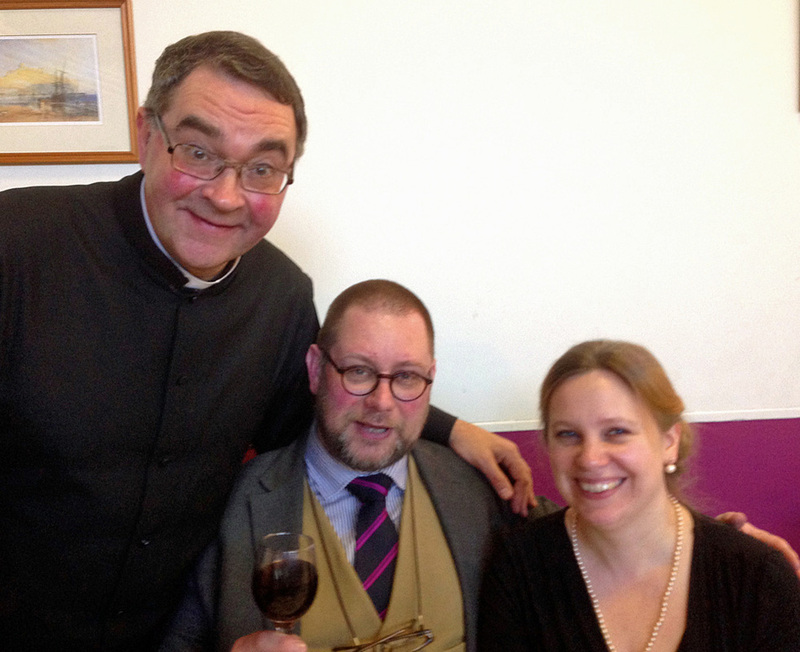 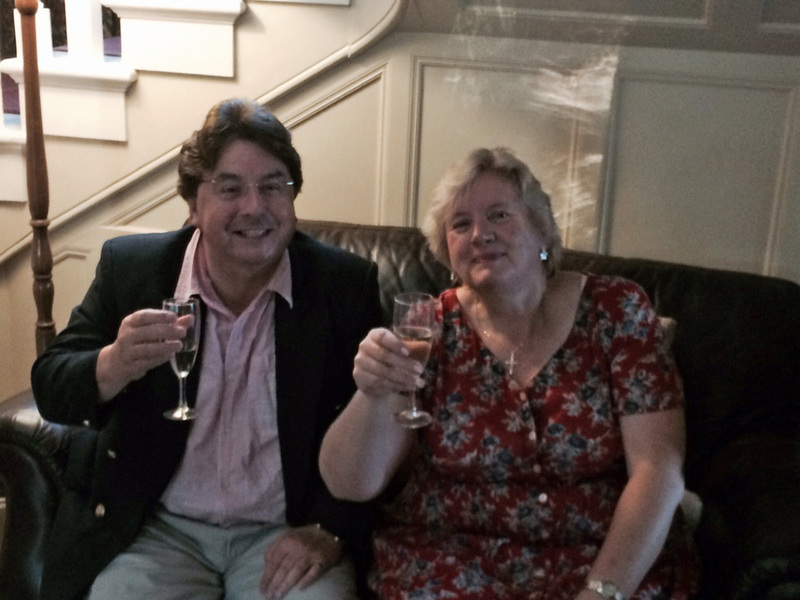 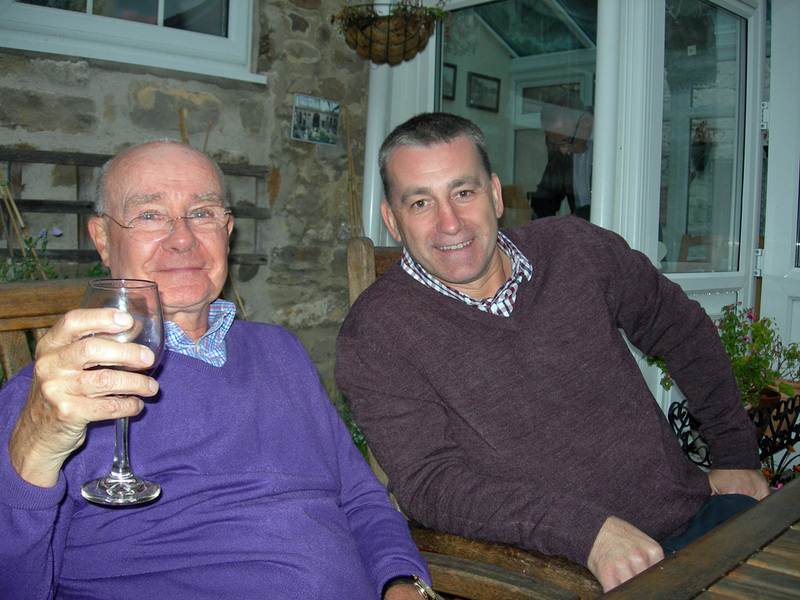 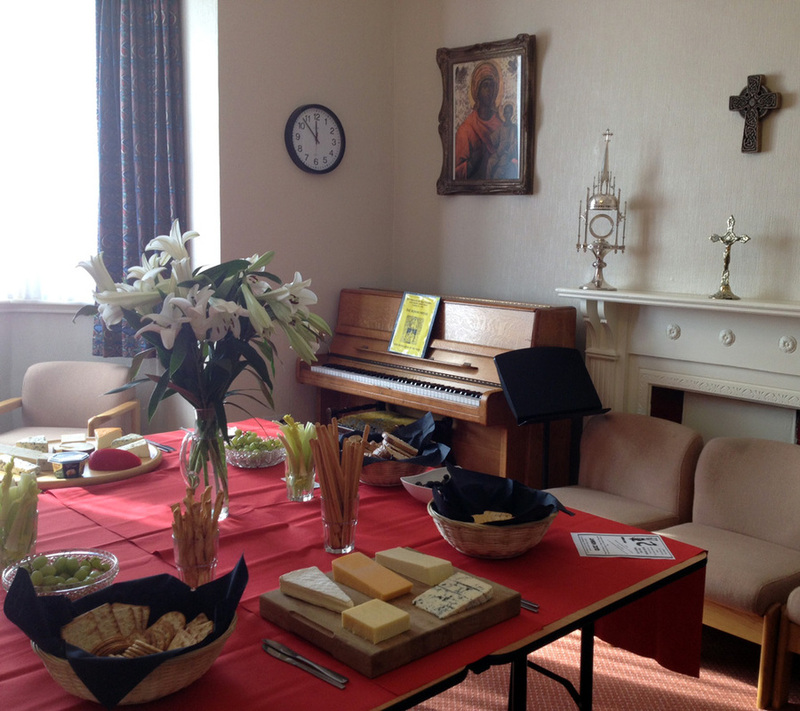 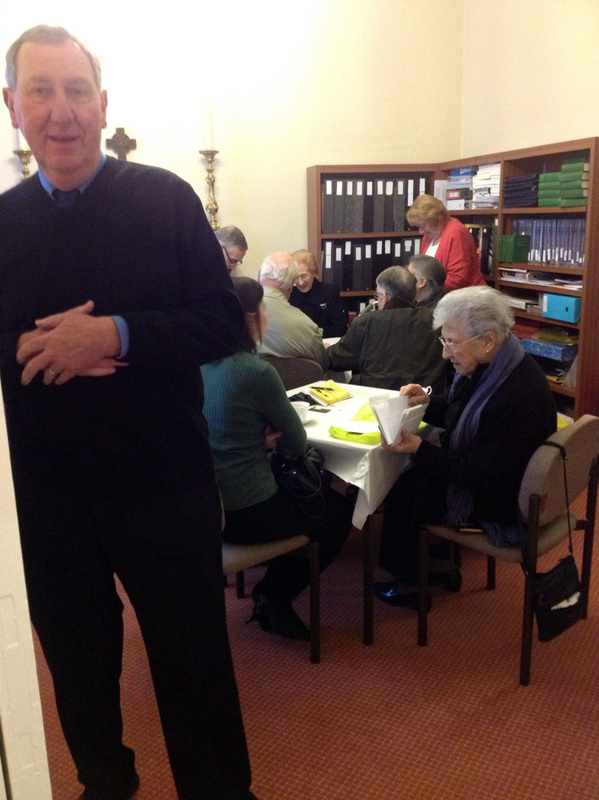 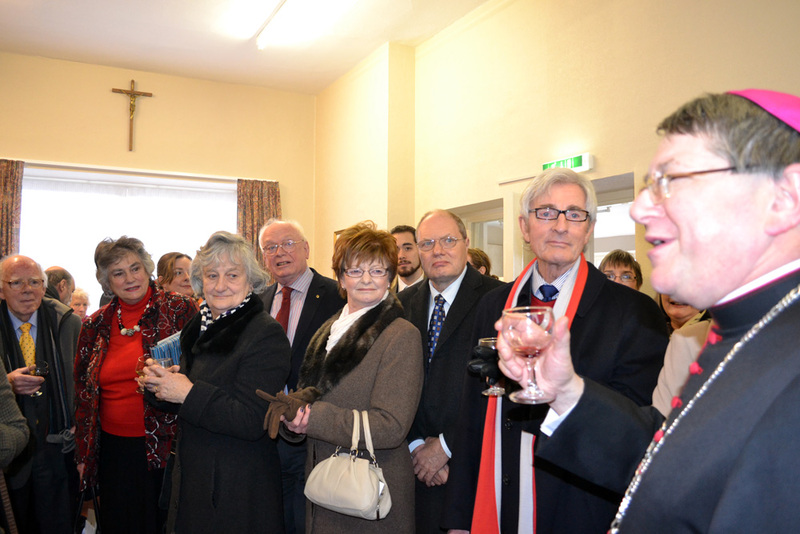 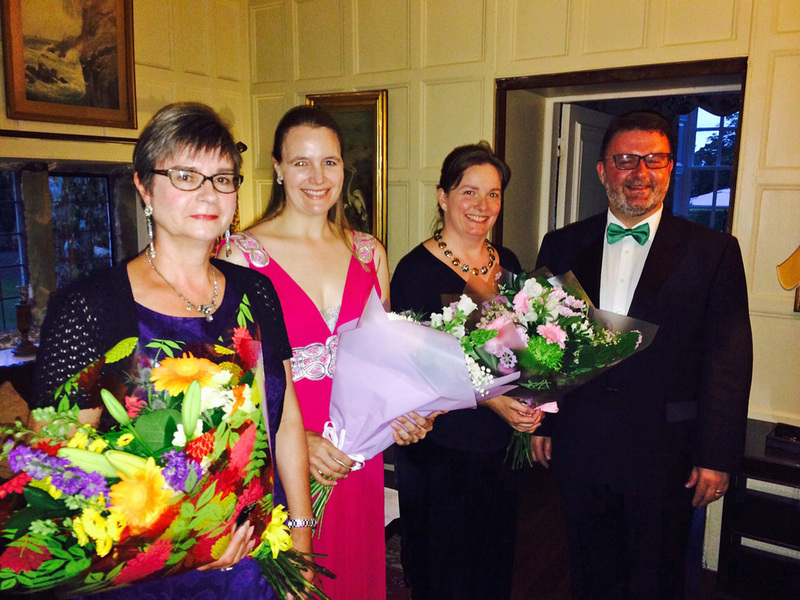 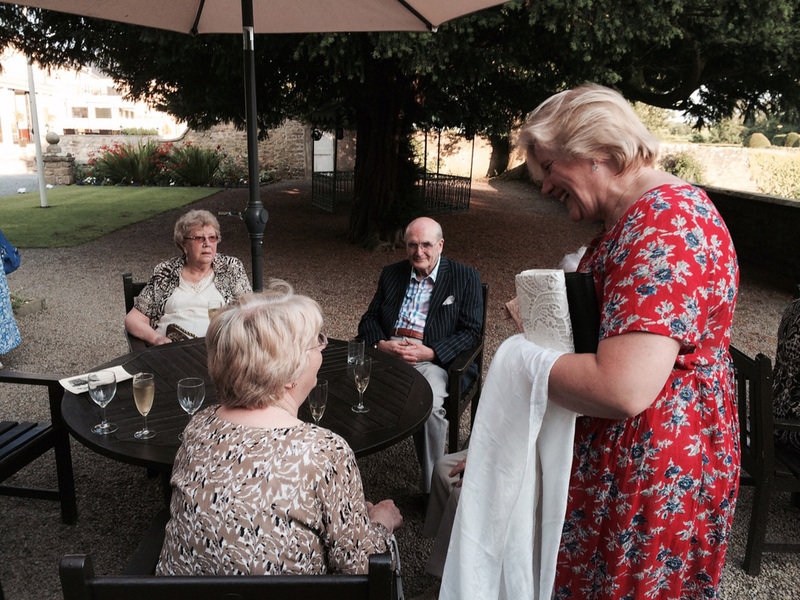 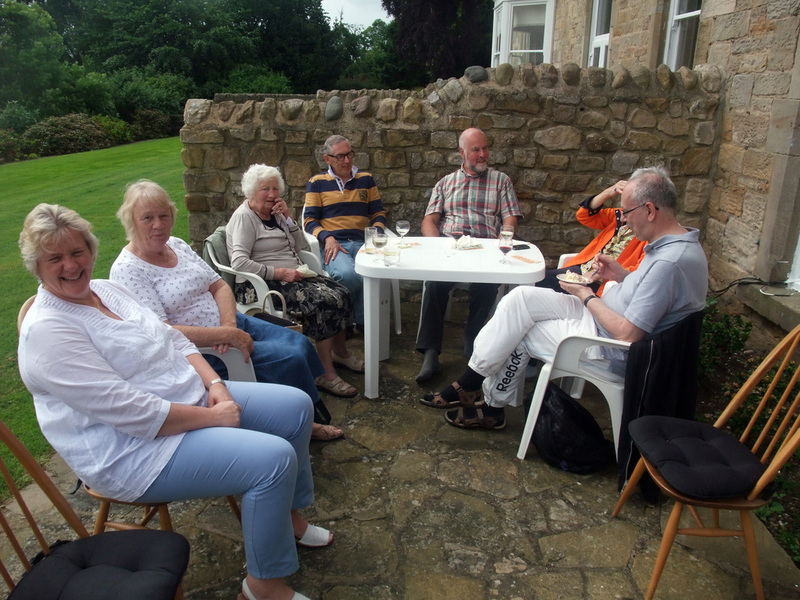 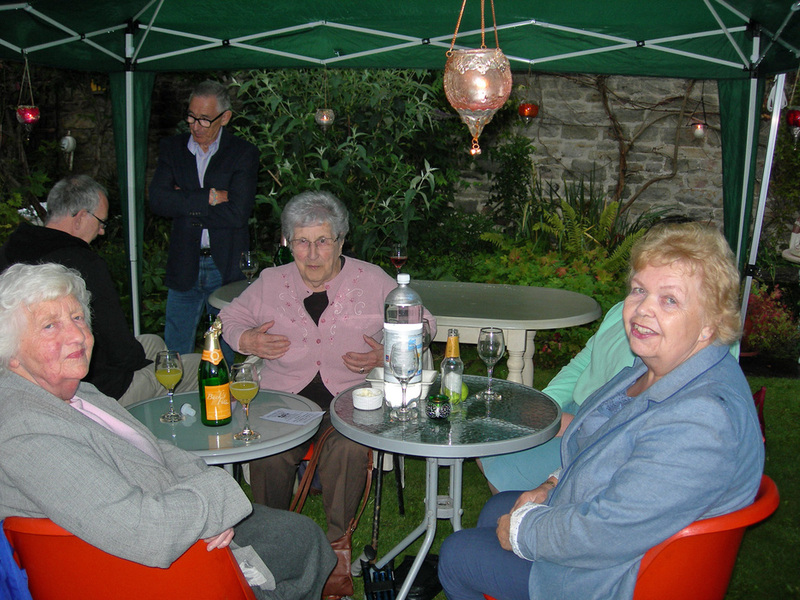 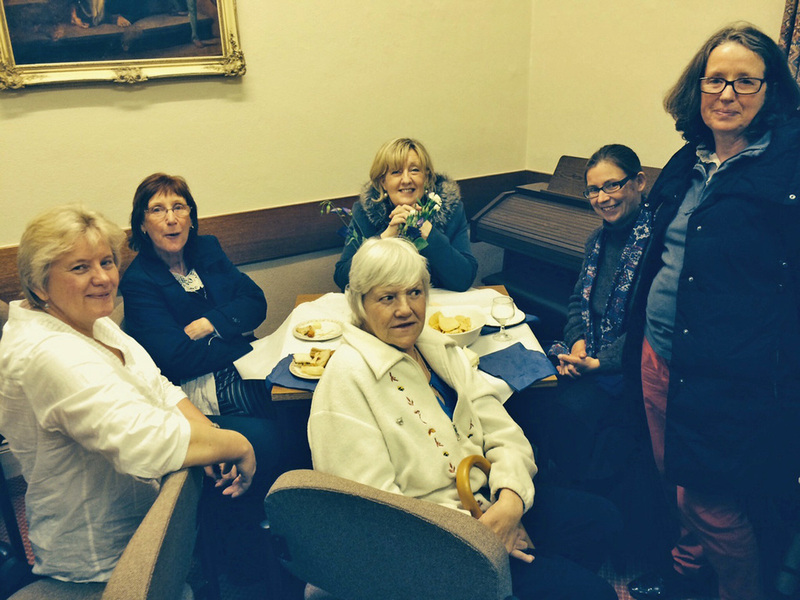 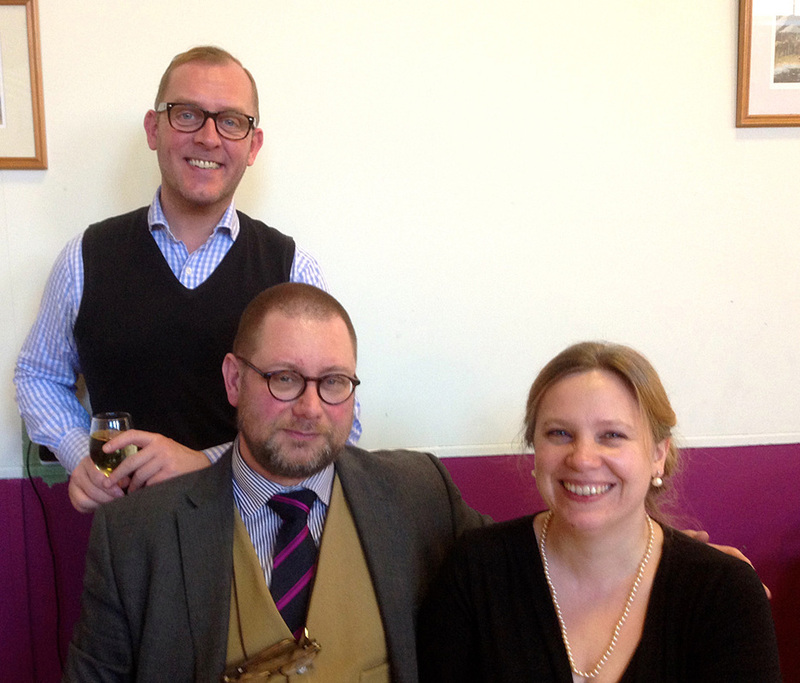 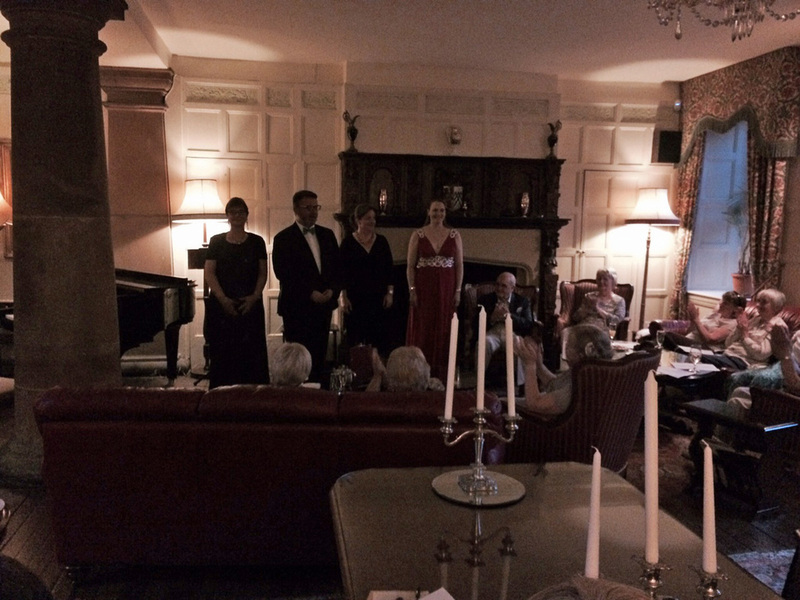 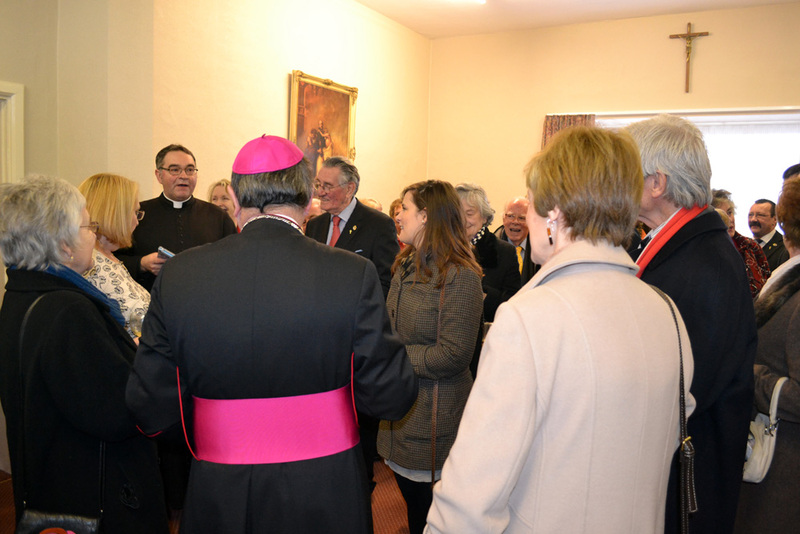 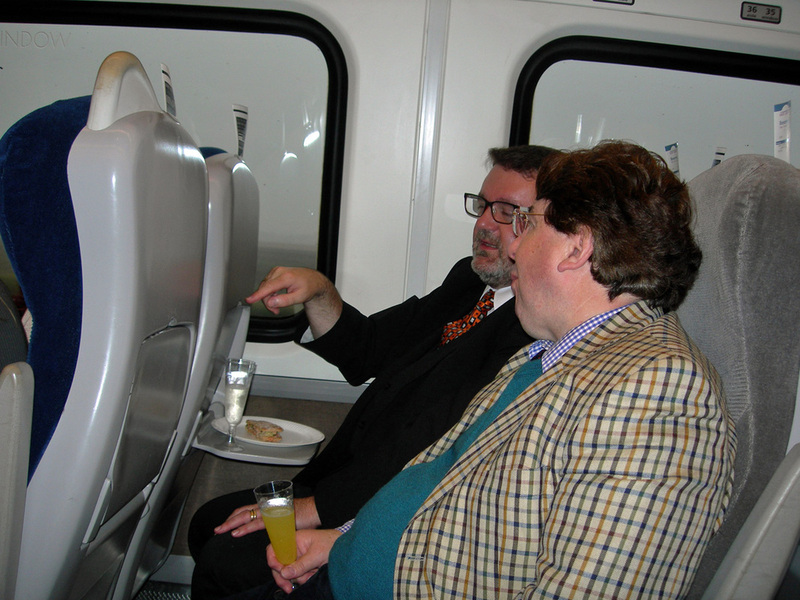 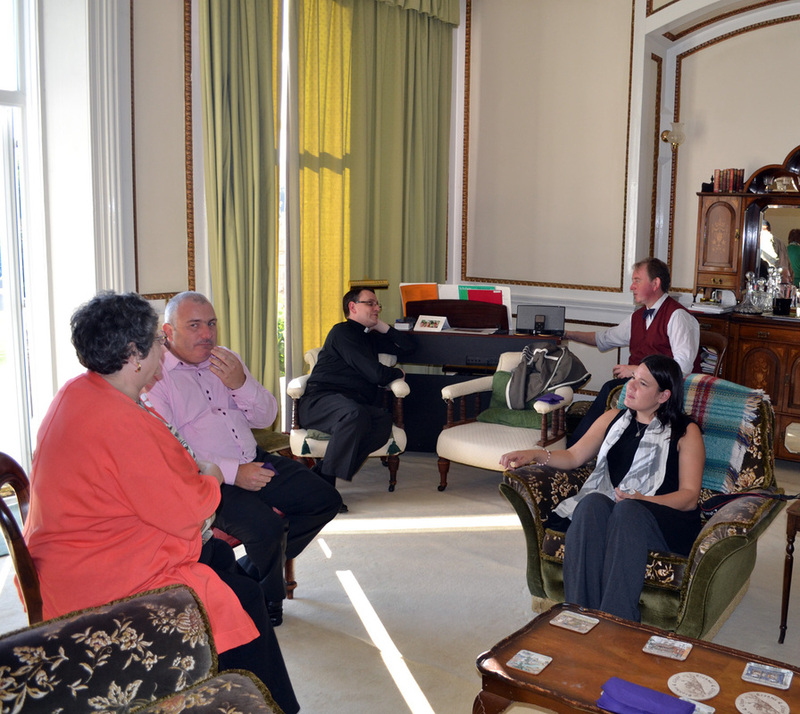 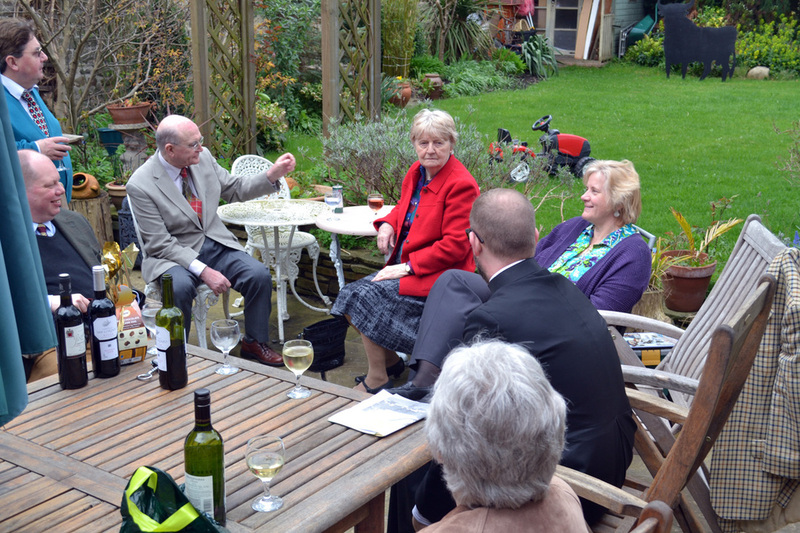 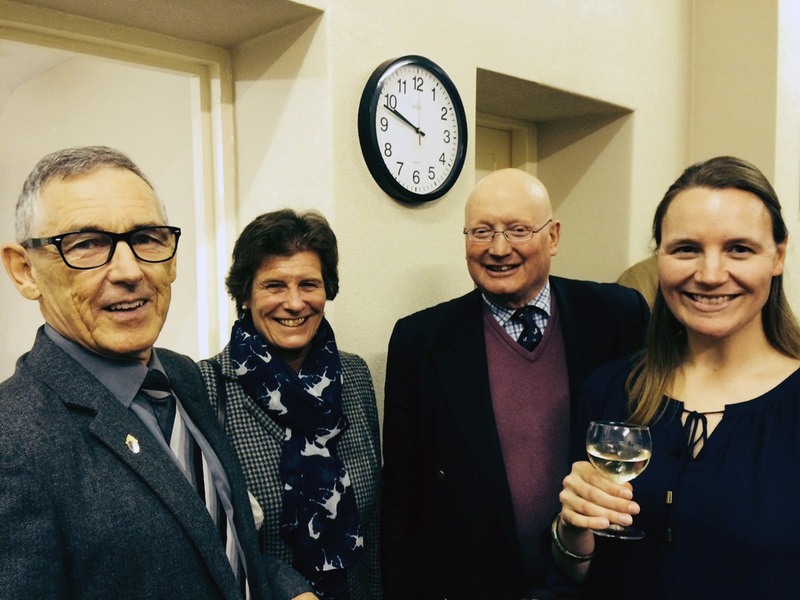 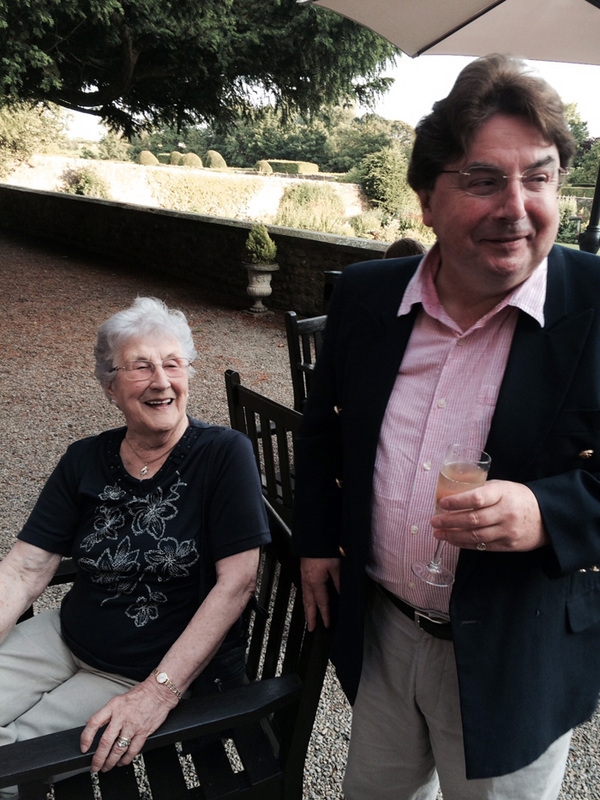 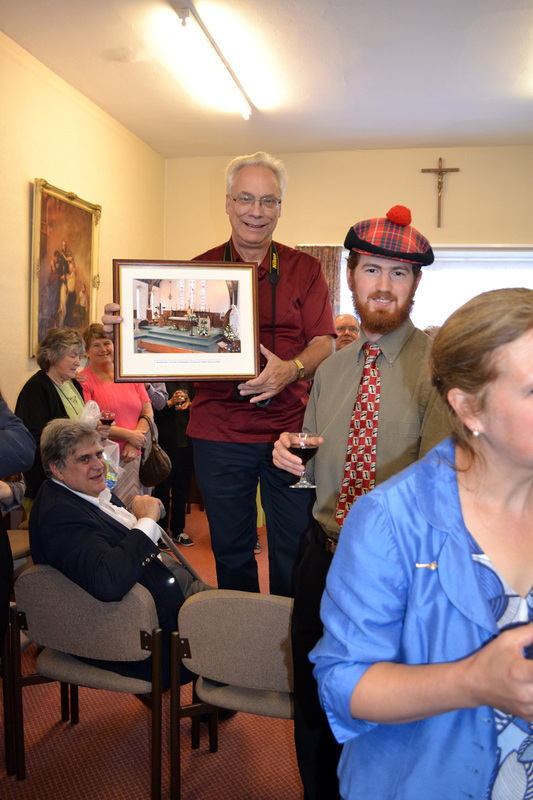 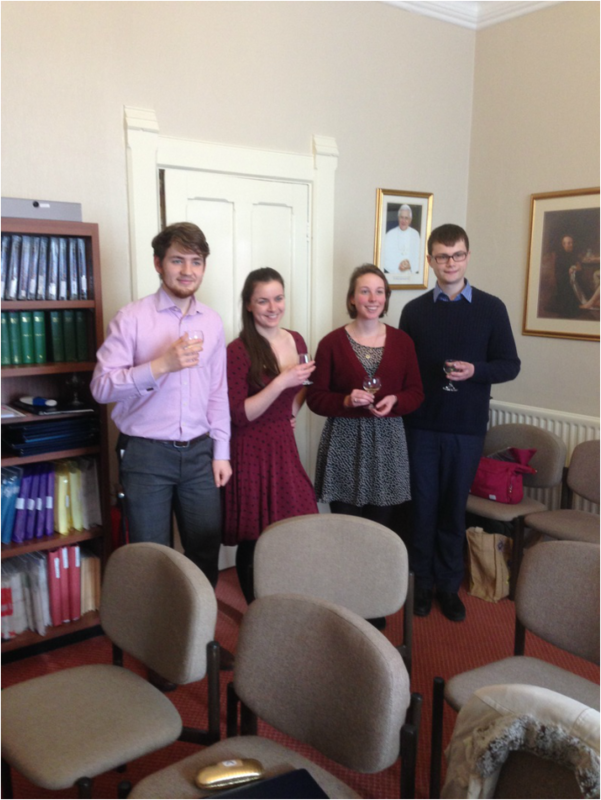 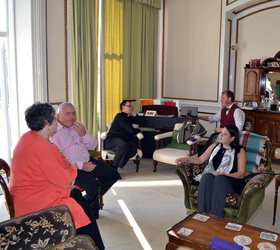 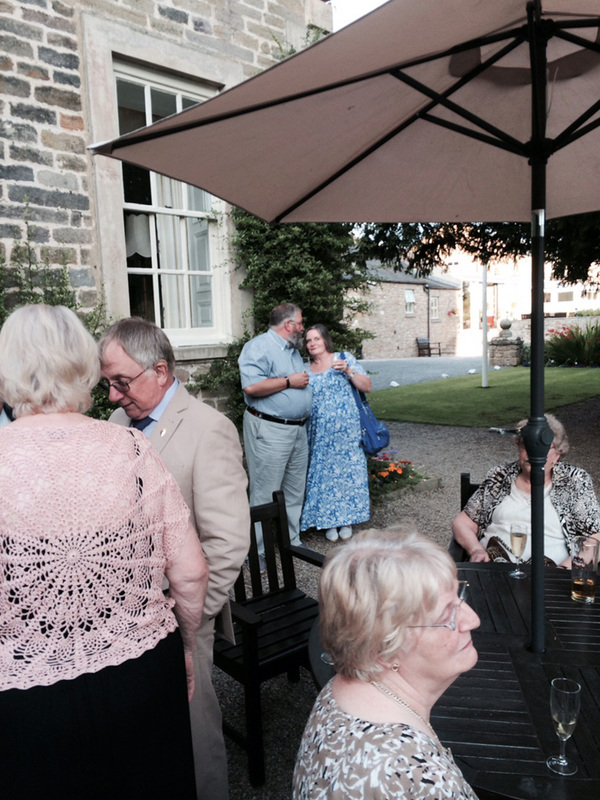 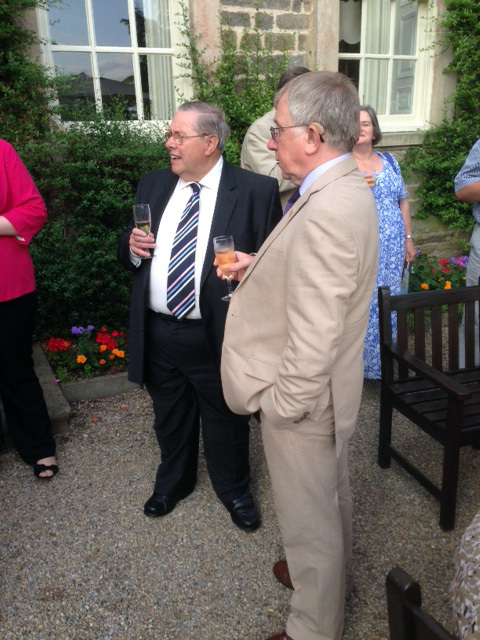 Here he is celebrating with friends and a glass of bubbly in the Song Room at St Osmund's. 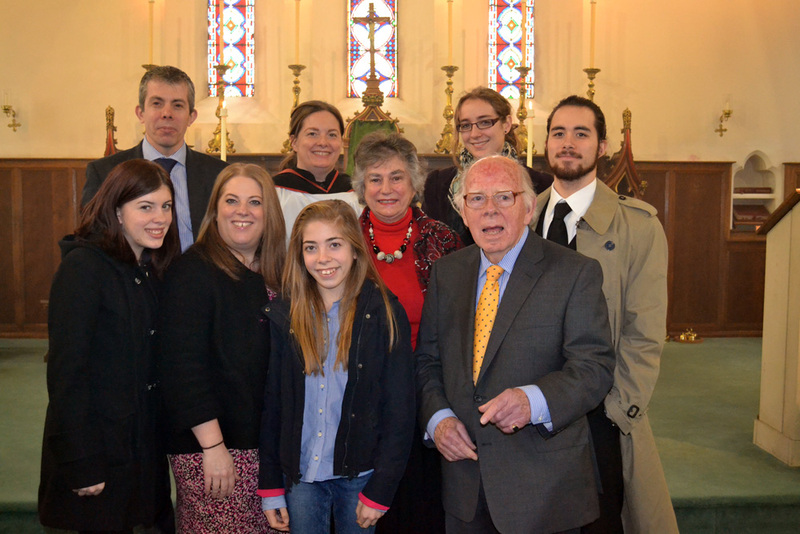 Father Grieves with two of Howey's excellent staff. 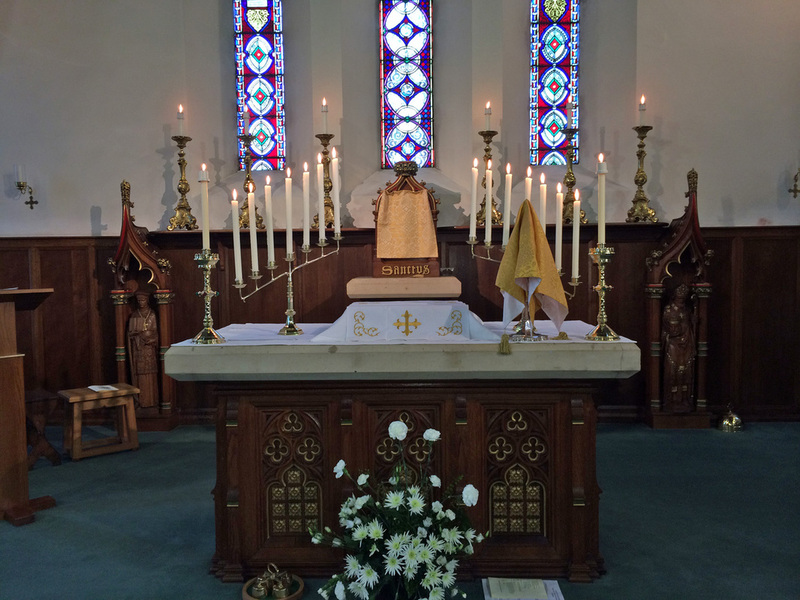 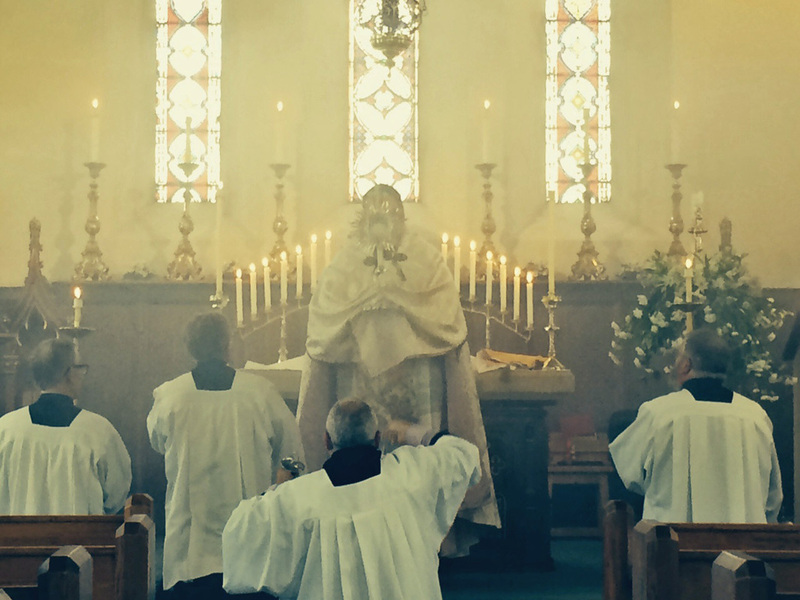 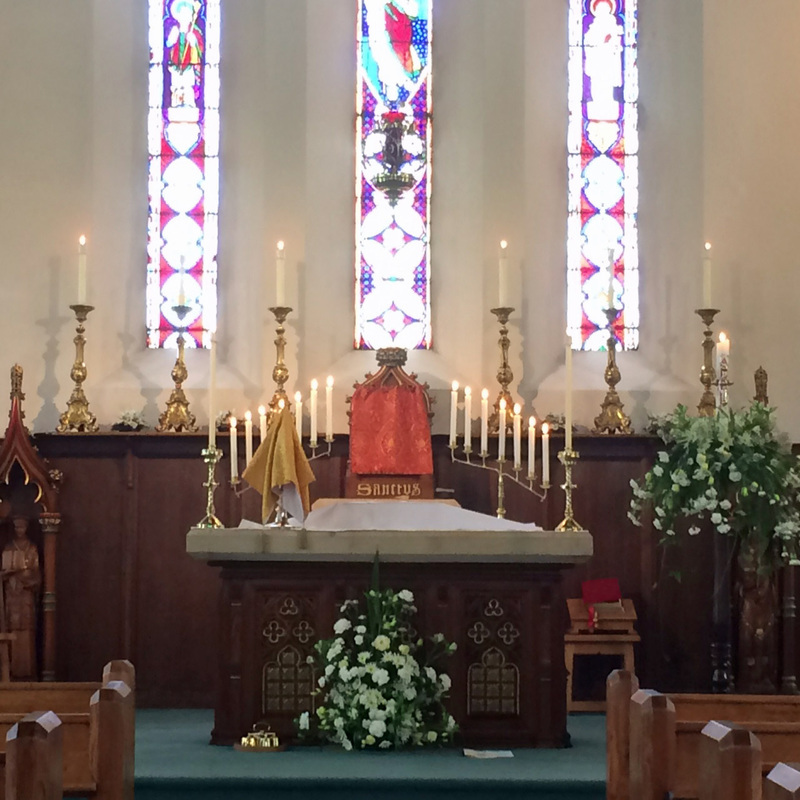 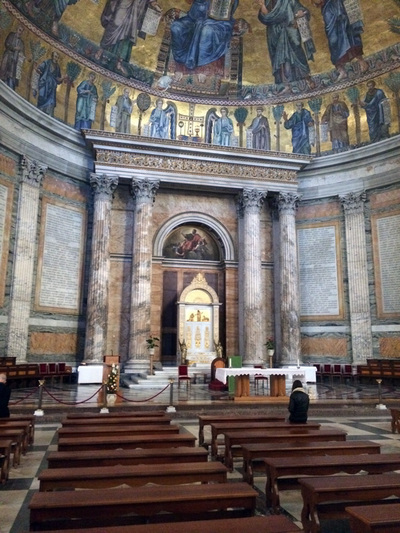 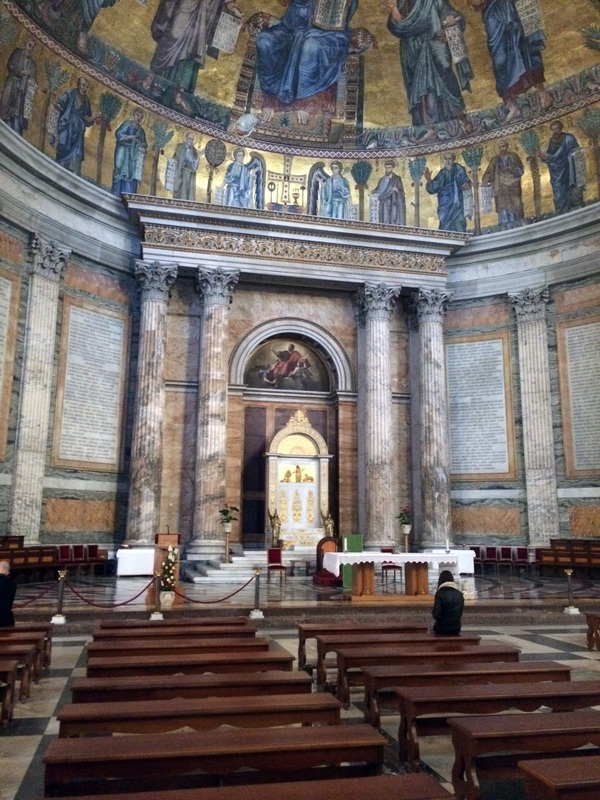 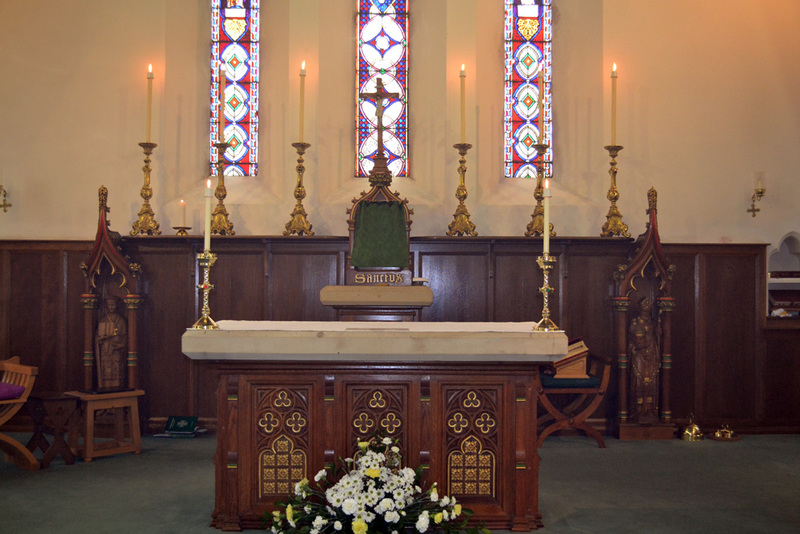 The altar prepared for Benediction. 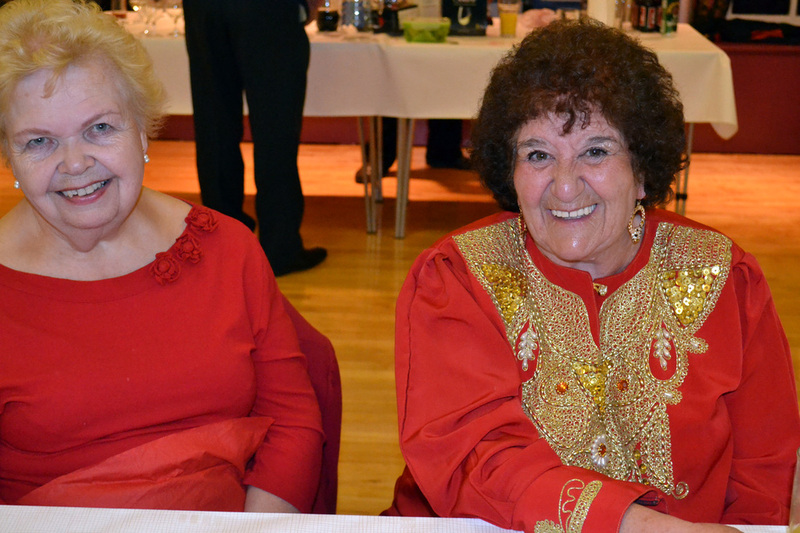 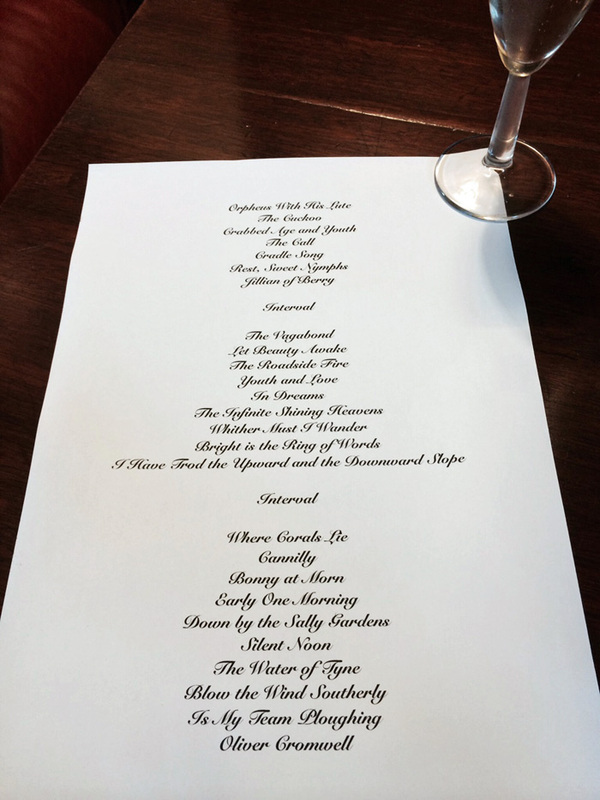 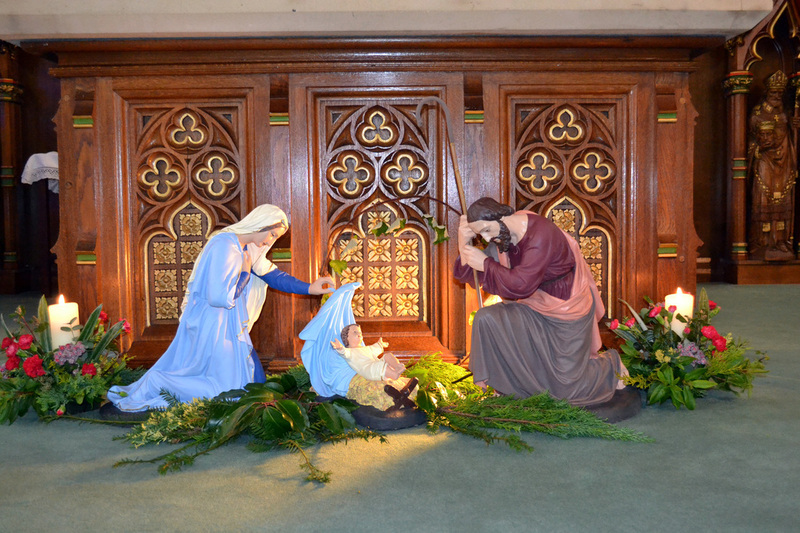 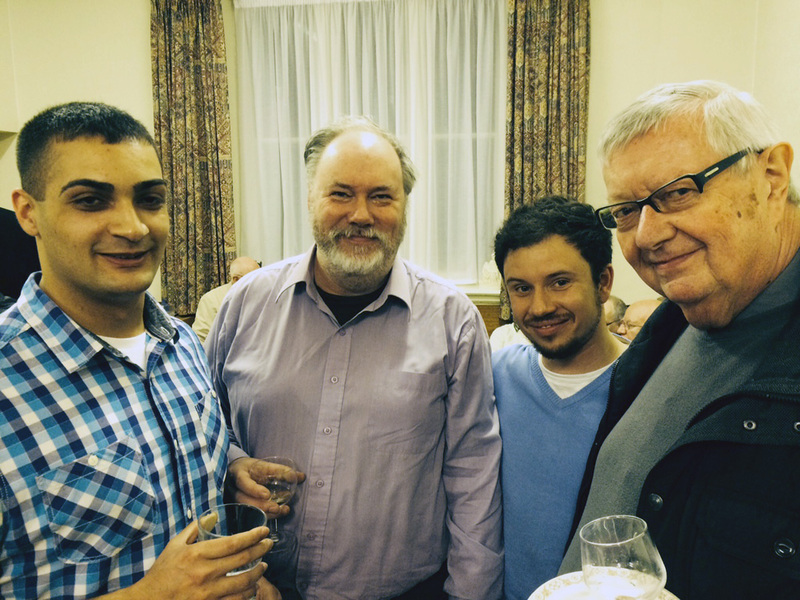 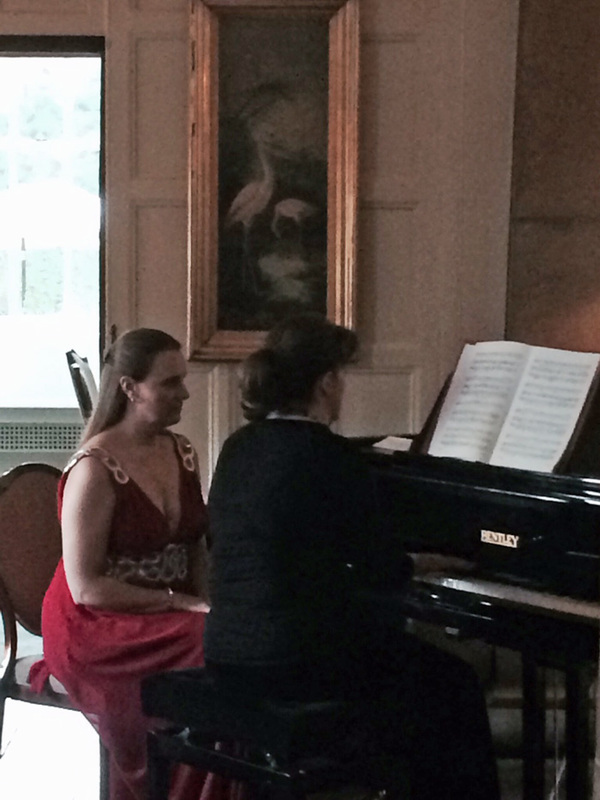 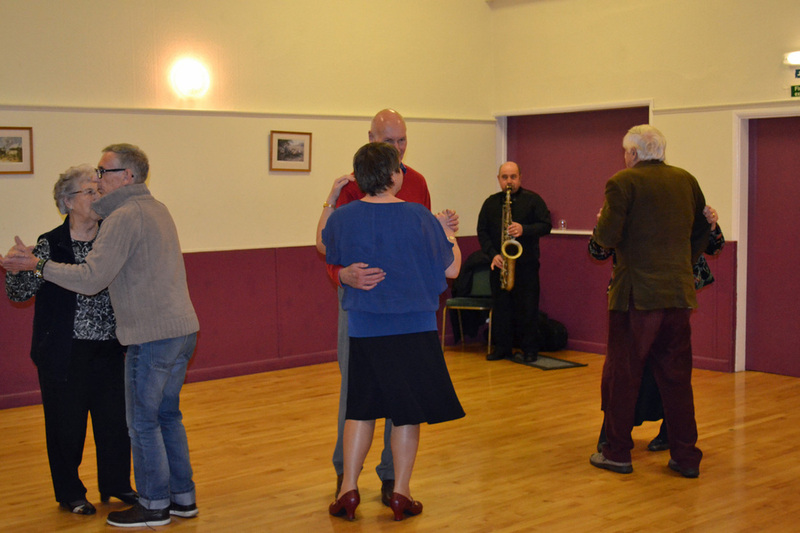 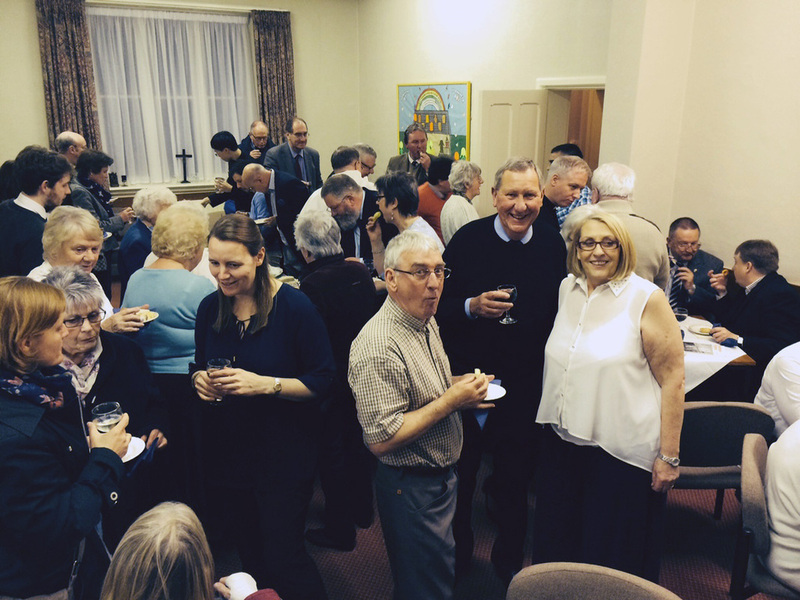 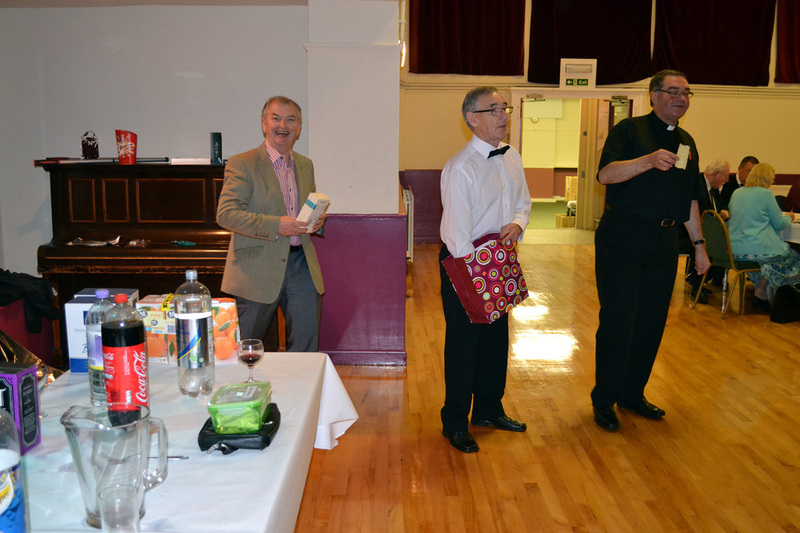 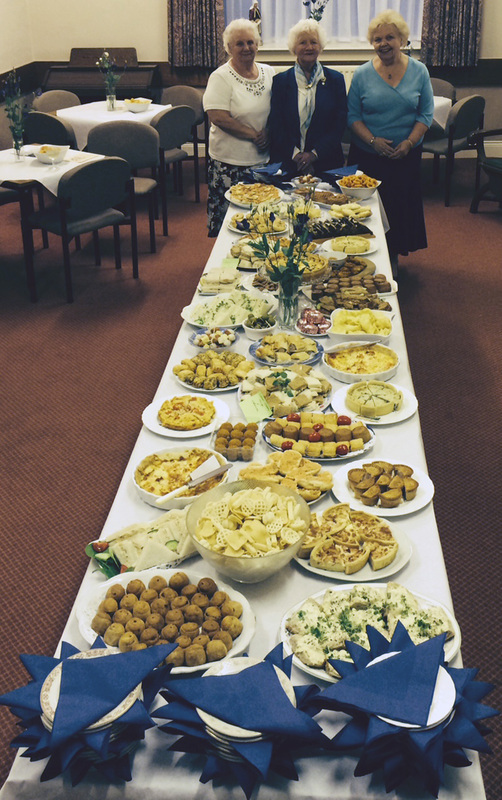 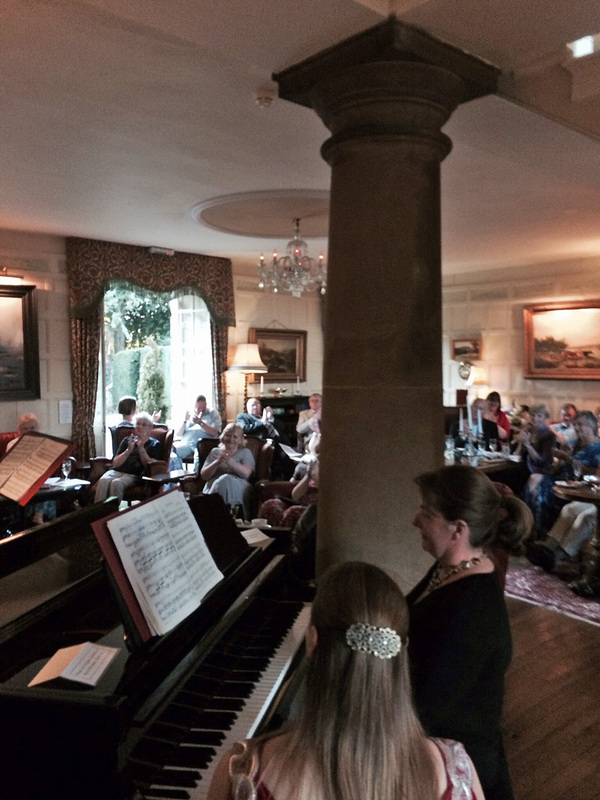 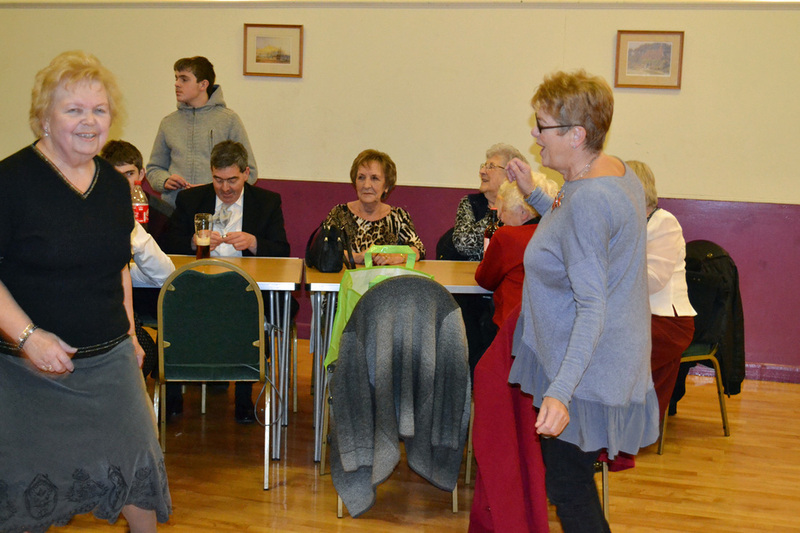 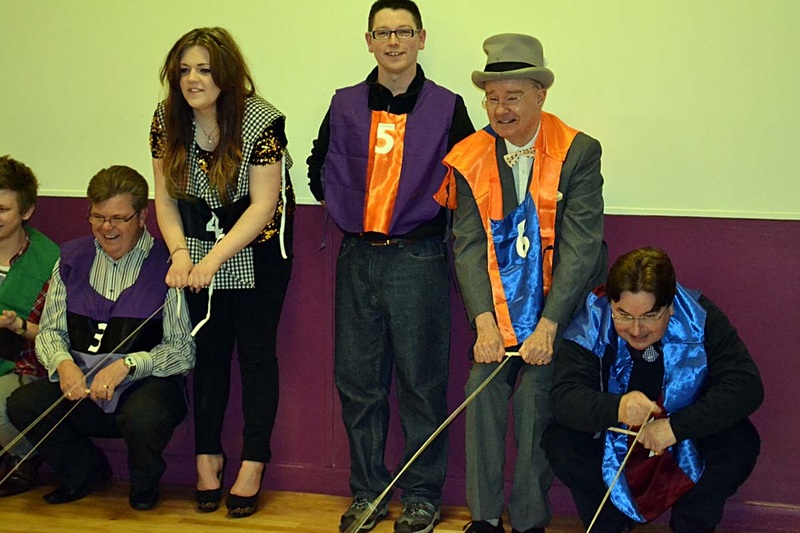 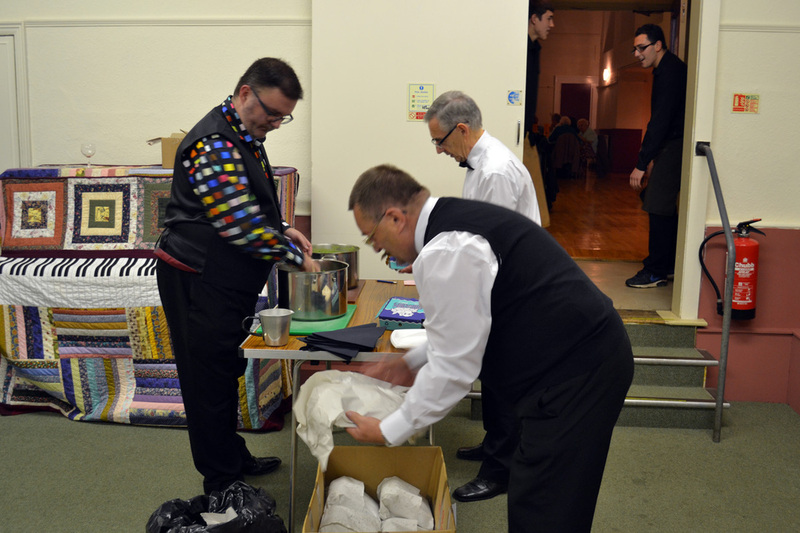 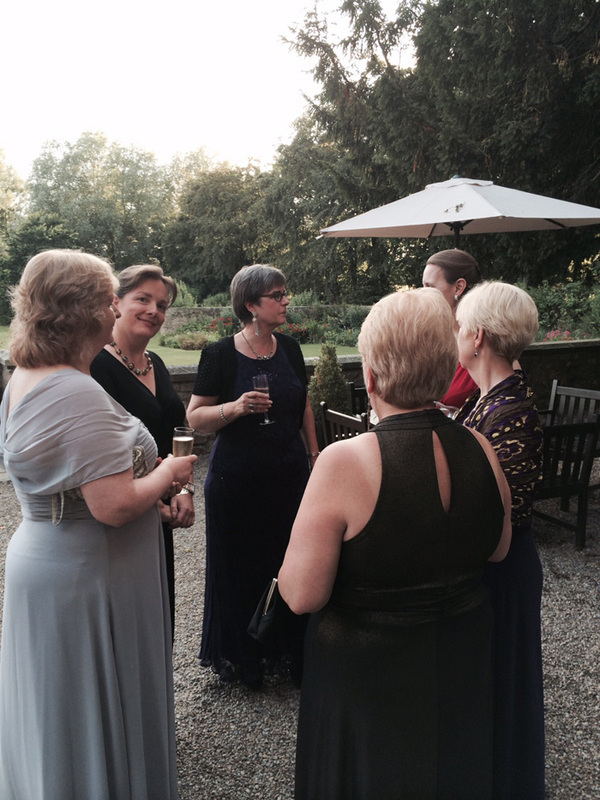 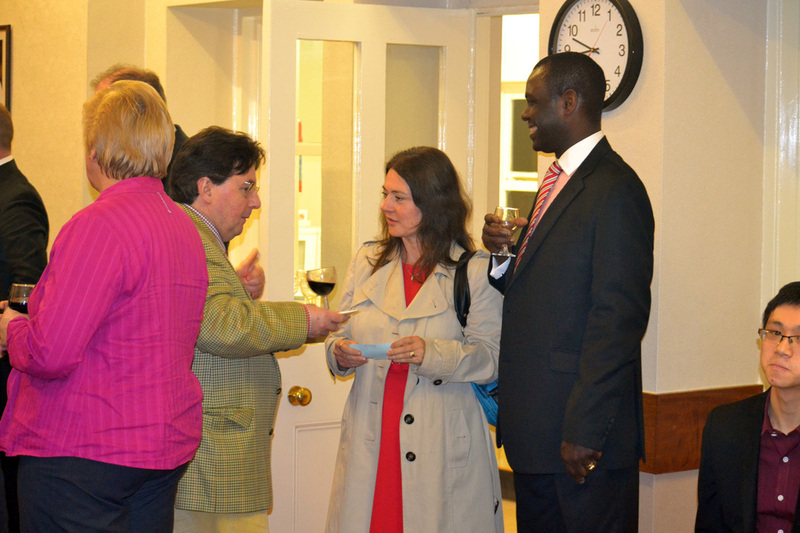 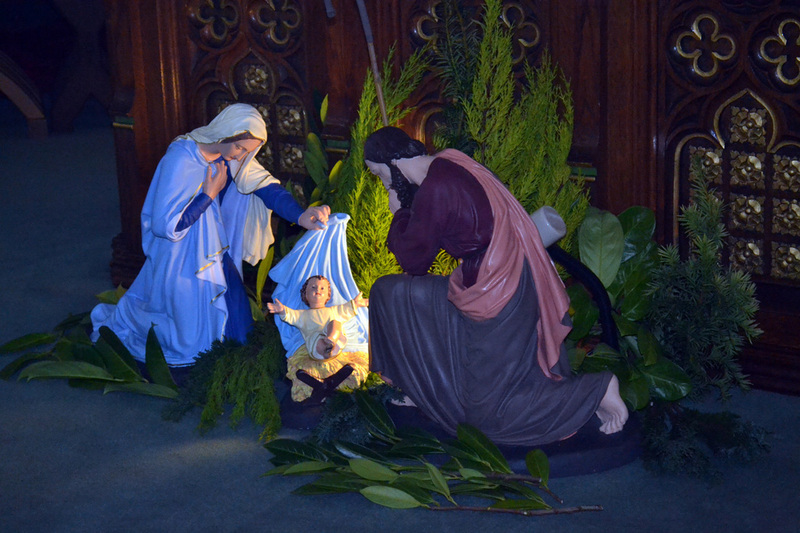 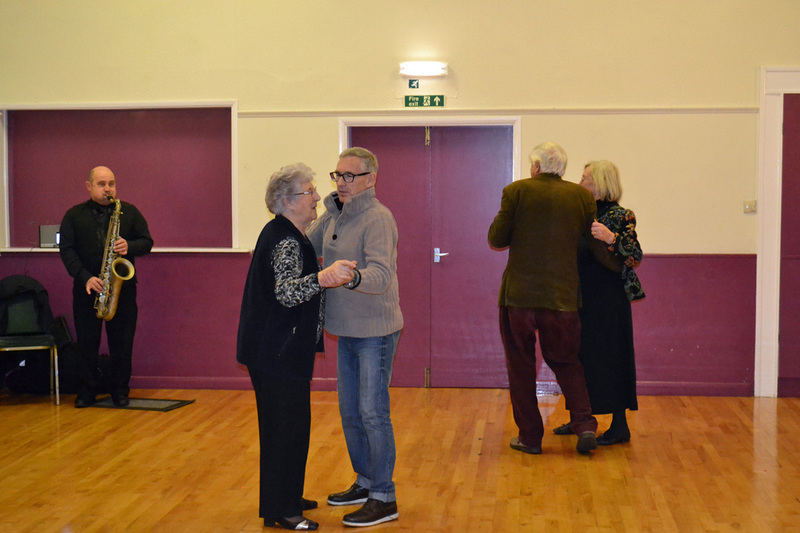 Our Epiphany party 2014 - a great evening enjoyed by all and we raised £1,200 on the night - many thanks to everyone. 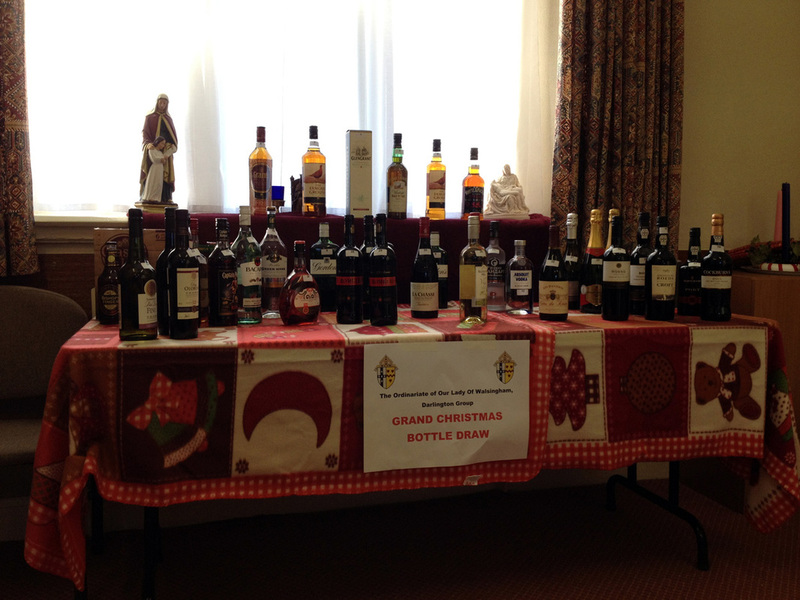 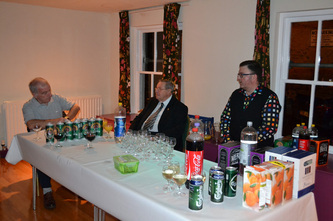 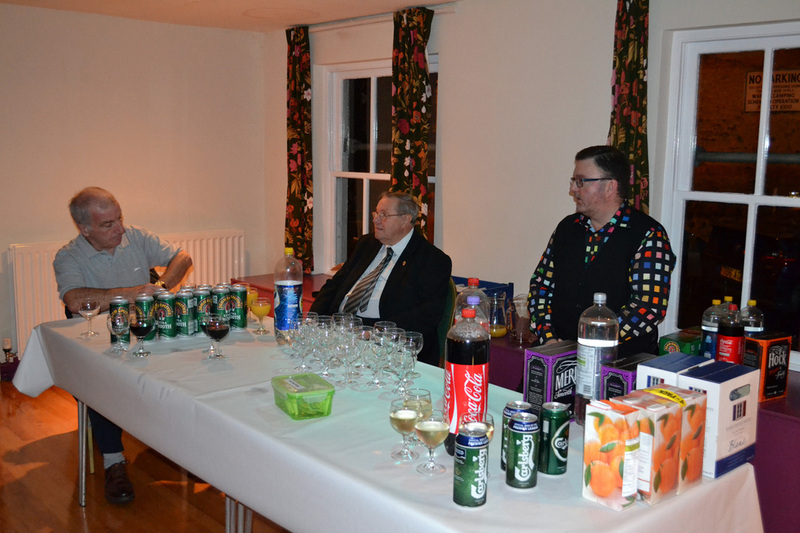 The Grand Christmas Bottle Draw included 40 bottles and raised £1000. 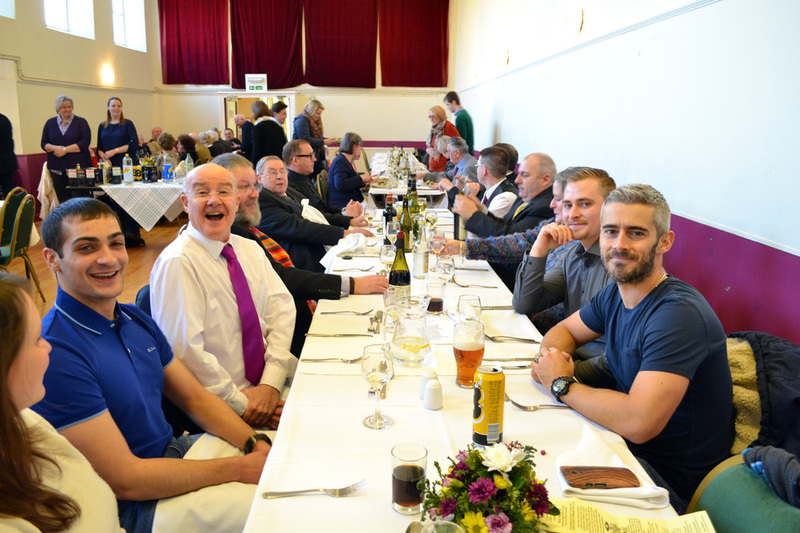 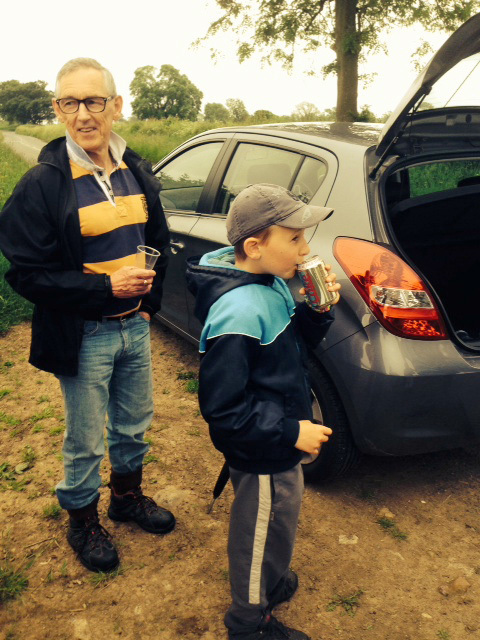 Many thanks to Mr Andrew Bull and Mr Darren Tiffany for their hard work and all who generously donated bottles and purchased tickets. 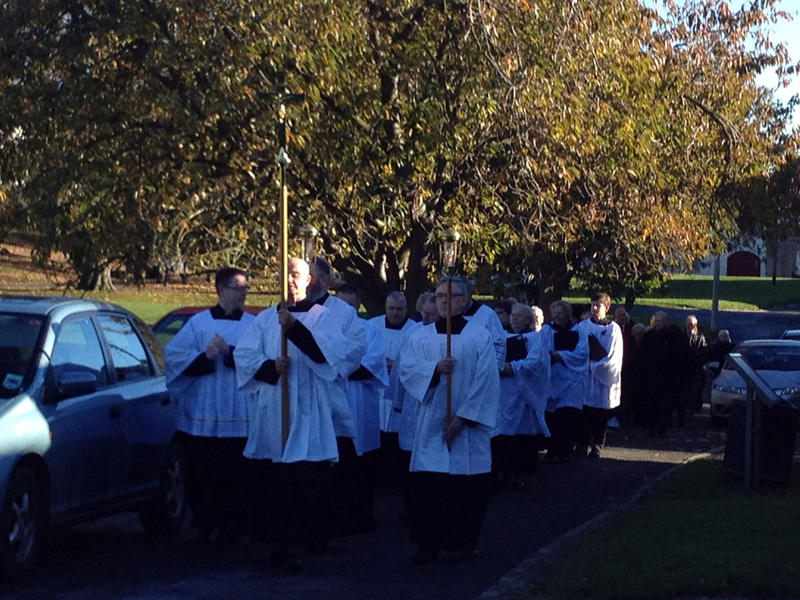 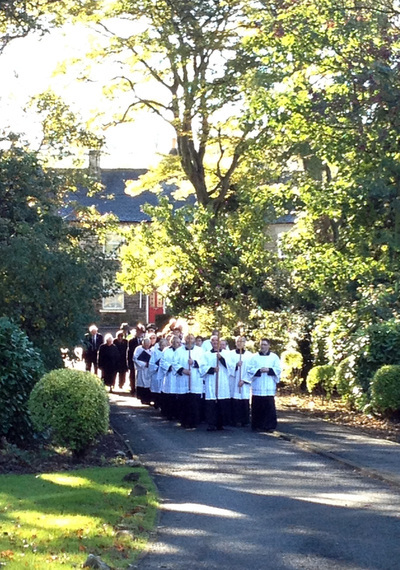 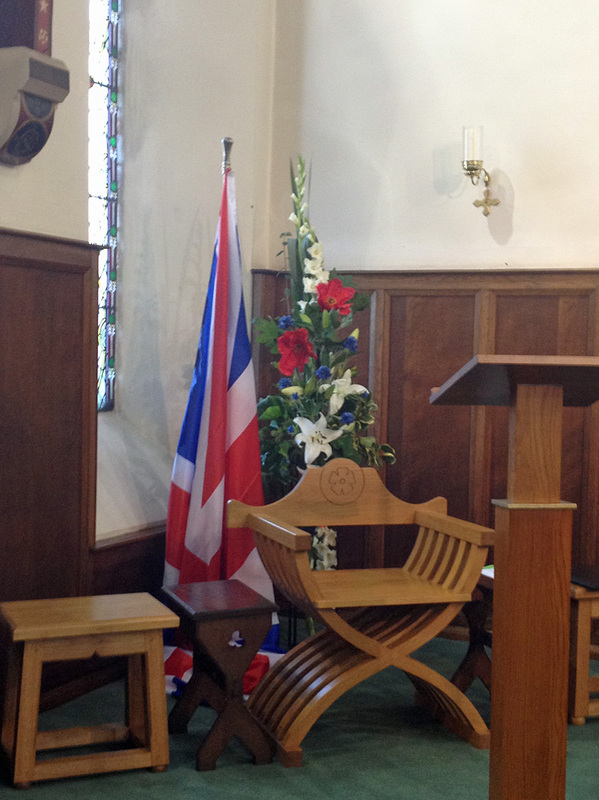 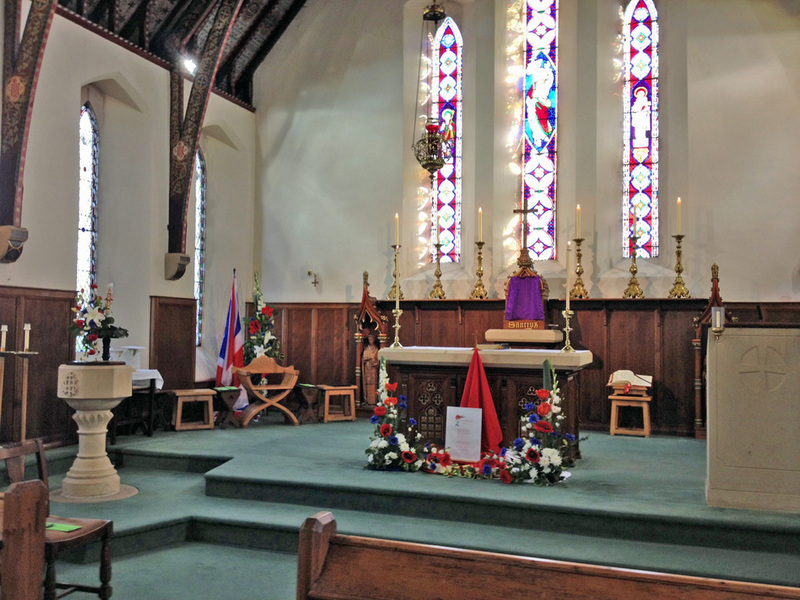 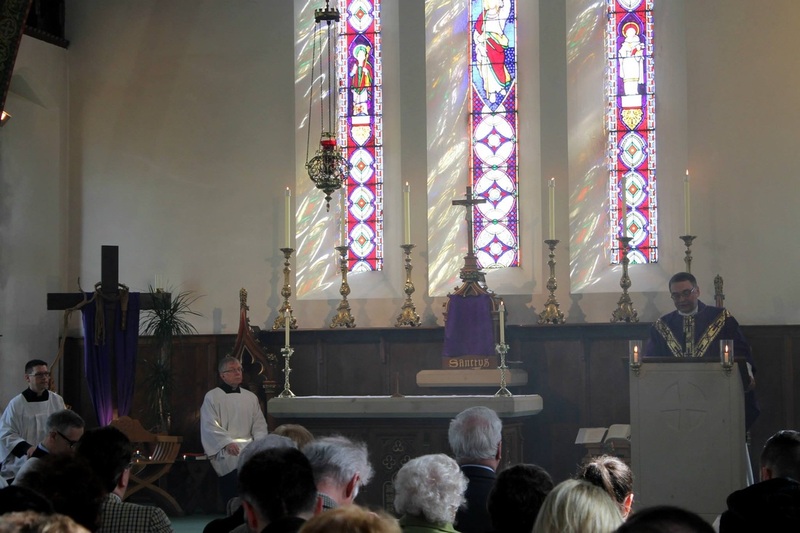 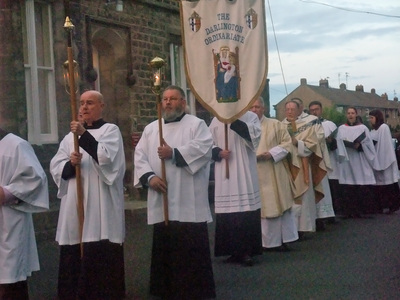 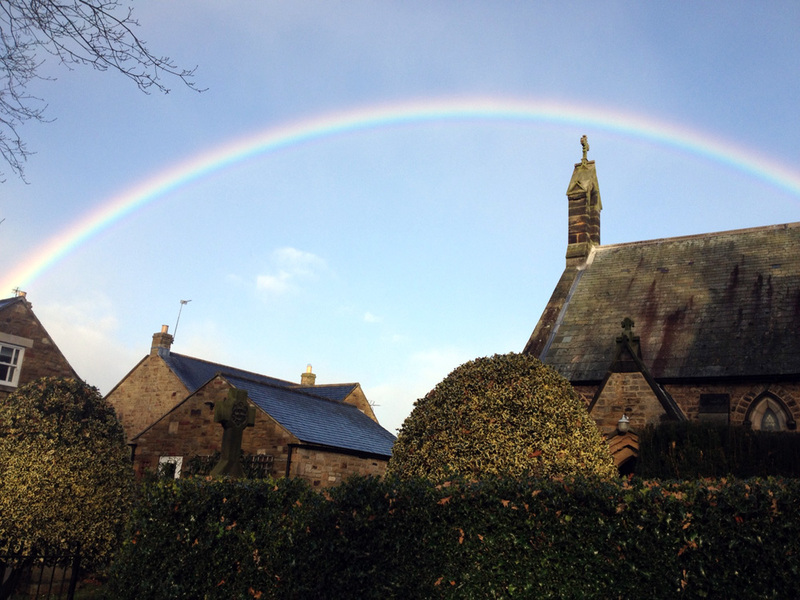 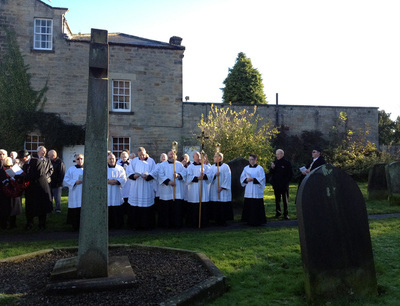 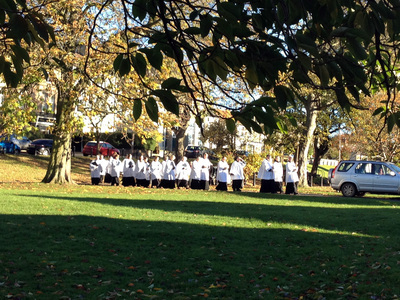 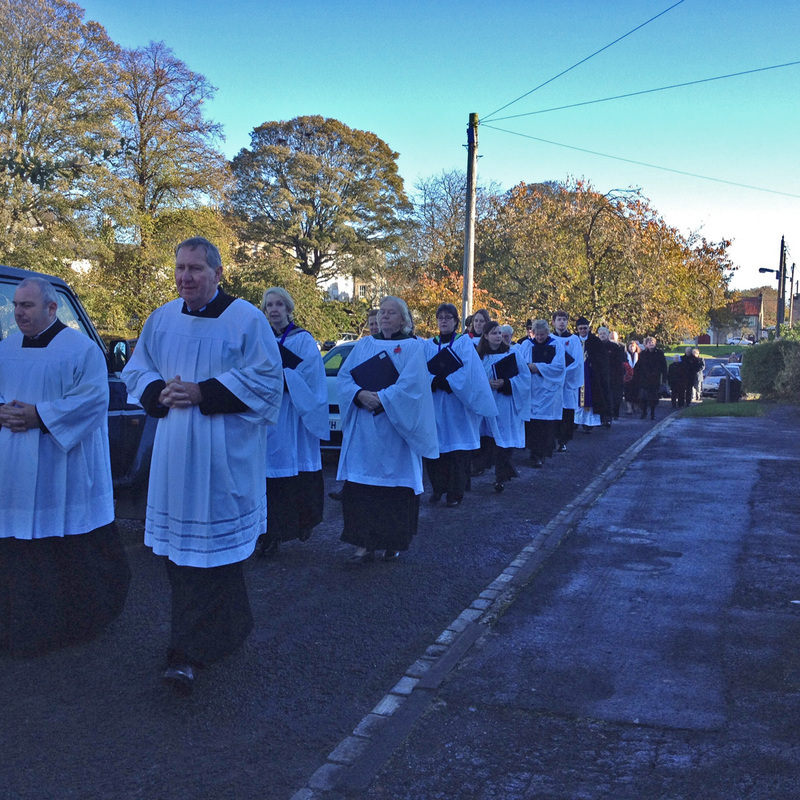 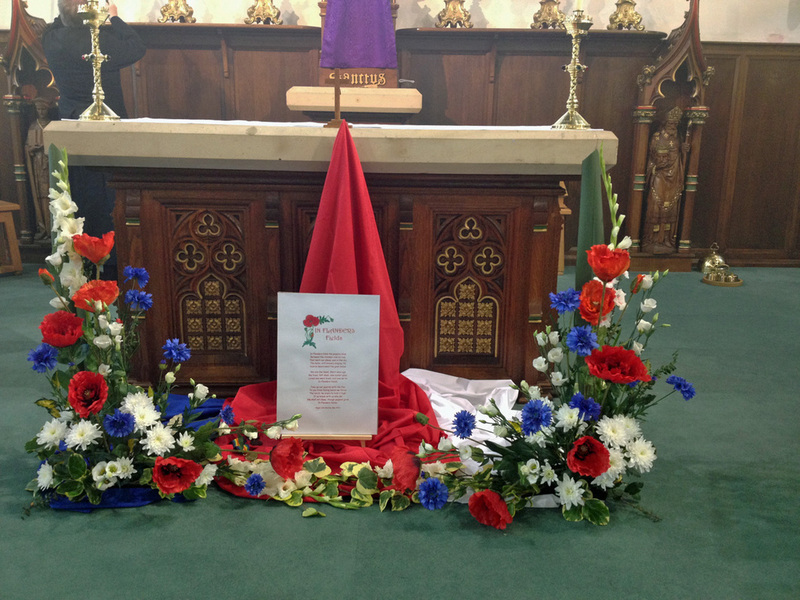 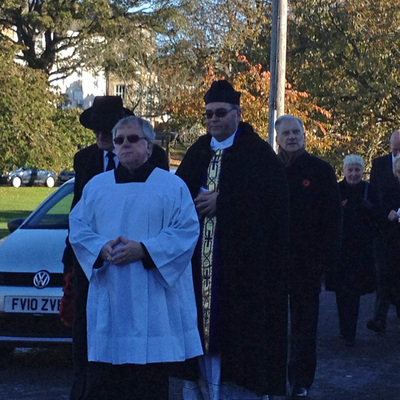 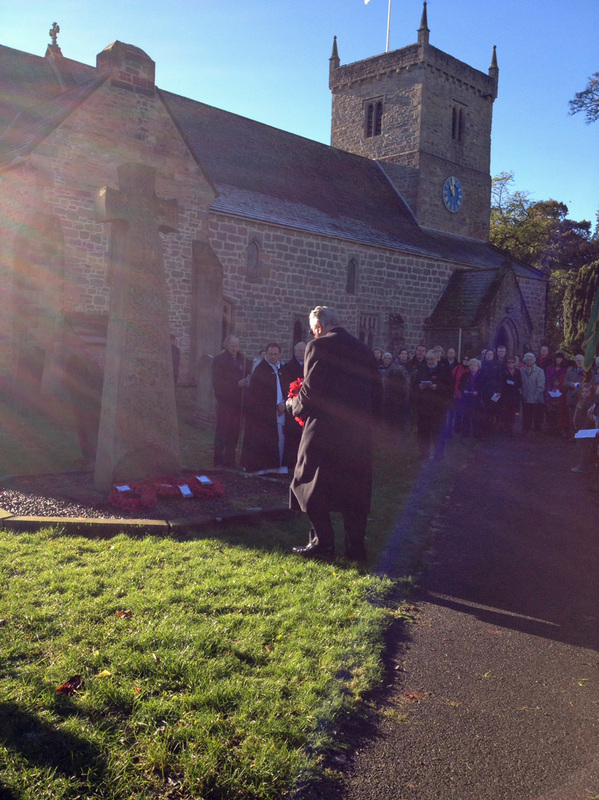 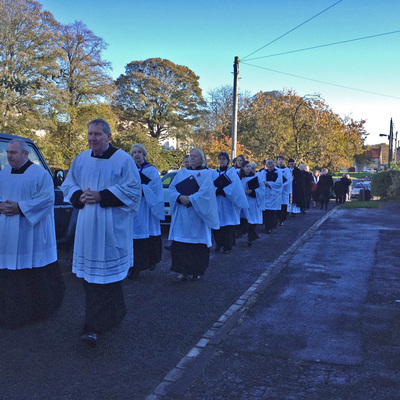 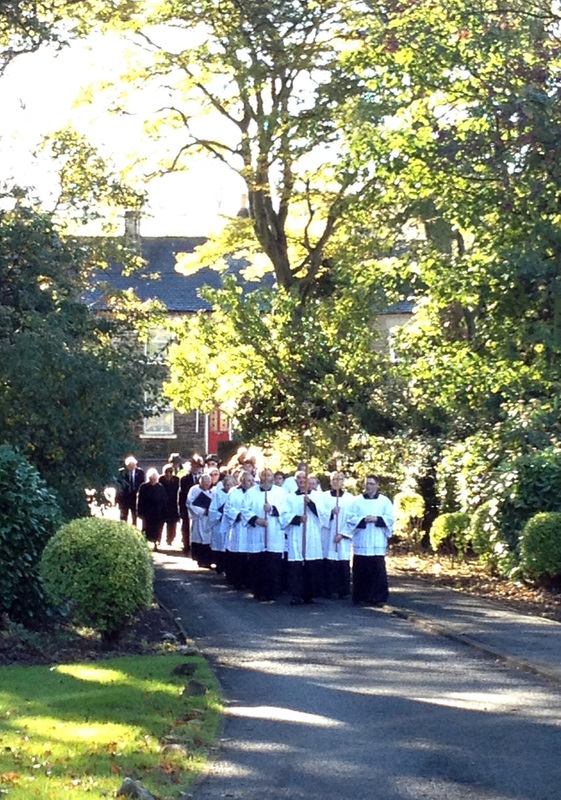 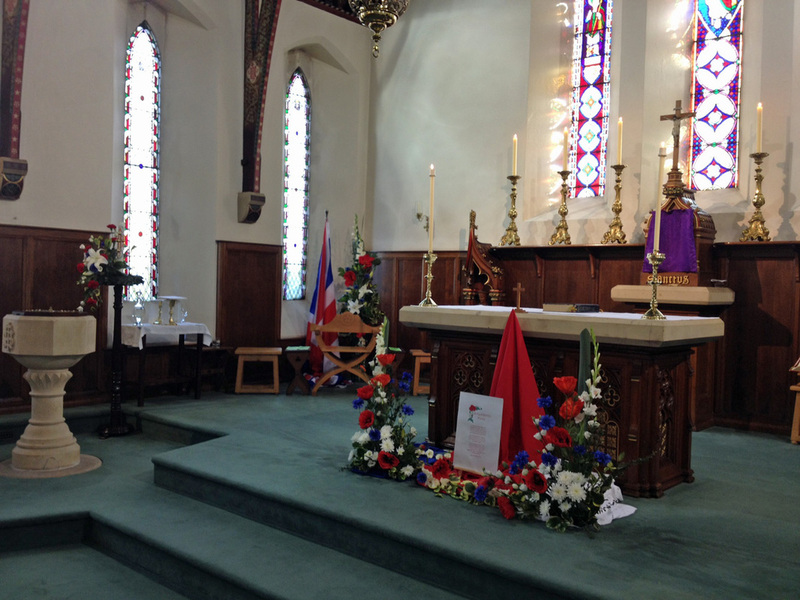 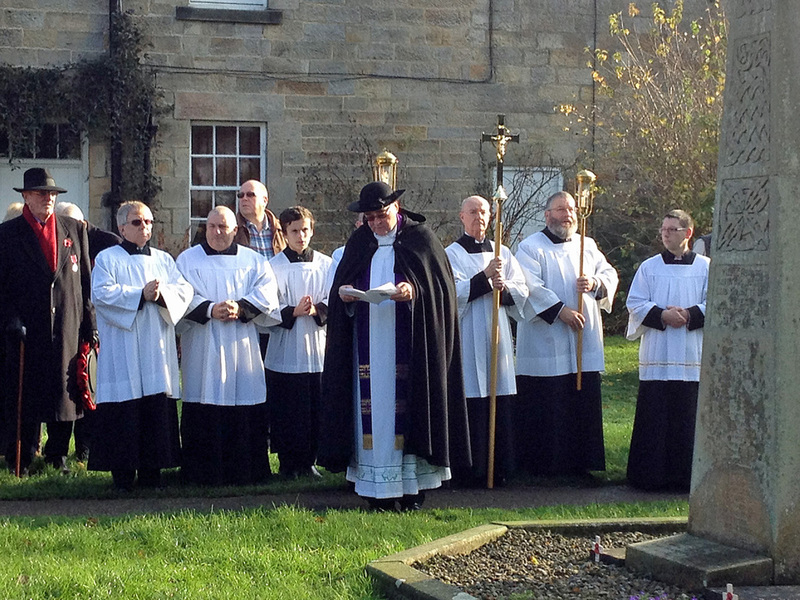 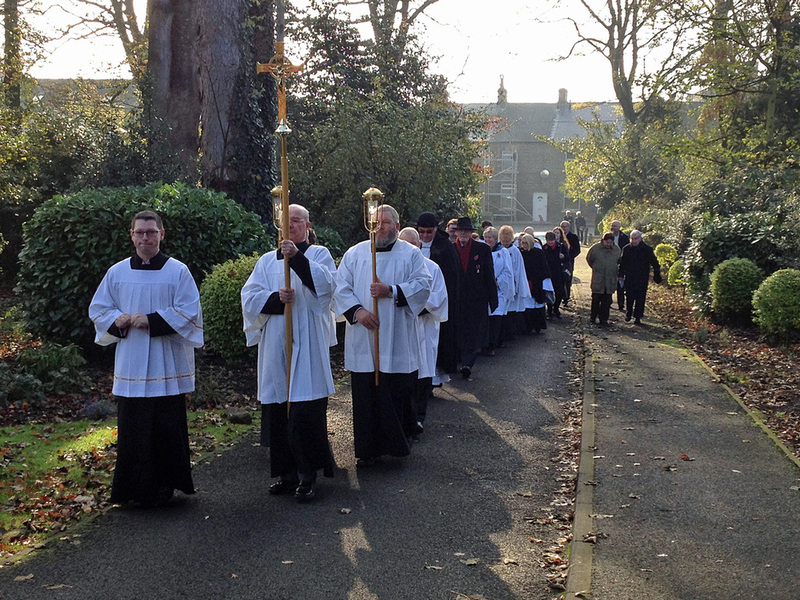 Remembrance Sunday 2014, Memorial Service at St Mary's Church, Gainford, followed by a Requiem Mass at St Osmund's. 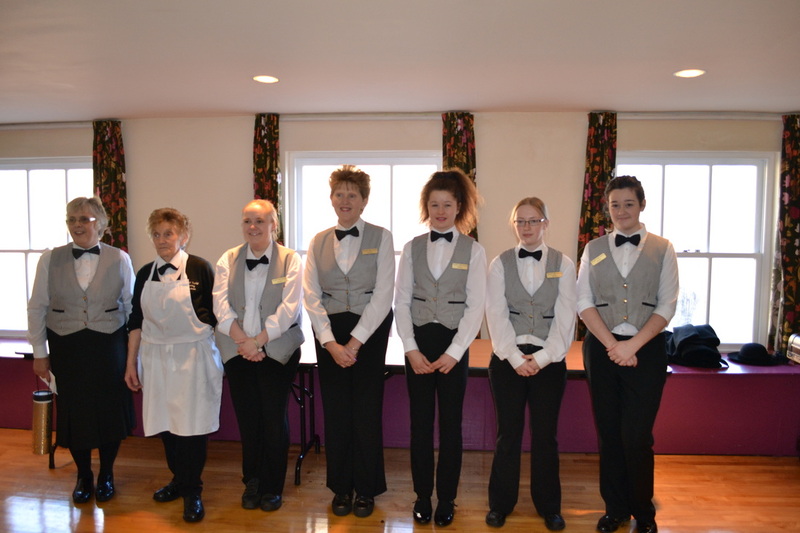 The bar staff burst into action! 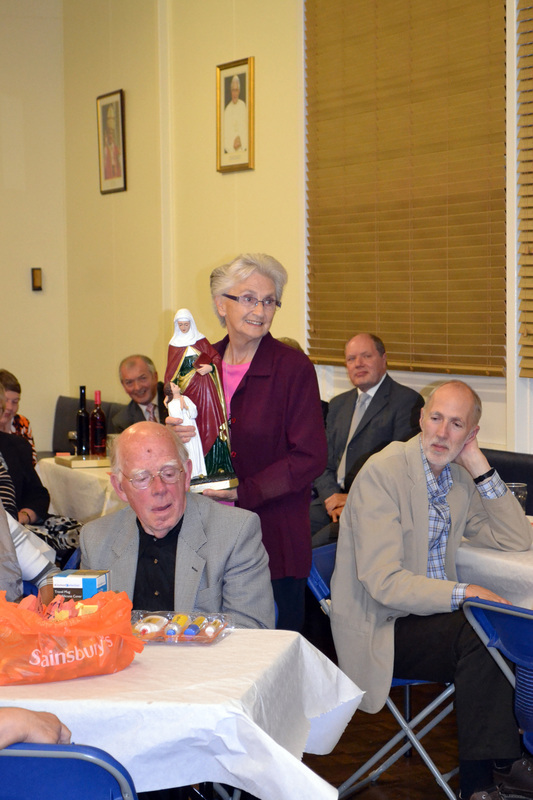 Brendan wins again in the Grand Raffle. 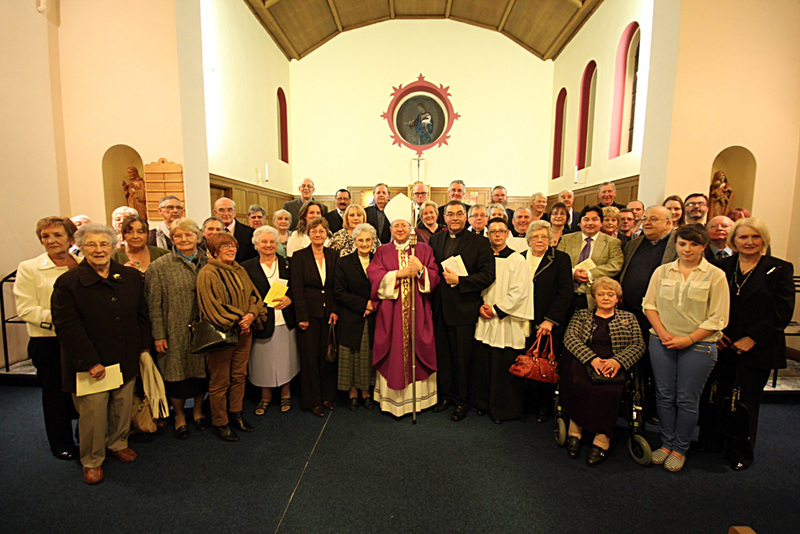 Sunday 22nd September was a special day as we welcomed Father Kenyon and 9 pilgrims from St John the Evangelist, Calgary, Canada. 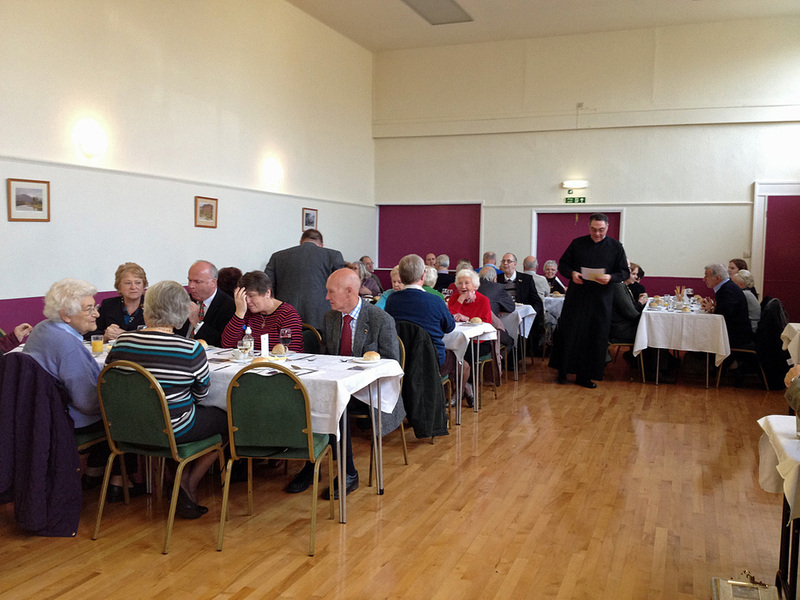 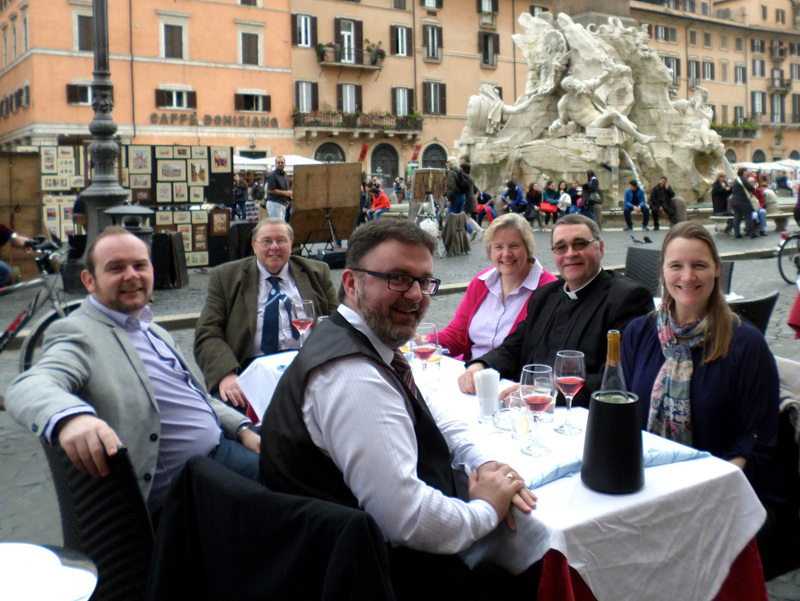 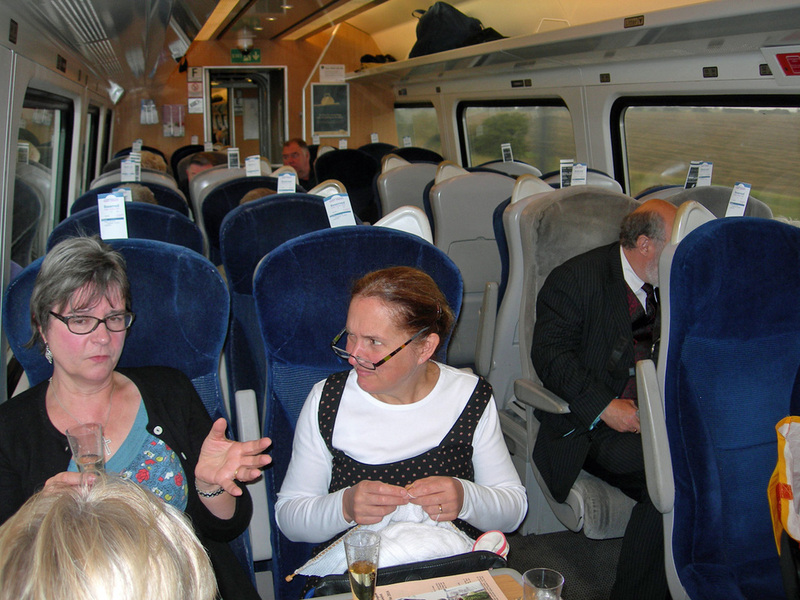 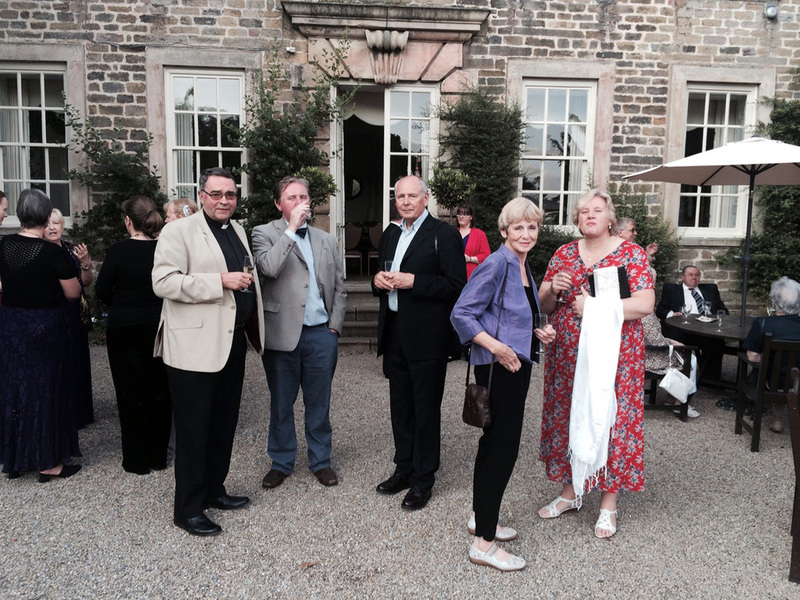 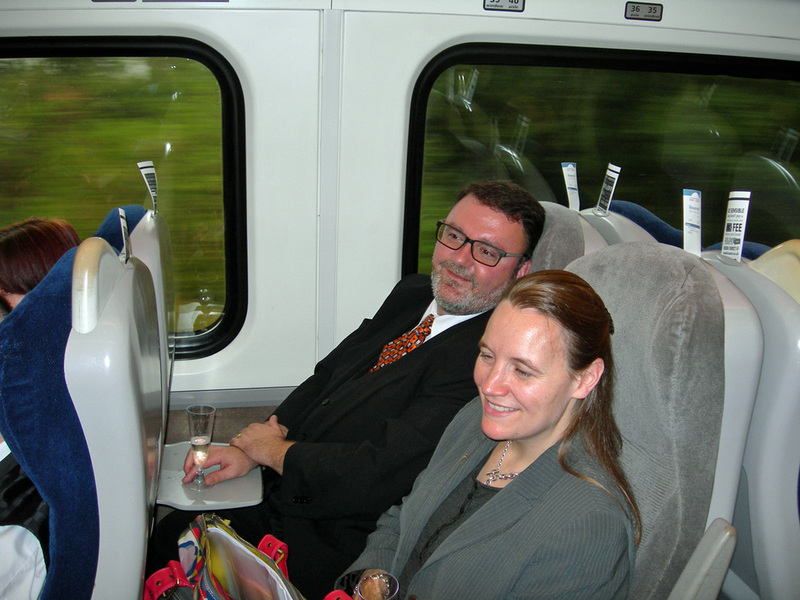 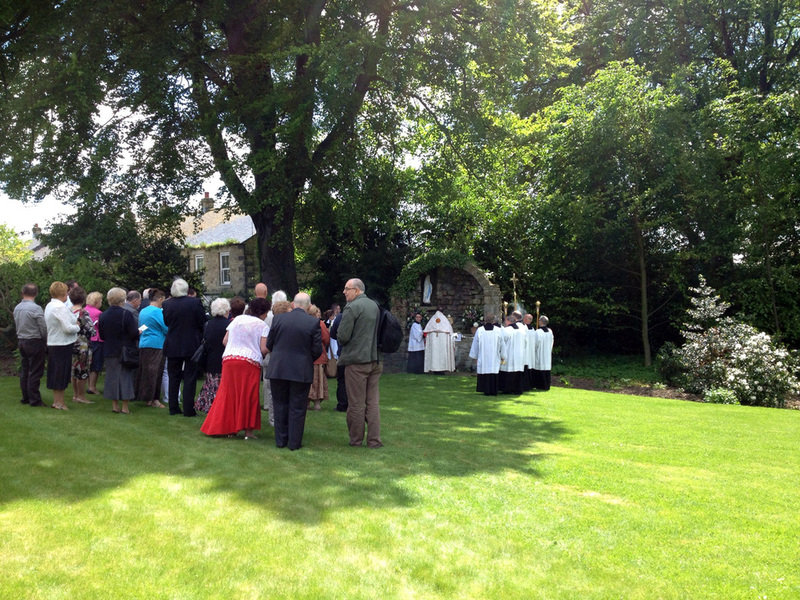 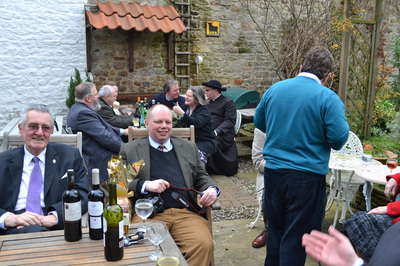 The party joined us for Solemn Mass, a drinks reception, then lunch at Snow Hall. 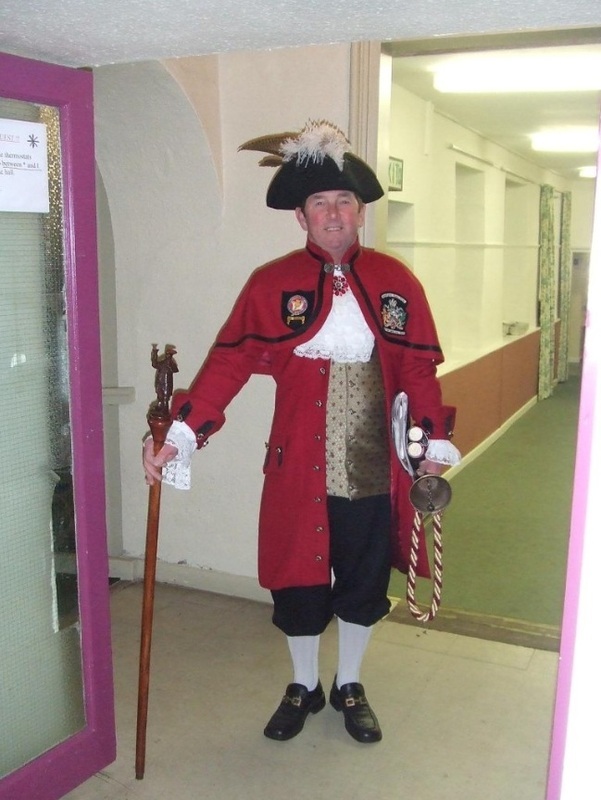 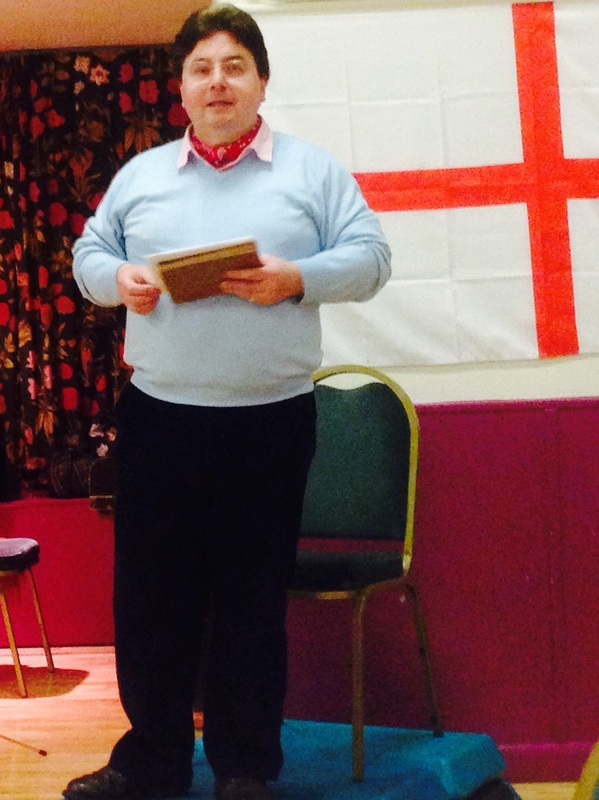 Our guest speaker, the Darlington Town Crier. 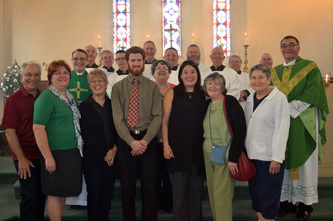 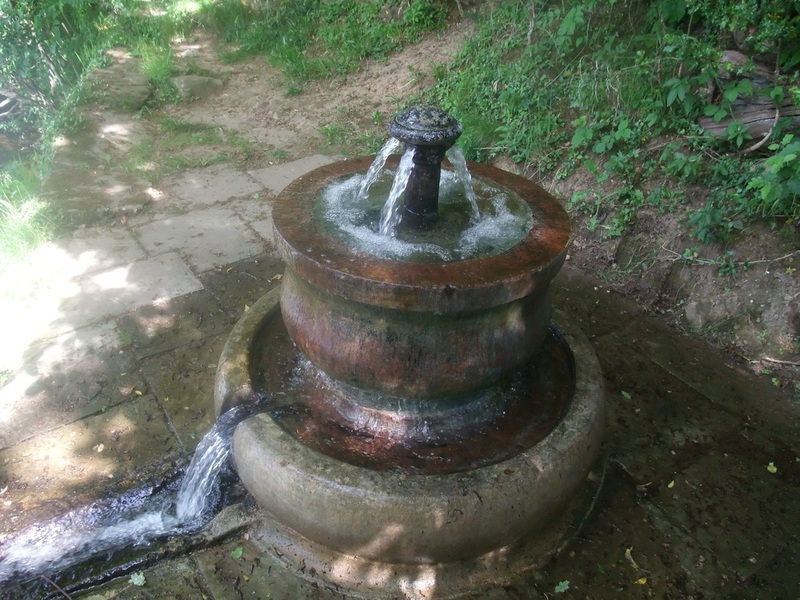 Photo by Mrs Connie Reeves. 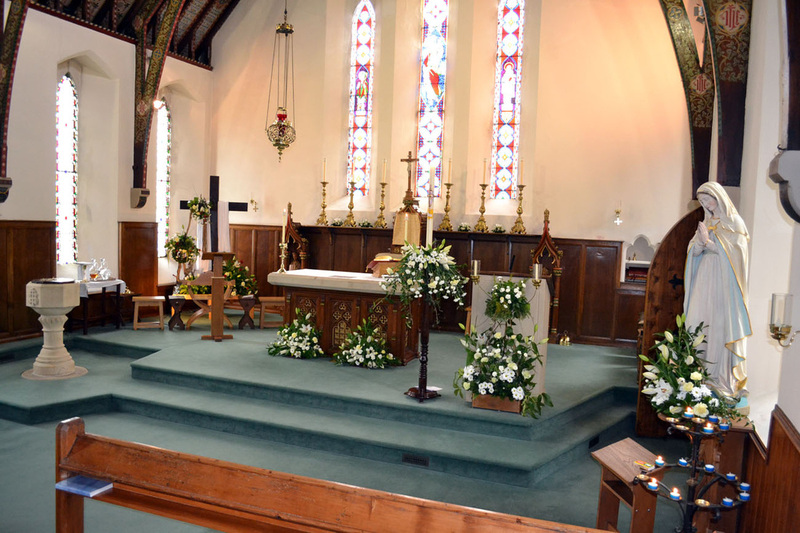 Wide angle view of the Sanctuary area. 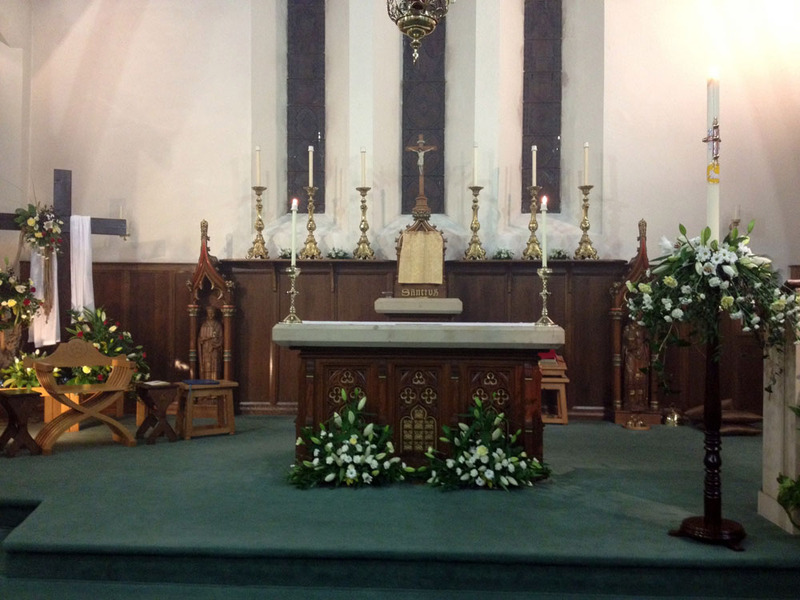 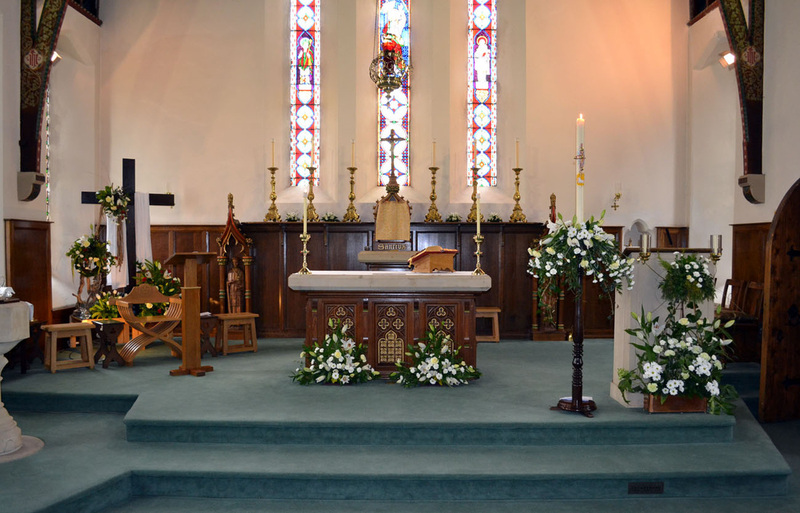 Frontal view of the Sanctuary area with Easter flowers. 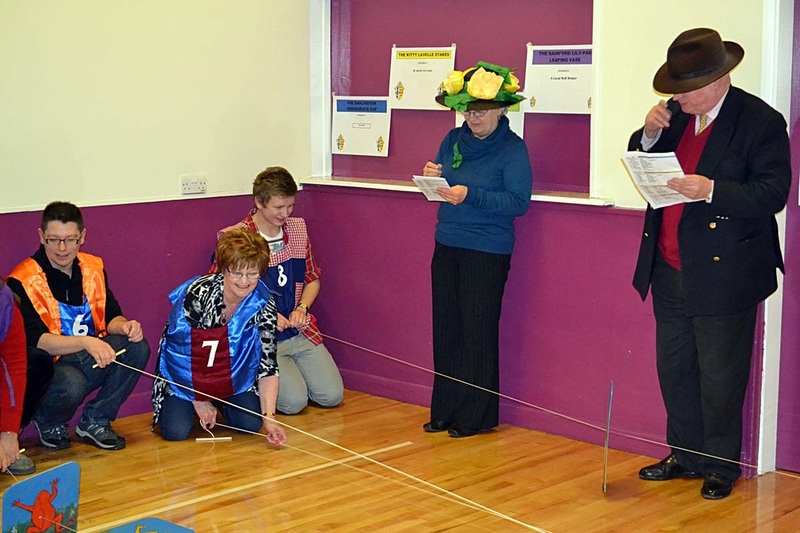 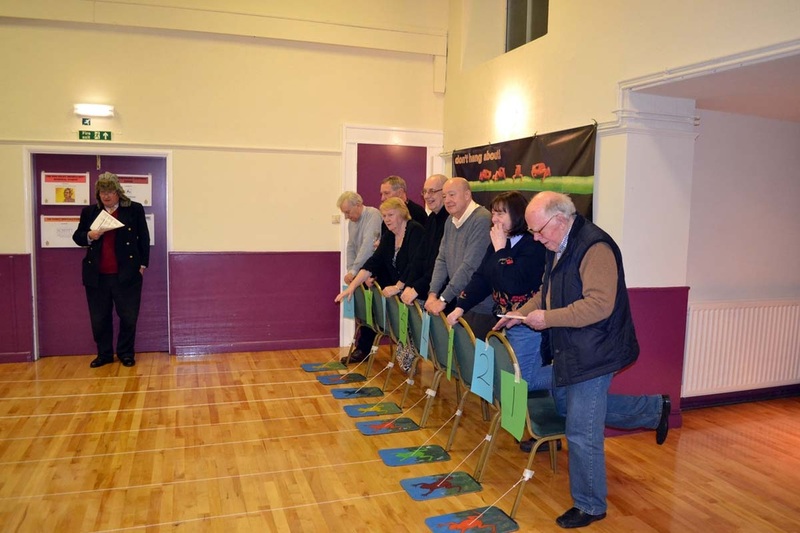 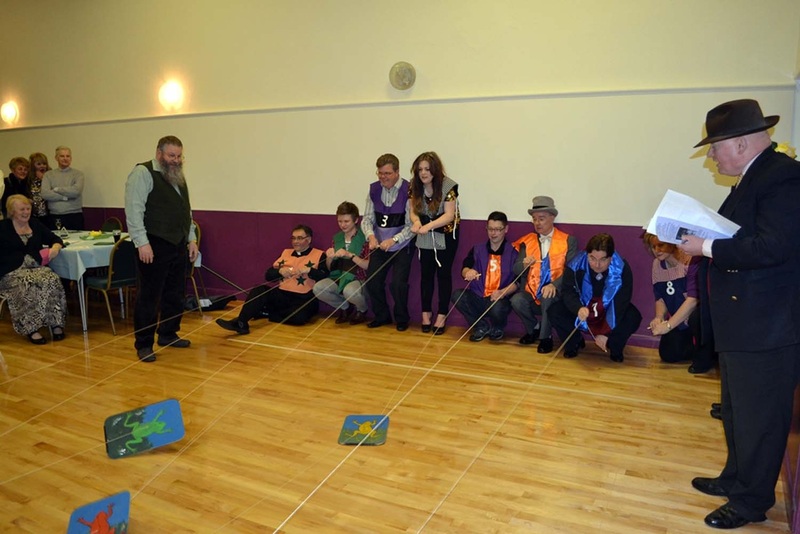 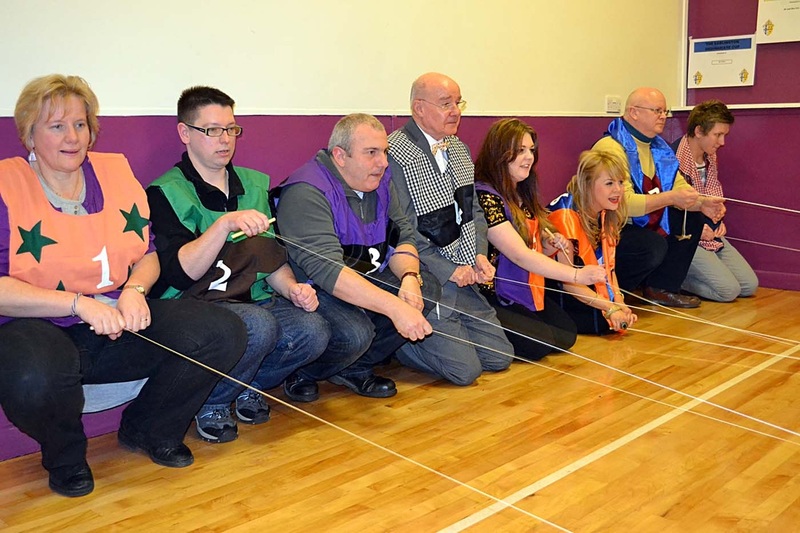 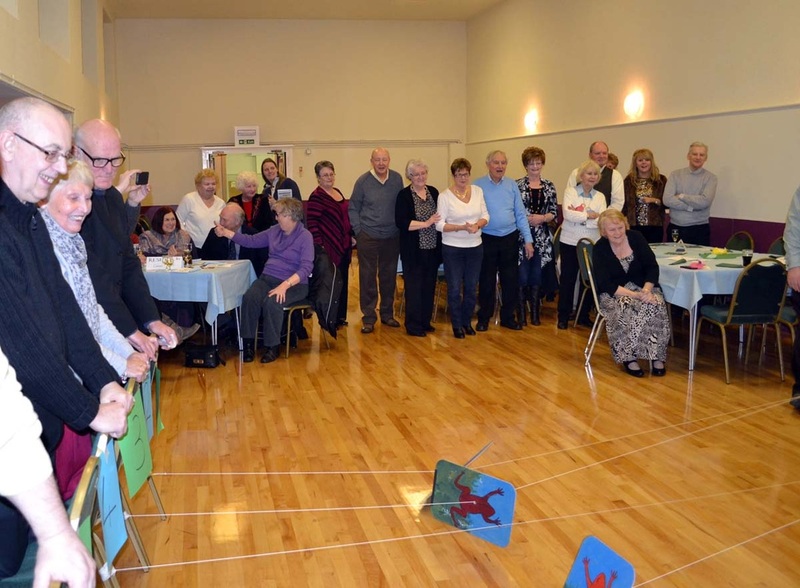 Here are some pictures from the Frog Racing event - a very happy and successful evening - many thanks to Harriet and Andrew Bull and all those who made the evening so enjoyable. 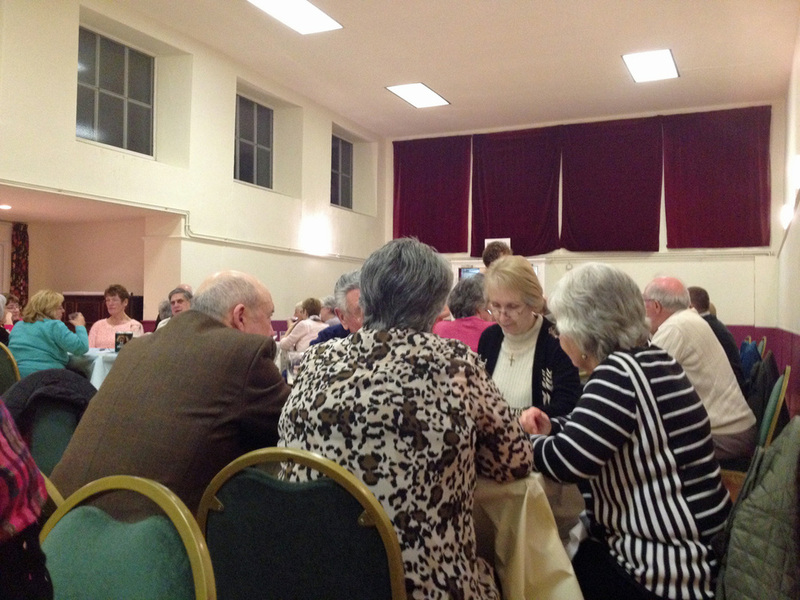 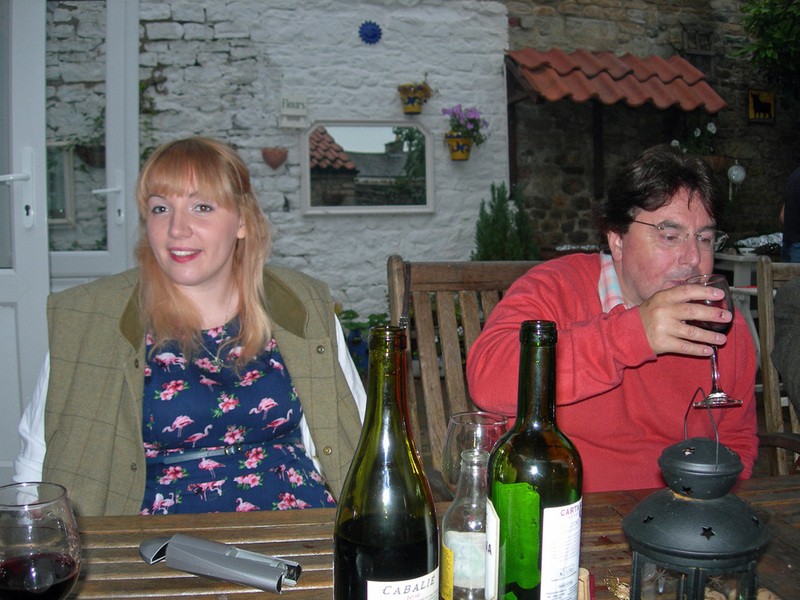 'Pie in the Sky Evening' - the final stand-off to see which team has won the quiz (all pies have been demolished). 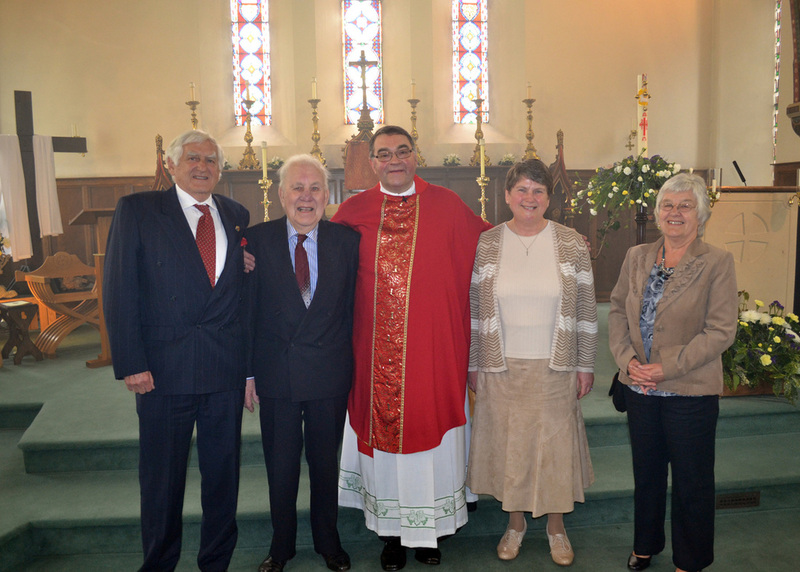 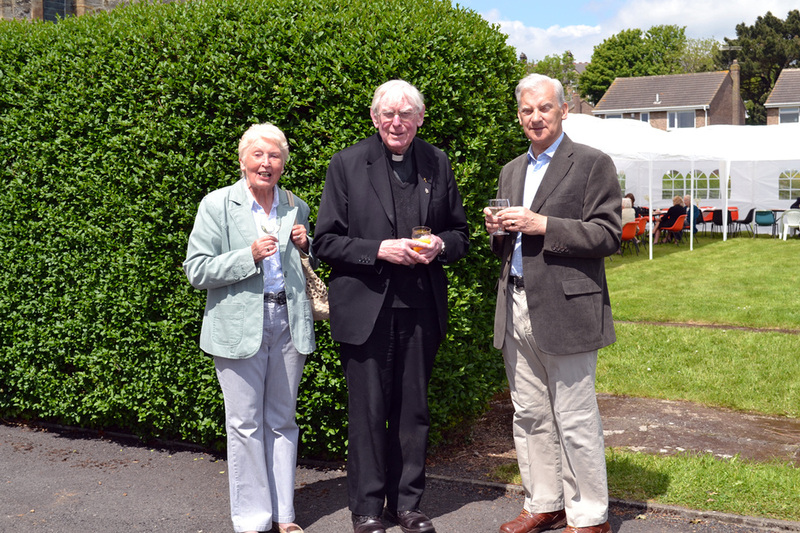 Ruth and John with Mgr Newton and Father Grieves following their Reception into the Church. 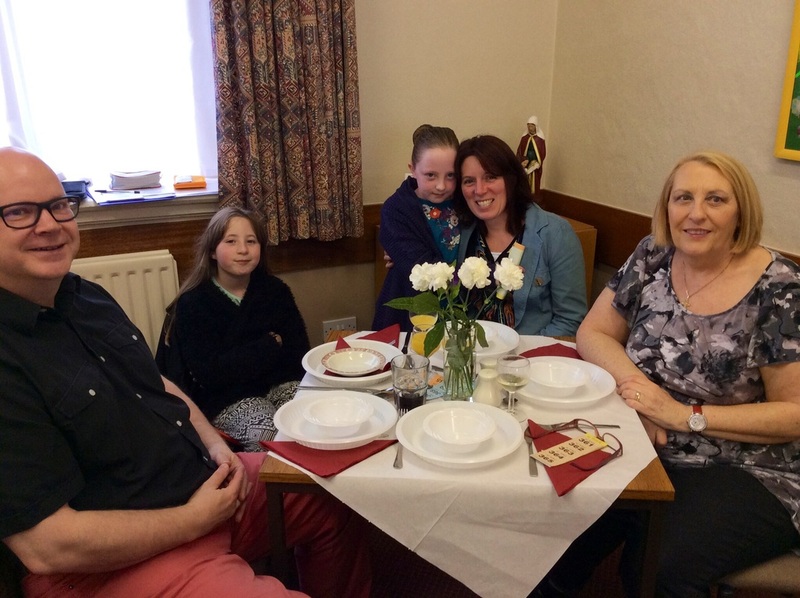 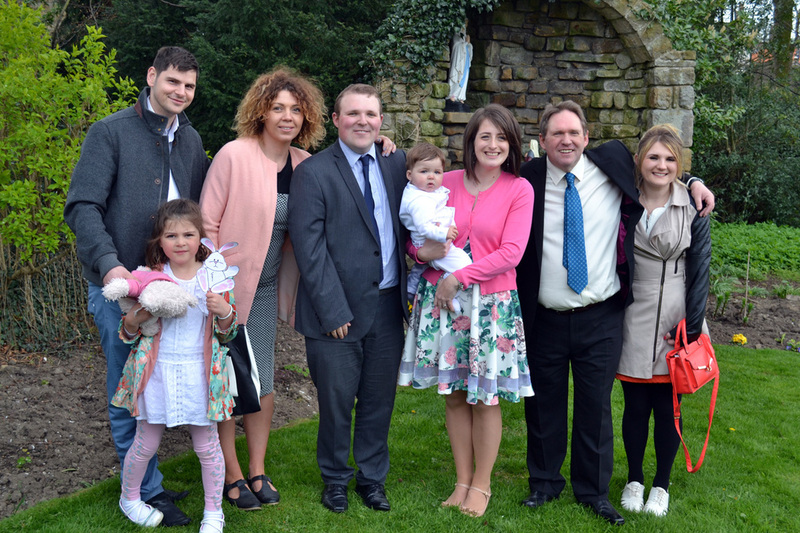 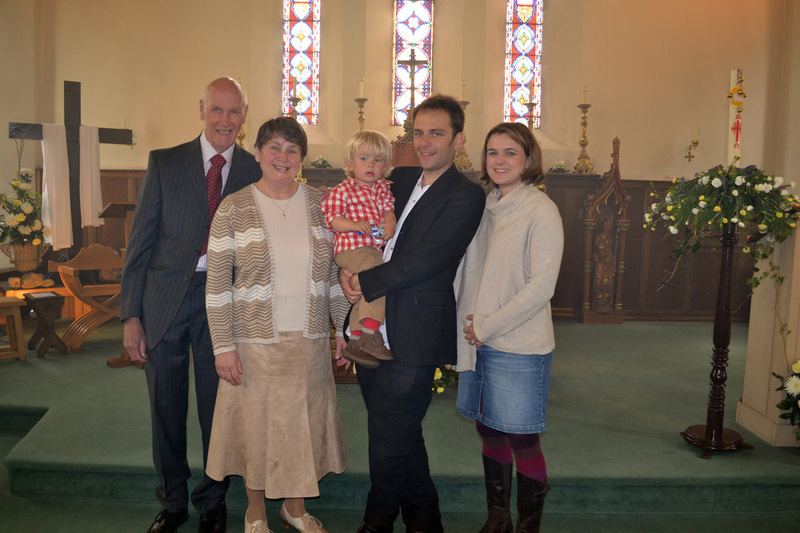 Ruth and John with their family. 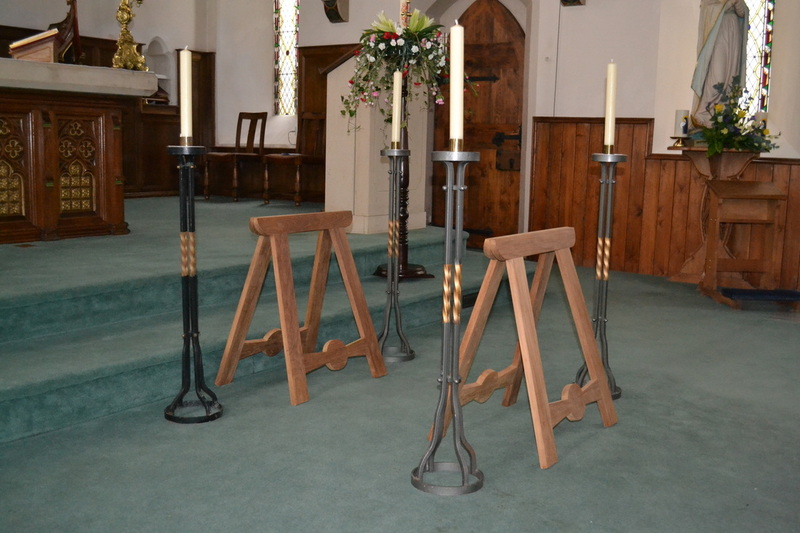 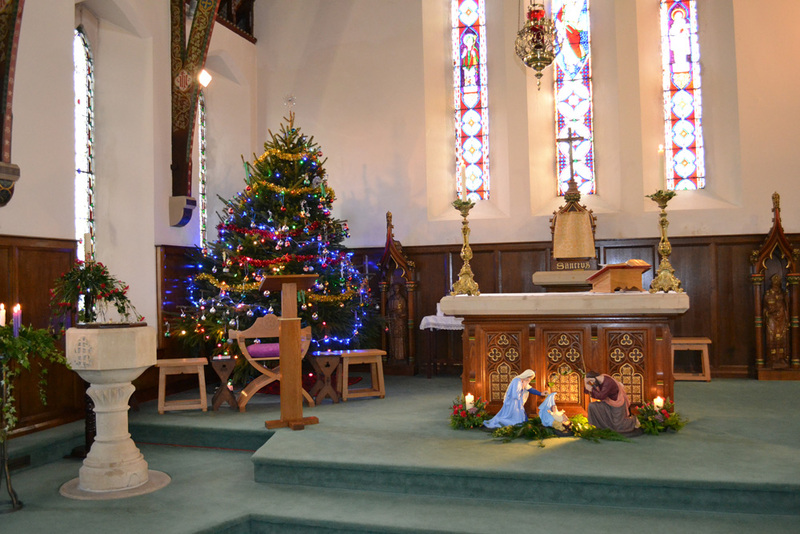 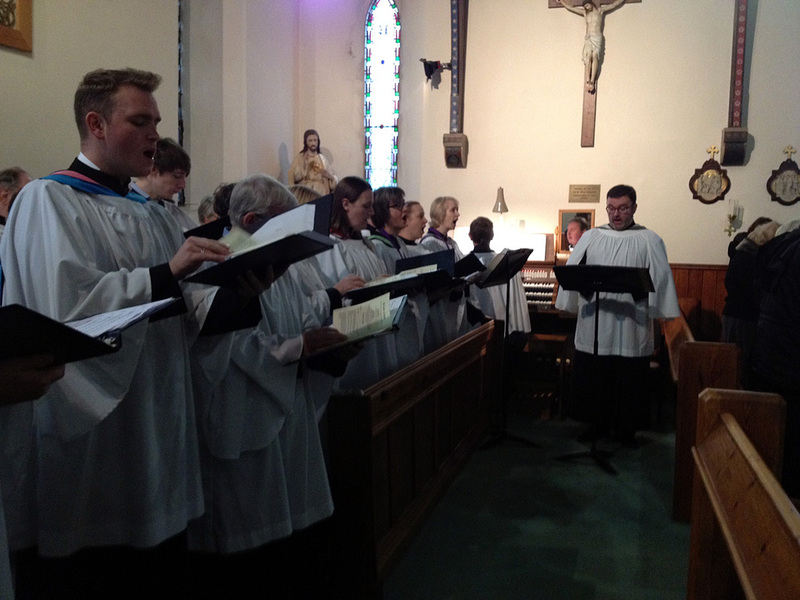 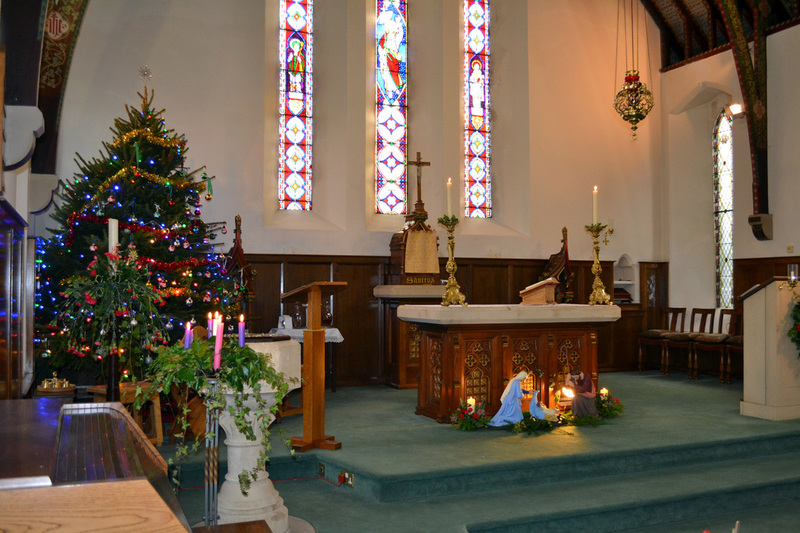 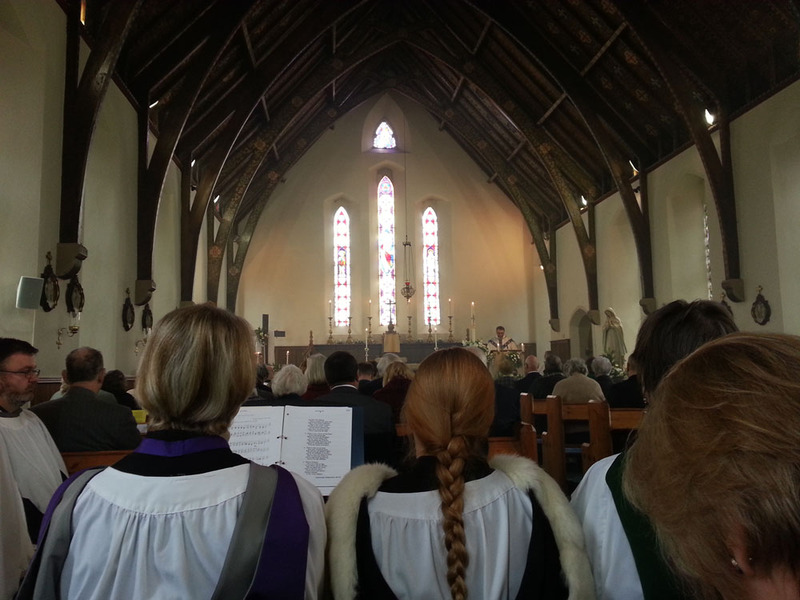 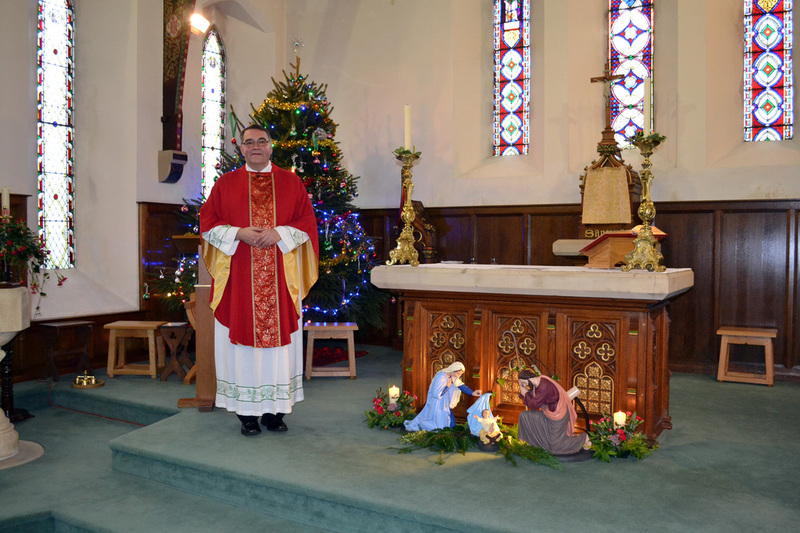 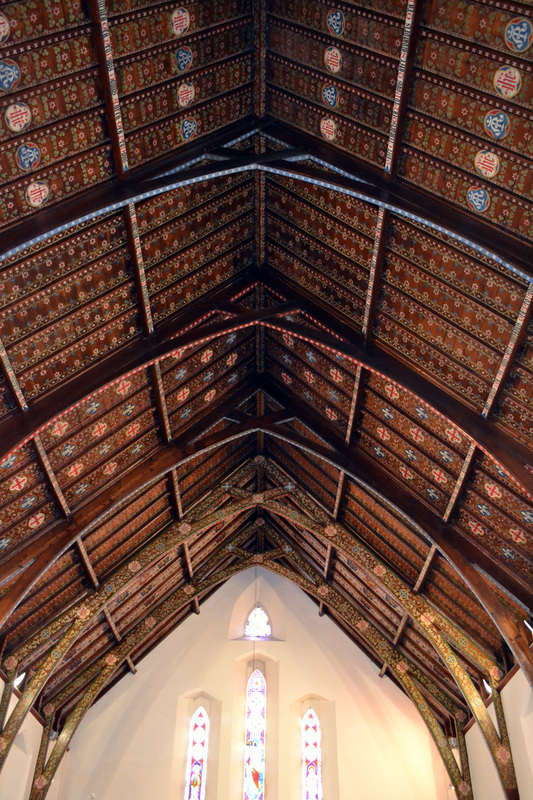 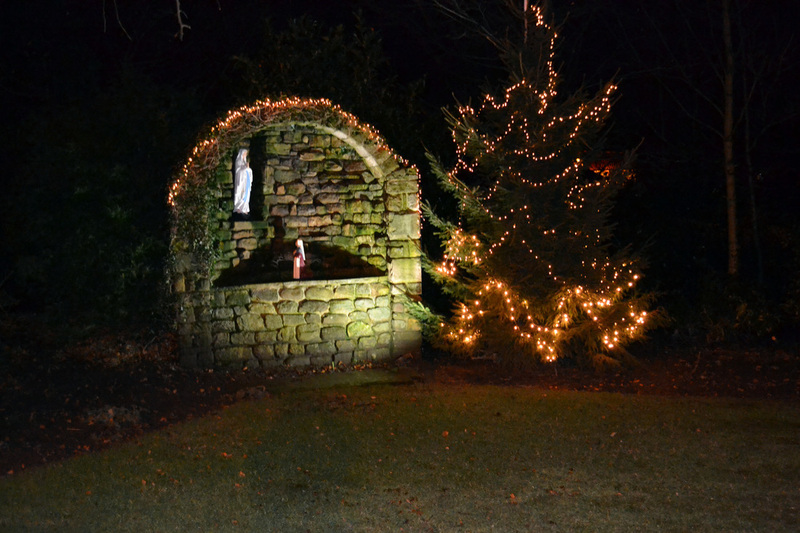 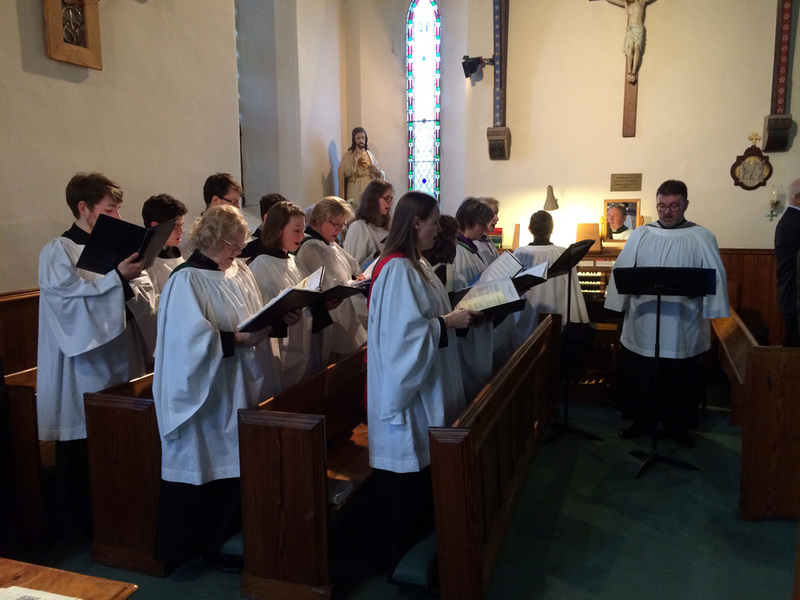 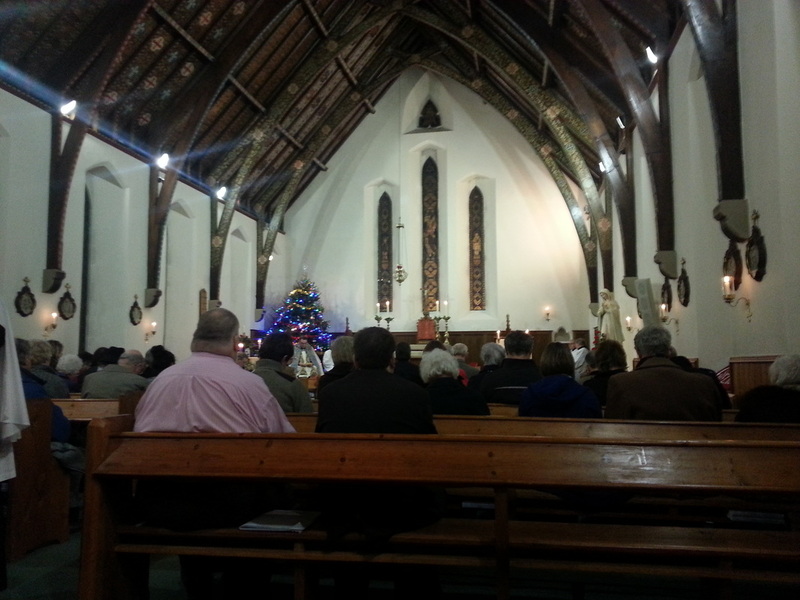 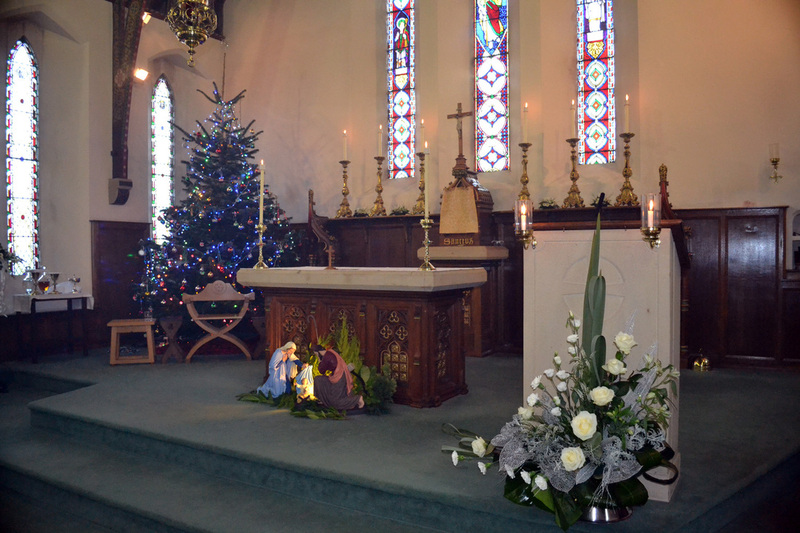 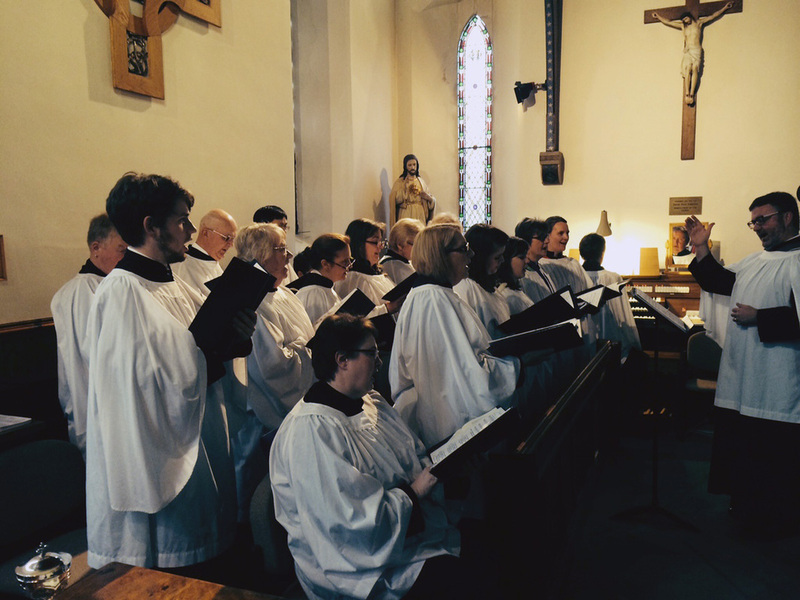 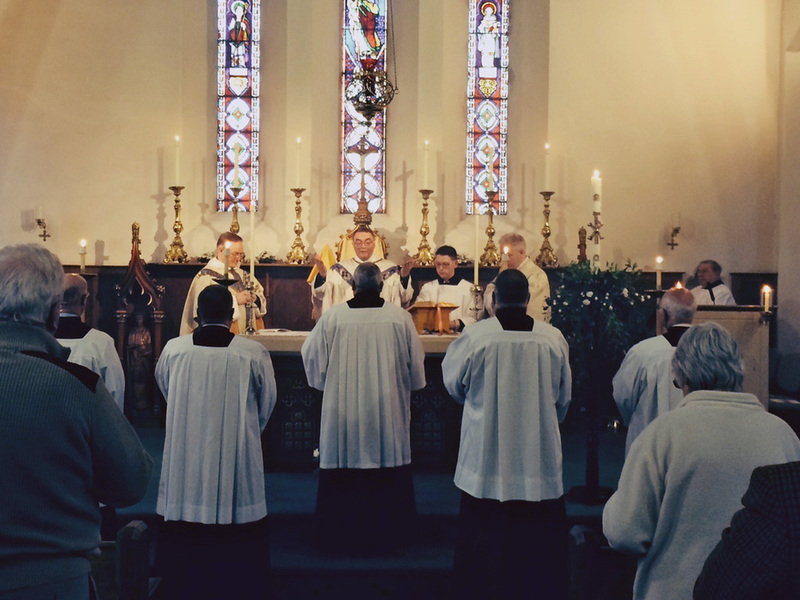 Evening of the Service of Nine Lessons and Carols (picture by Mike Forbester). 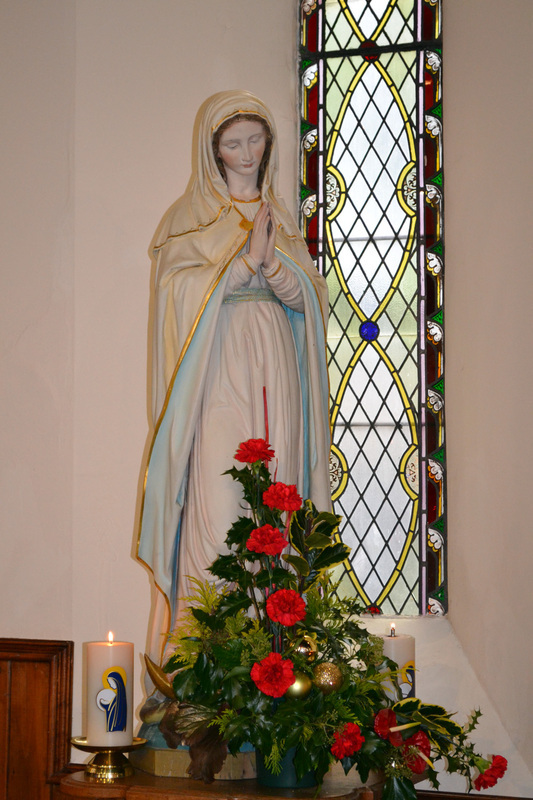 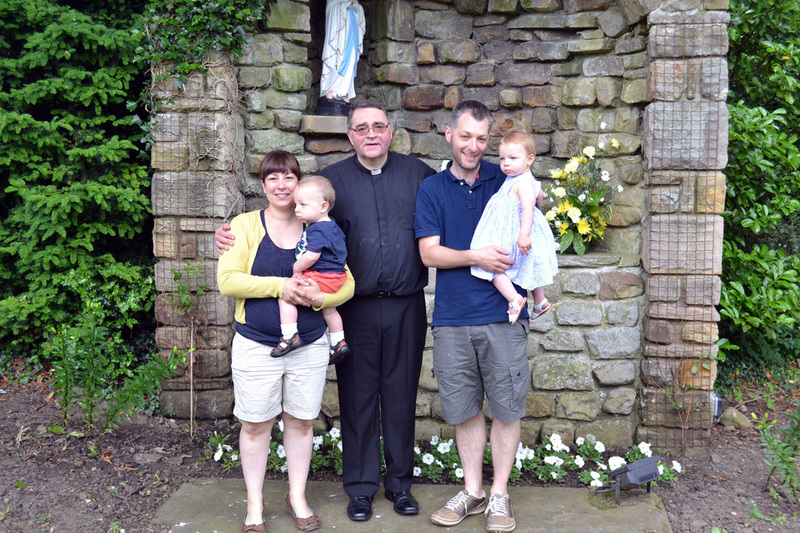 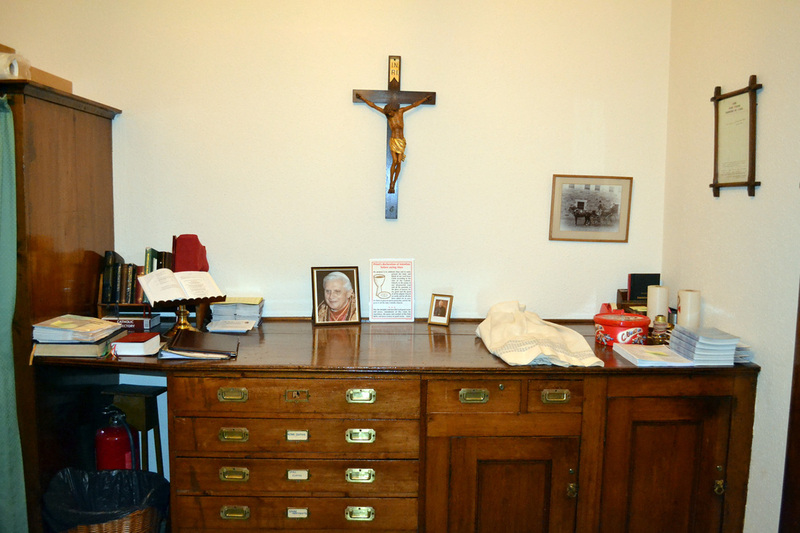 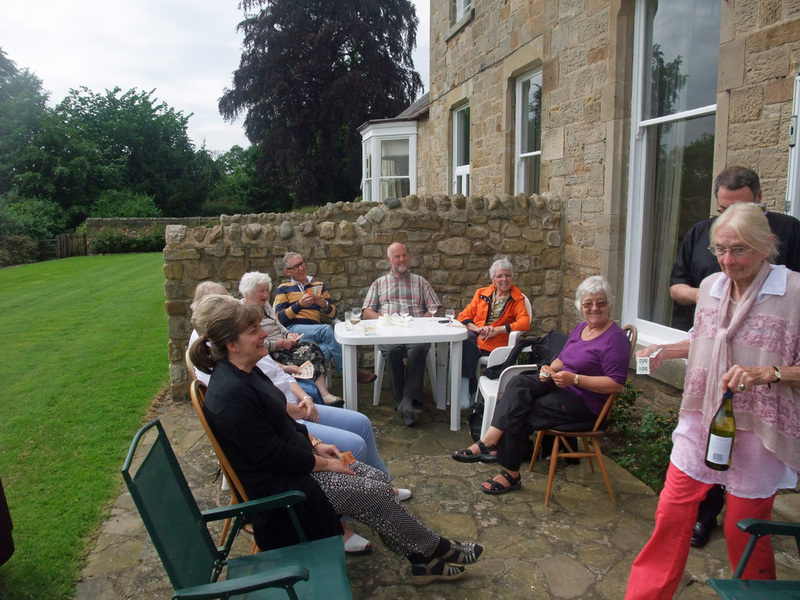 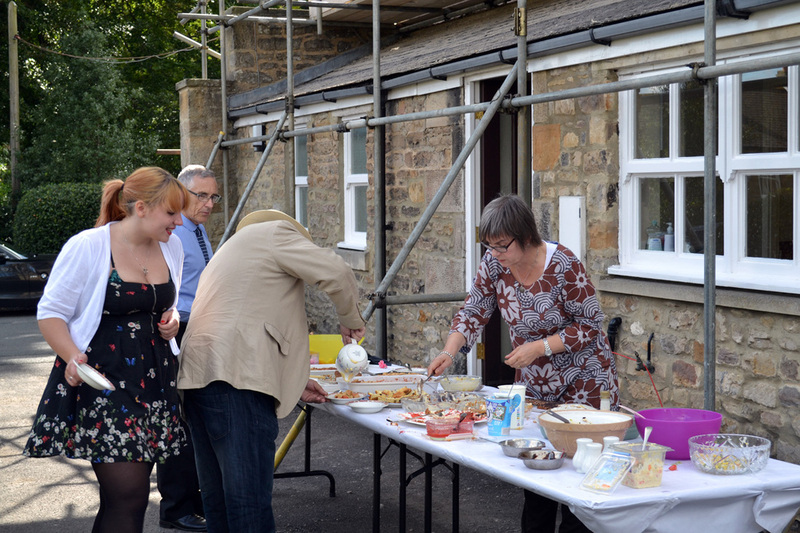 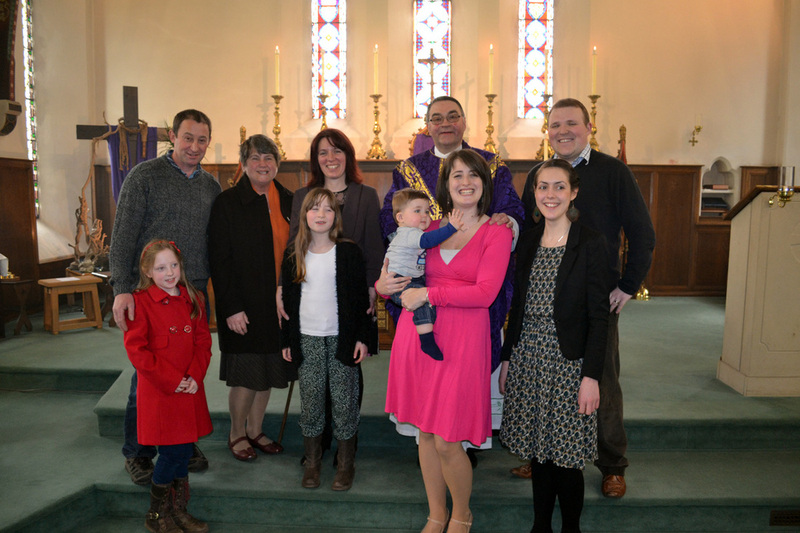 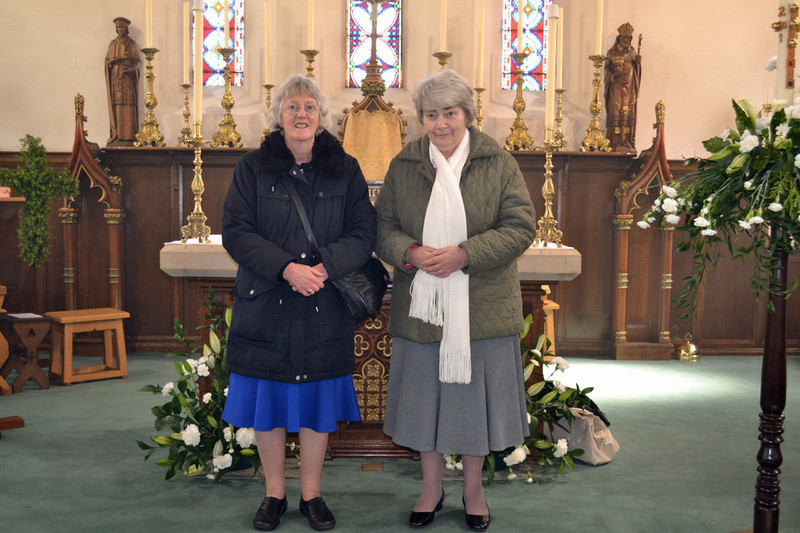 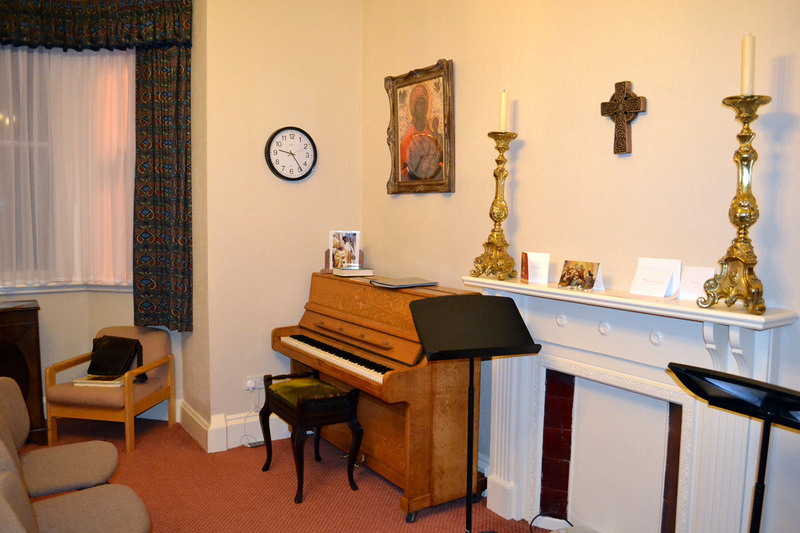 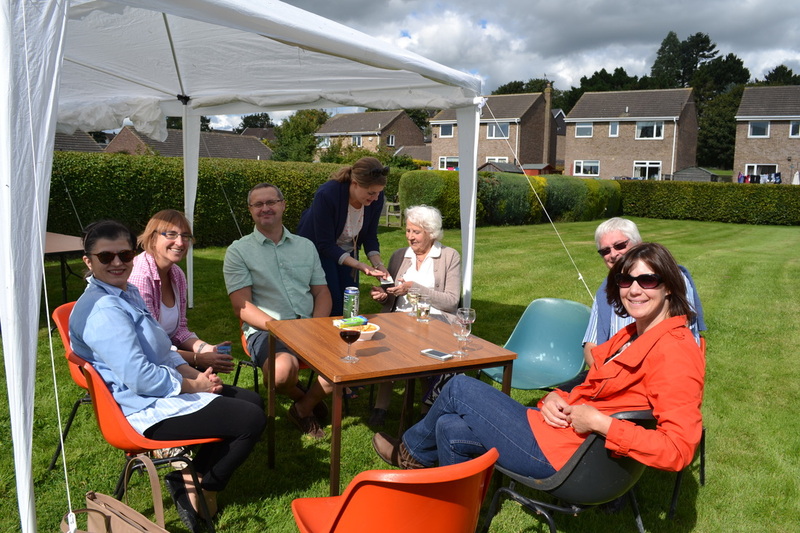 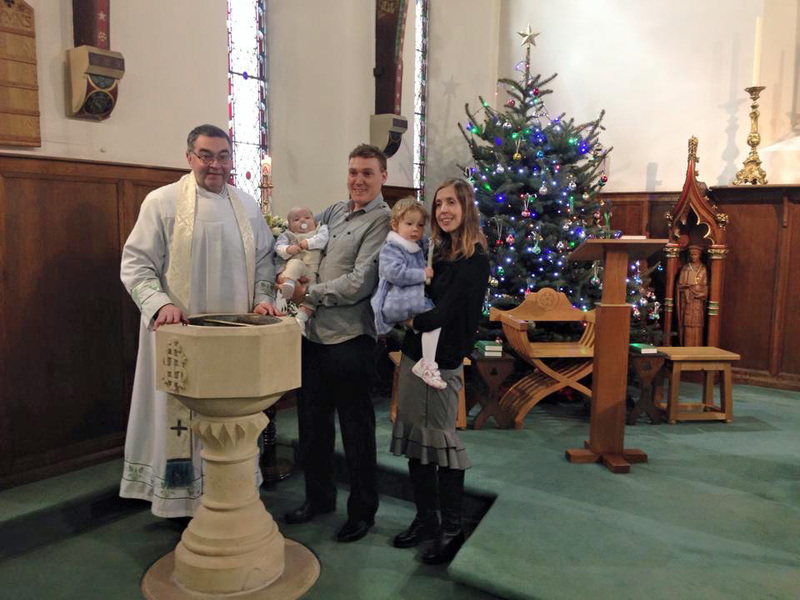 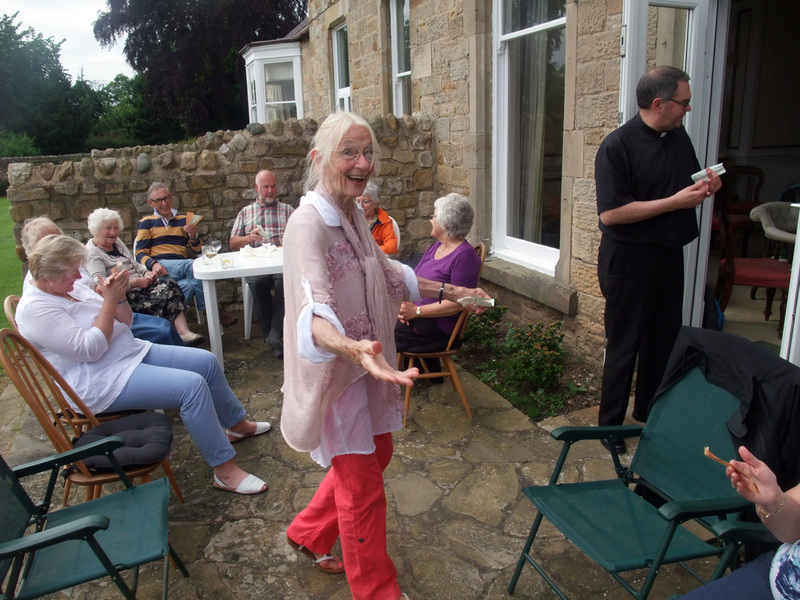 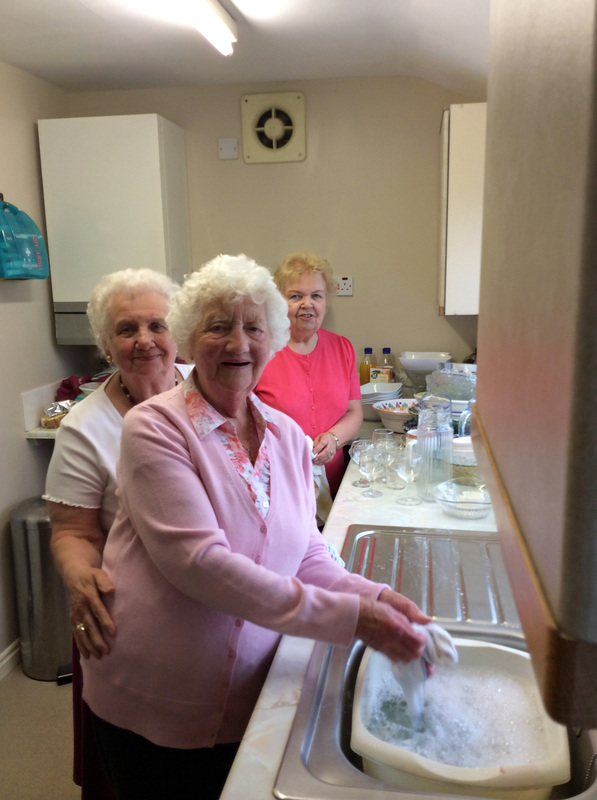 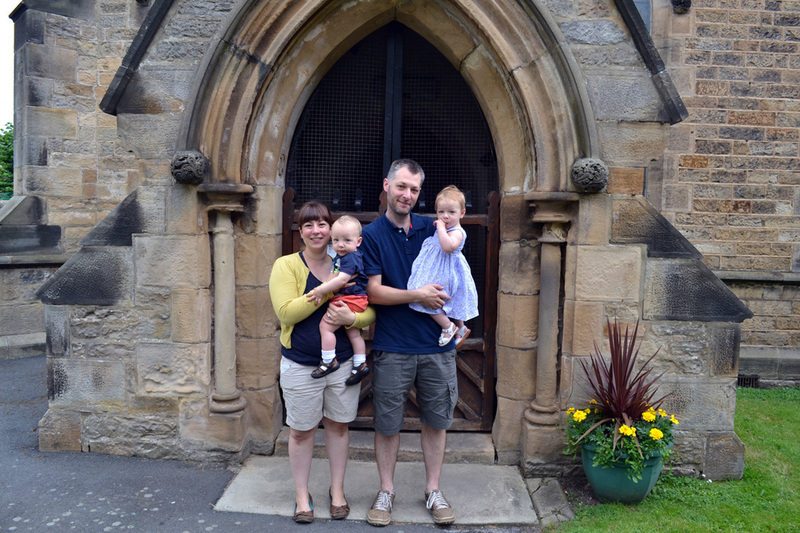 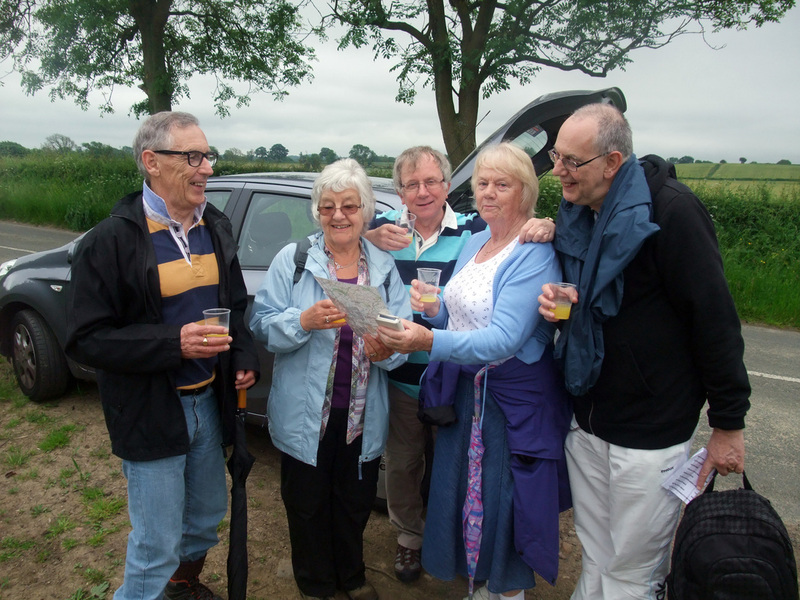 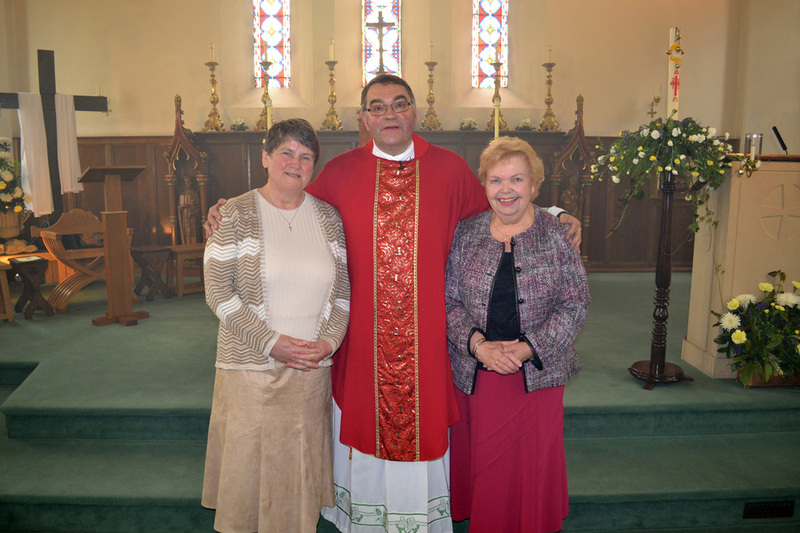 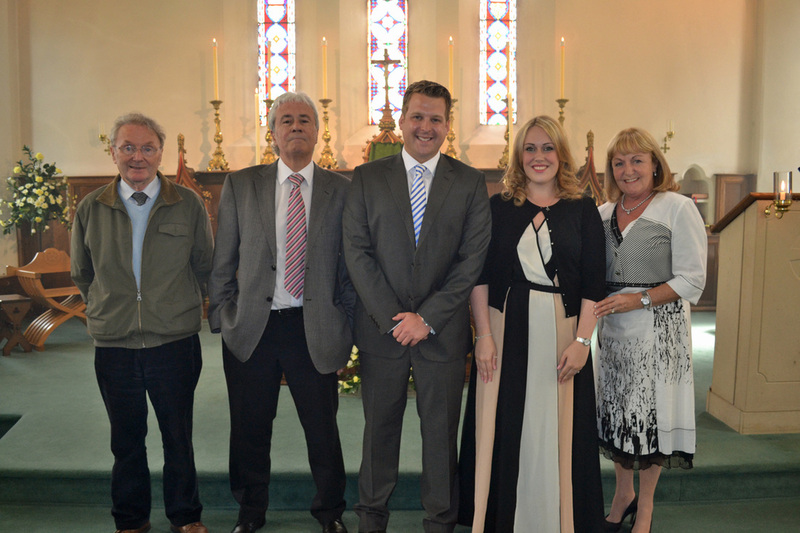 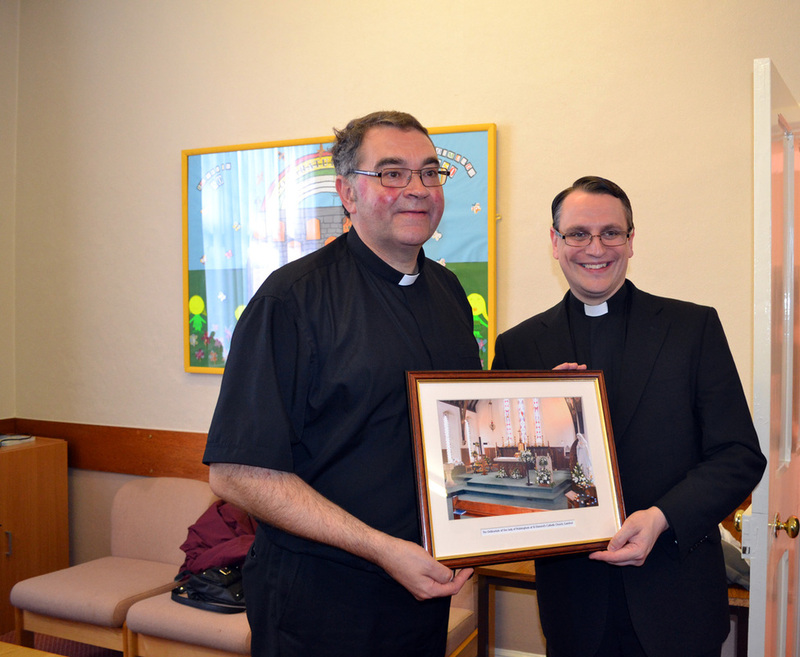 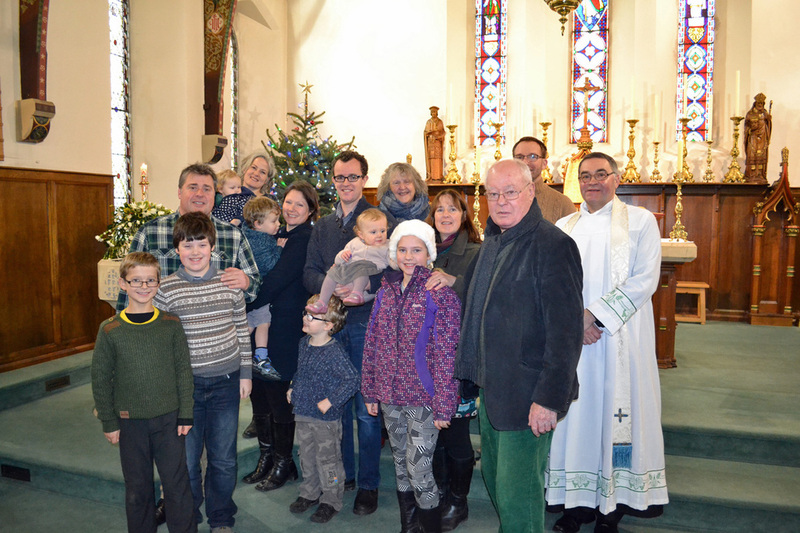 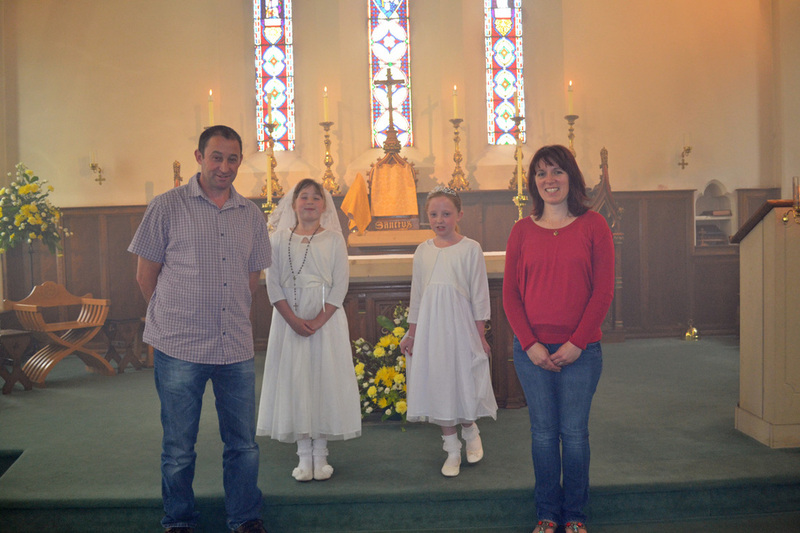 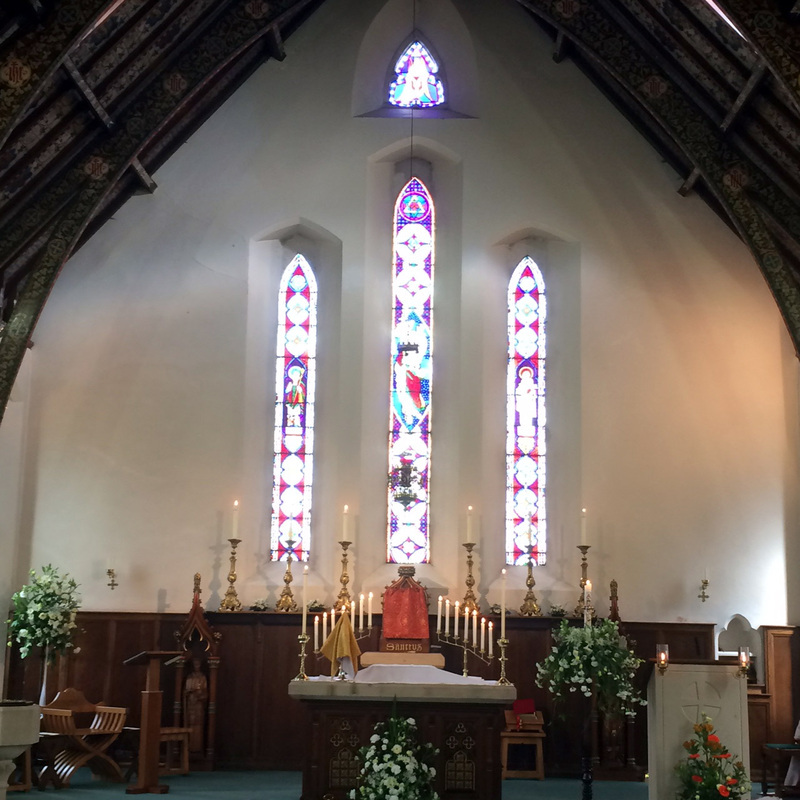 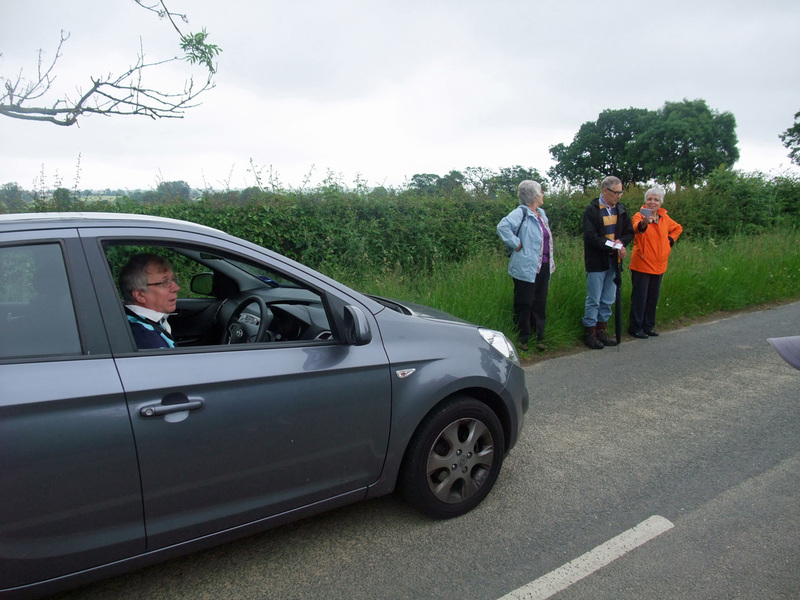 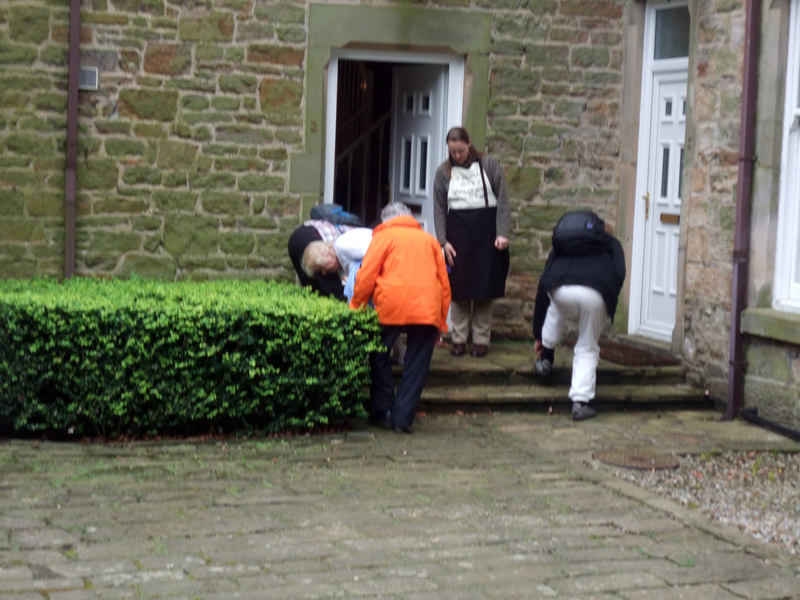 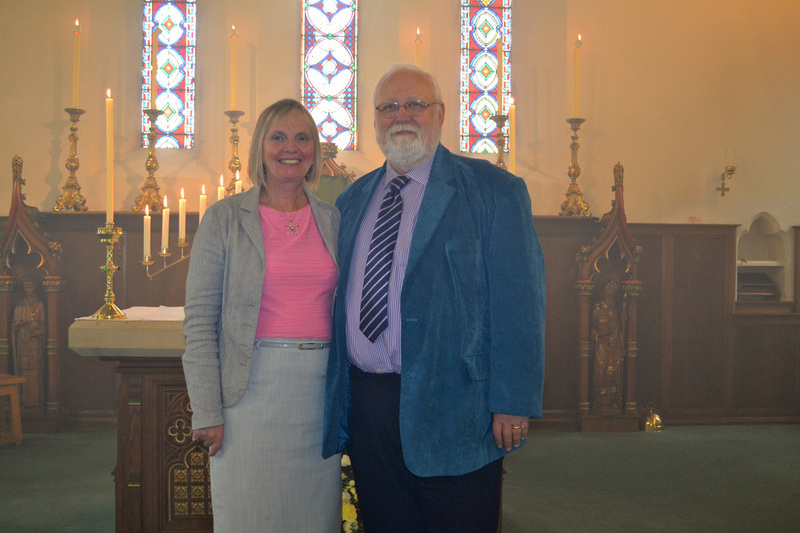 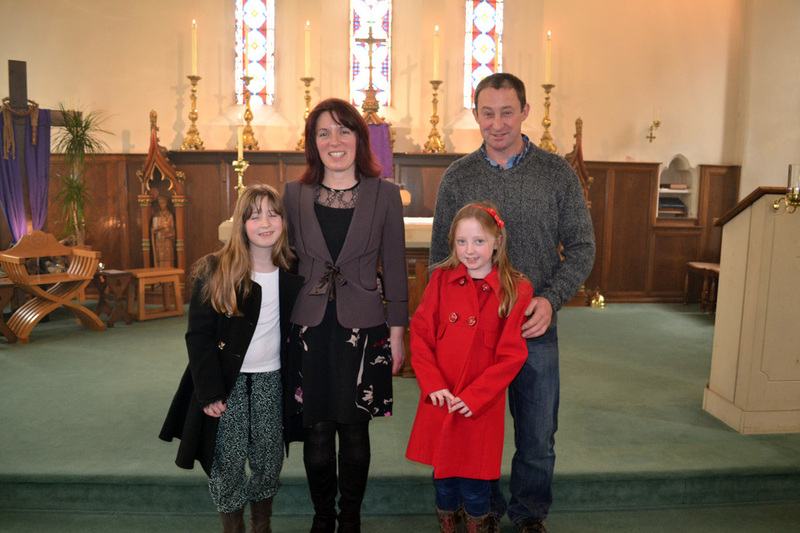 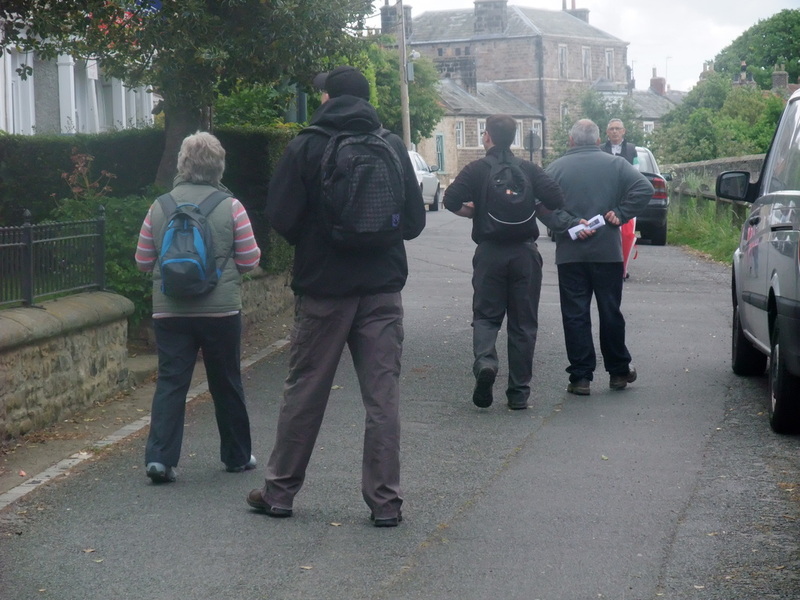 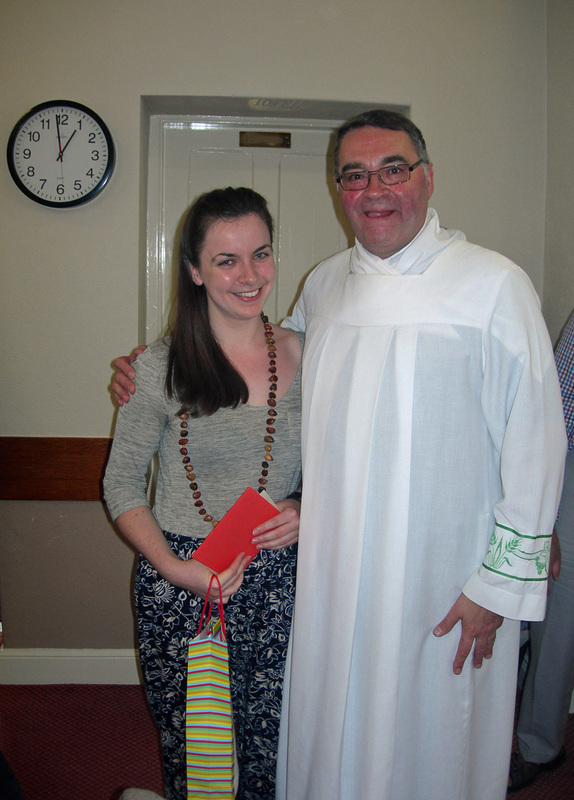 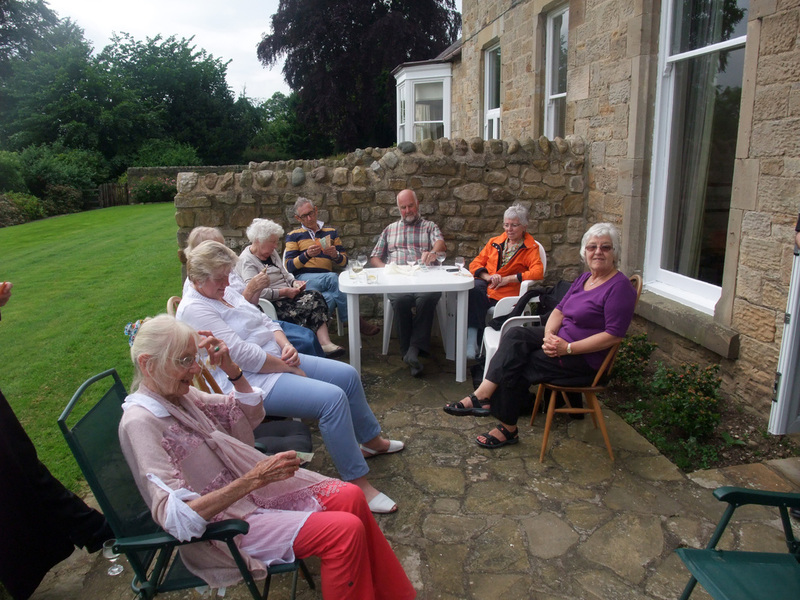 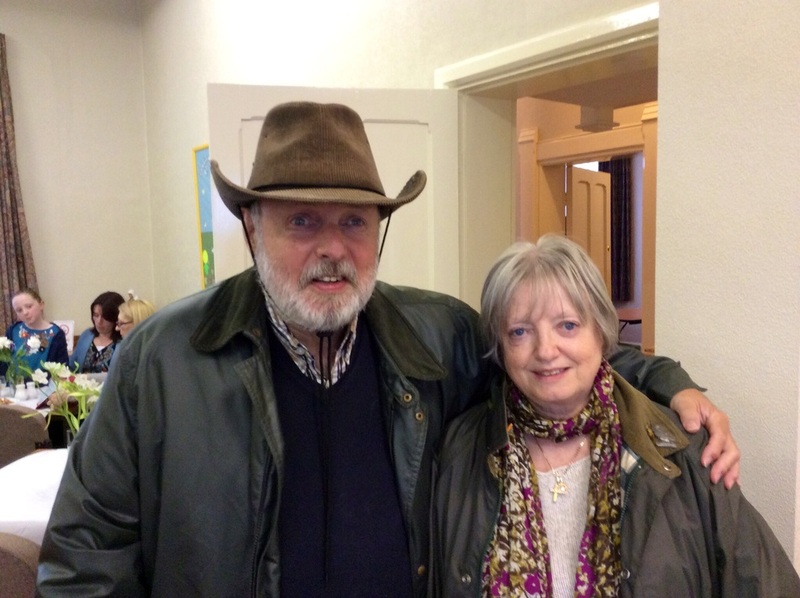 S. Anne's for their generous help and support during the transition to our new home at S. Osmund's Church, Gainford. 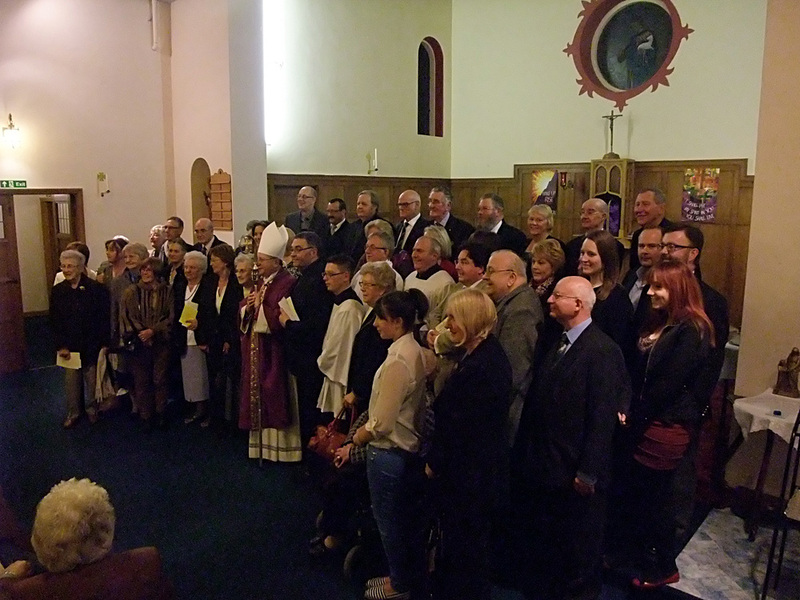 Above and below: Members of the Darlington Ordinariate Received into the Catholic Church by the Rt Revd Monsignor Keith Newton at St Anne's Church, Darlington, 4th April 2012. 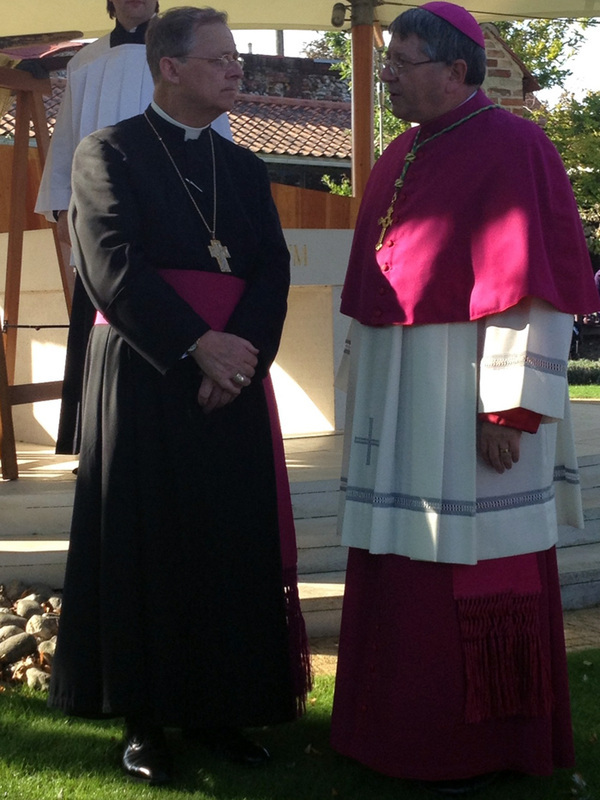 (Photos courtesy of Fr Ray Burr).